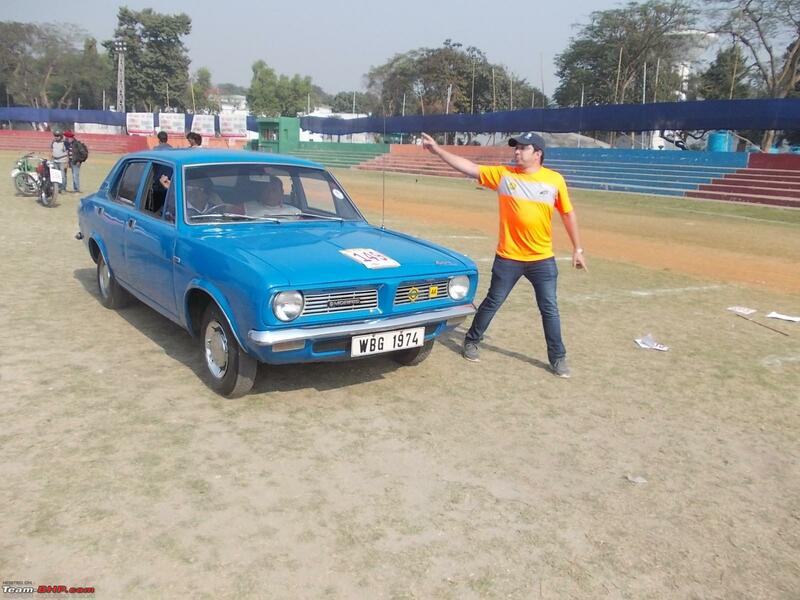 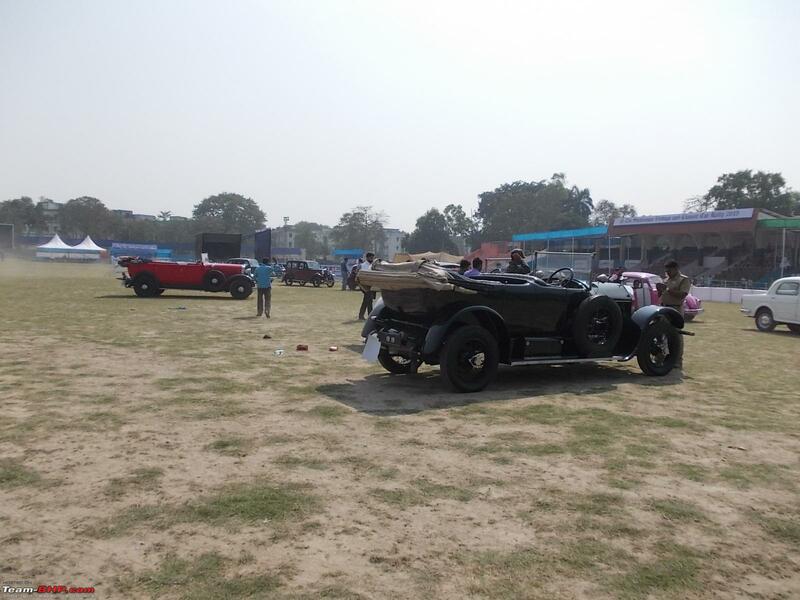 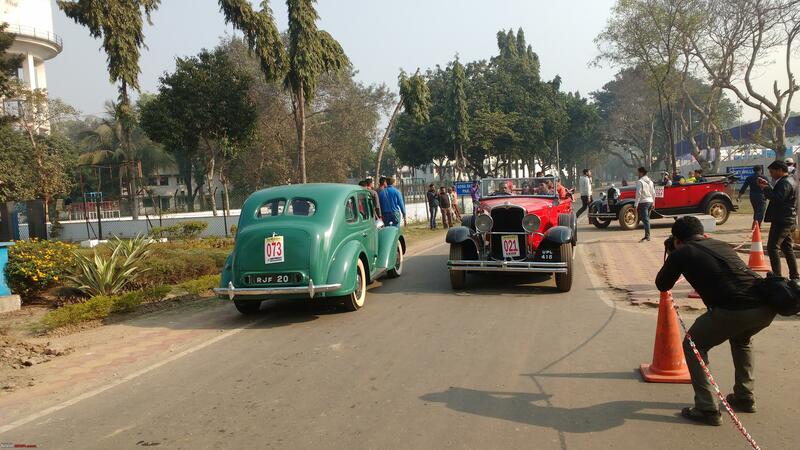 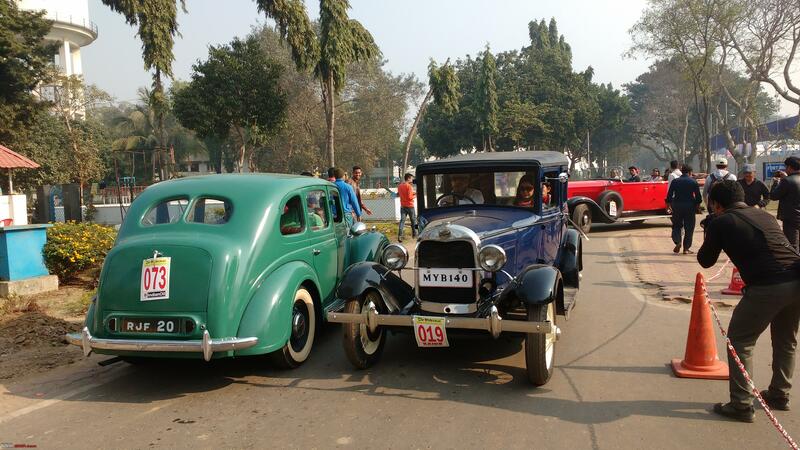 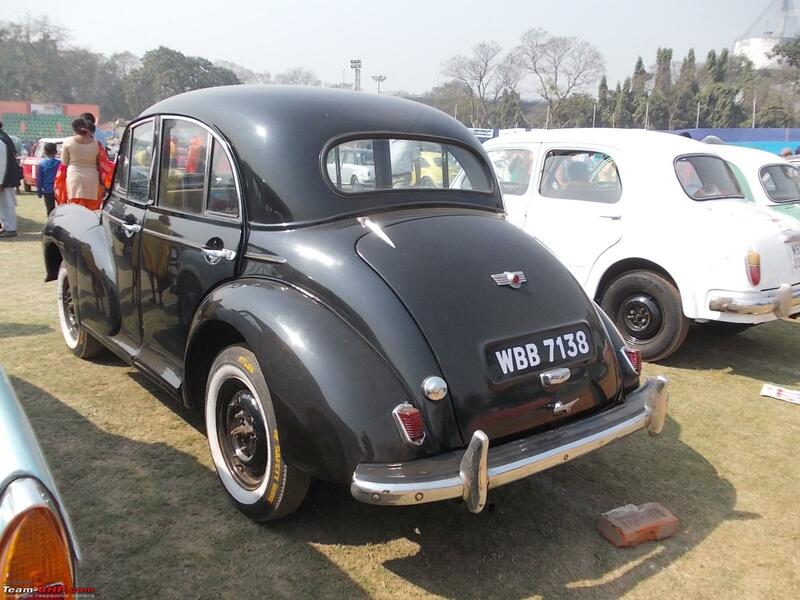 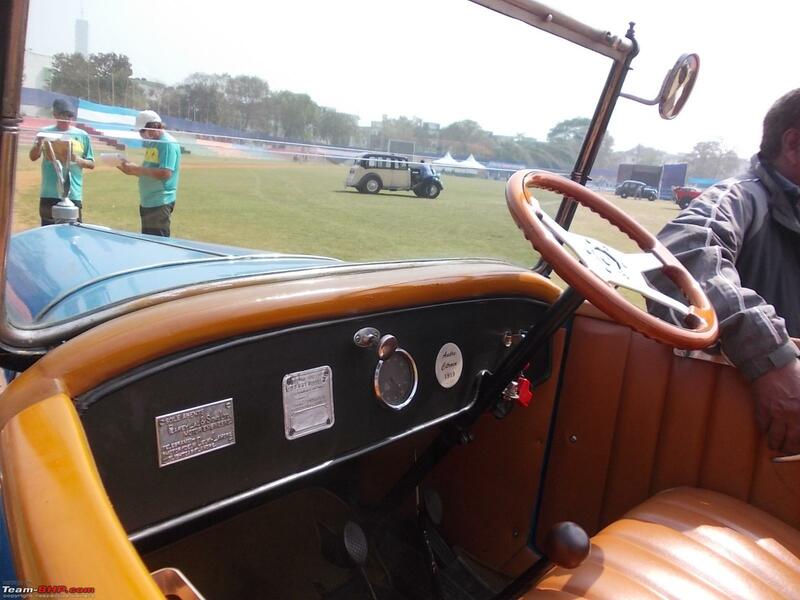 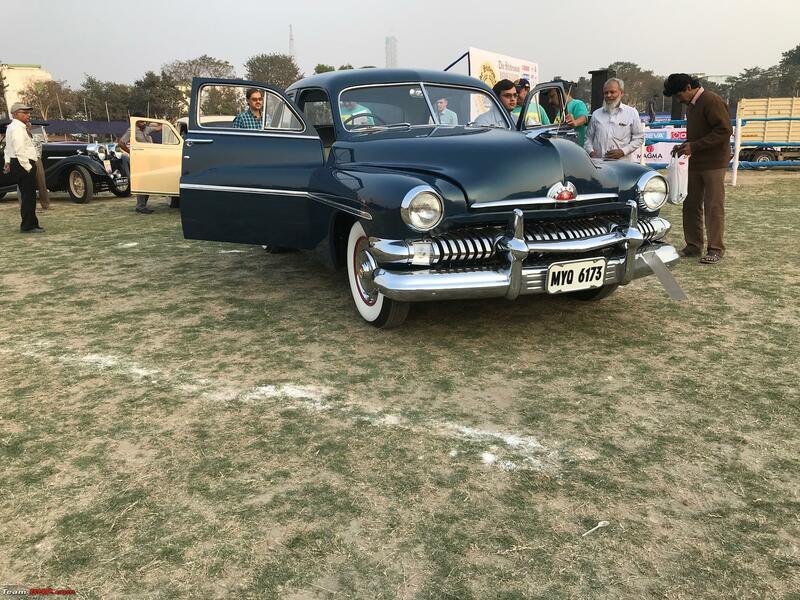 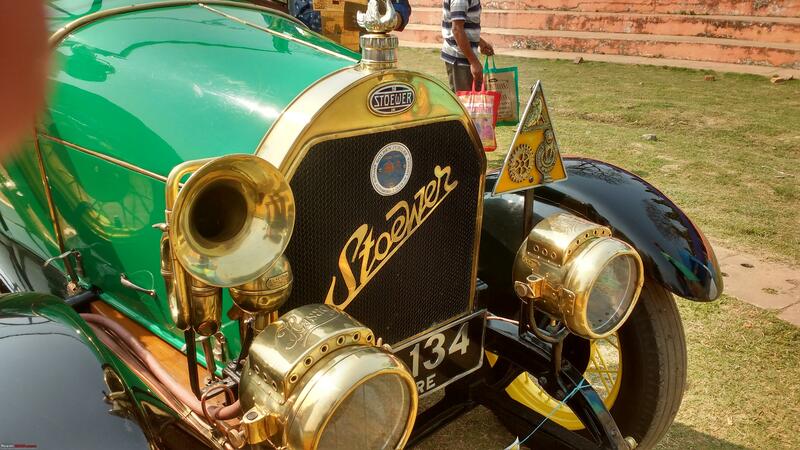 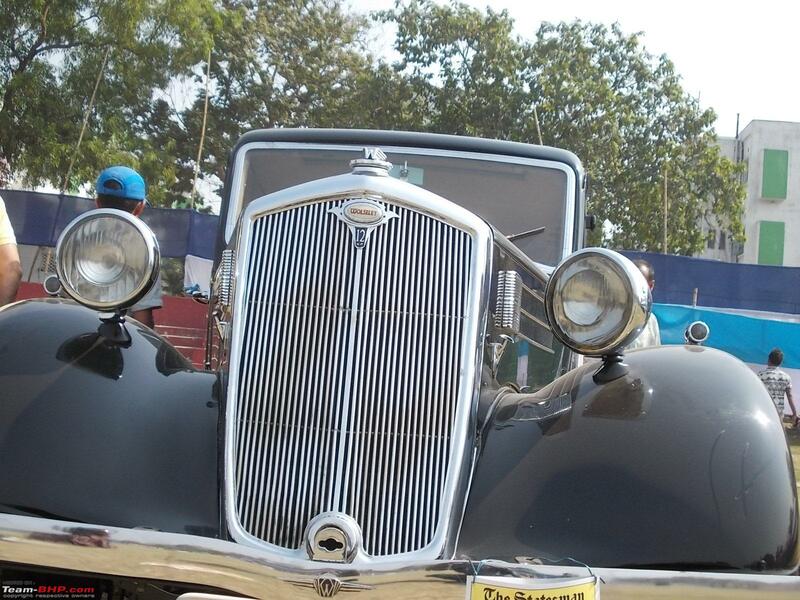 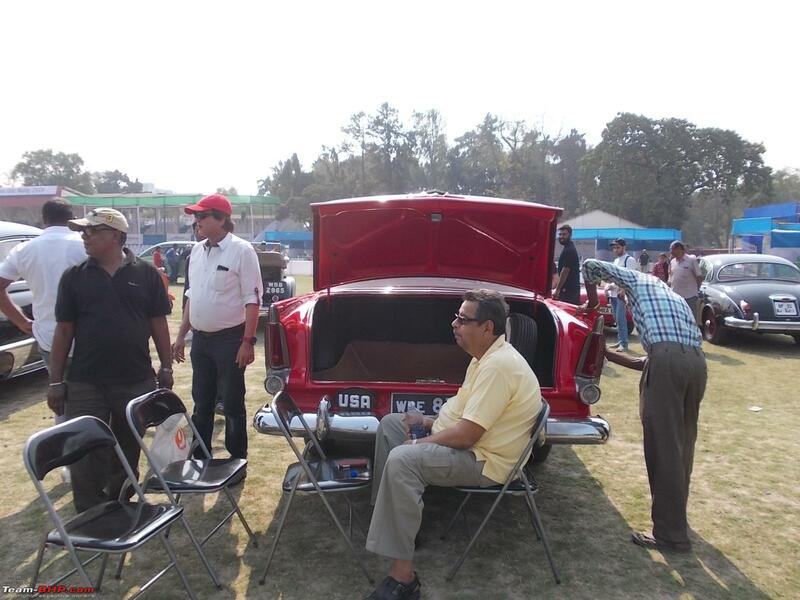 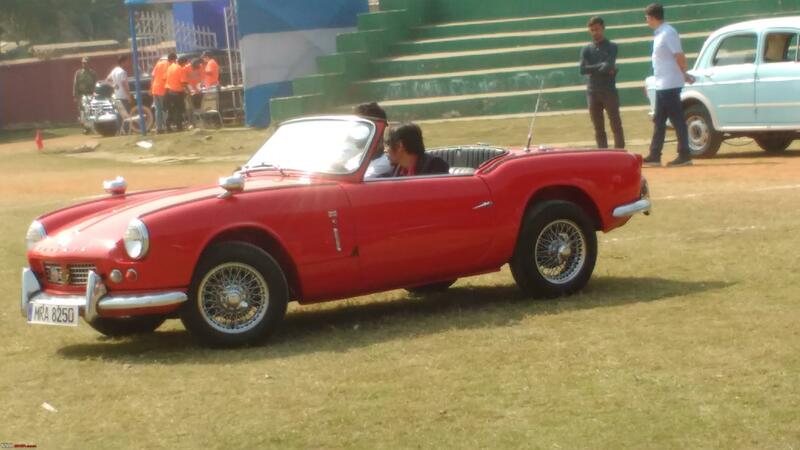 The Statesman Vintage and Classic Car Rally, 2019 was organised on 3rd February 2019 at the old venue viz. 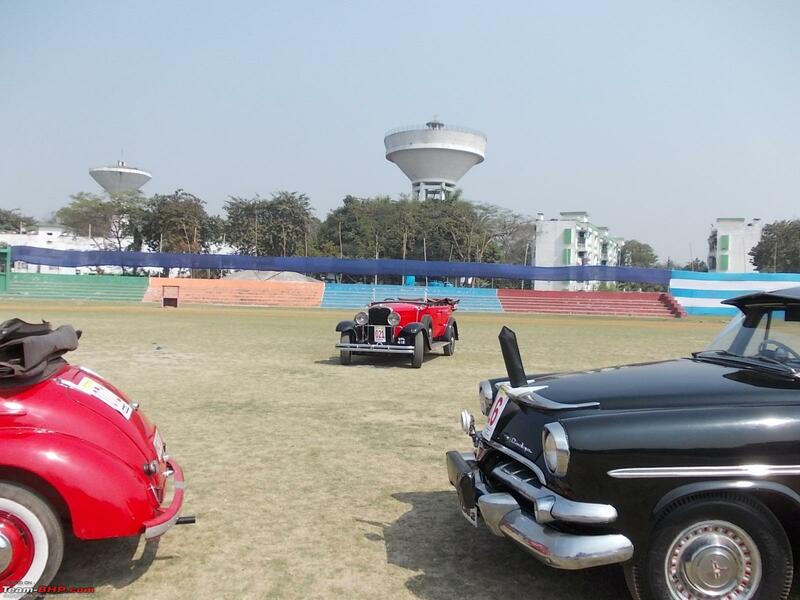 Fort William Parade Ground of the Indian Army's Eastern Command in Kolkata. 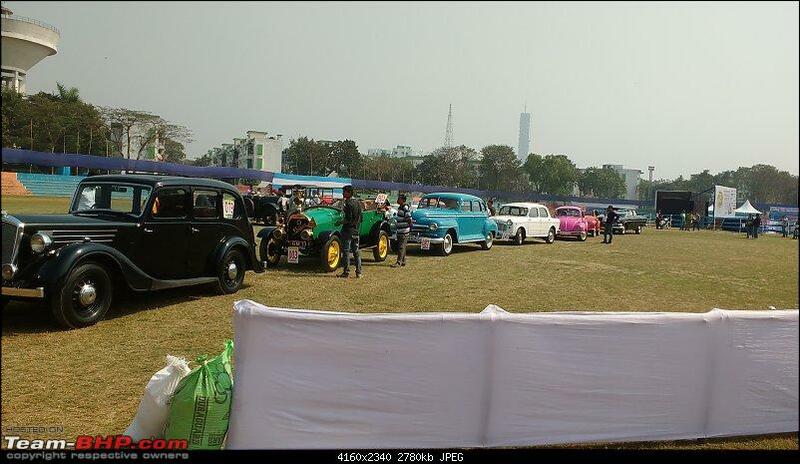 Incidentally, this was its Golden jubilee year and the posters showed it as a grand event. 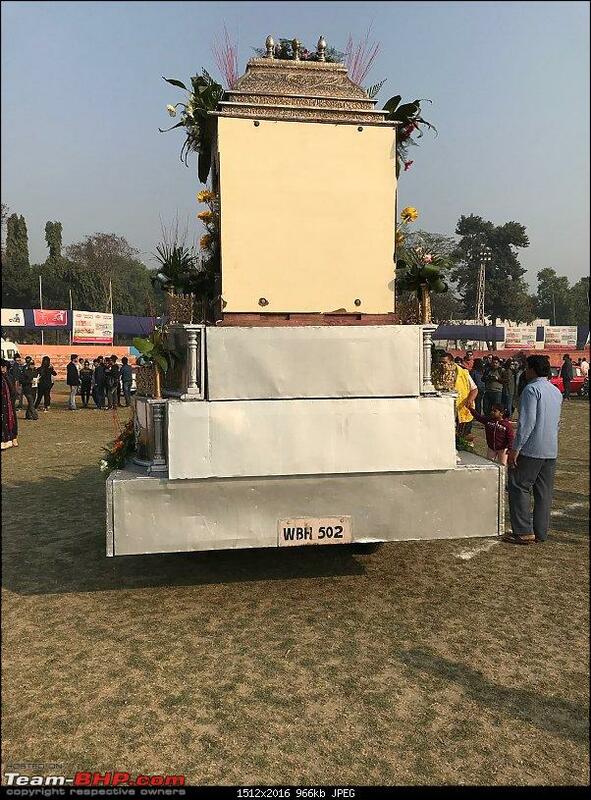 Other than the posters displaying it, there was not much pomp and show about the Golden Jubilee which obviously needed to have been celebrated with a greater zeal. 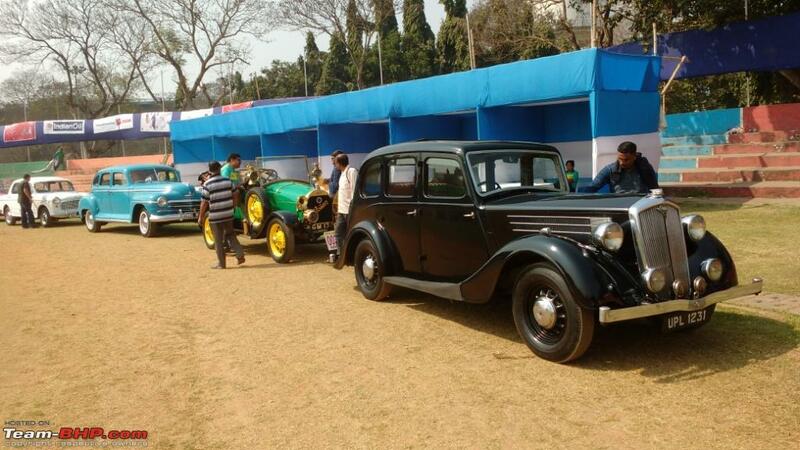 It is no mean feat to keep on organising such a gala event since 50 years. 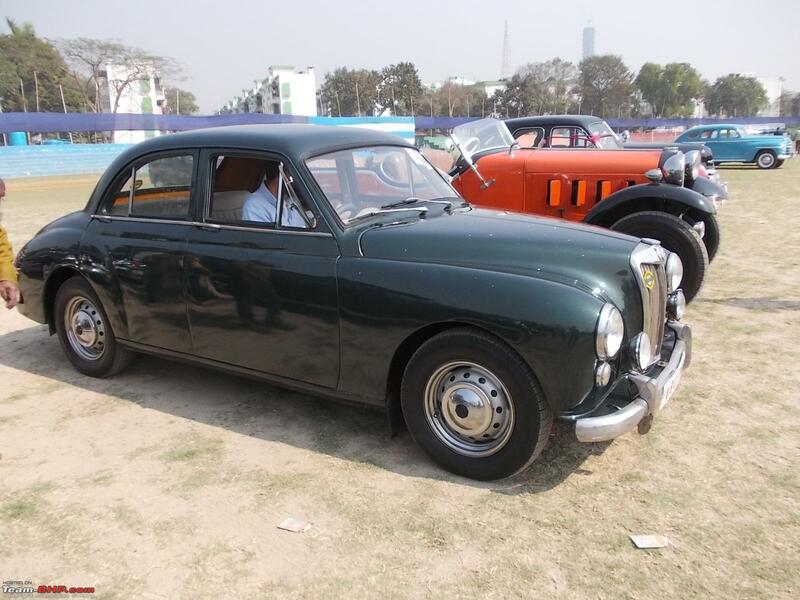 And to start with, 1969 was a year and the era when there was virtually no recognition of anything vintage on wheels by the classes and masses. 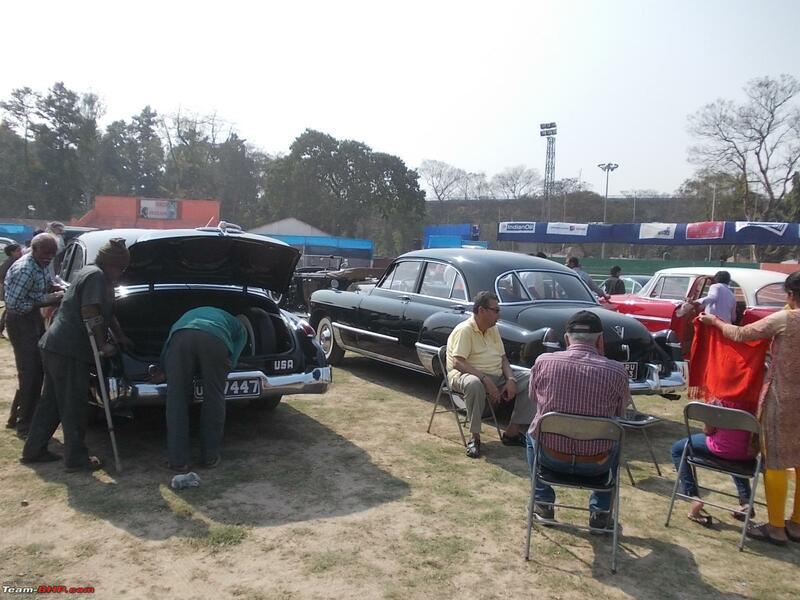 Only a handful of collectors and some afcionados took the vintage beauties seriously. 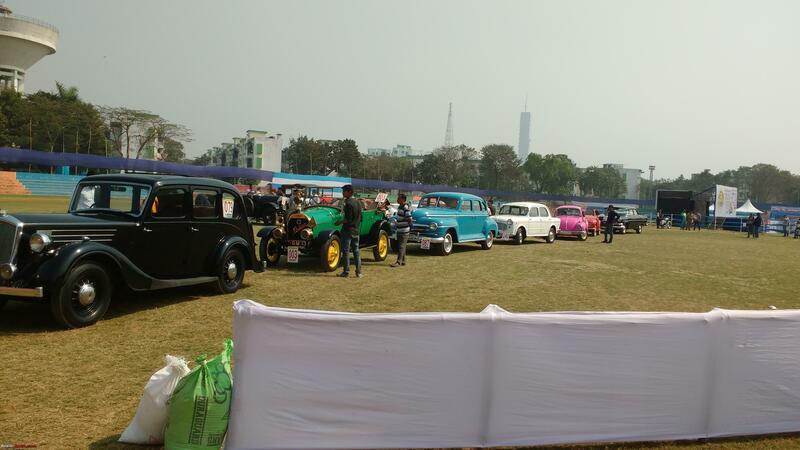 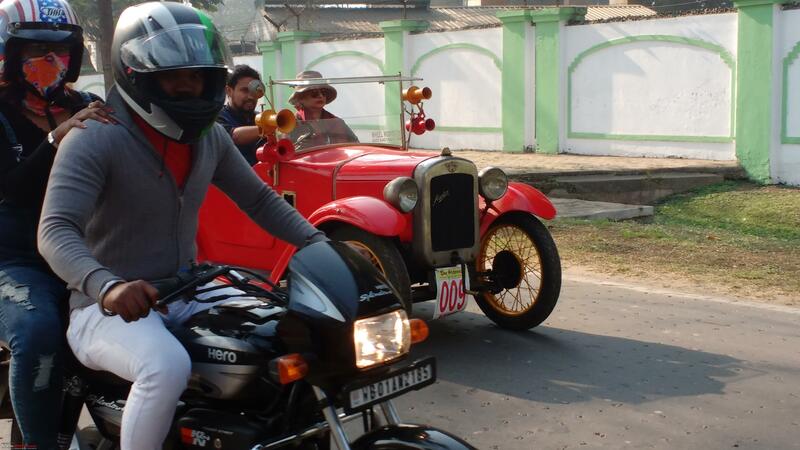 Nearly 150 cars and more than 40 two wheelers participated in the event. 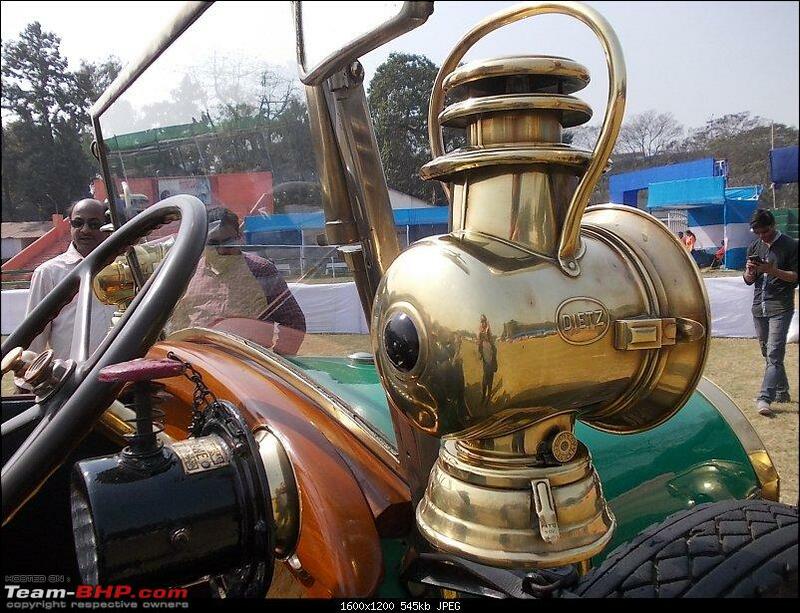 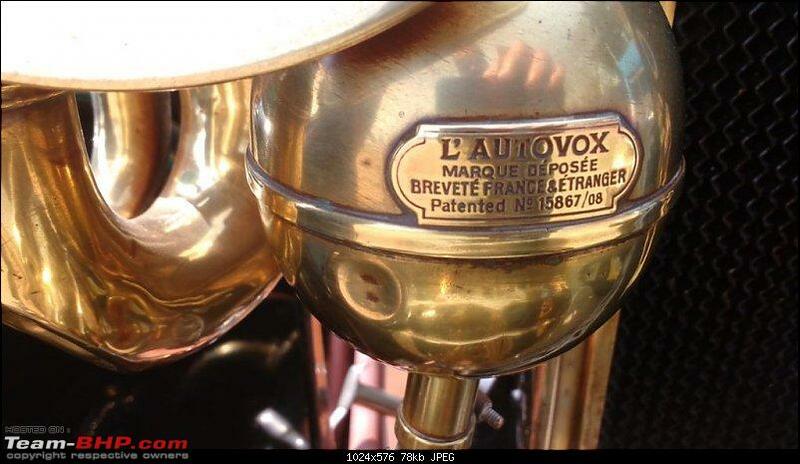 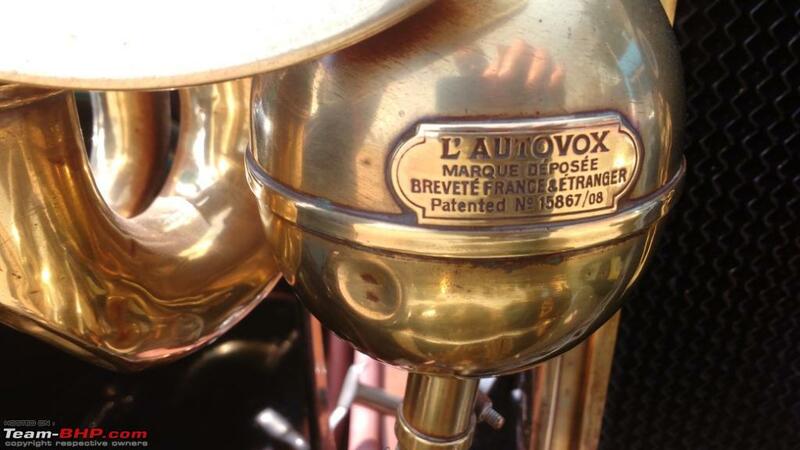 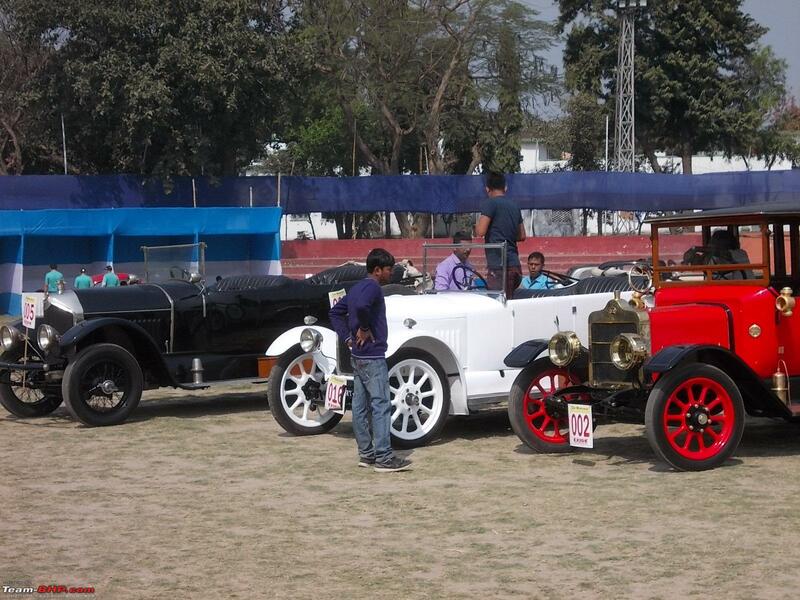 The oldest was a 1906 Renault Freres, while the newer ones were classics from the 1960's. 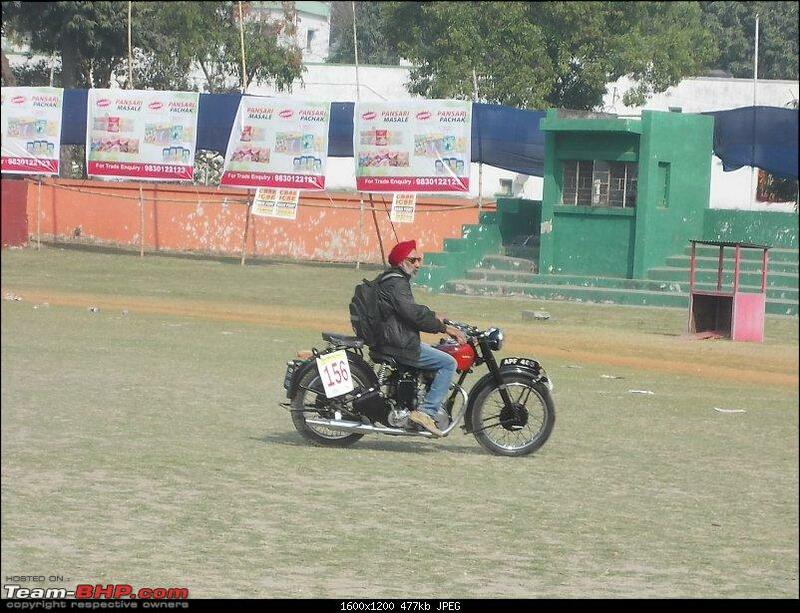 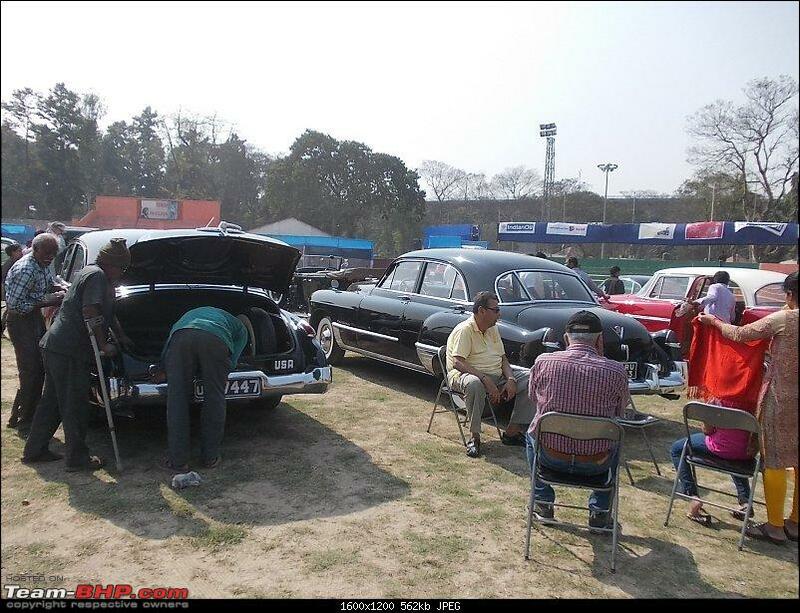 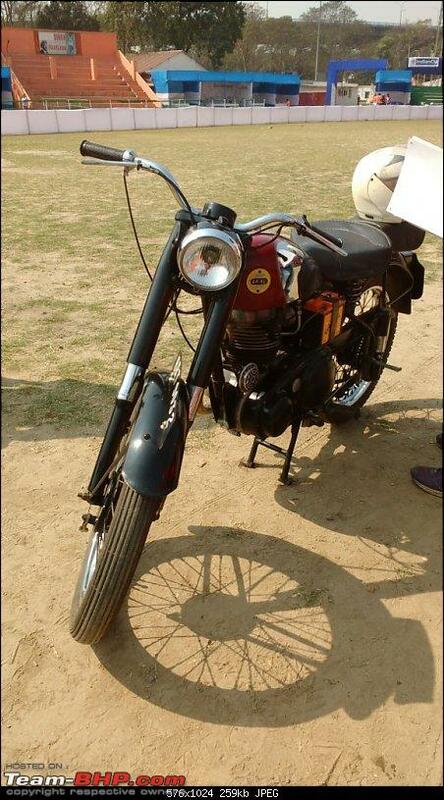 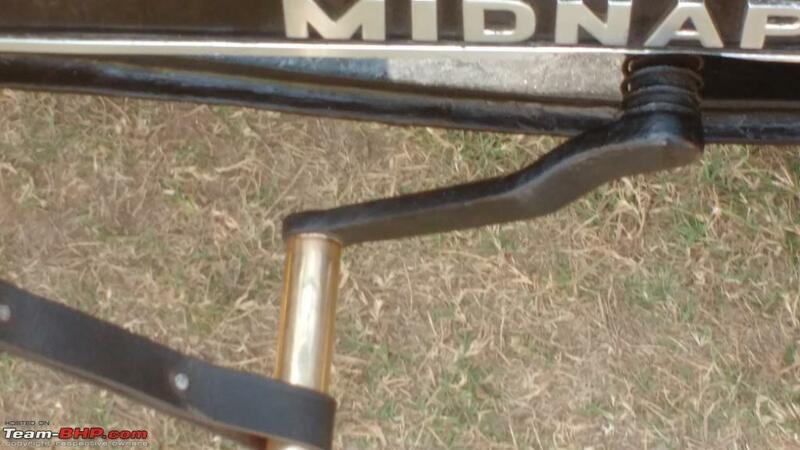 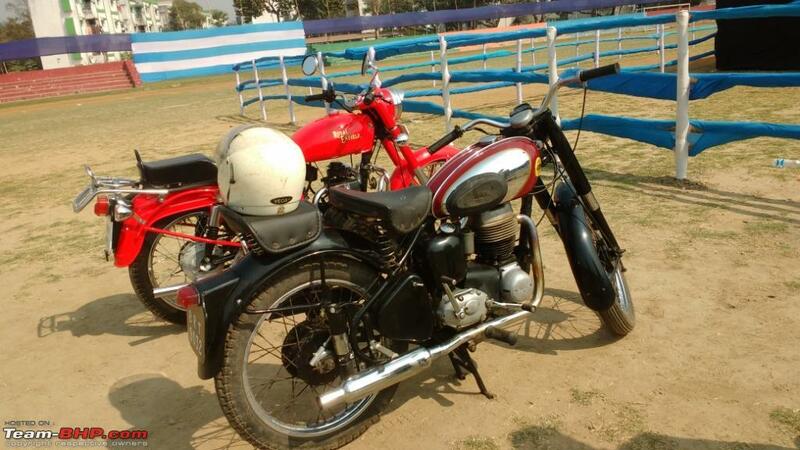 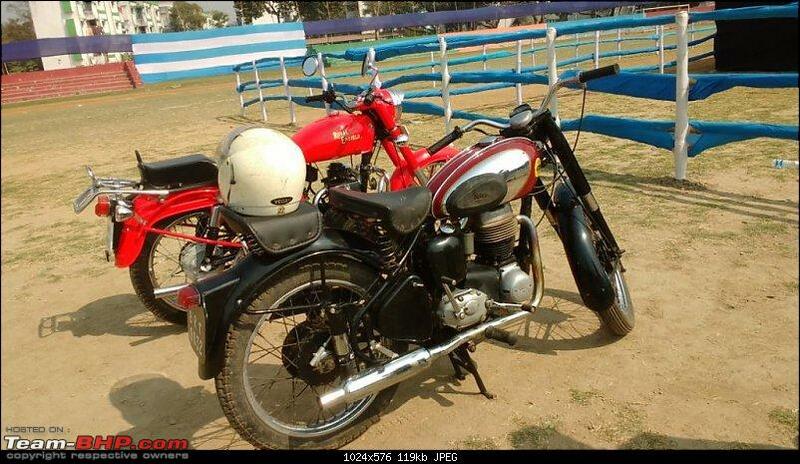 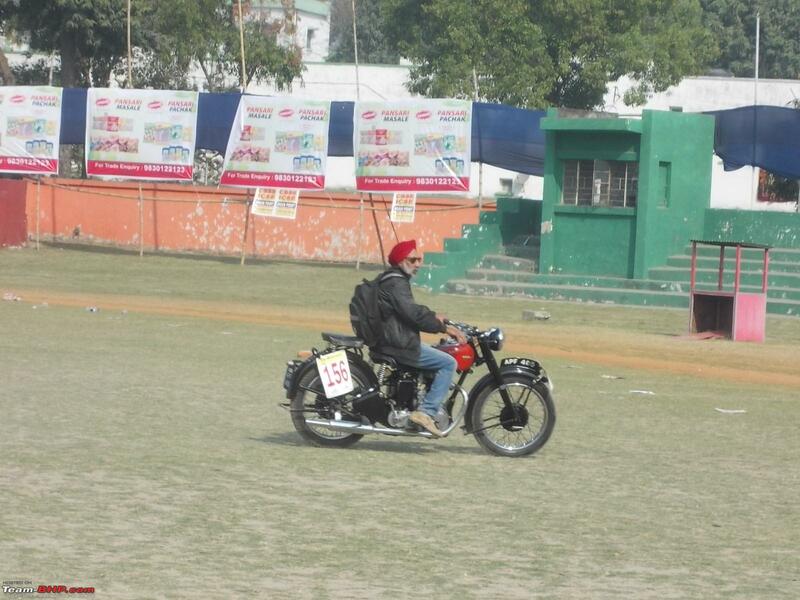 Indian branded classics were allowed for the first time ever, but restricted to 1965 or earlier. 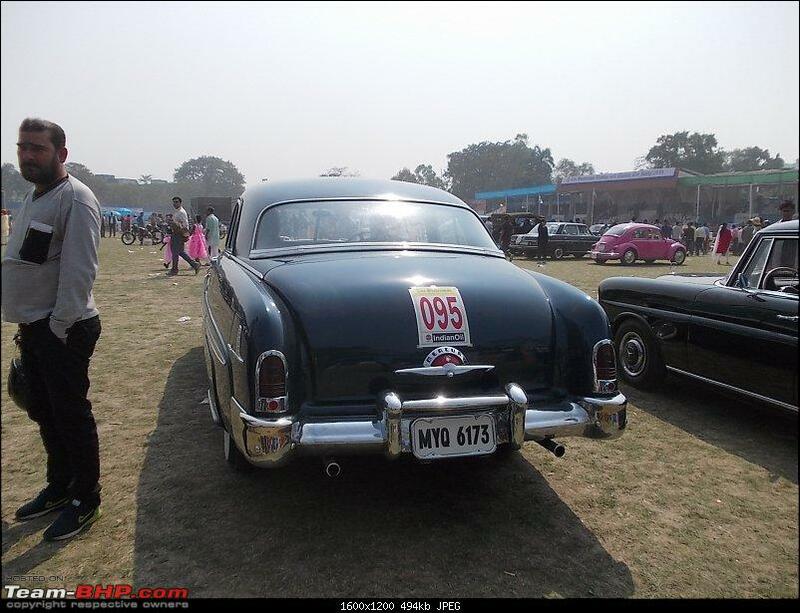 So we saw three Indian branded cars from Hindustan Motors as entries viz. 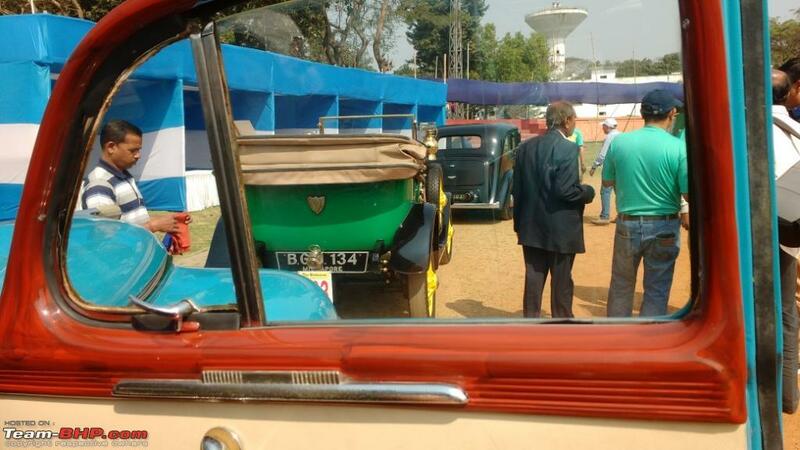 a Landmaster and two Ambassadors. 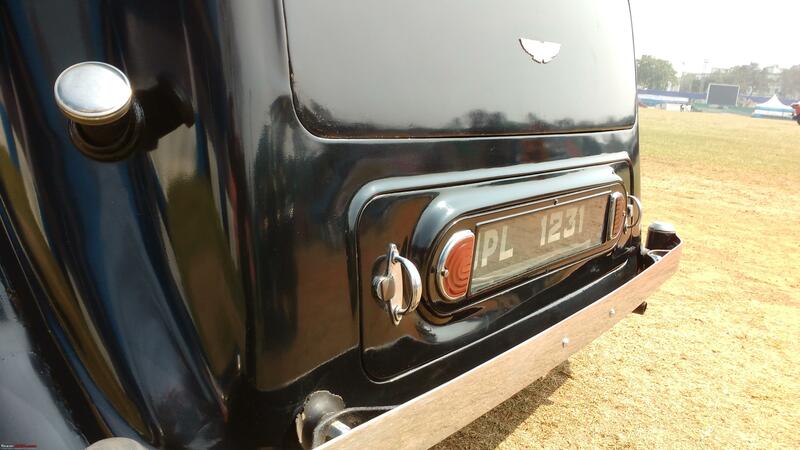 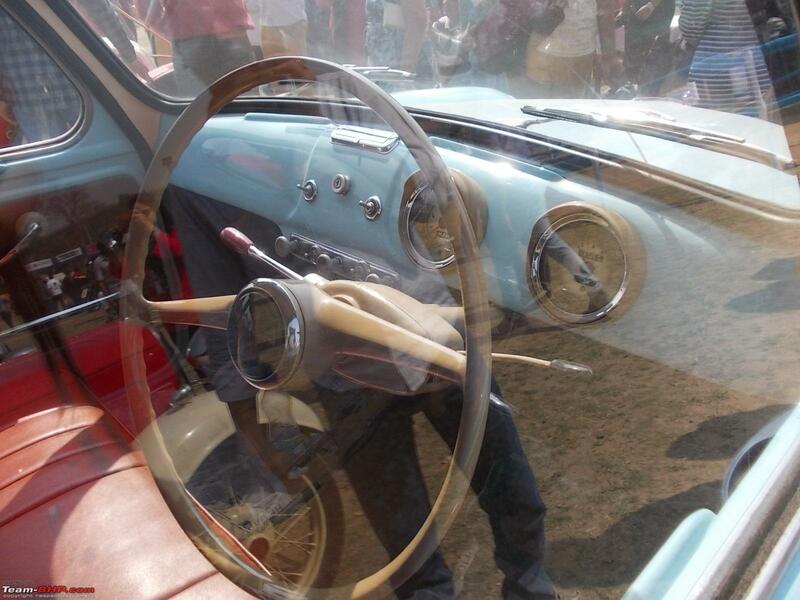 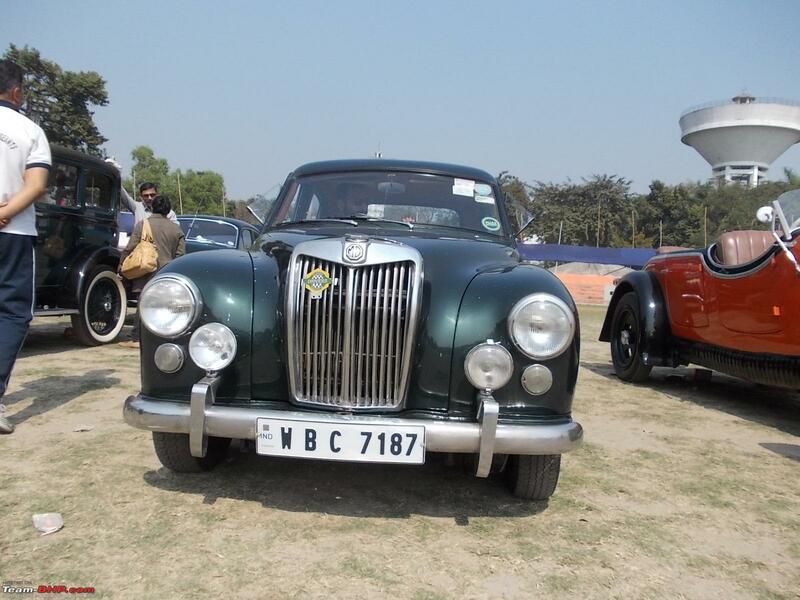 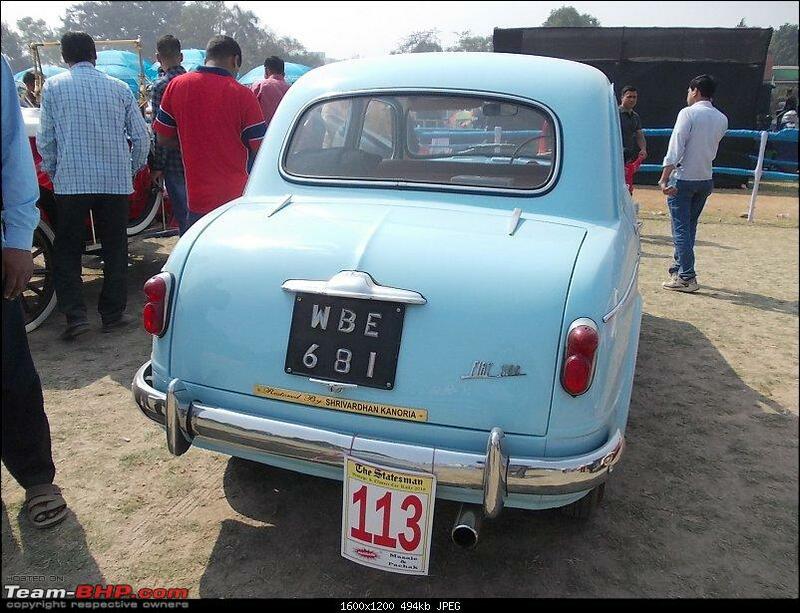 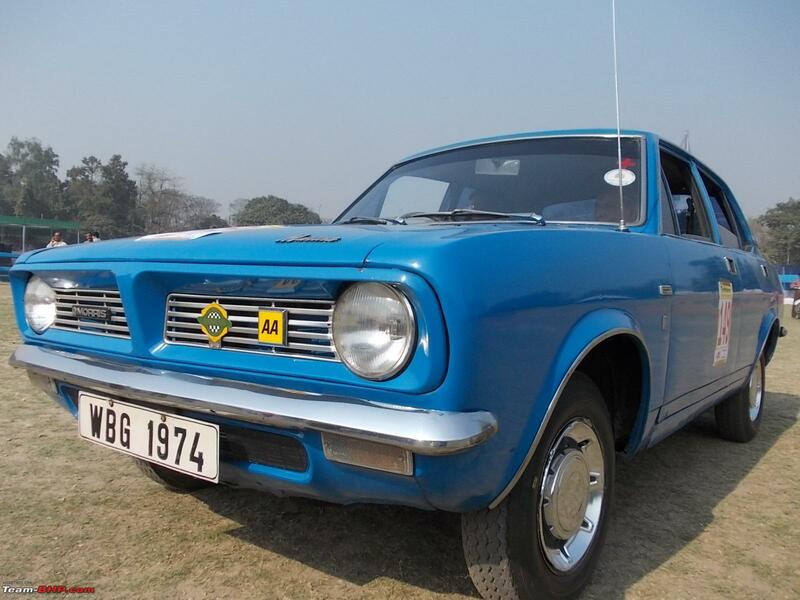 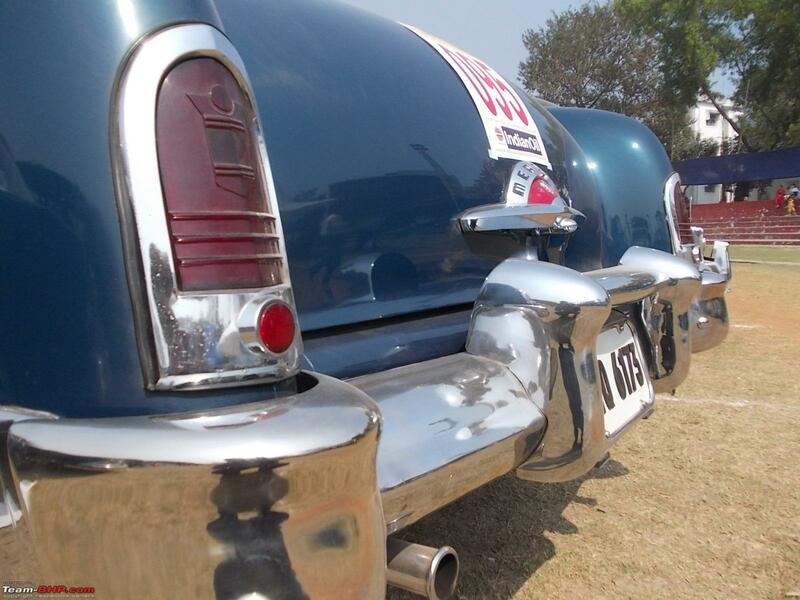 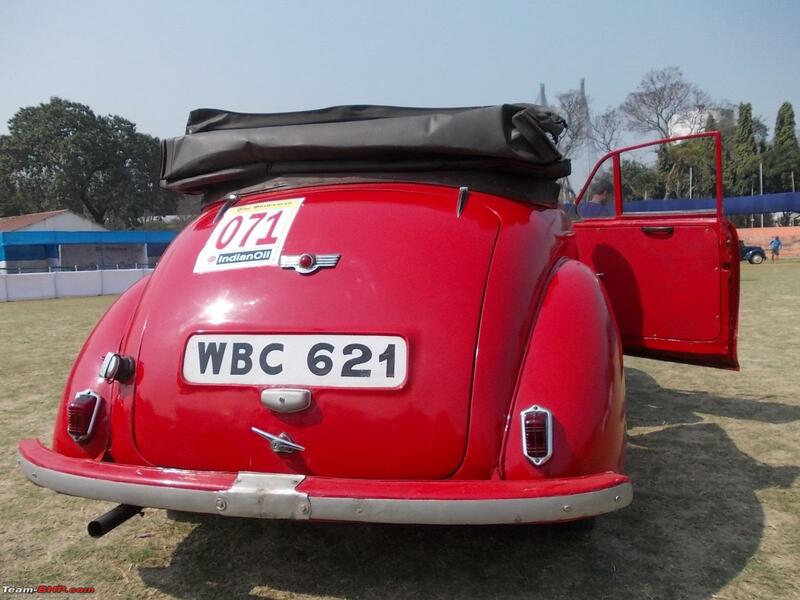 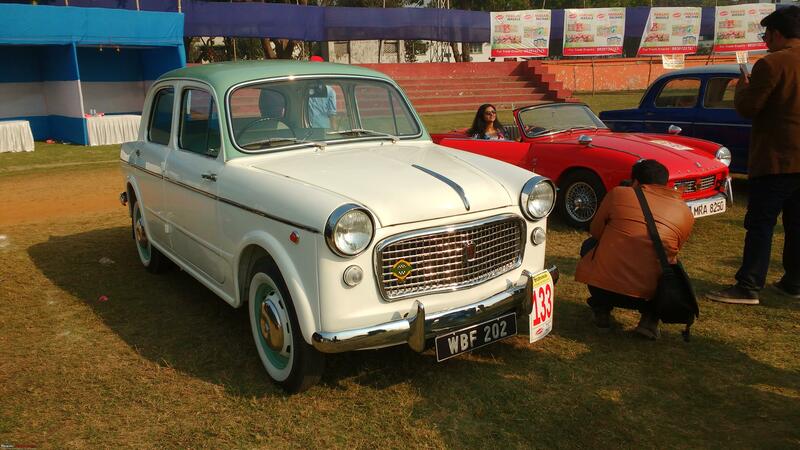 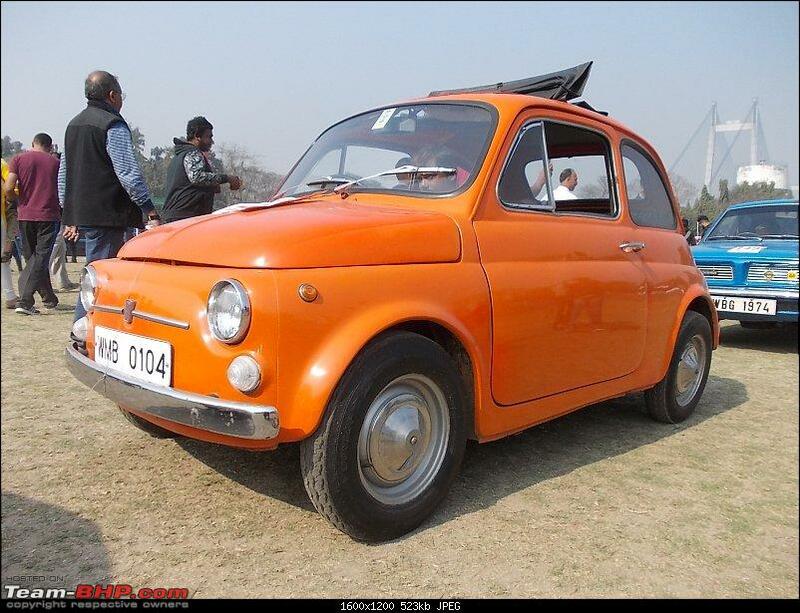 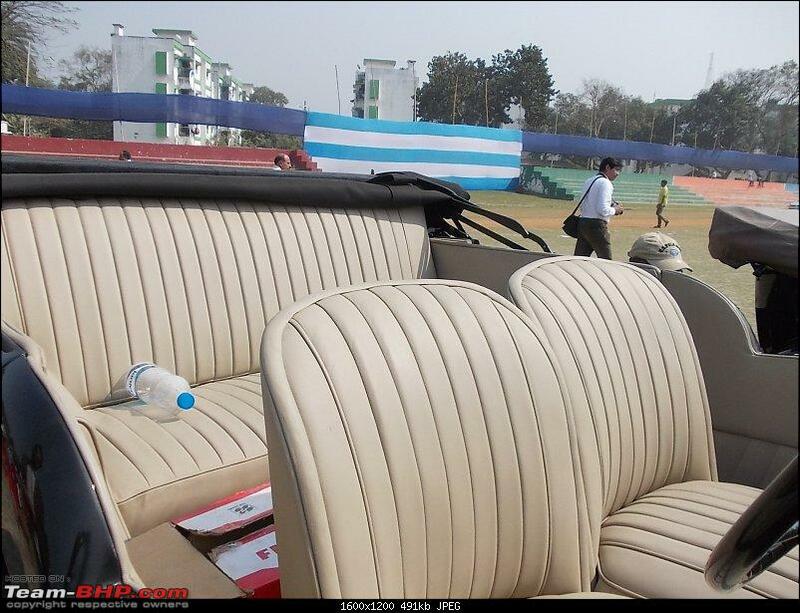 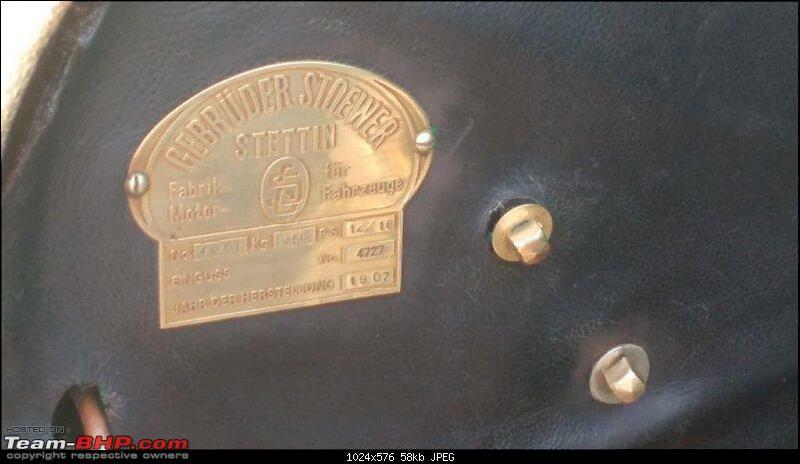 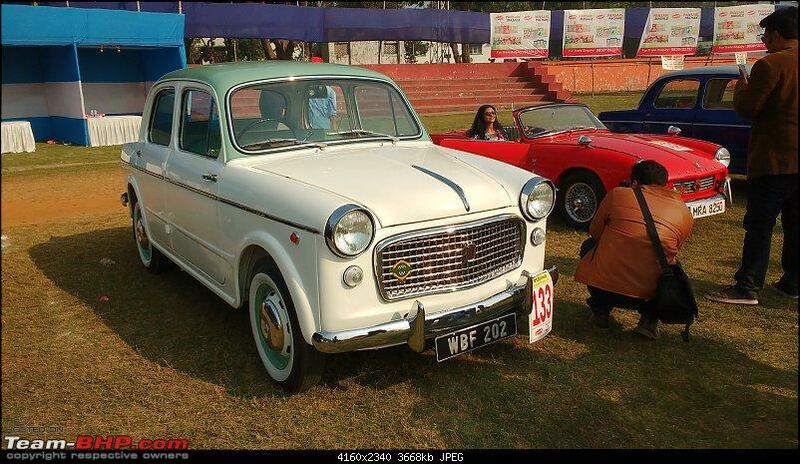 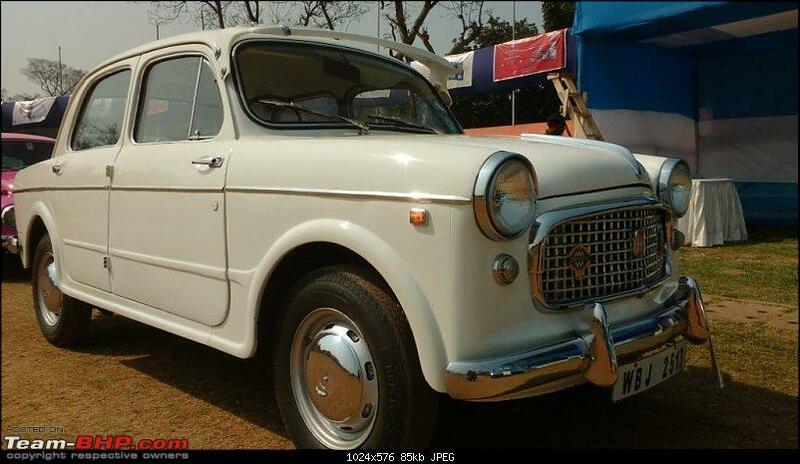 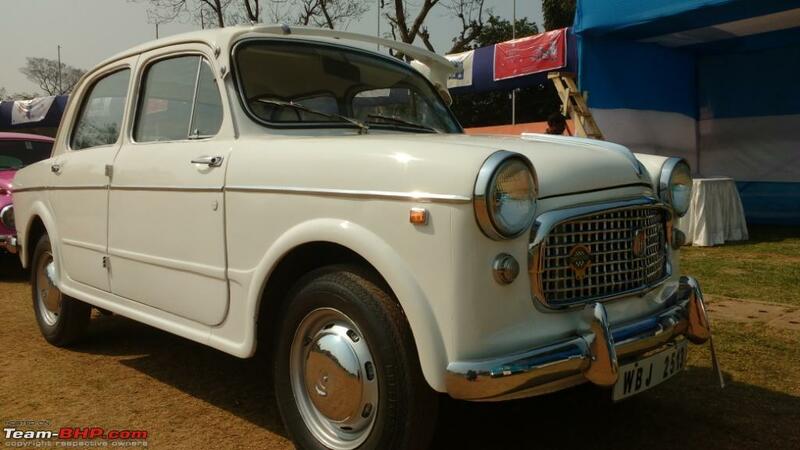 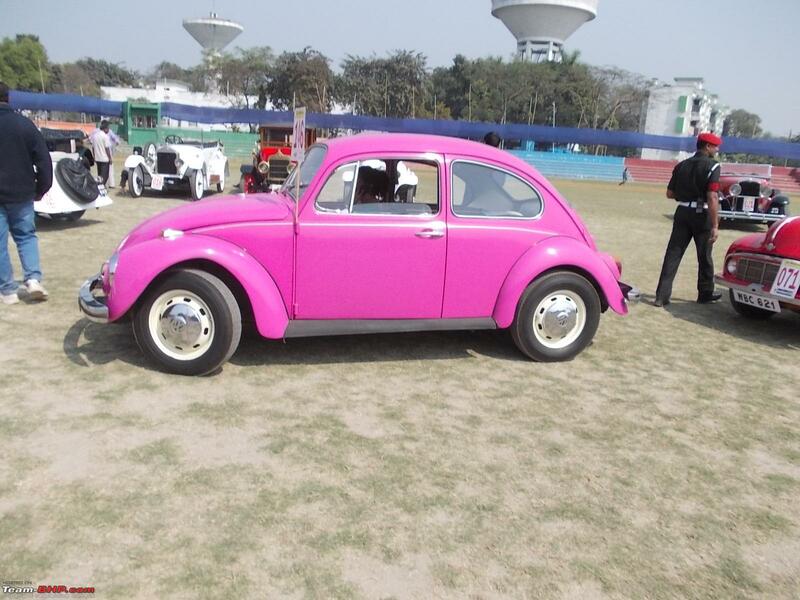 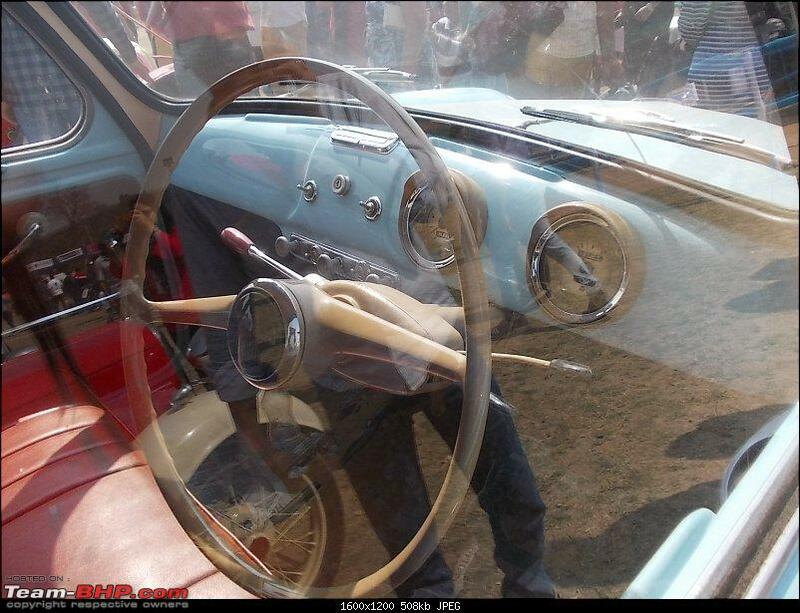 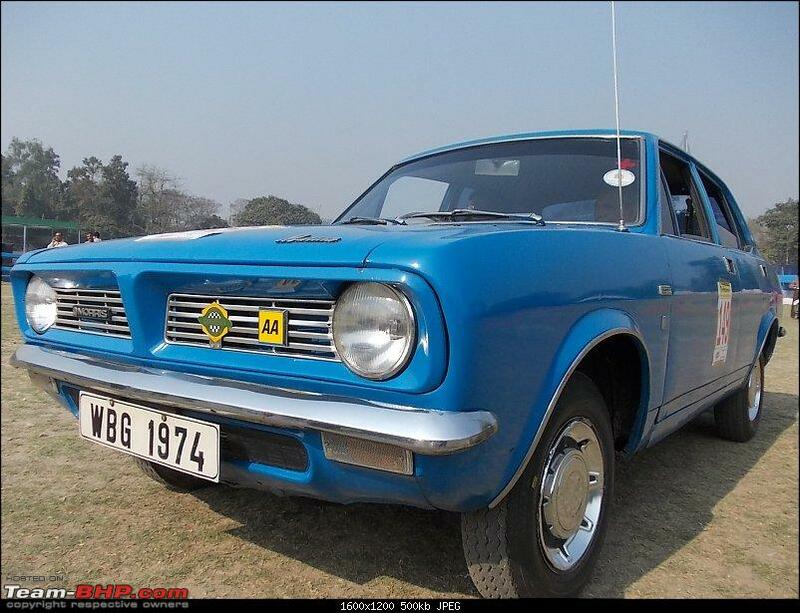 The floodgates had been opened for classic Standards and Fiats with the "Made in India' tag earlier. 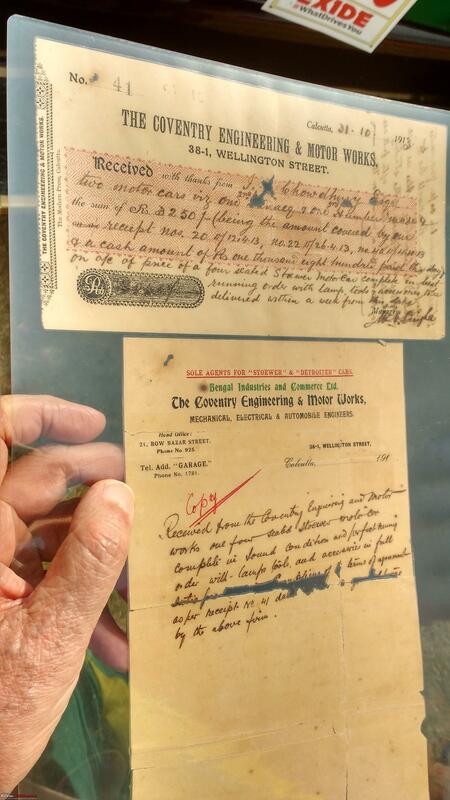 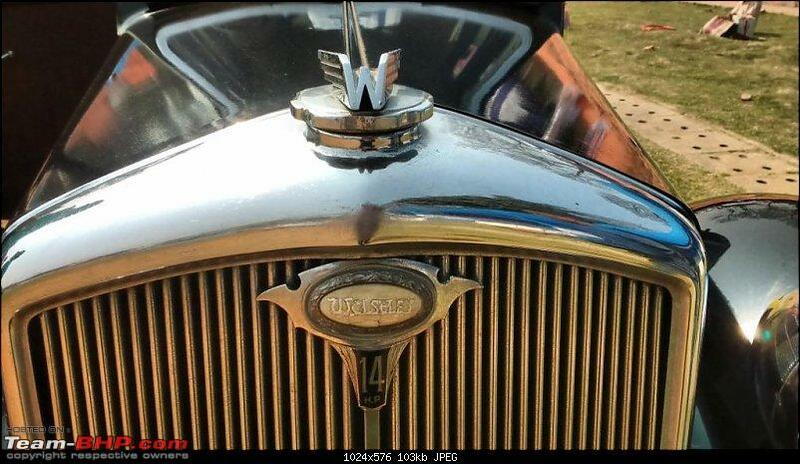 These were foreign brands. 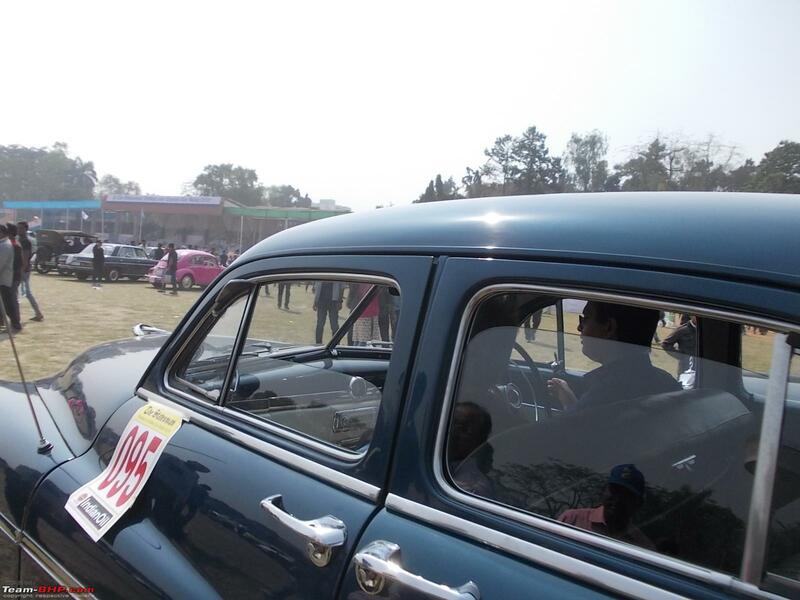 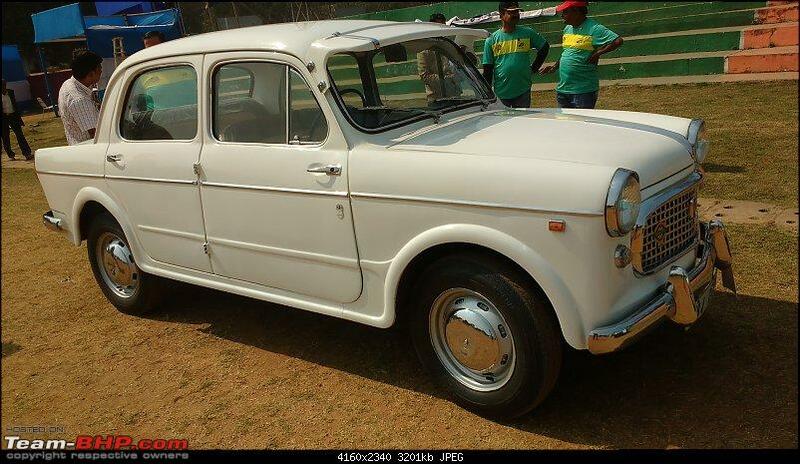 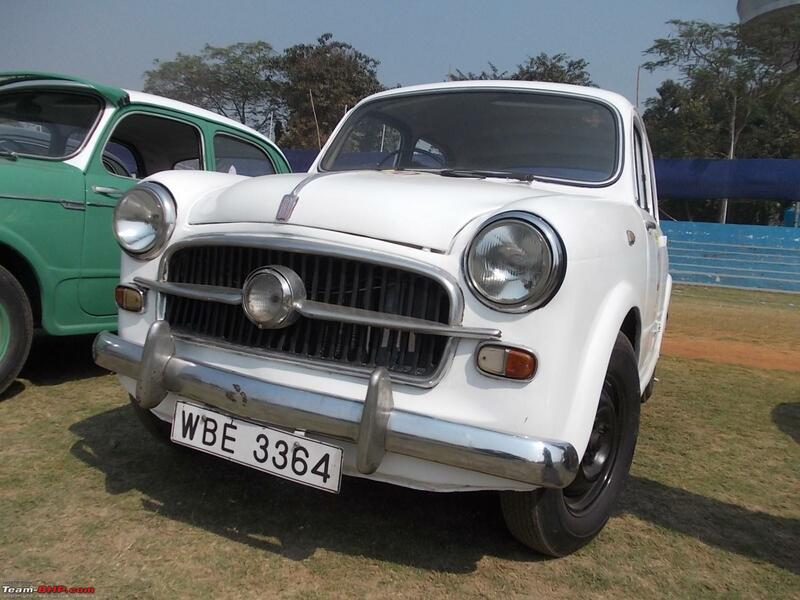 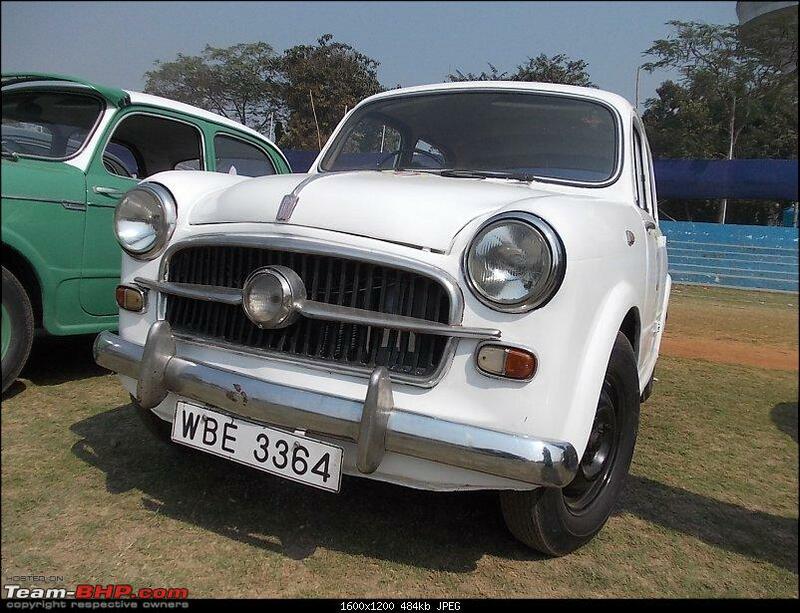 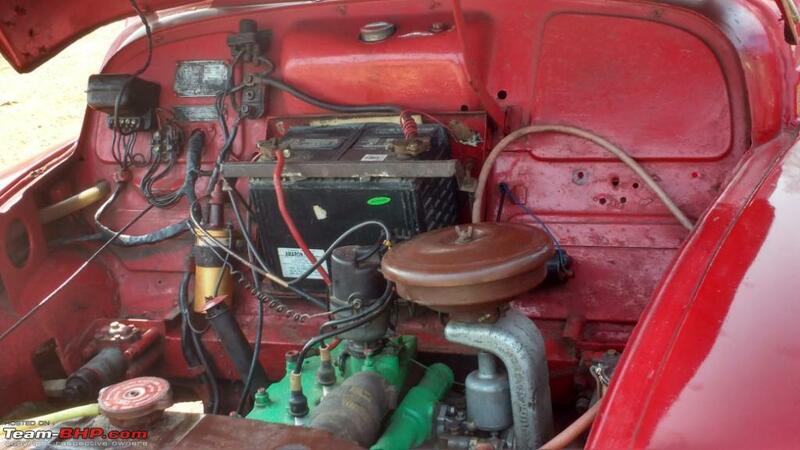 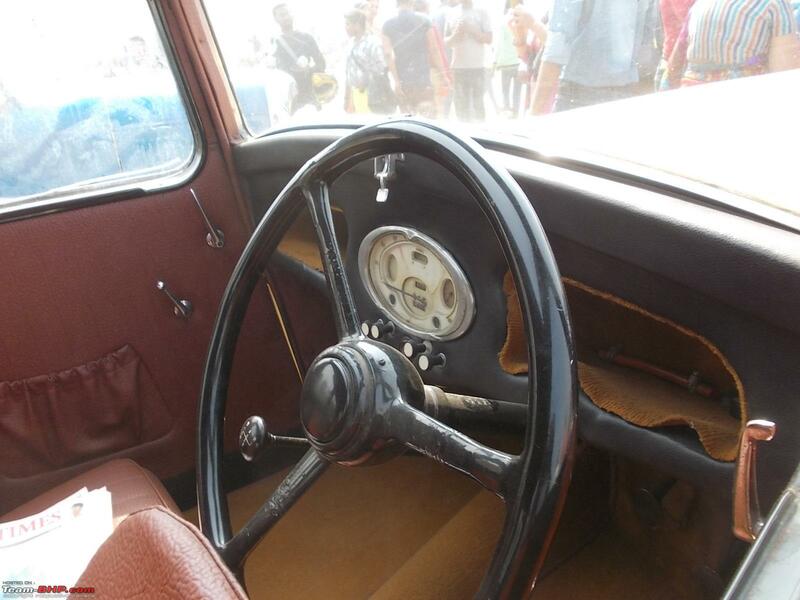 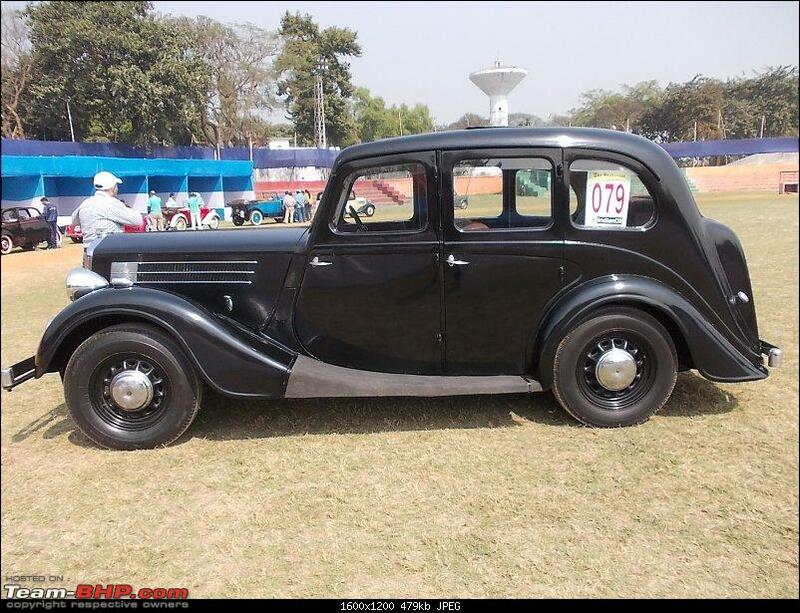 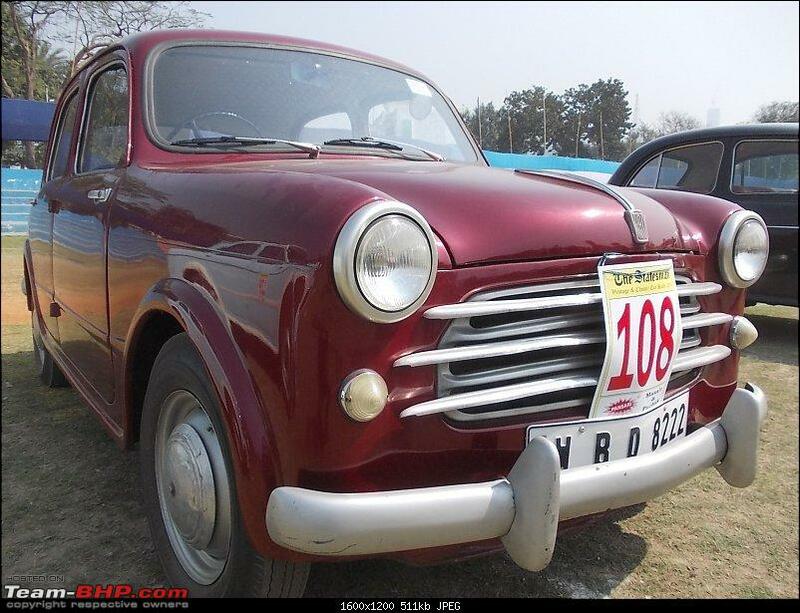 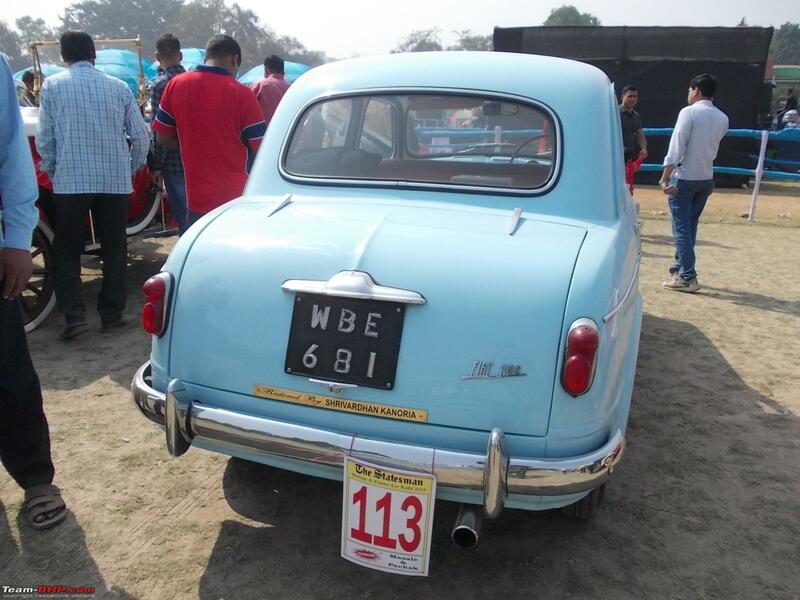 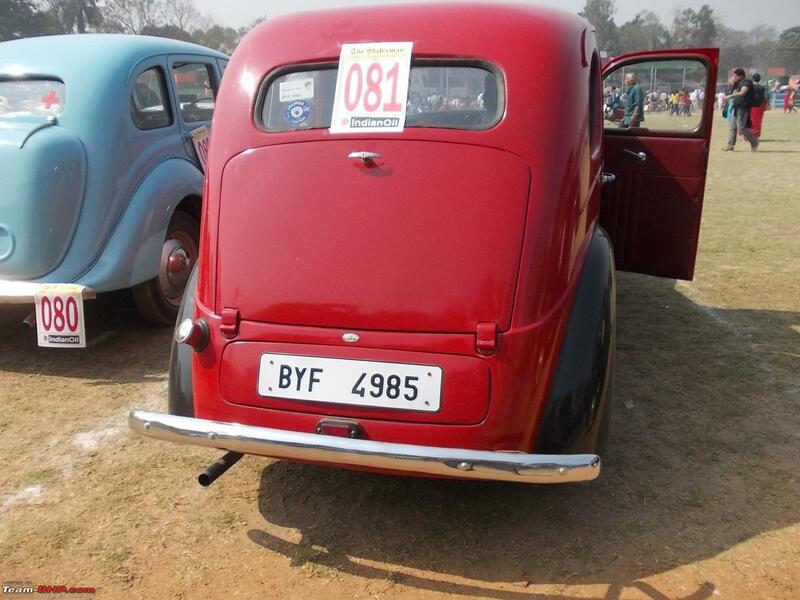 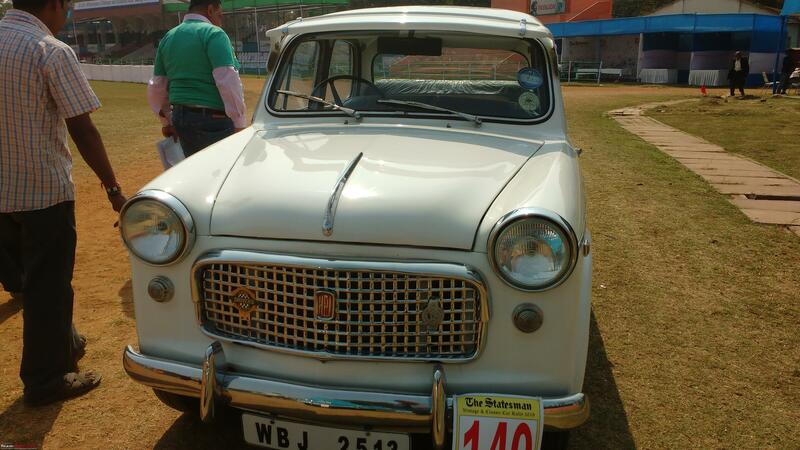 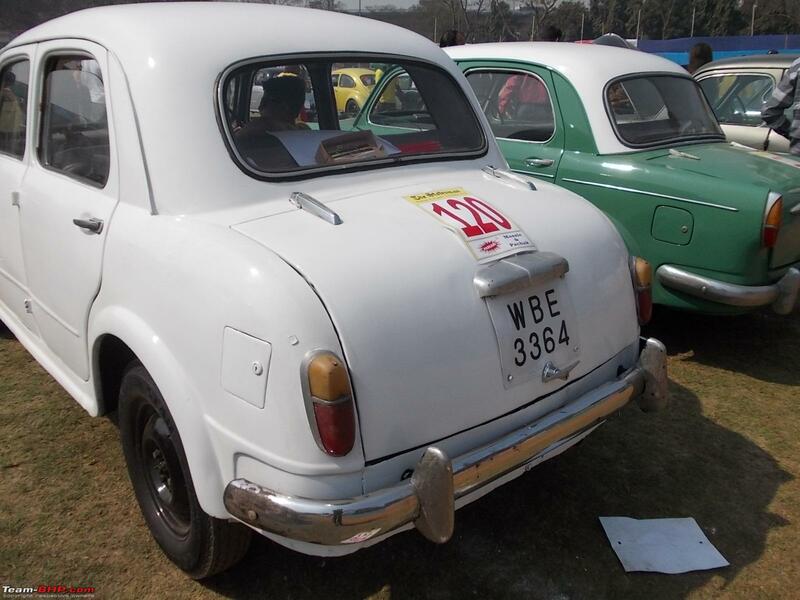 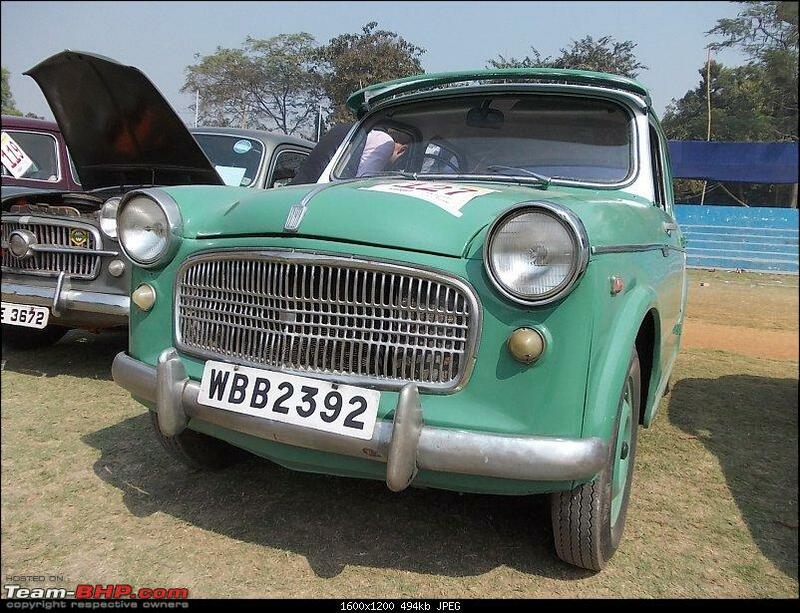 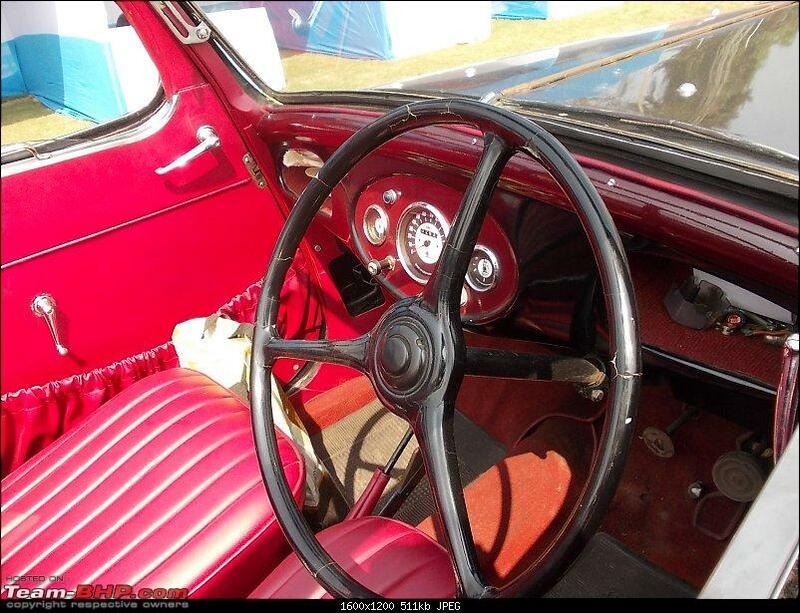 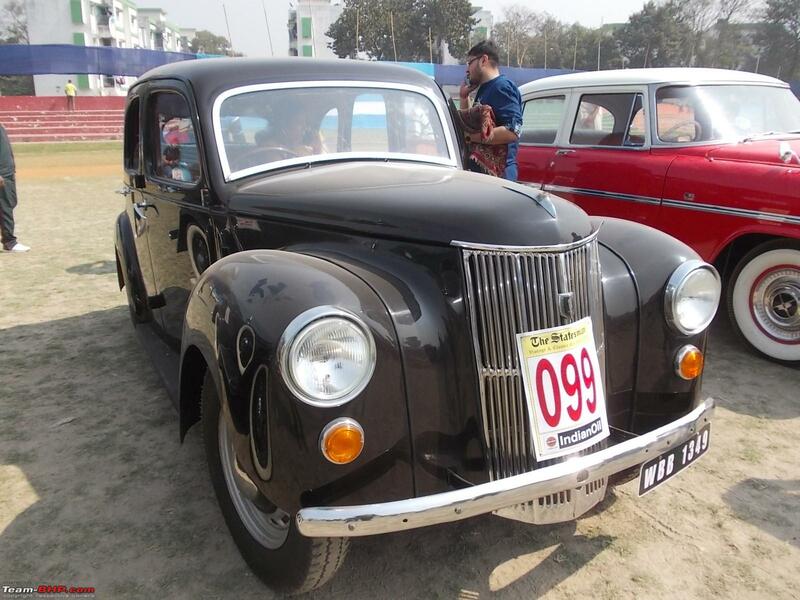 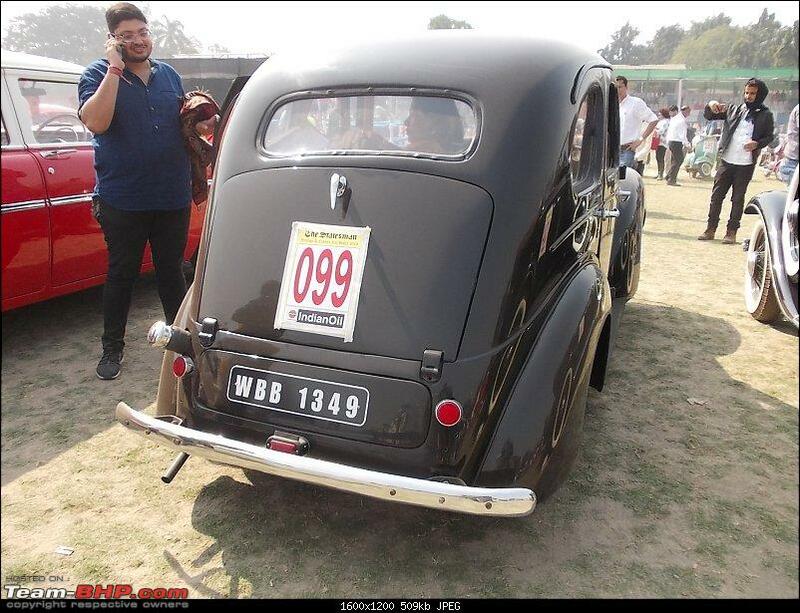 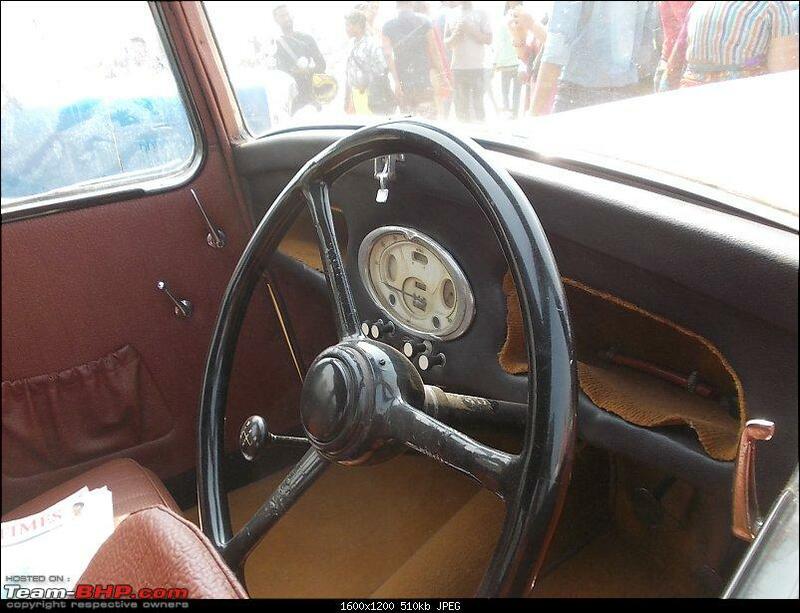 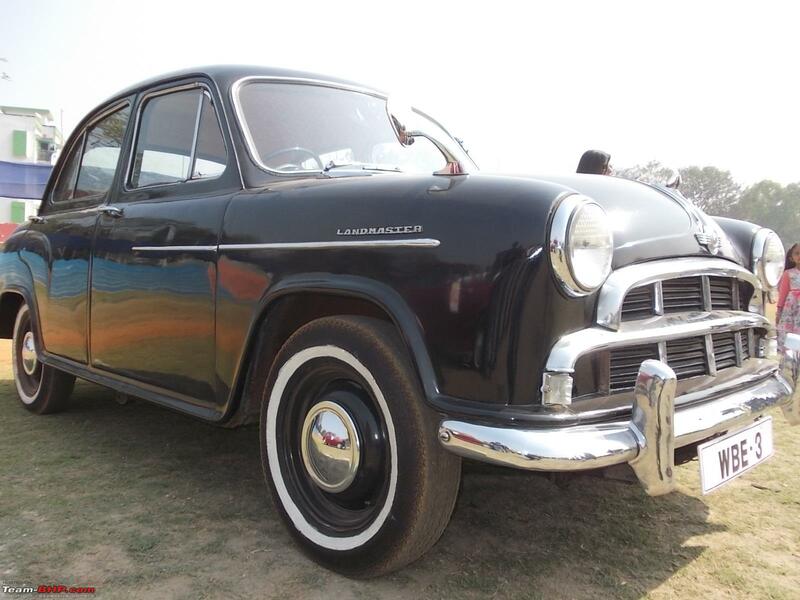 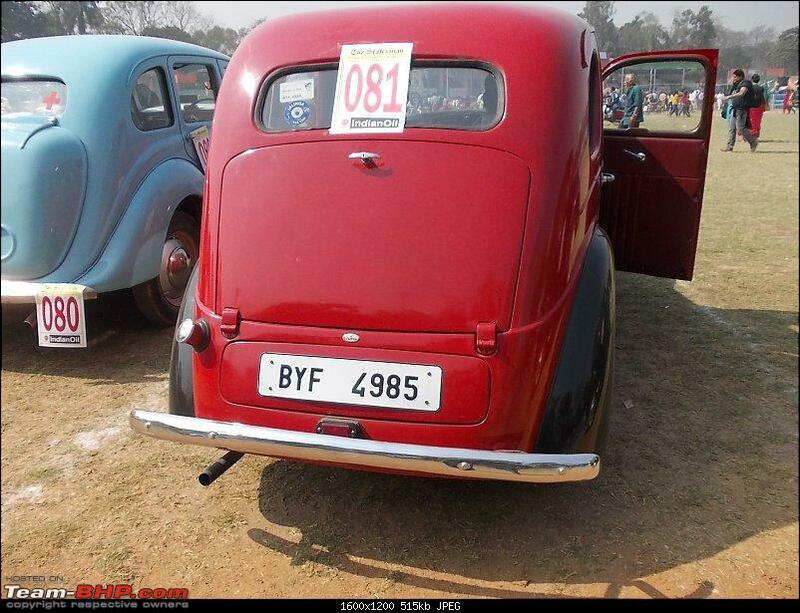 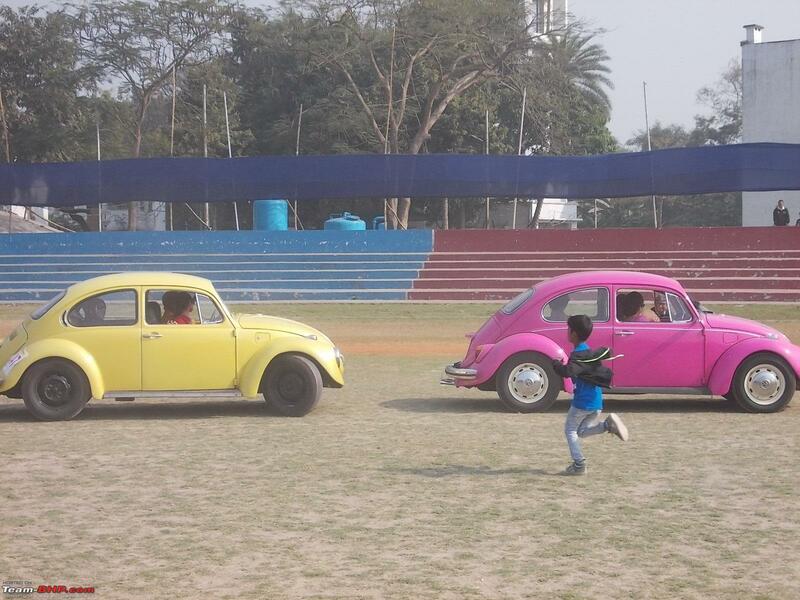 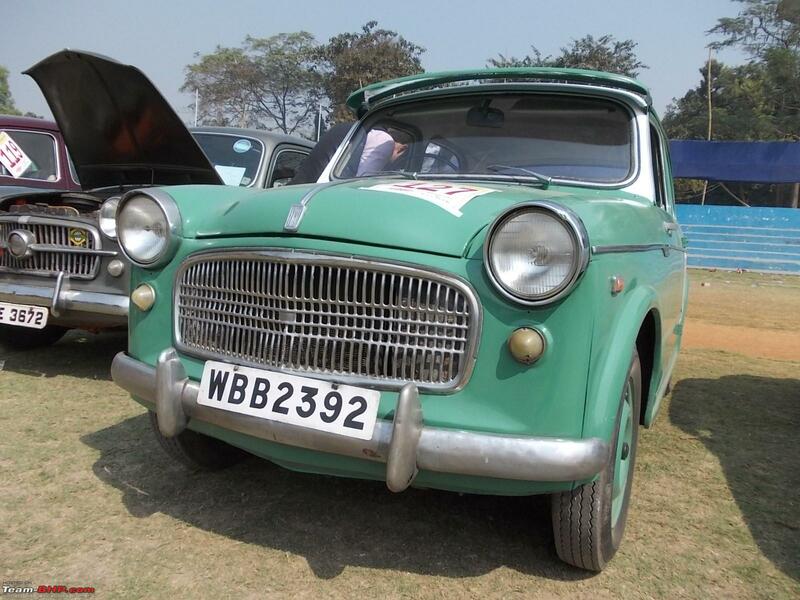 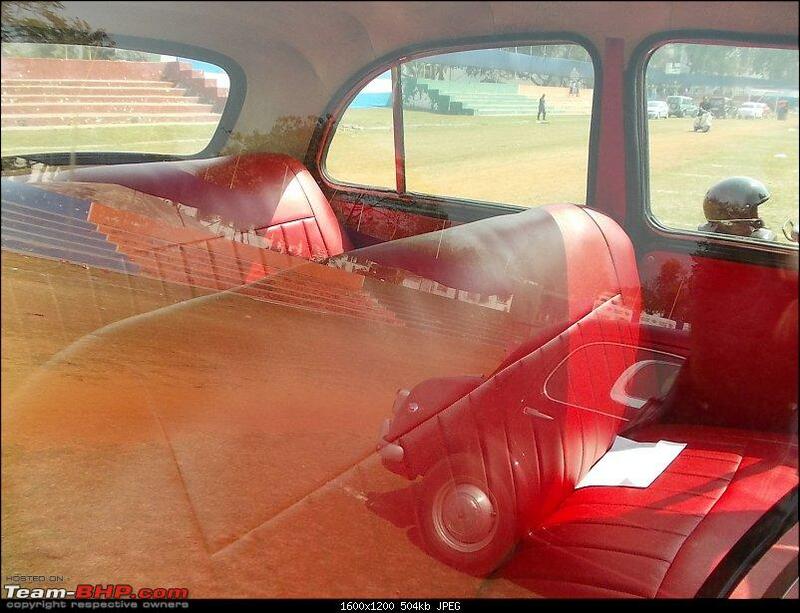 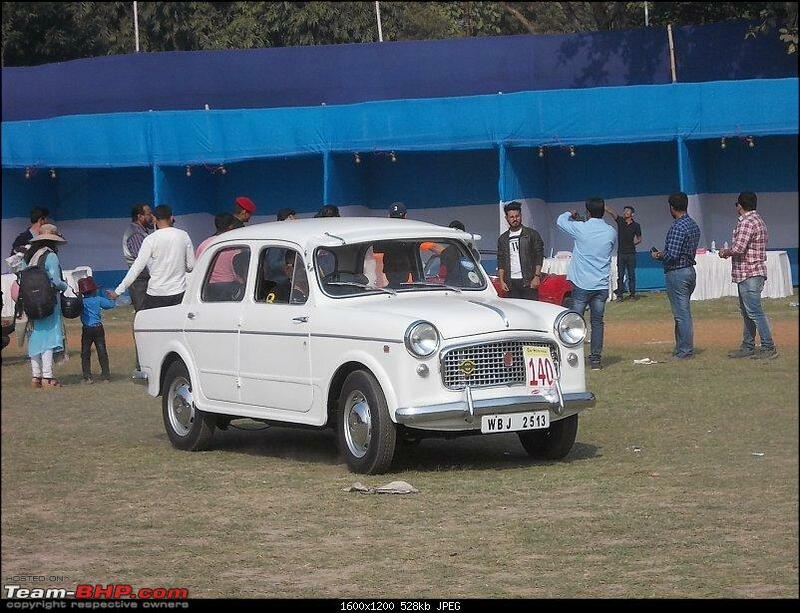 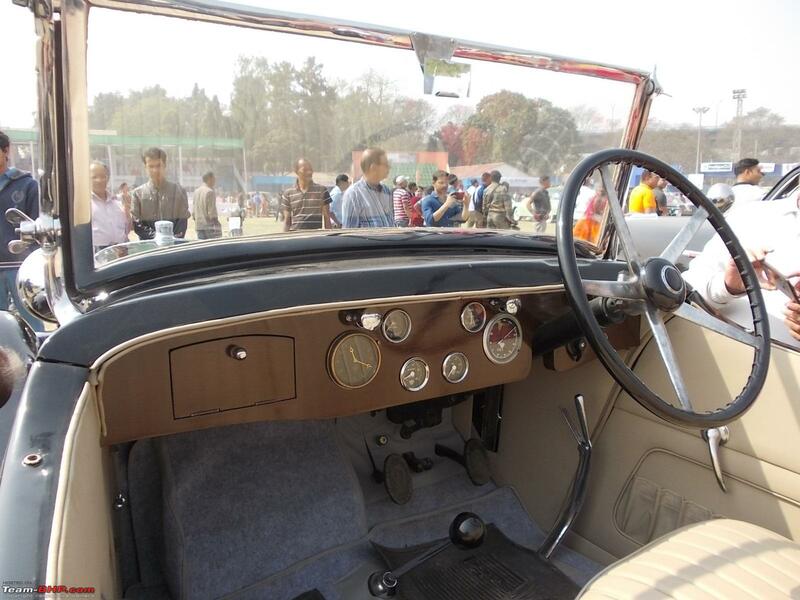 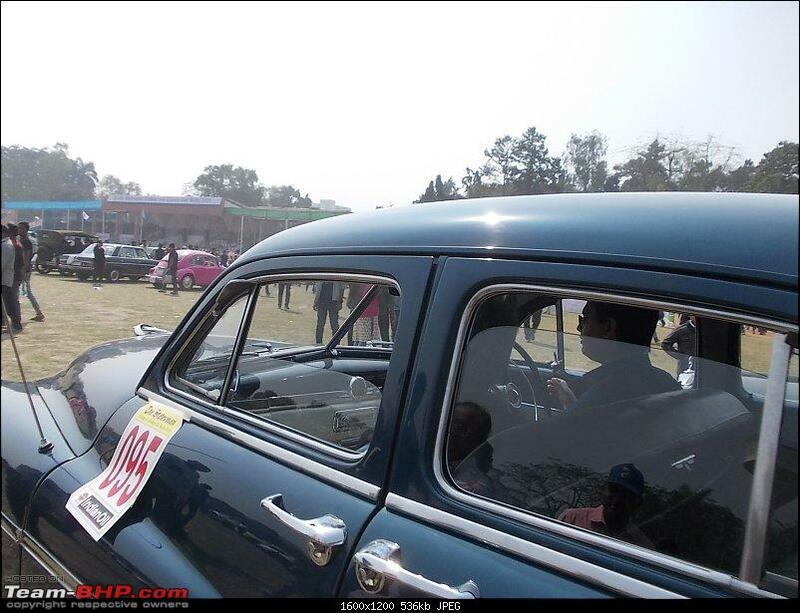 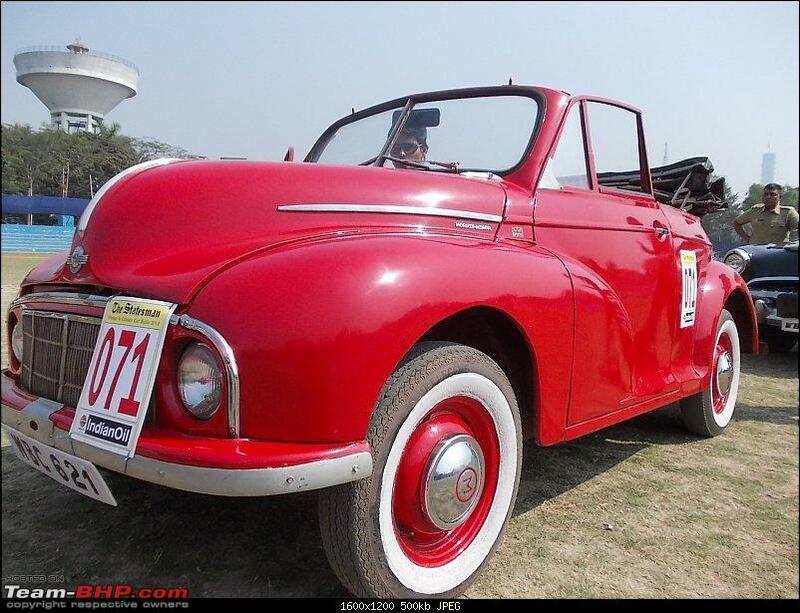 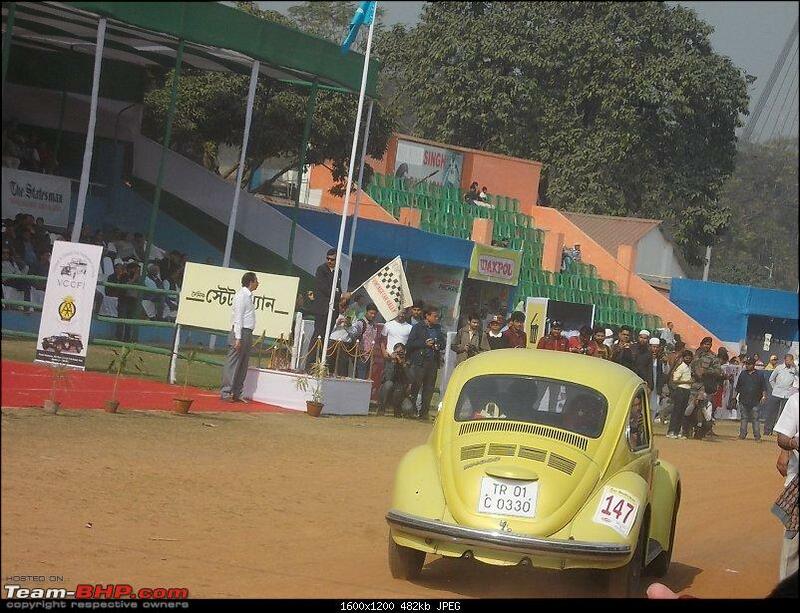 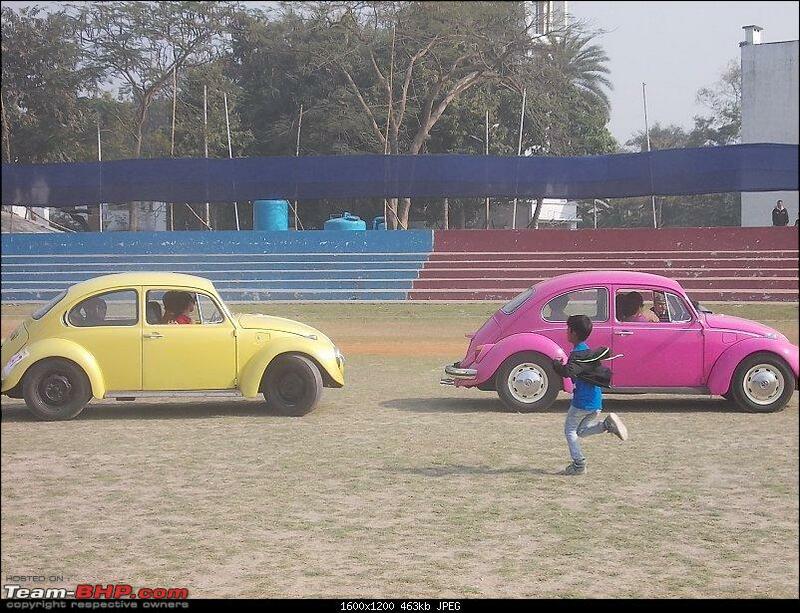 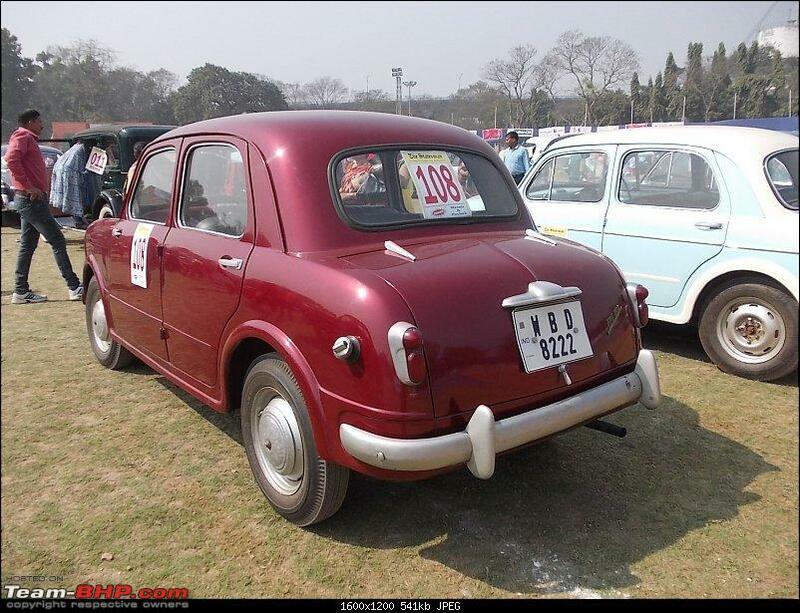 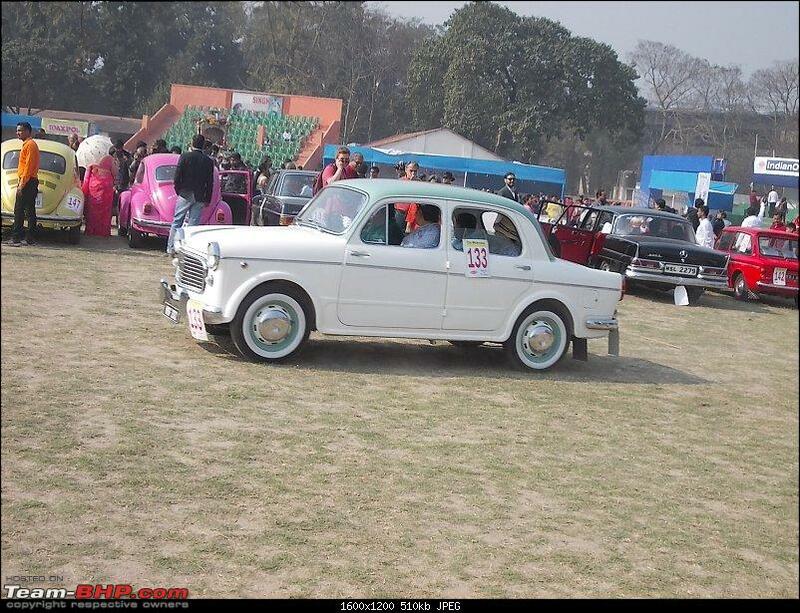 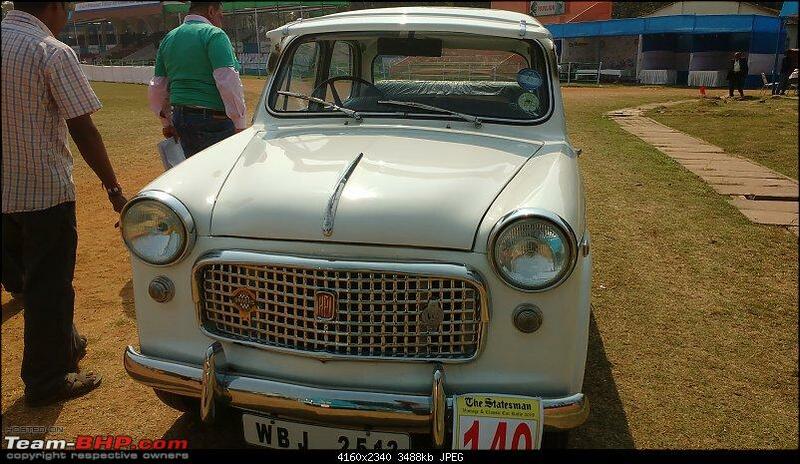 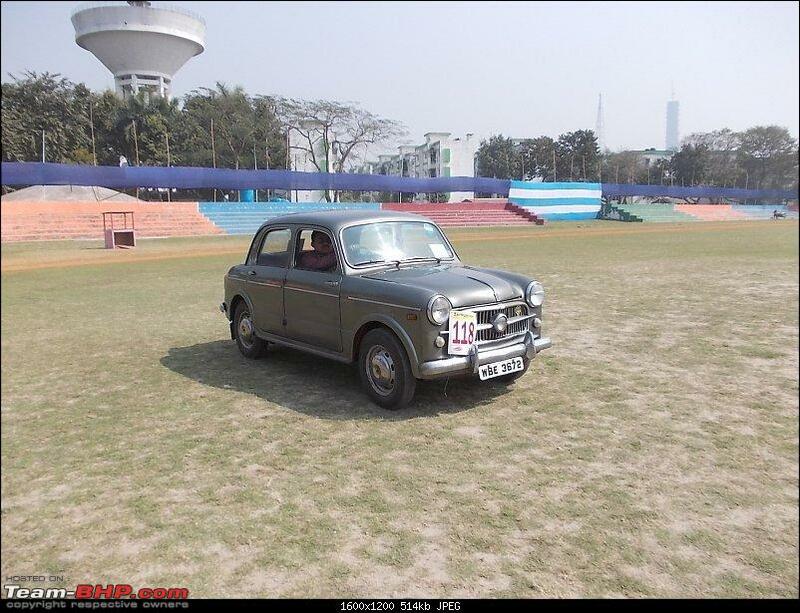 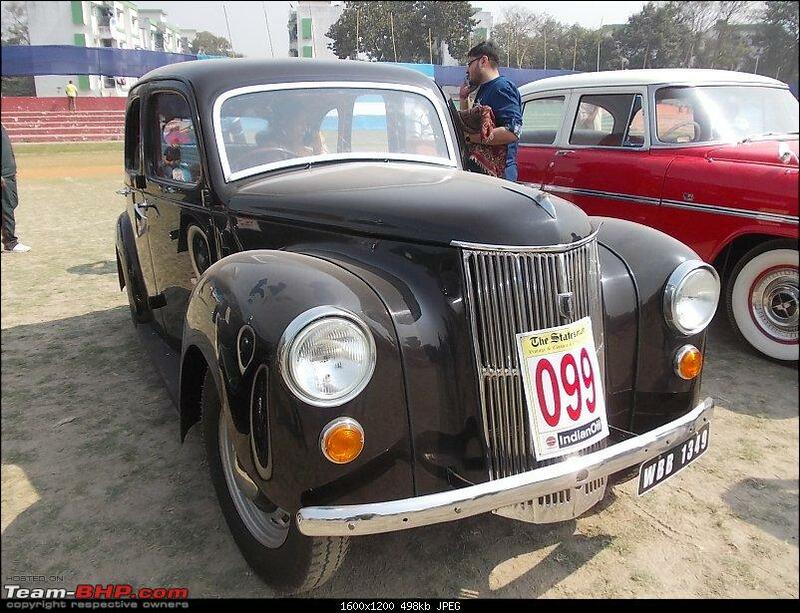 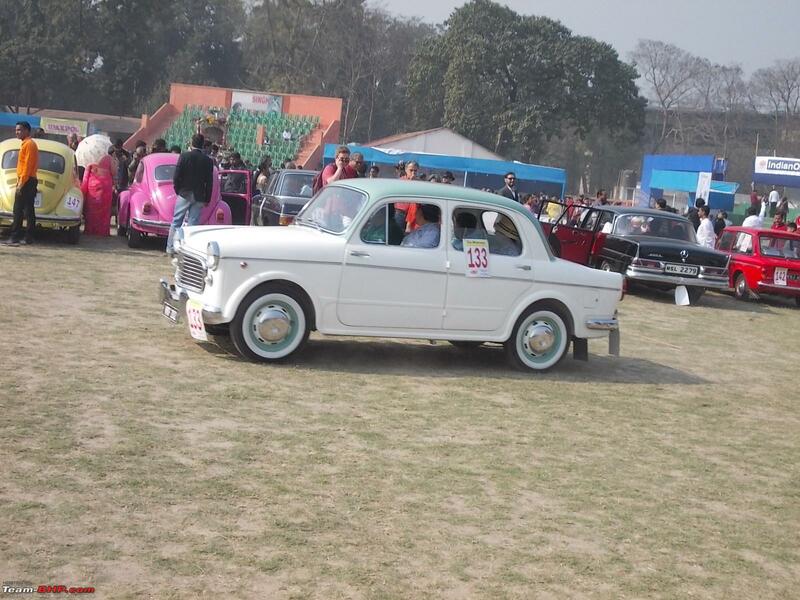 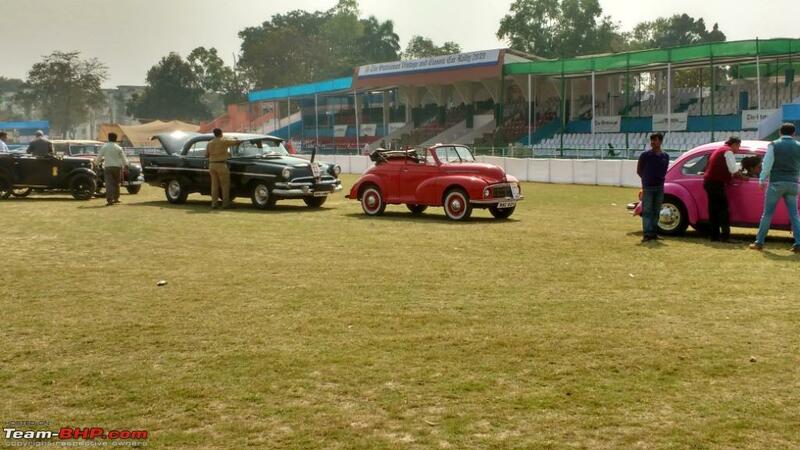 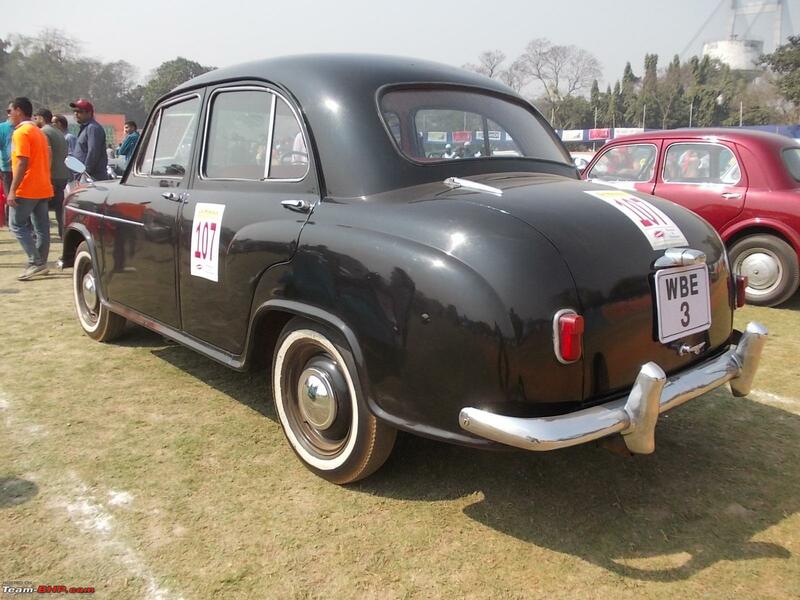 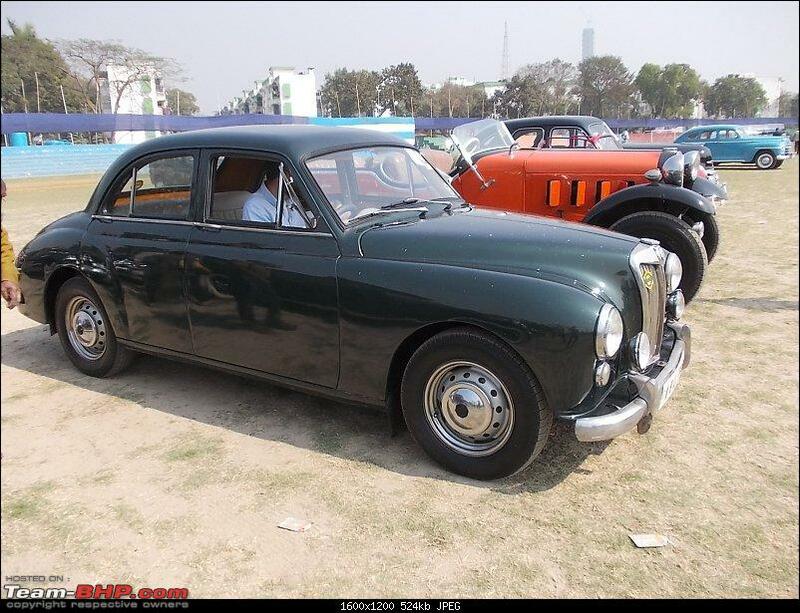 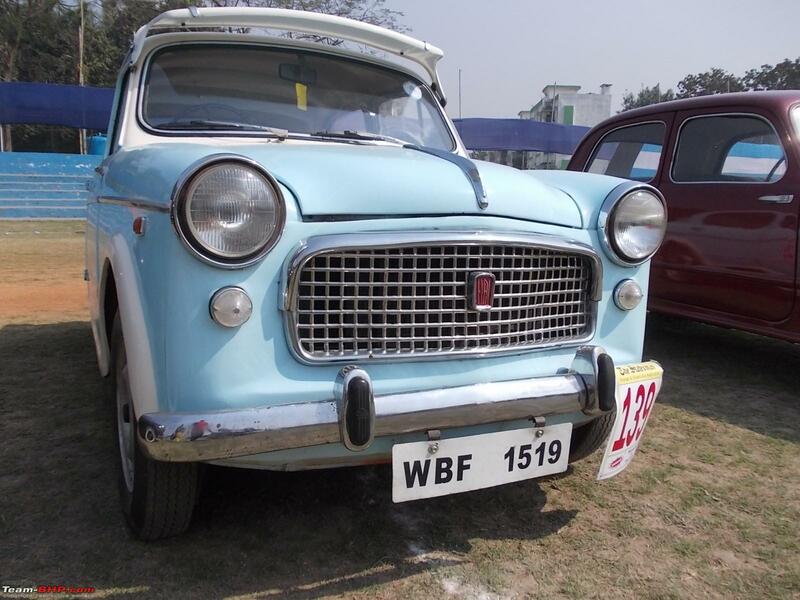 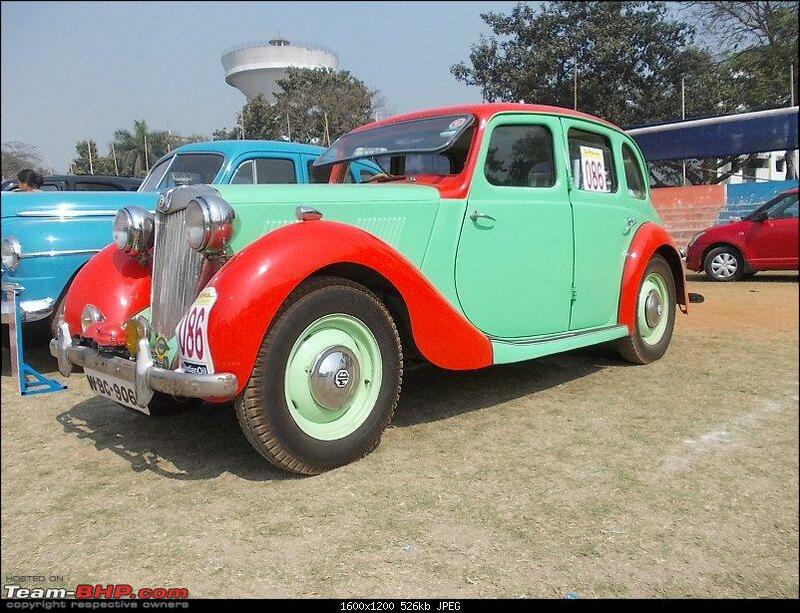 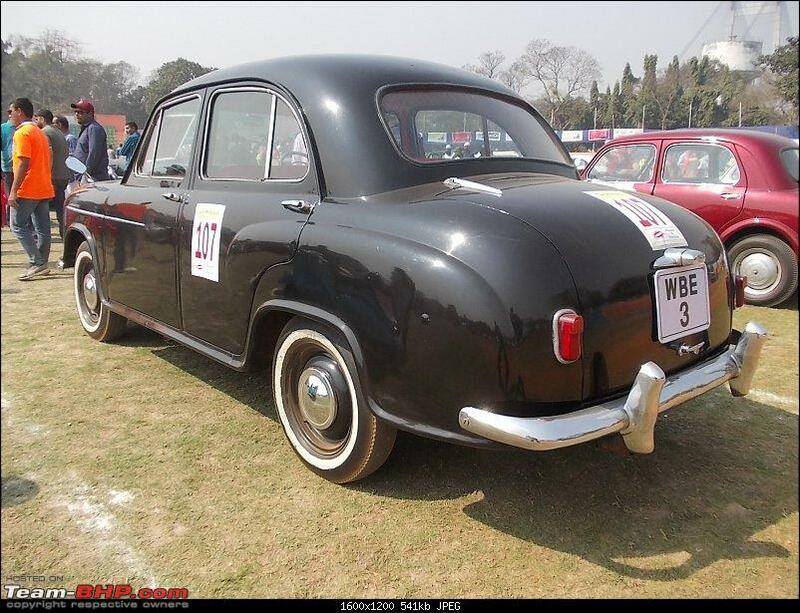 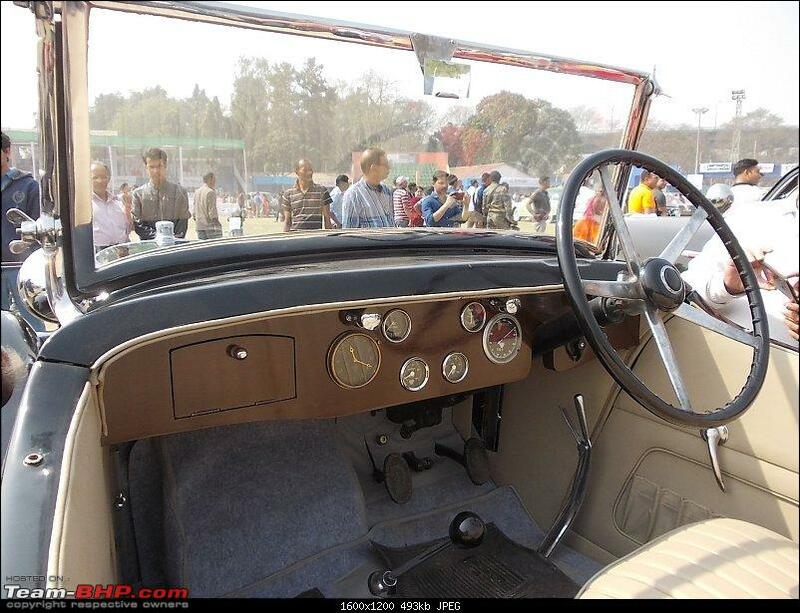 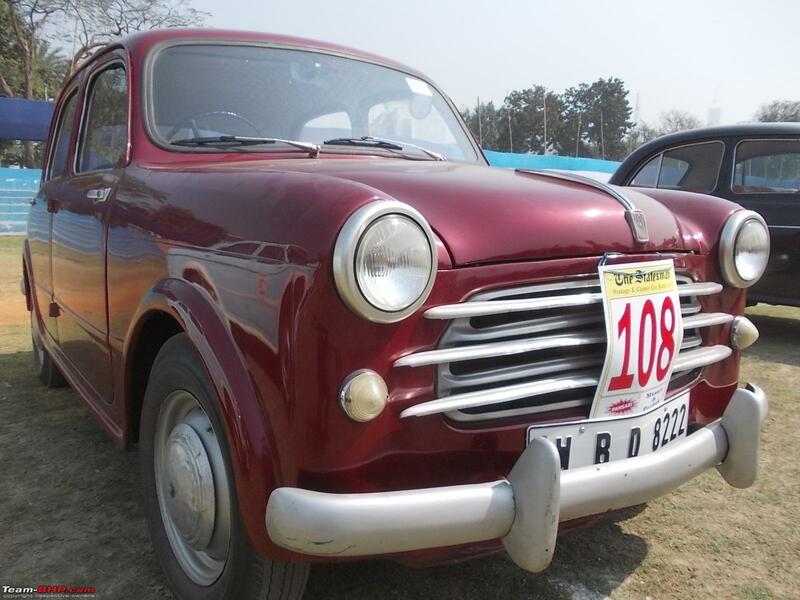 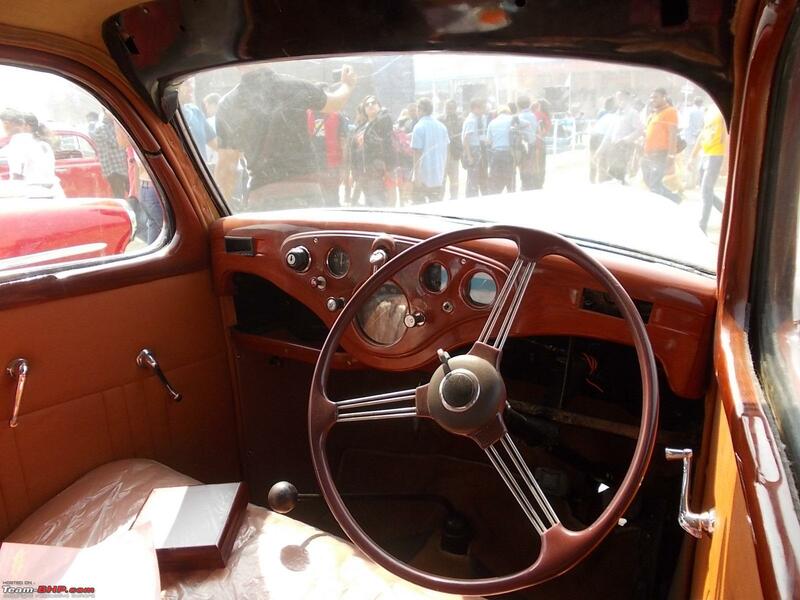 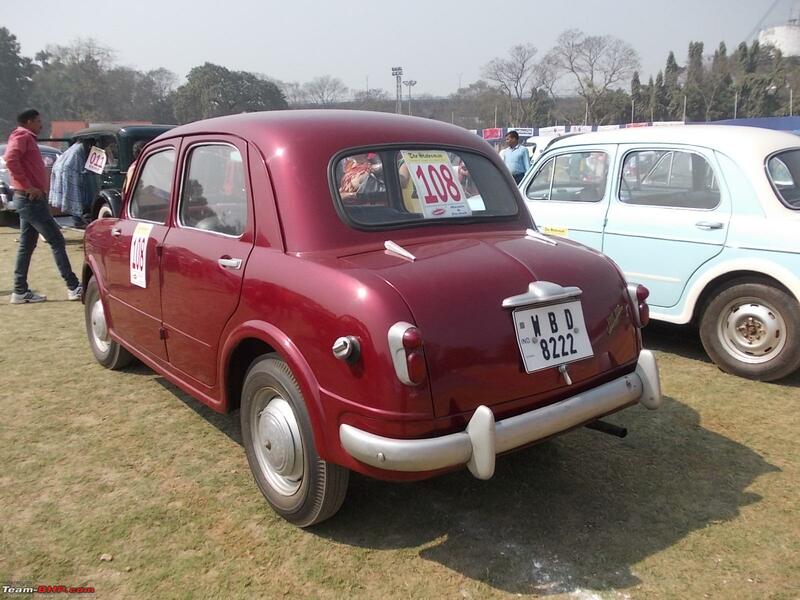 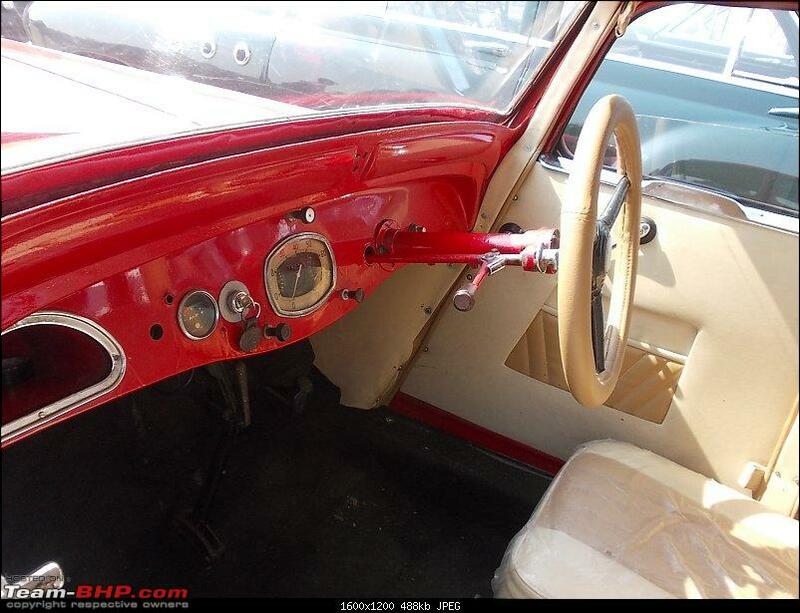 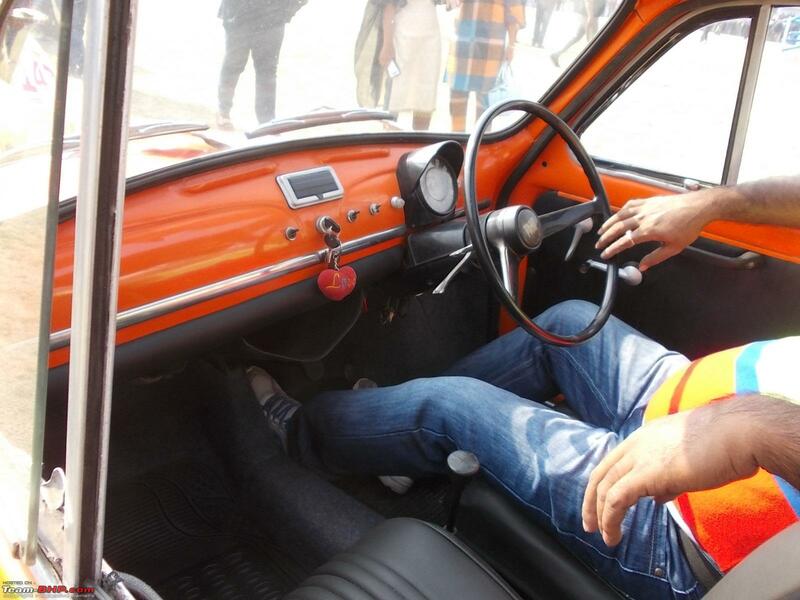 The irony then was that a 1947 Hindustan 10 would not be allowed entry, while a 1965 Standard Herald could make it. 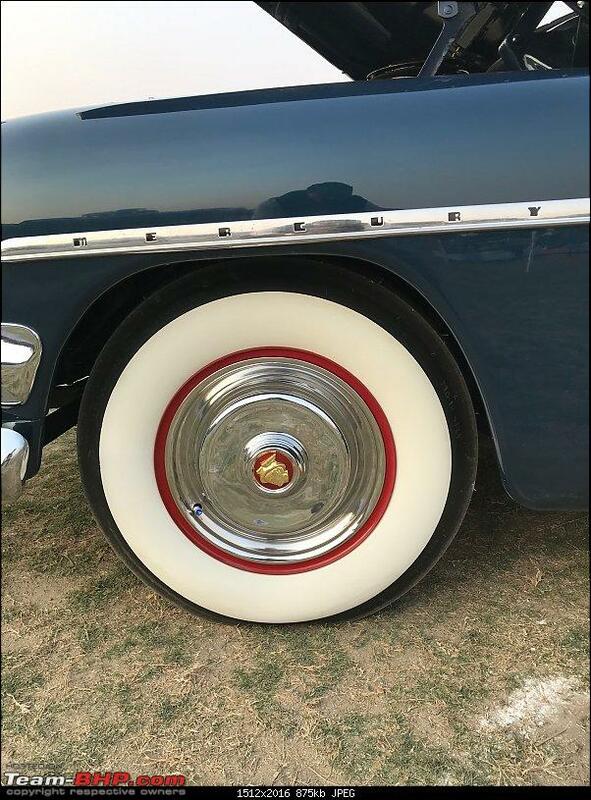 That era is all over now. 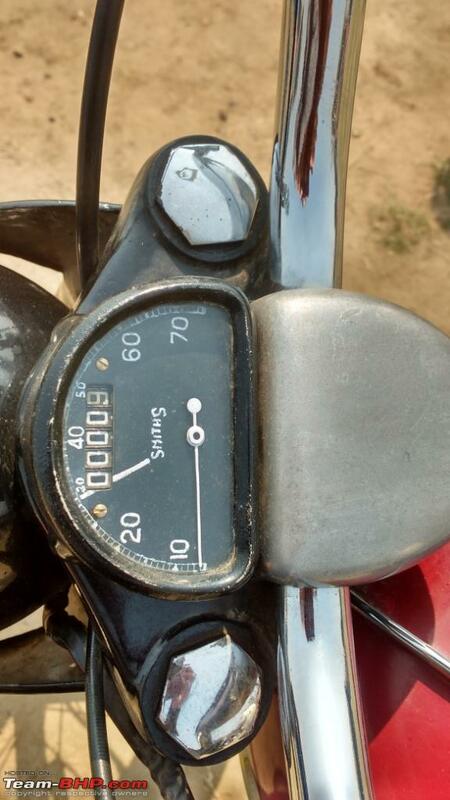 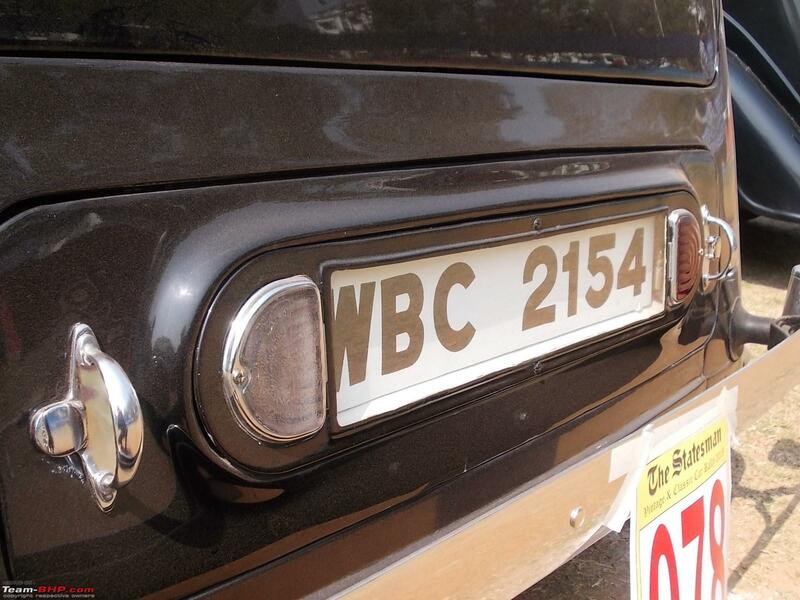 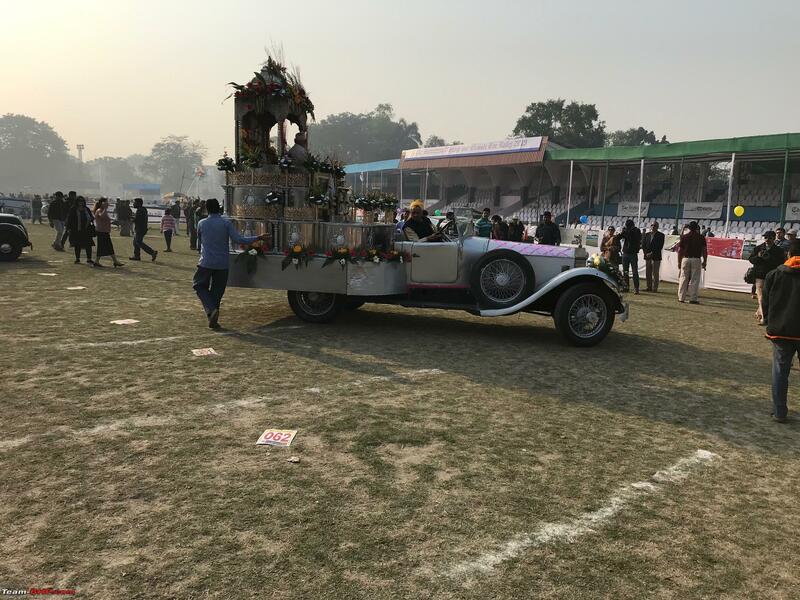 The judgement day was on 2nd February 2019, while the Rally got flagged off from 9.00 a.m. onwards on Sunday 3rd February, 2019. 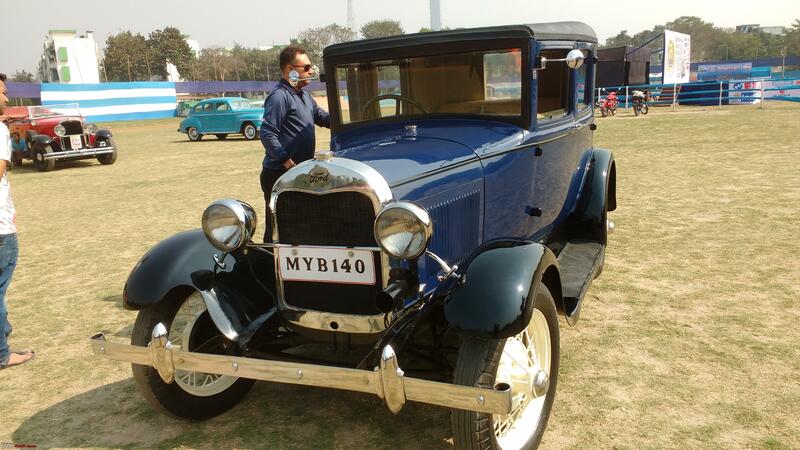 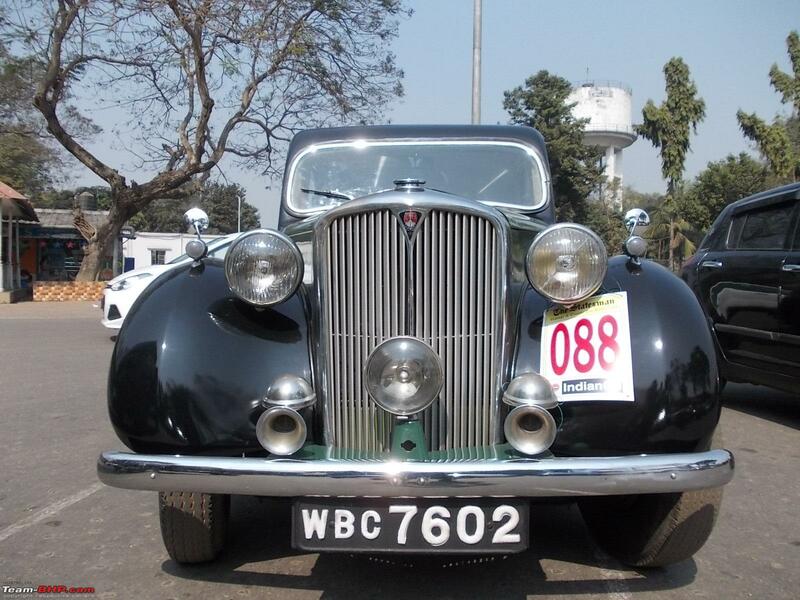 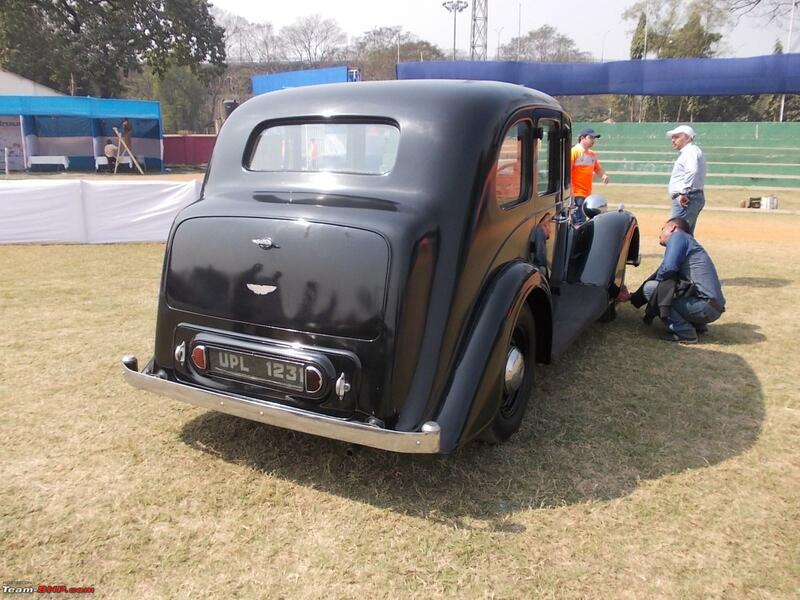 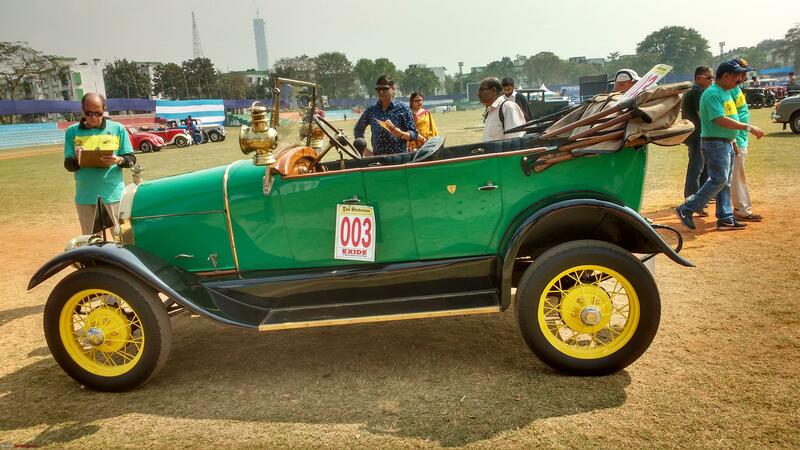 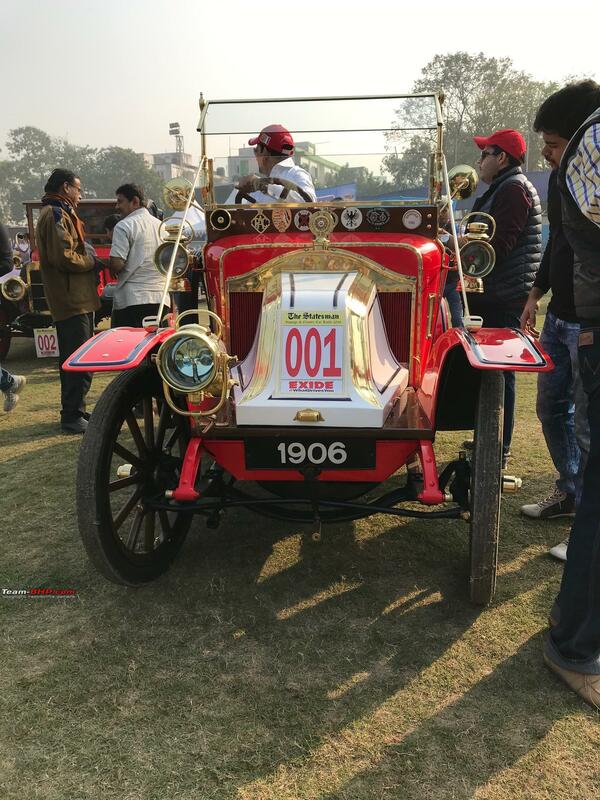 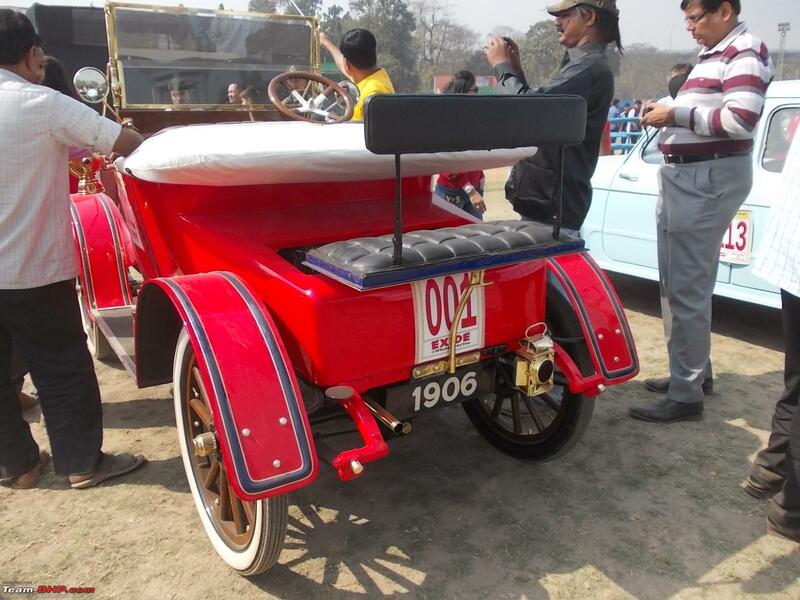 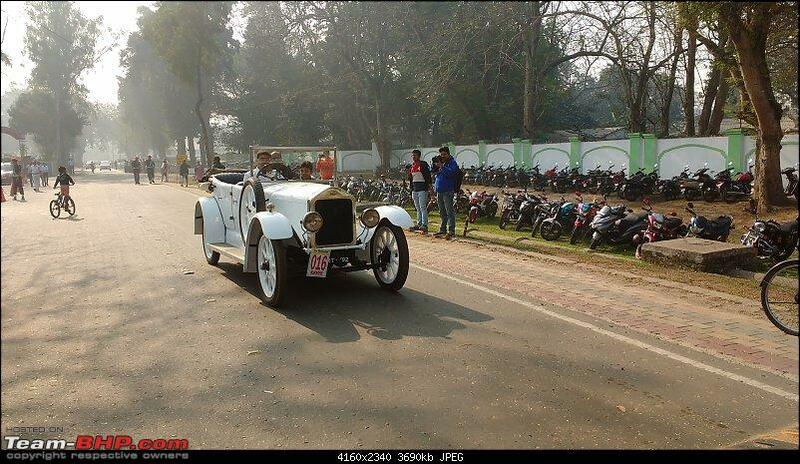 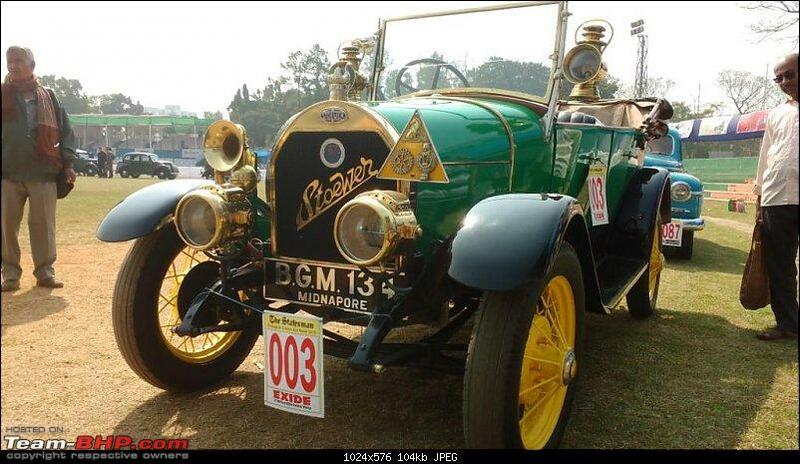 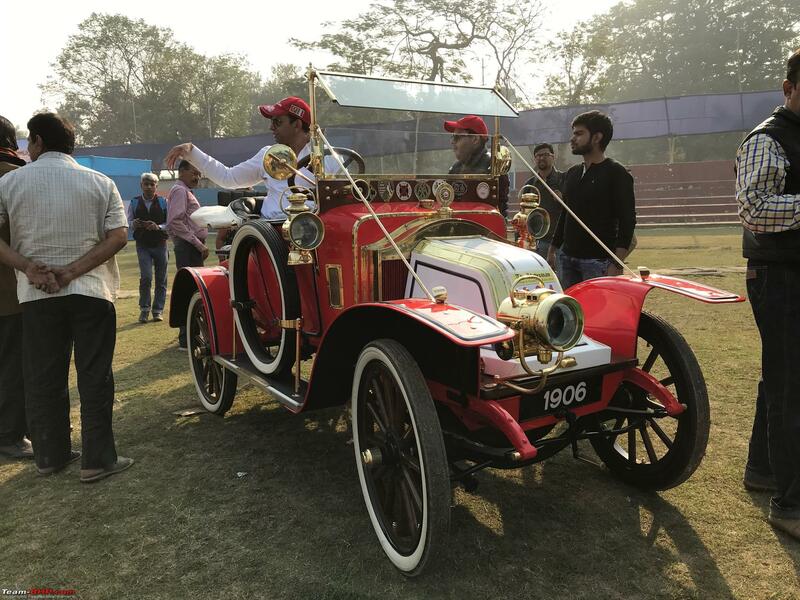 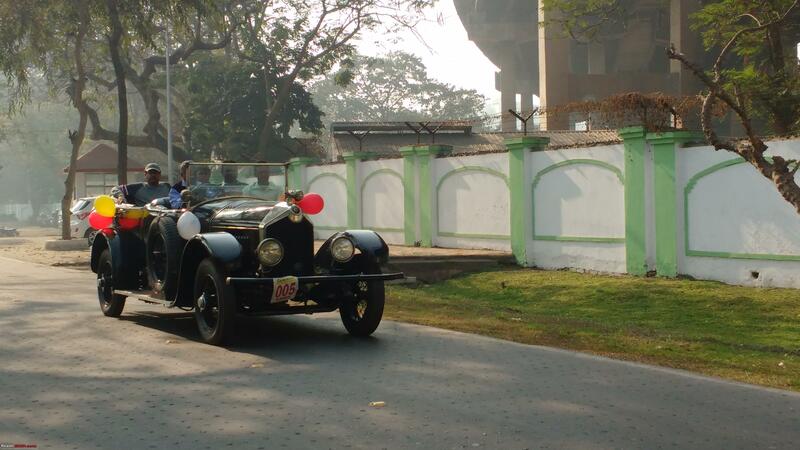 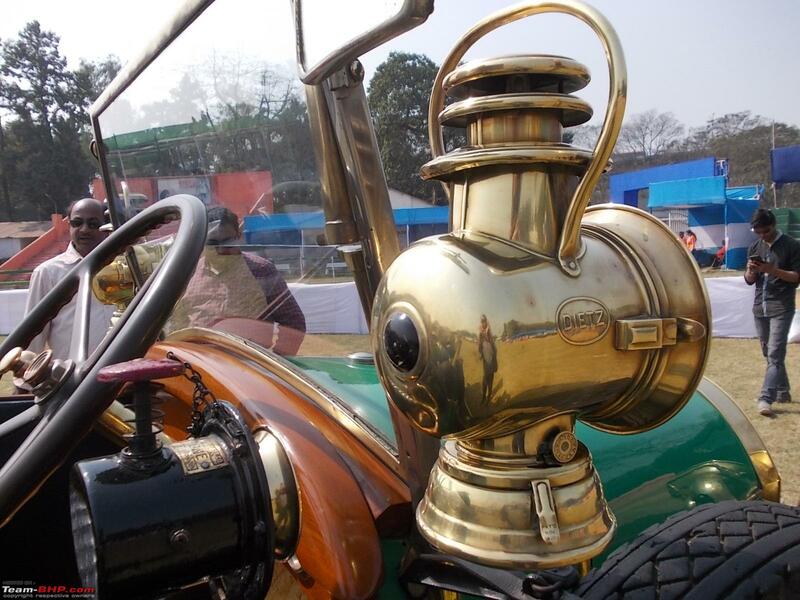 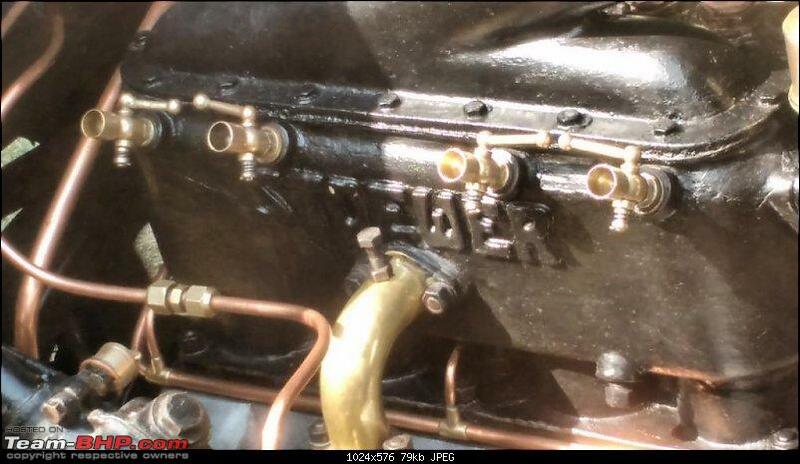 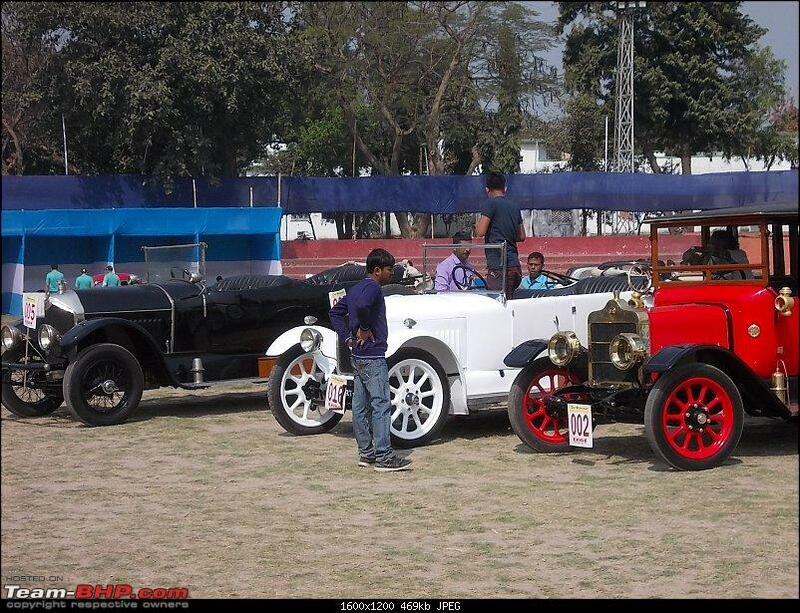 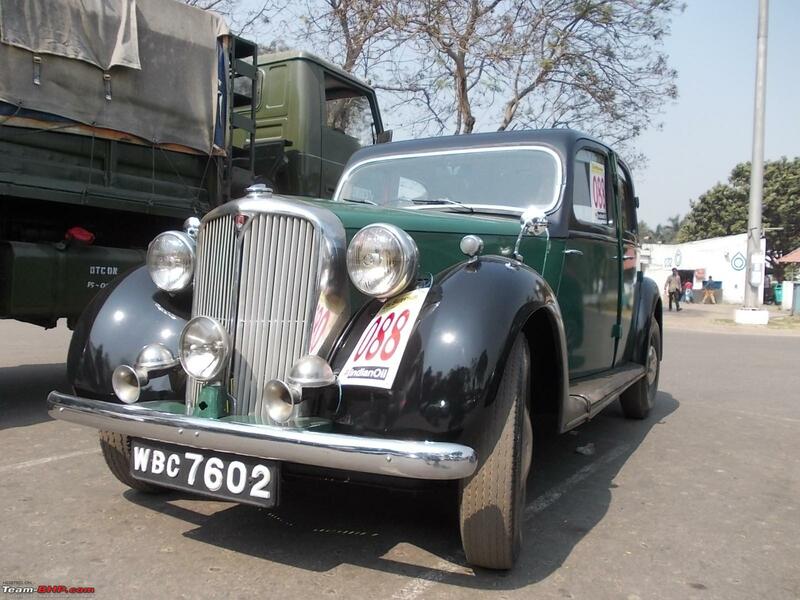 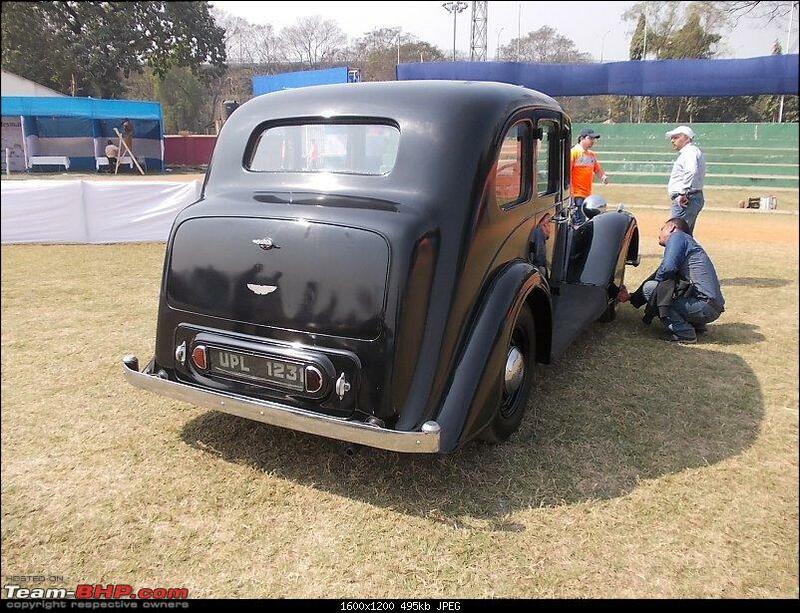 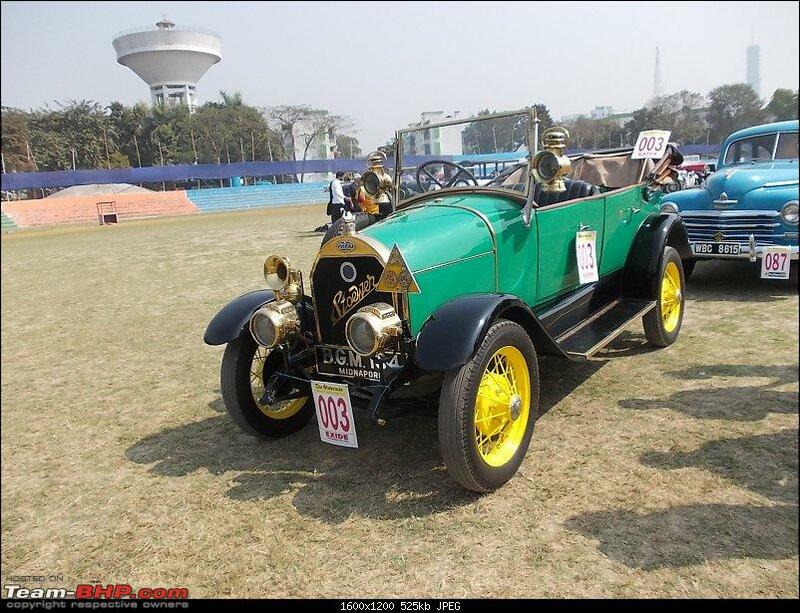 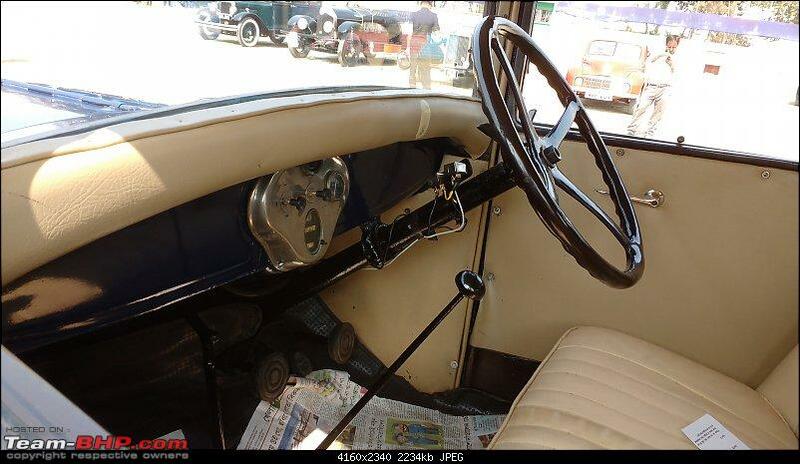 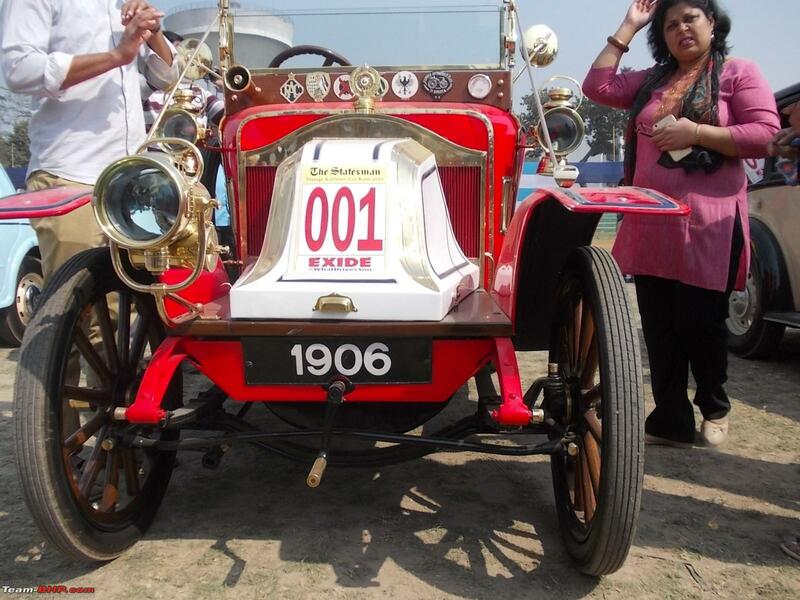 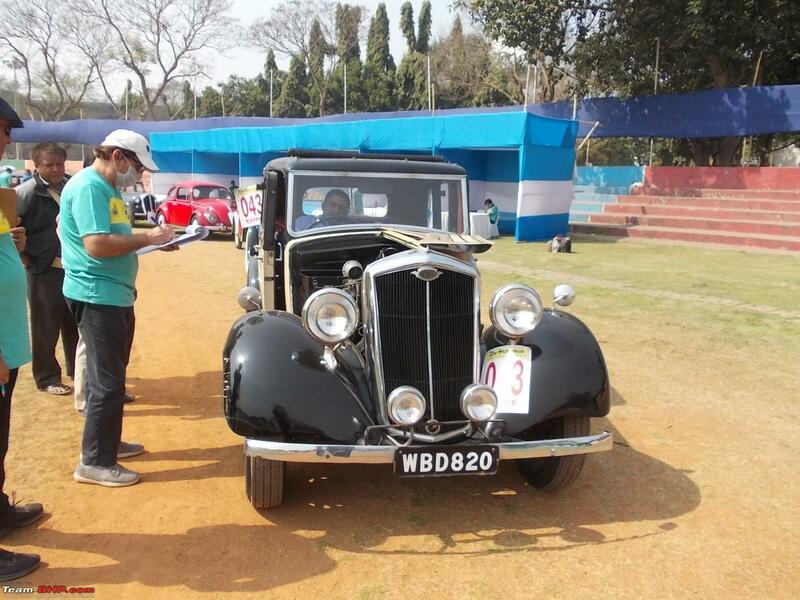 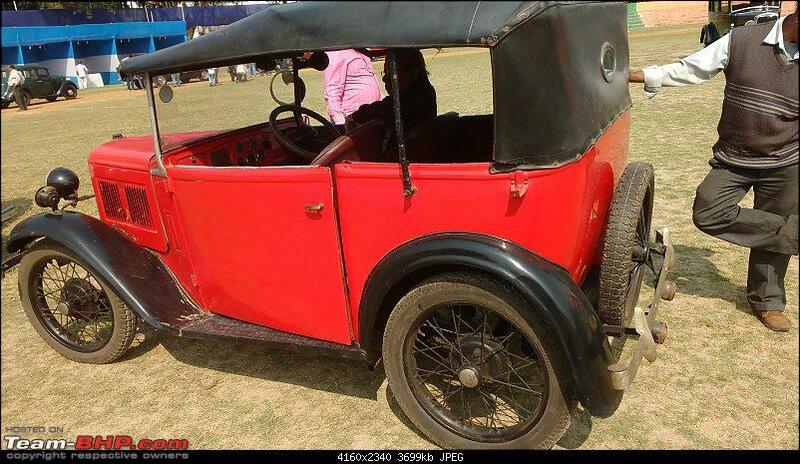 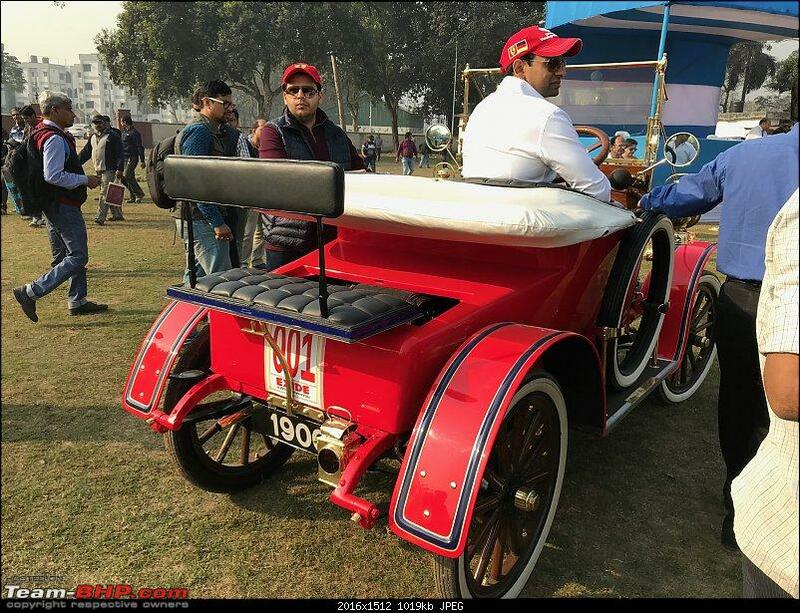 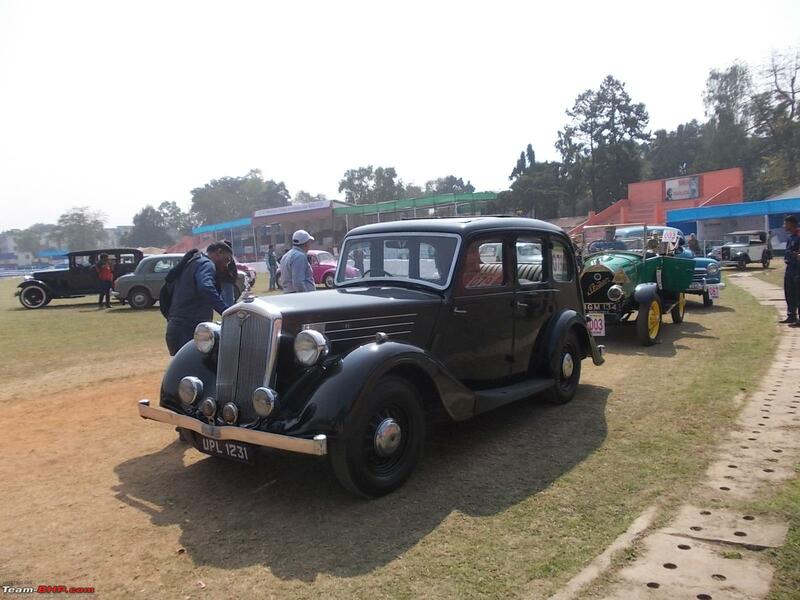 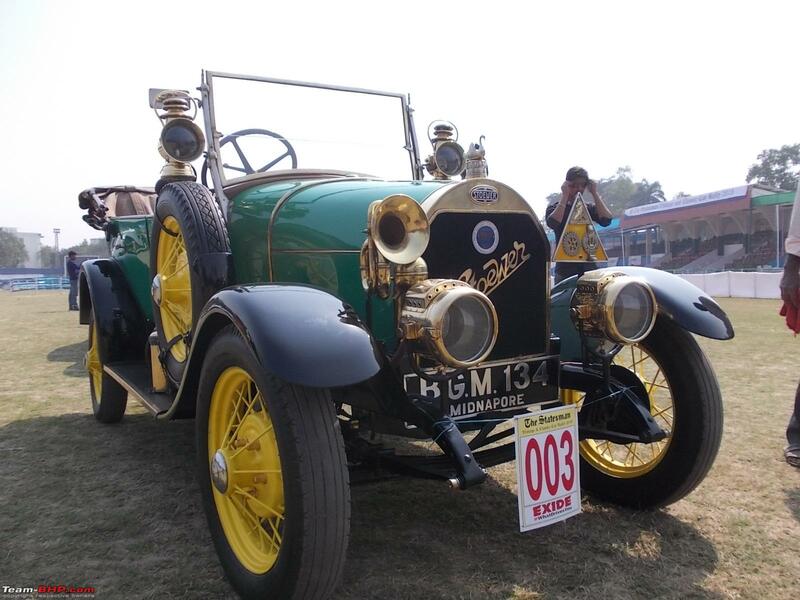 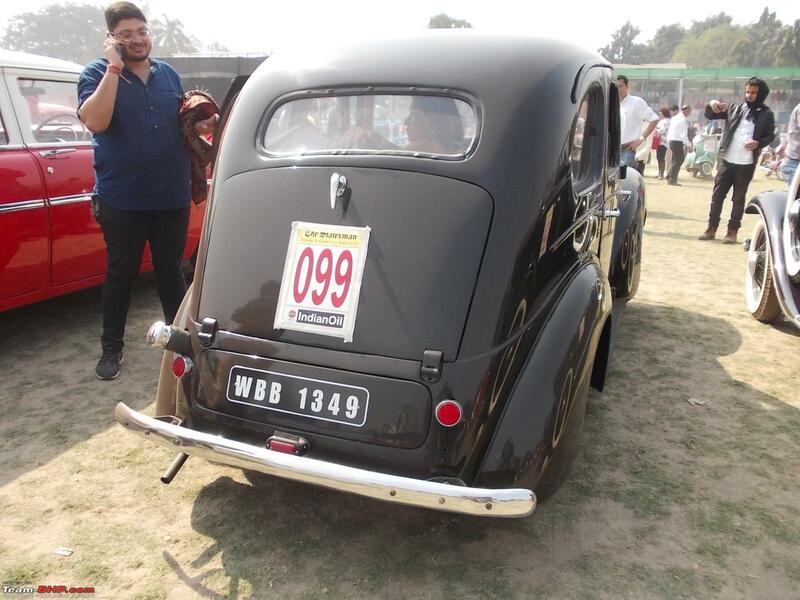 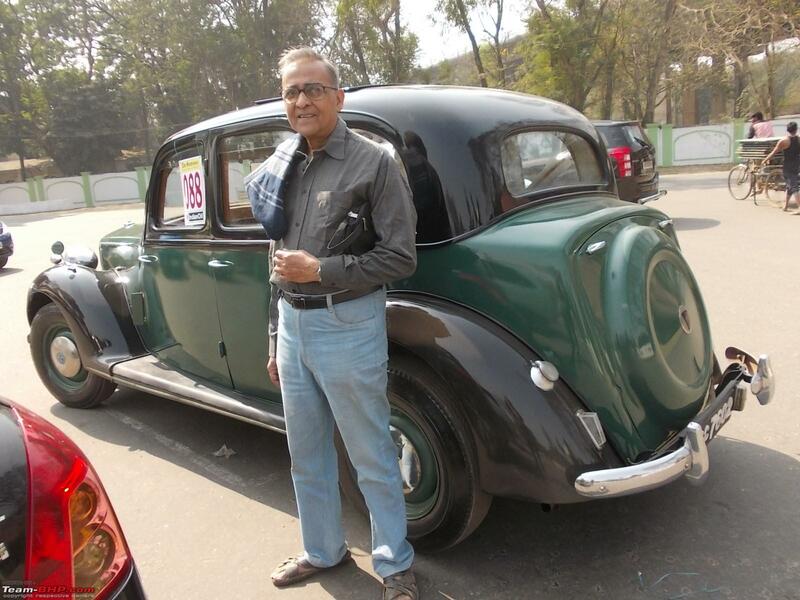 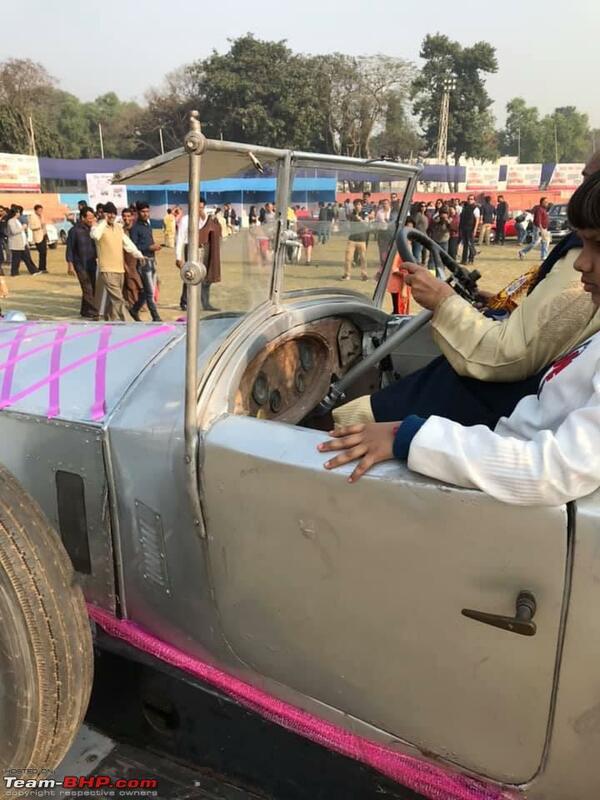 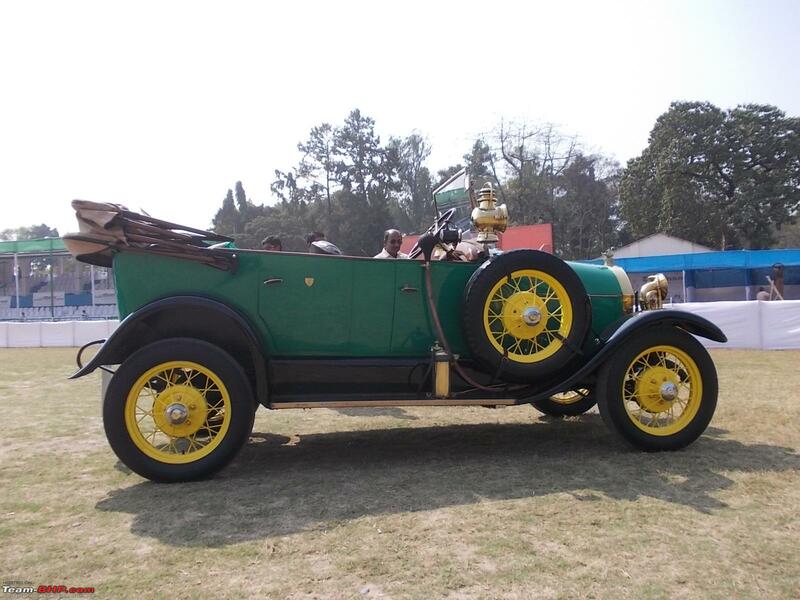 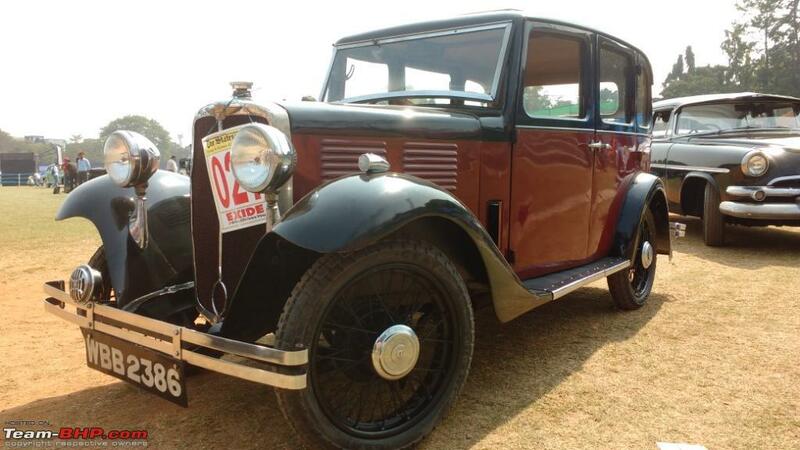 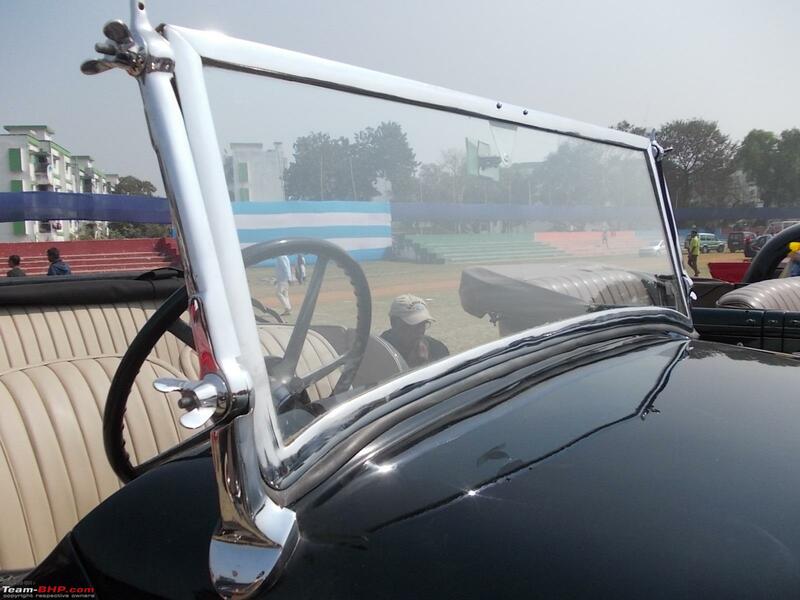 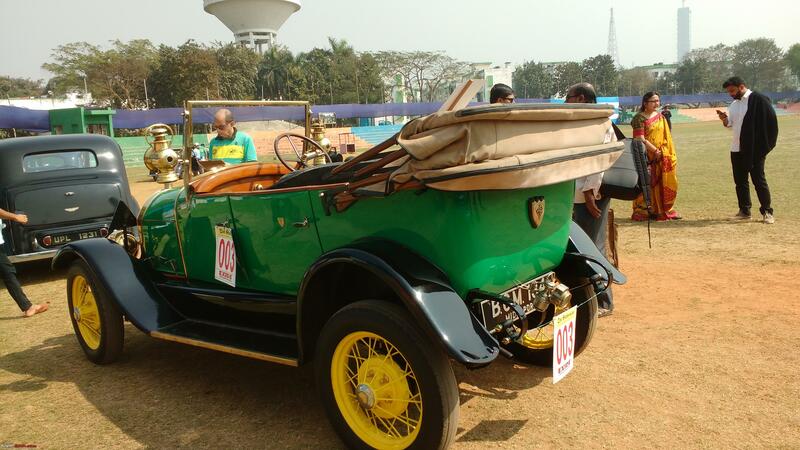 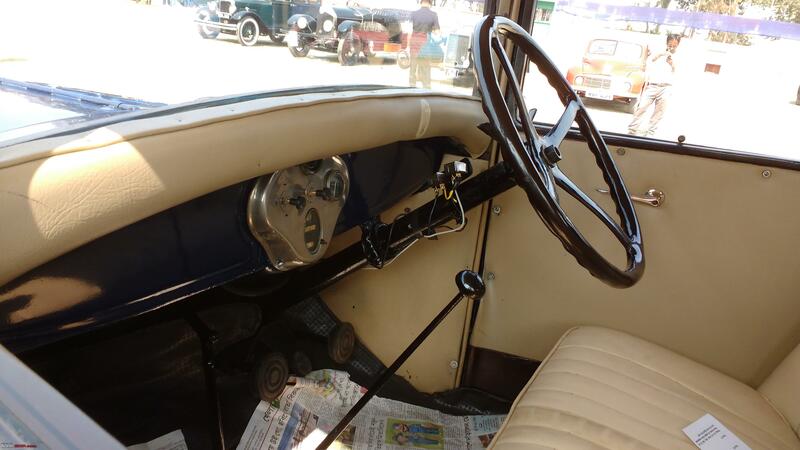 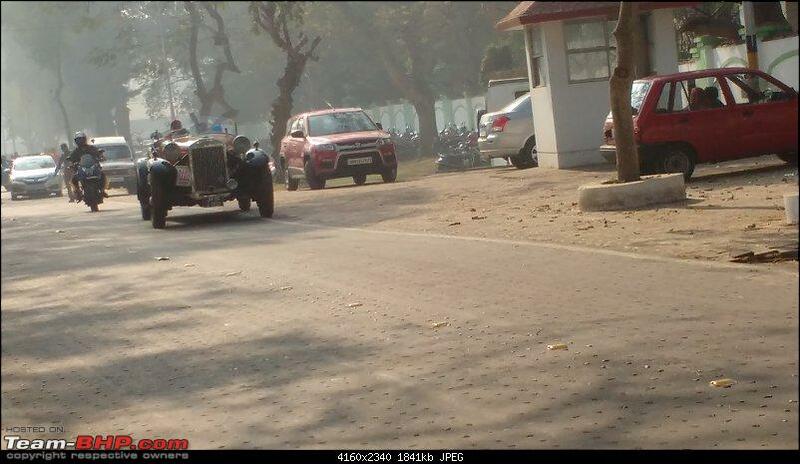 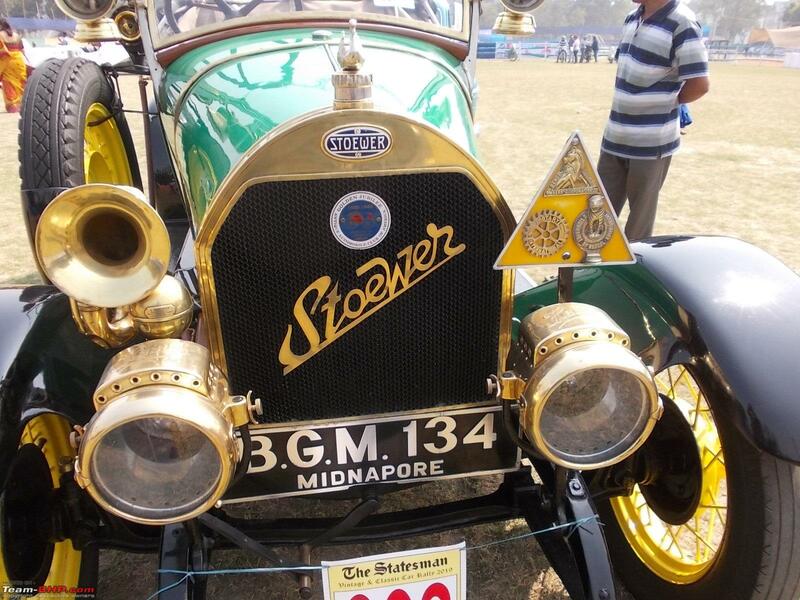 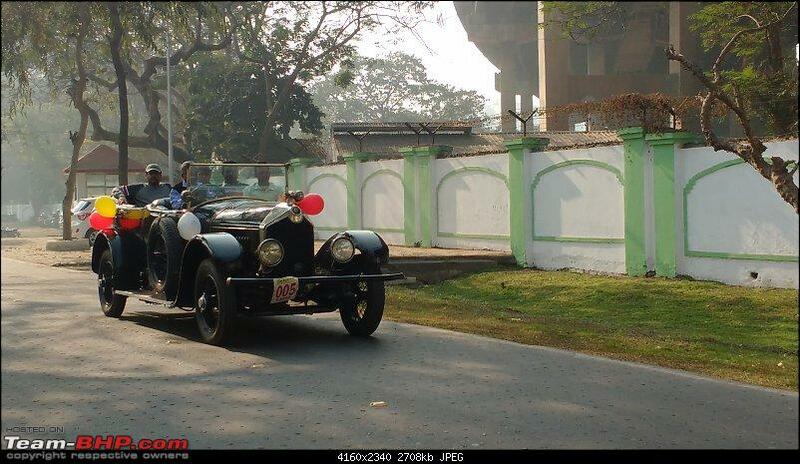 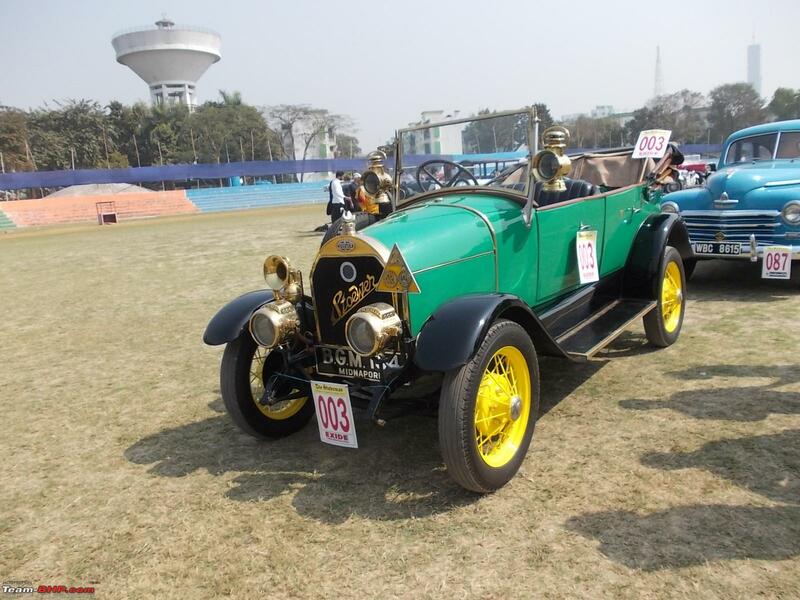 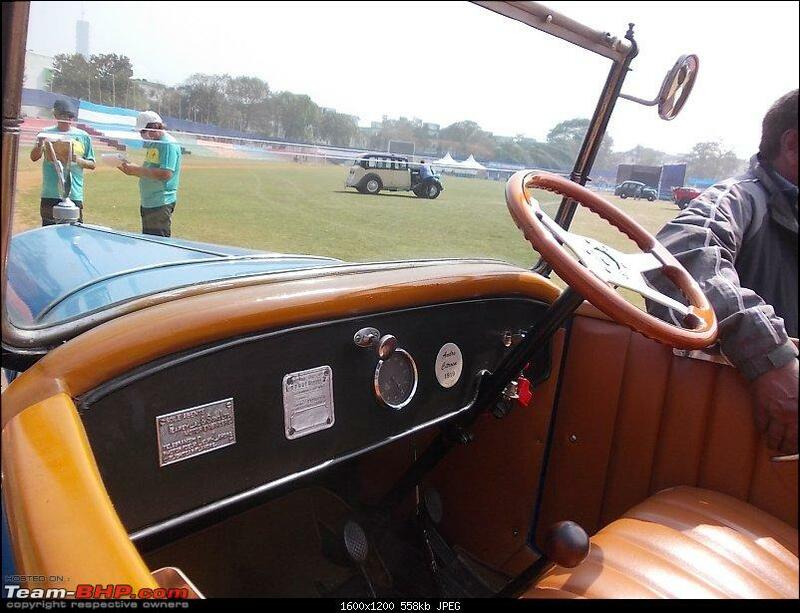 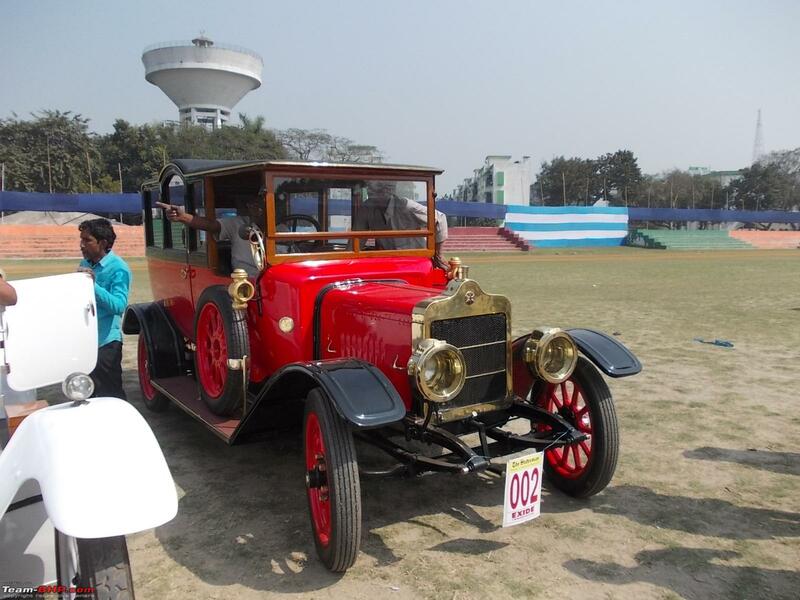 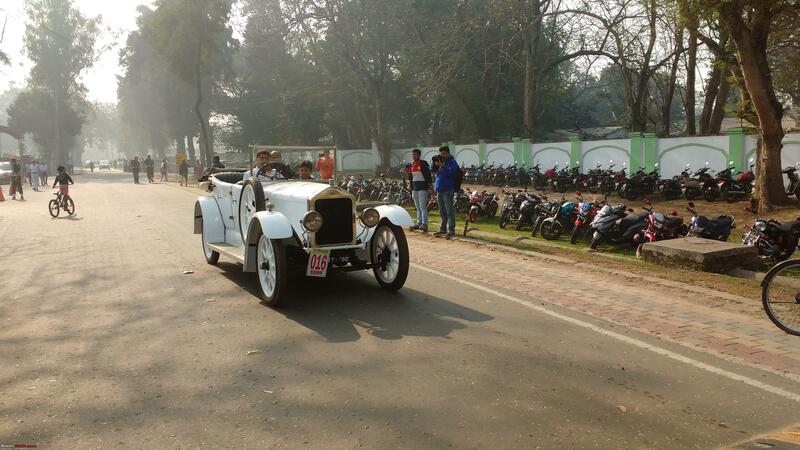 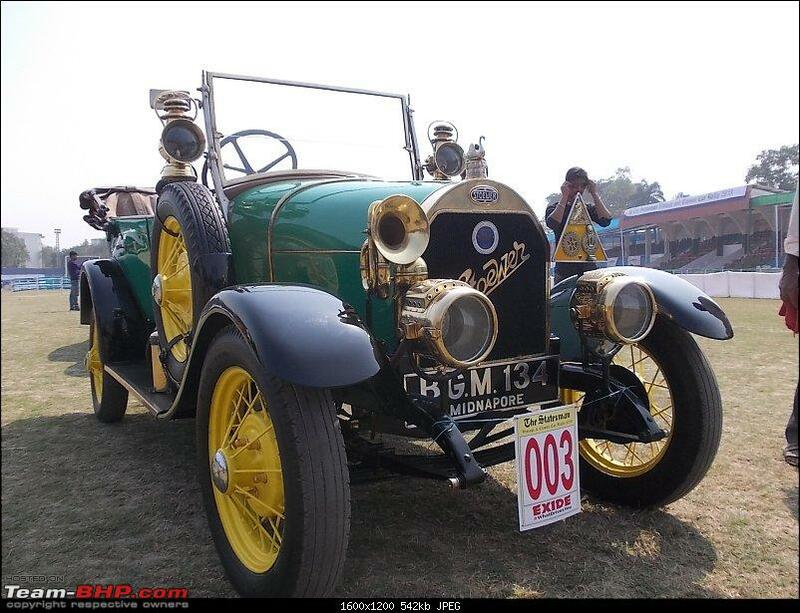 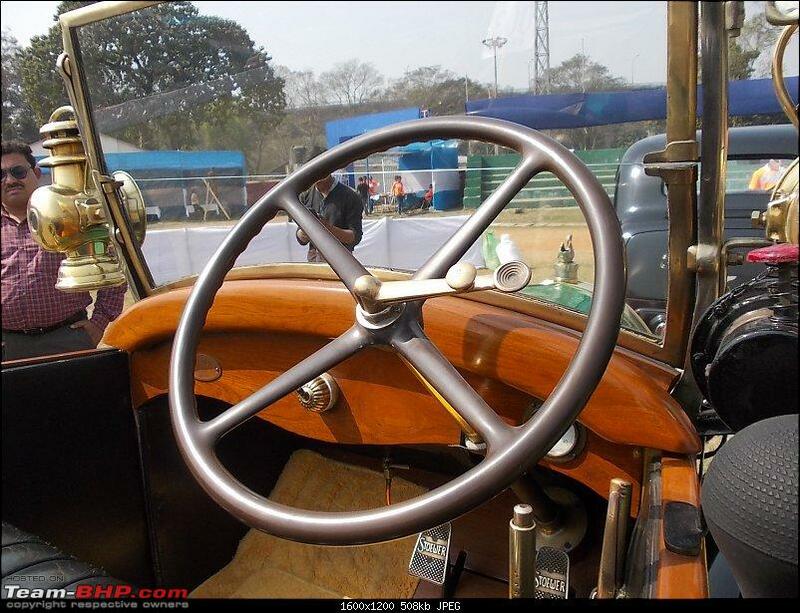 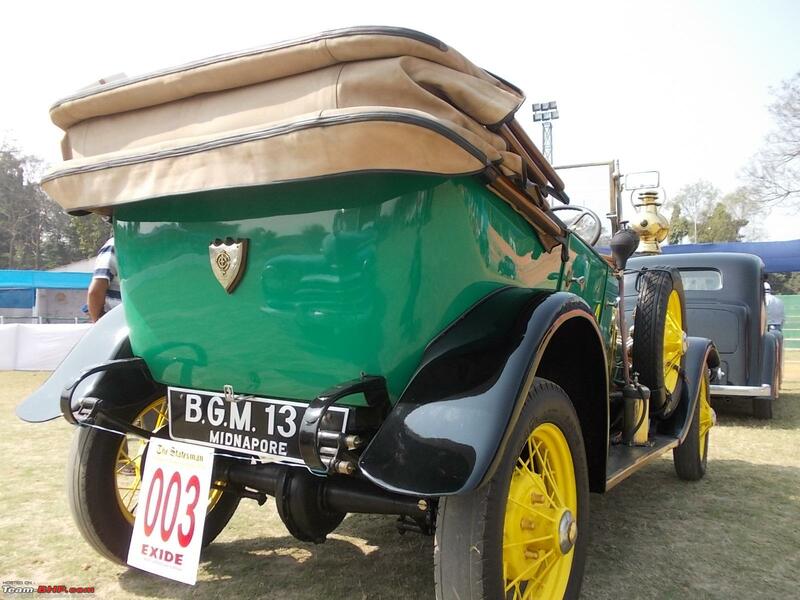 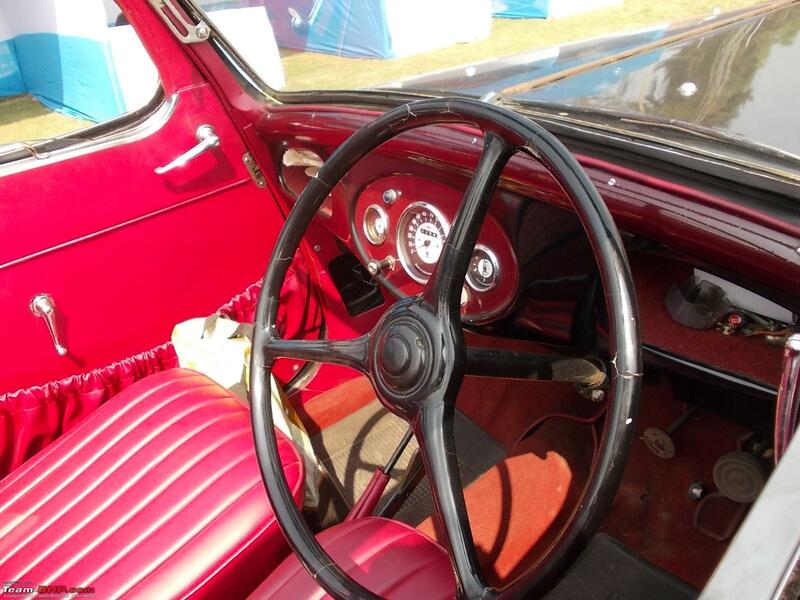 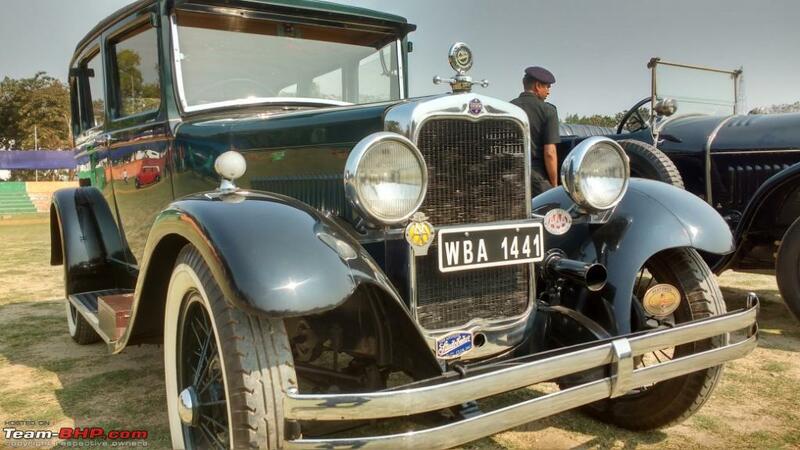 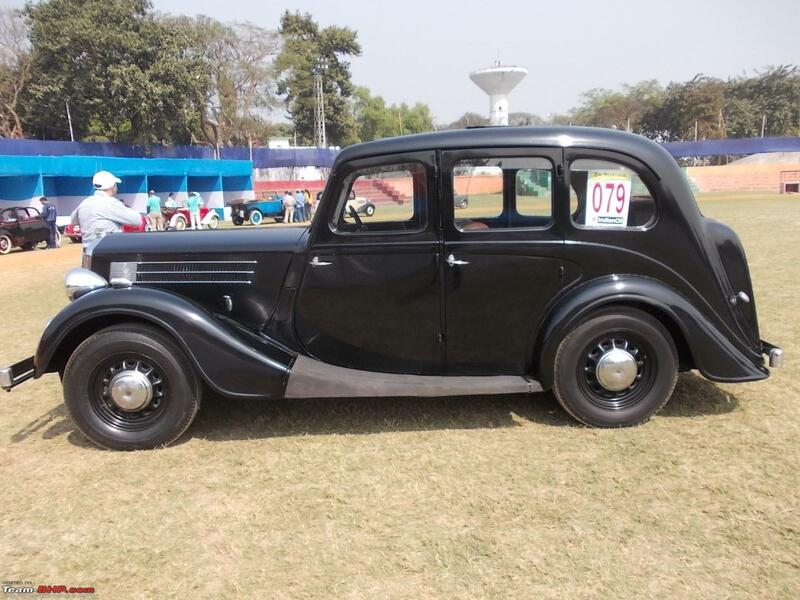 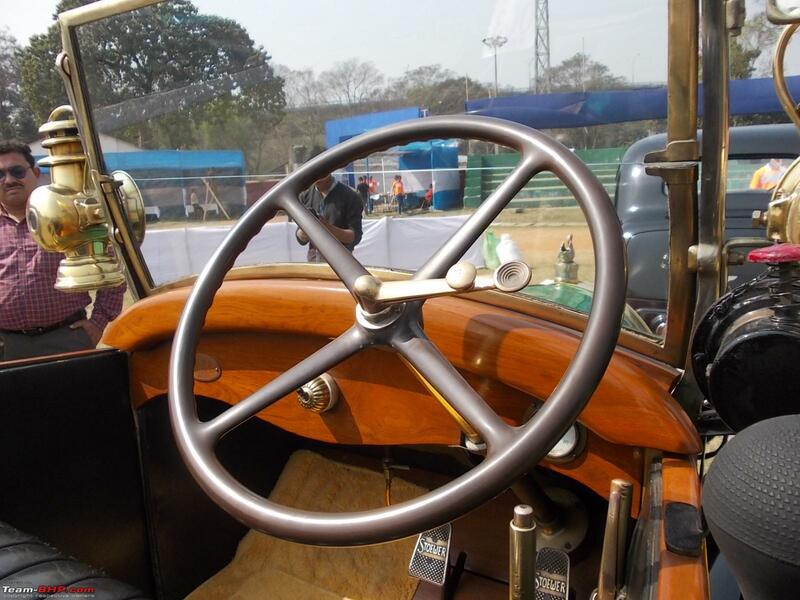 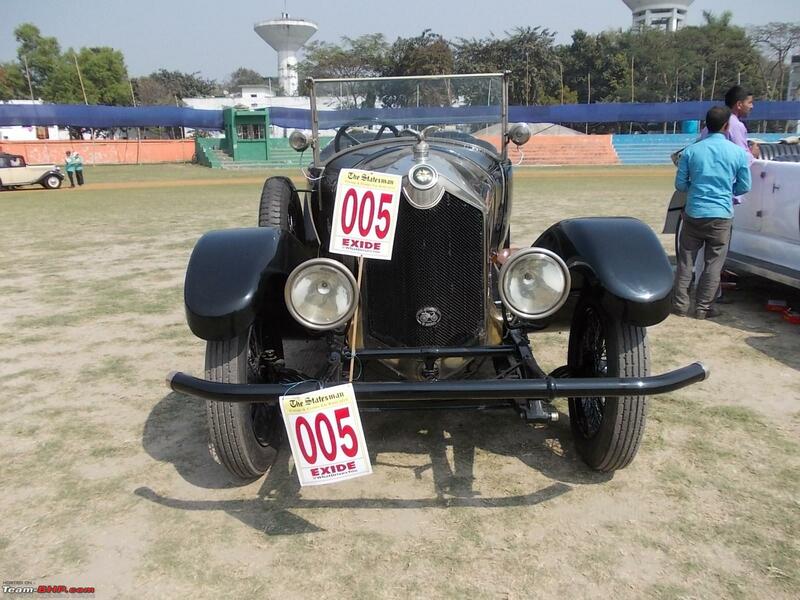 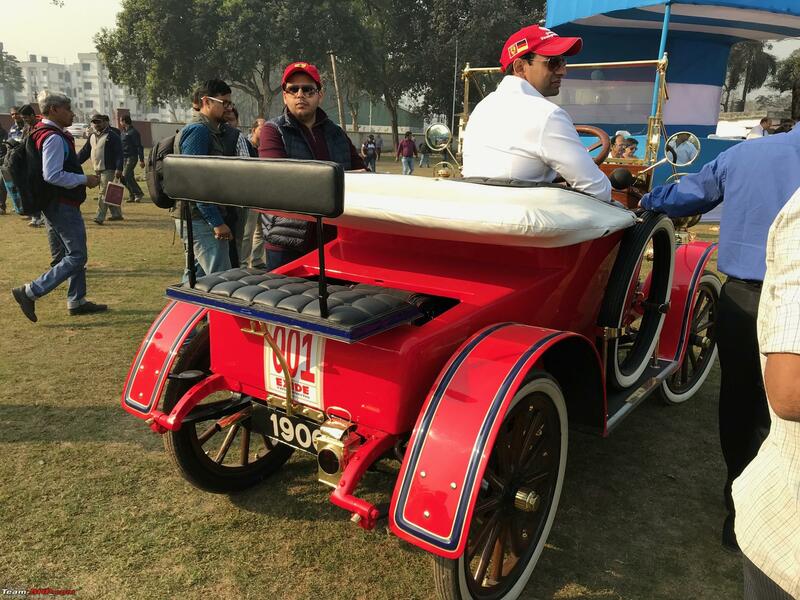 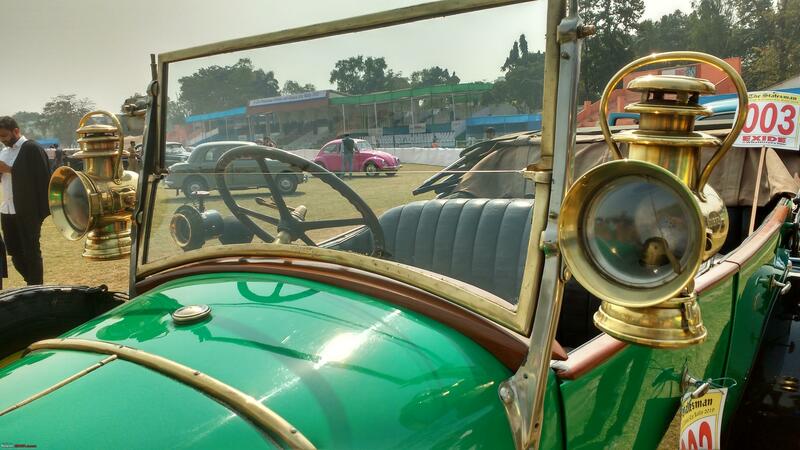 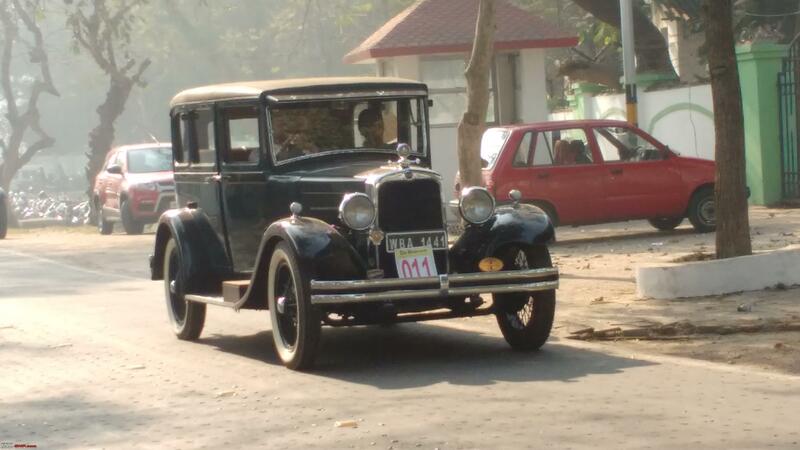 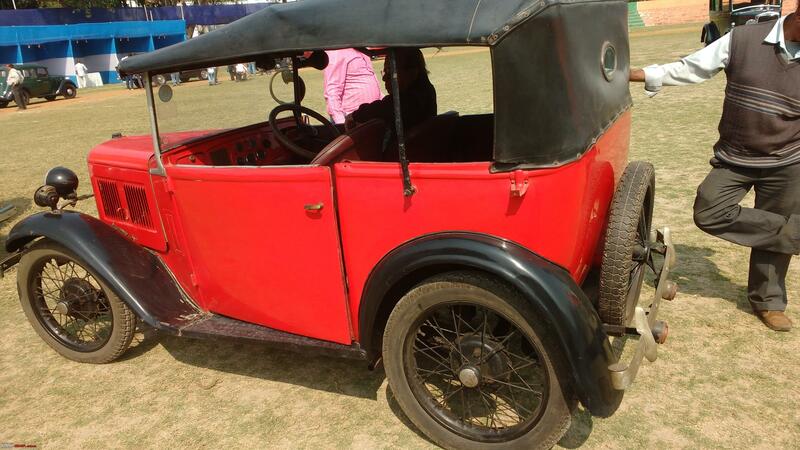 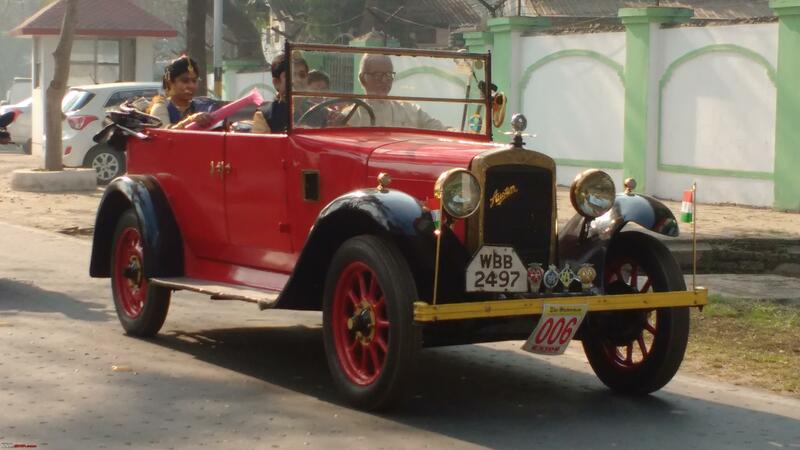 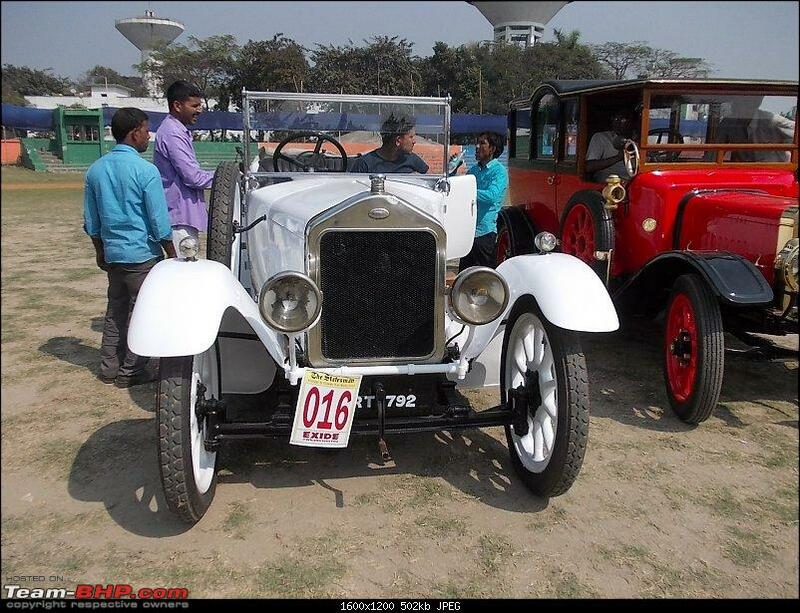 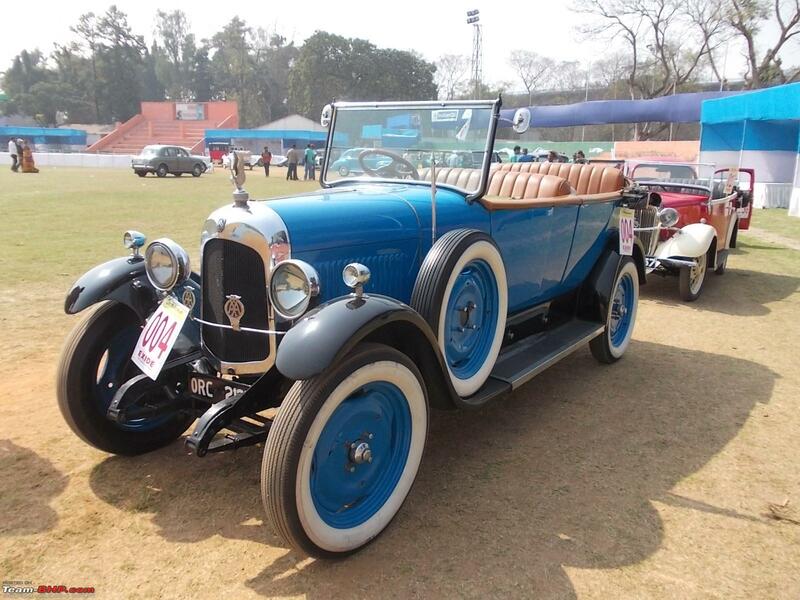 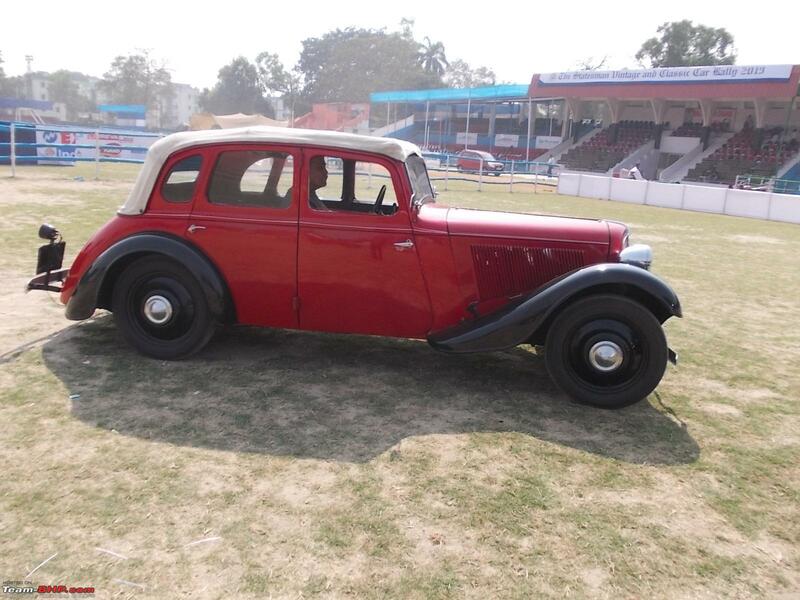 The first car to arrive after completing the route was the car # 2 a 1912 Standard Coventry (featured in the first picture) belonging to Mr Pramod Kumar Mittal. 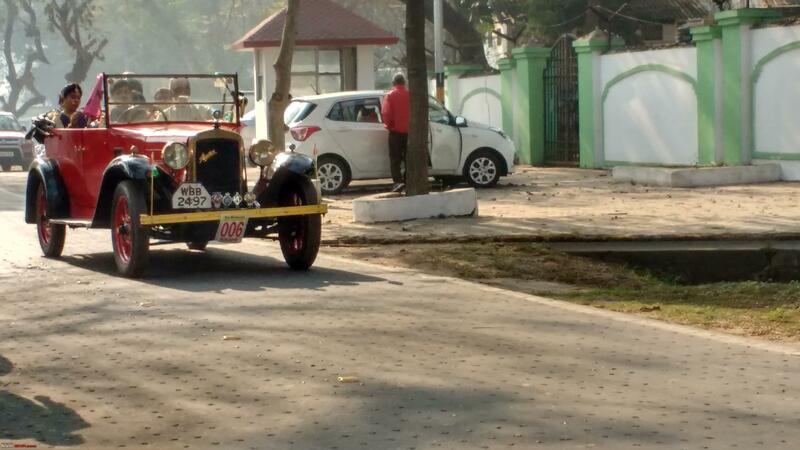 The car was back within 59 minutes flat. 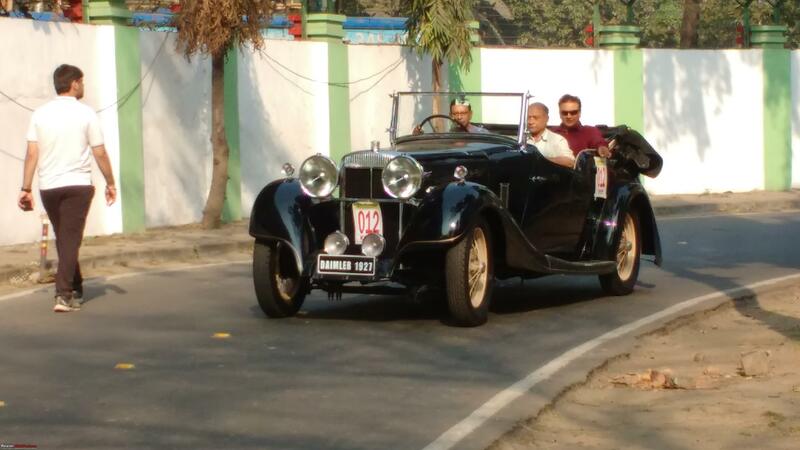 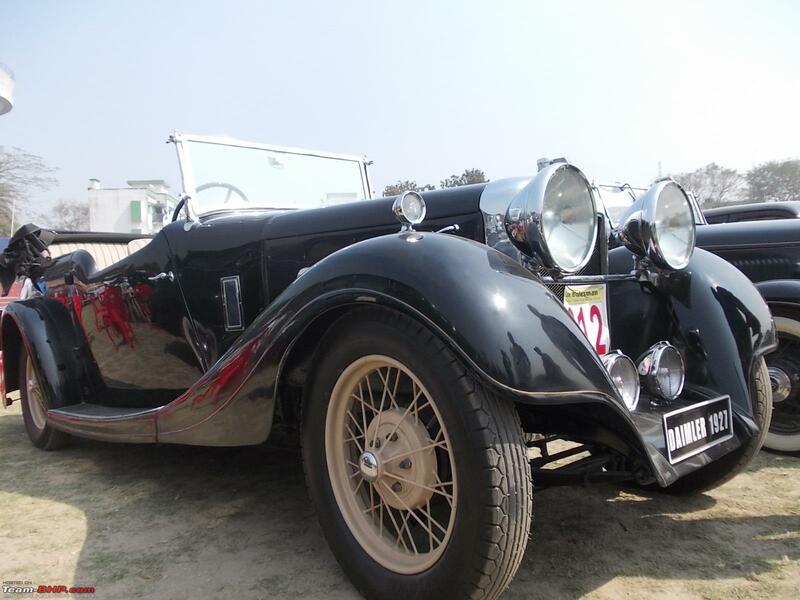 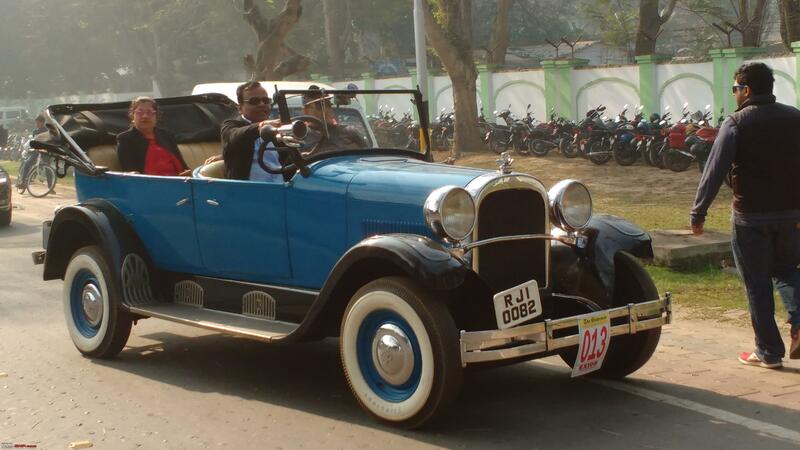 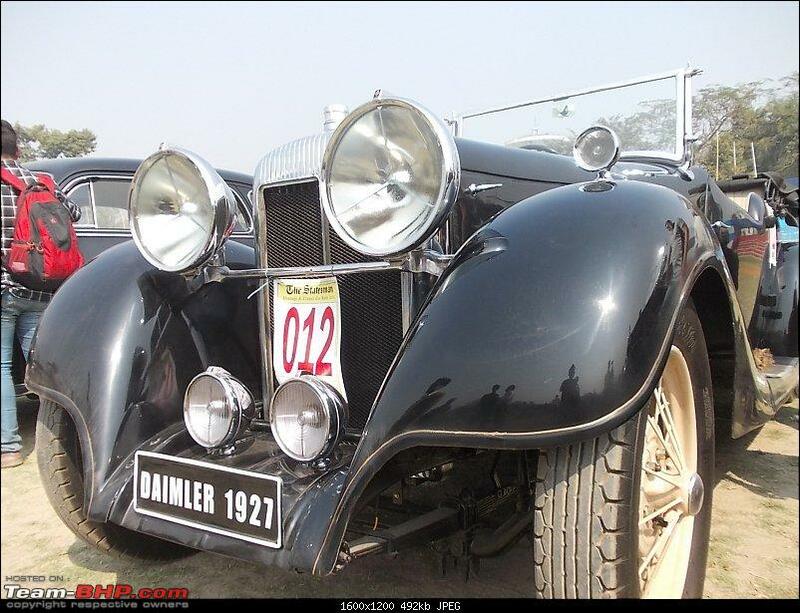 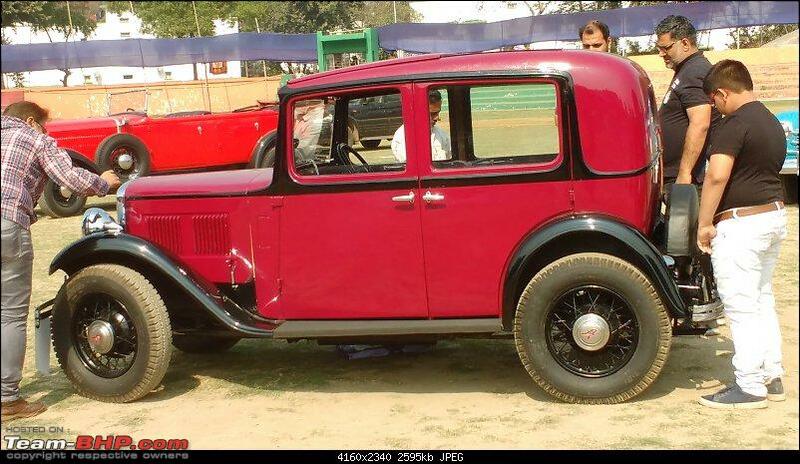 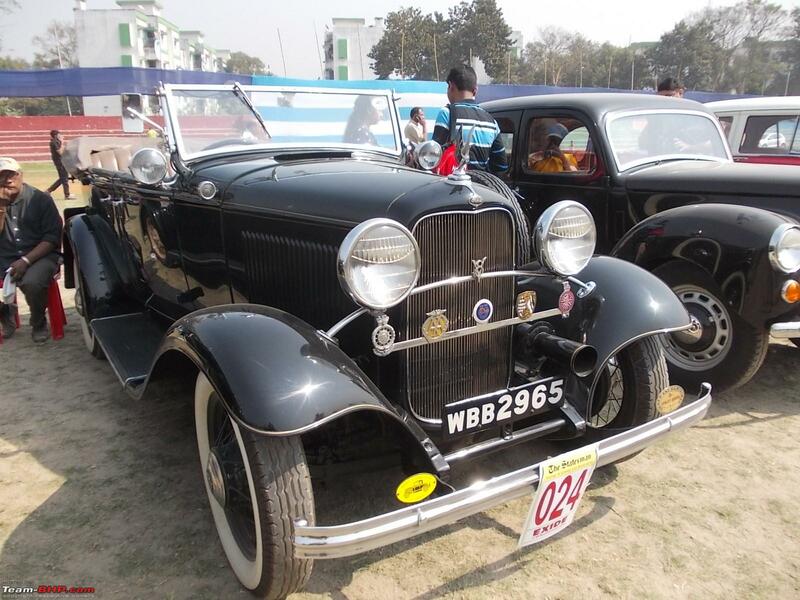 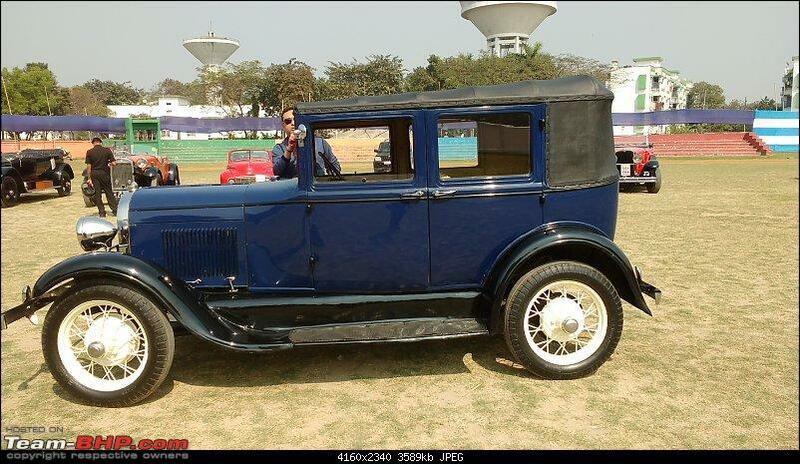 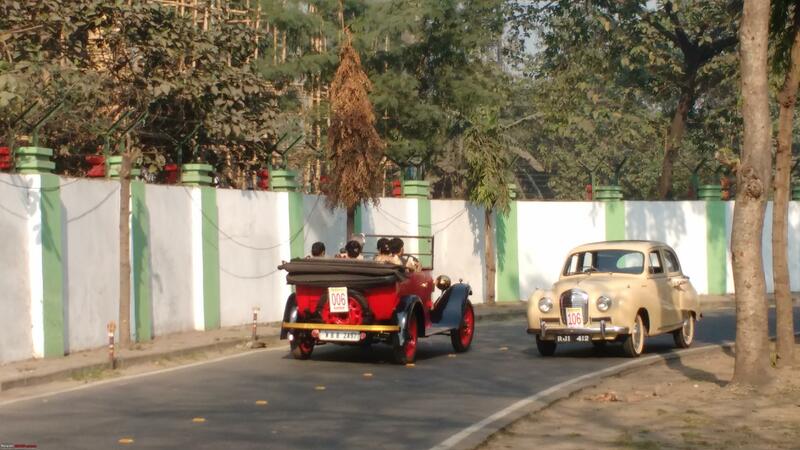 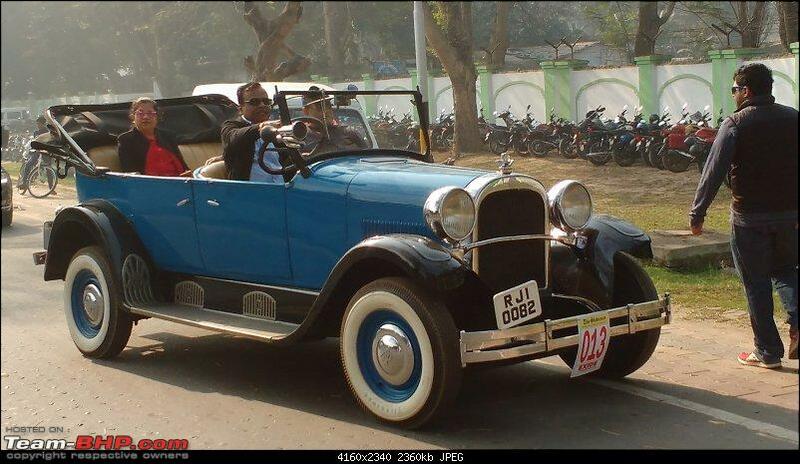 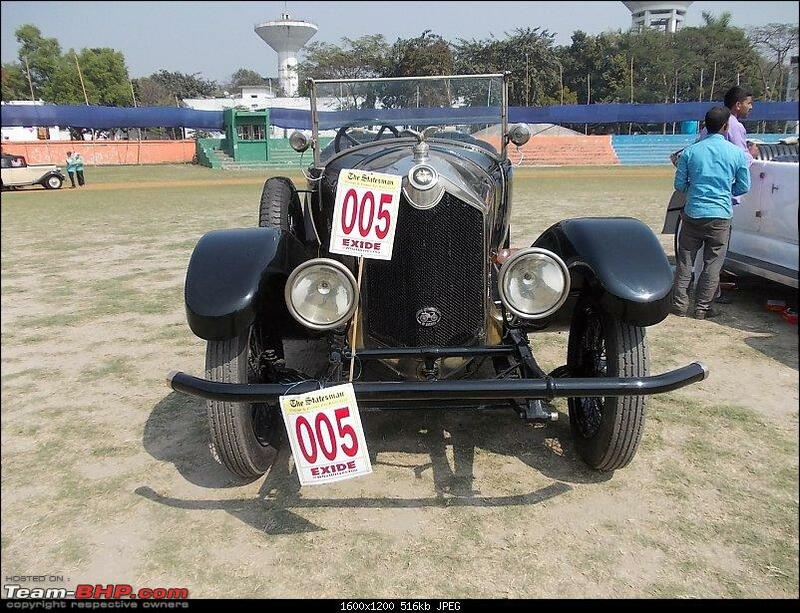 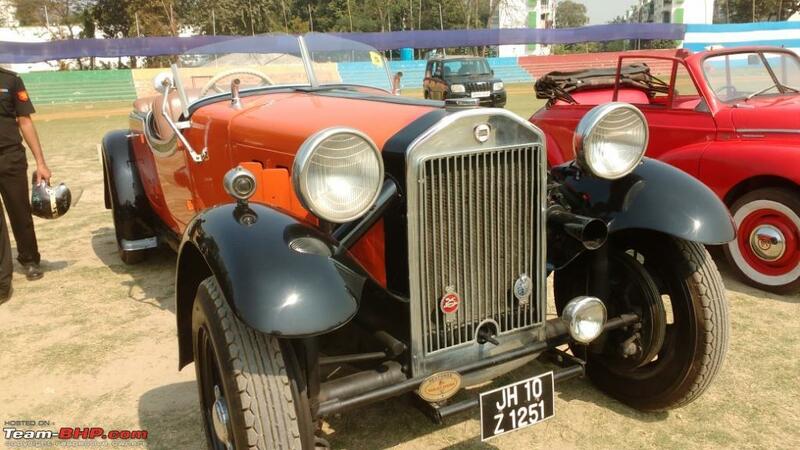 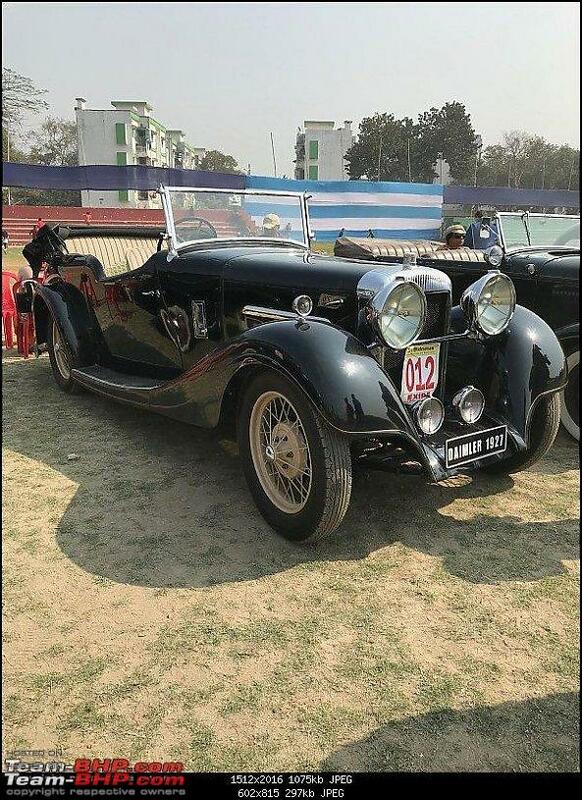 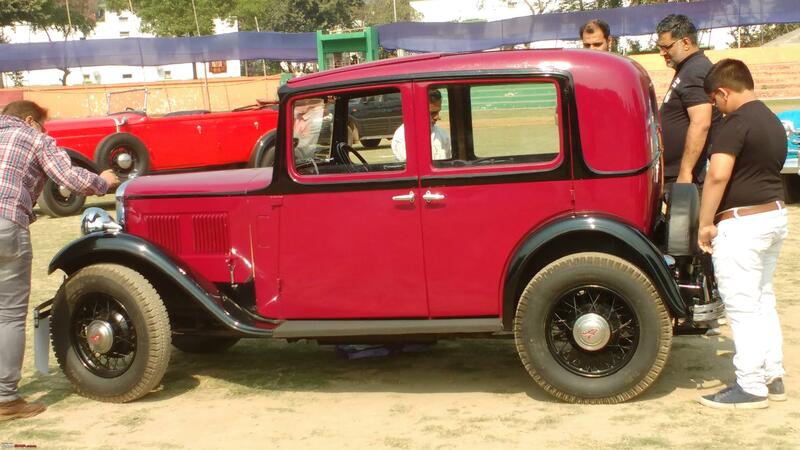 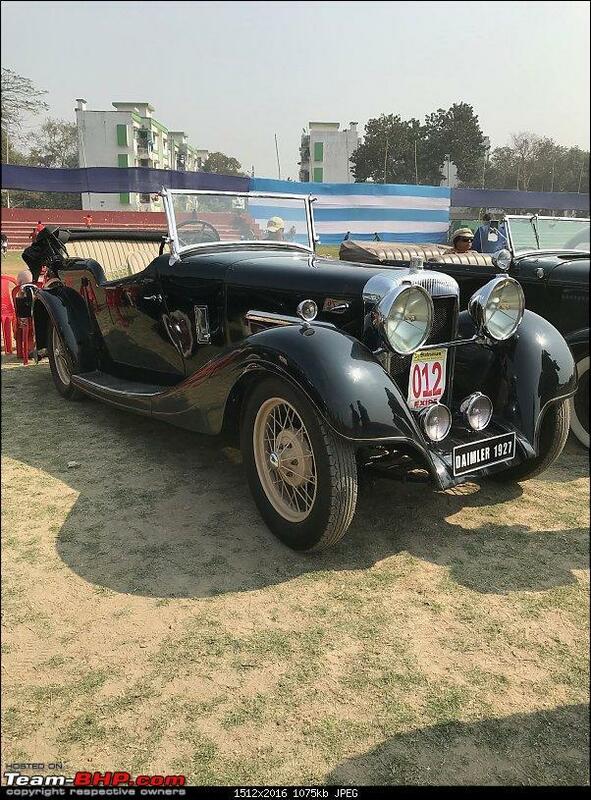 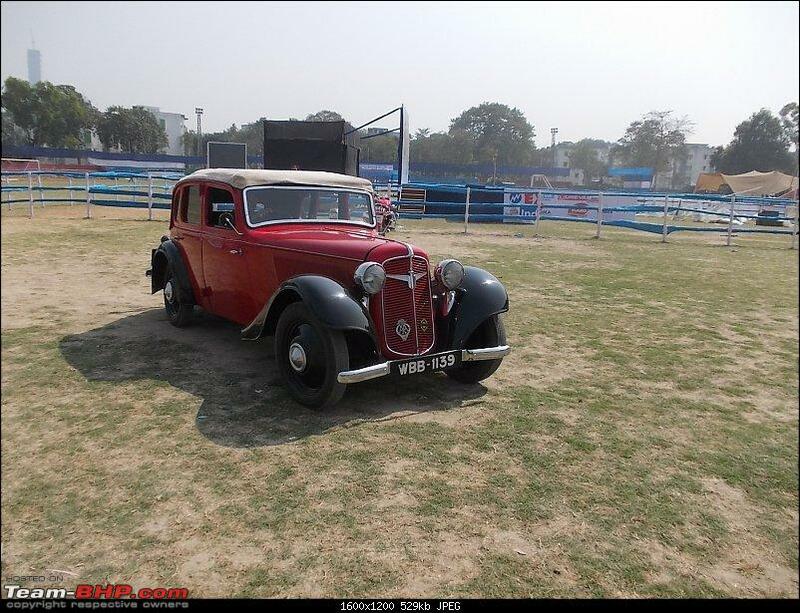 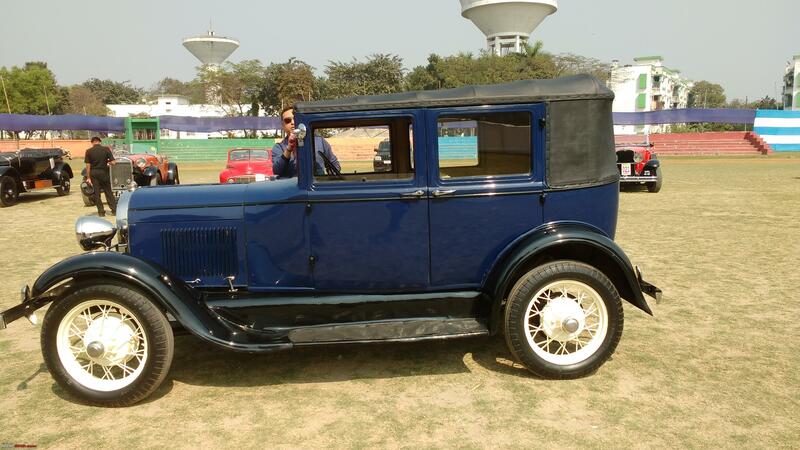 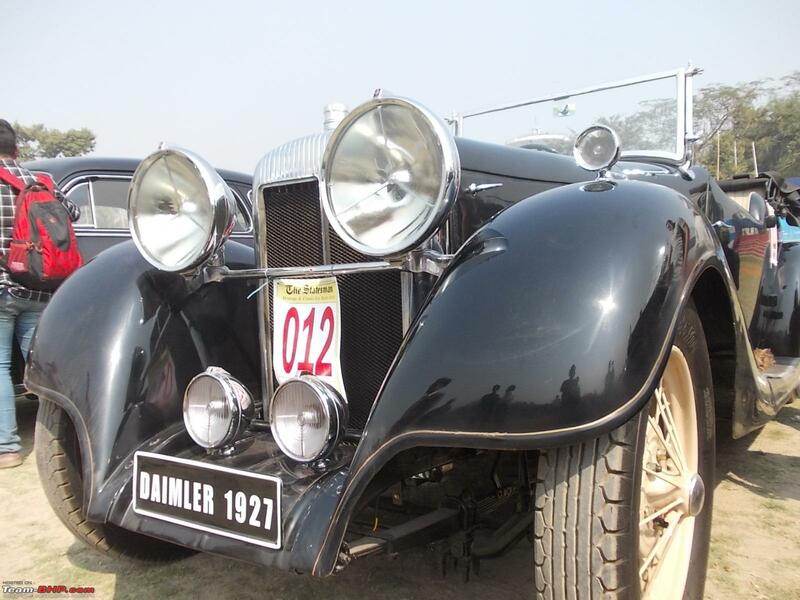 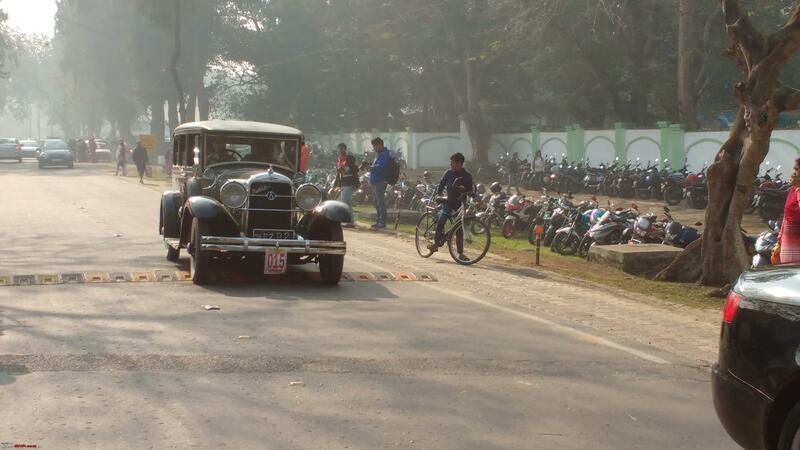 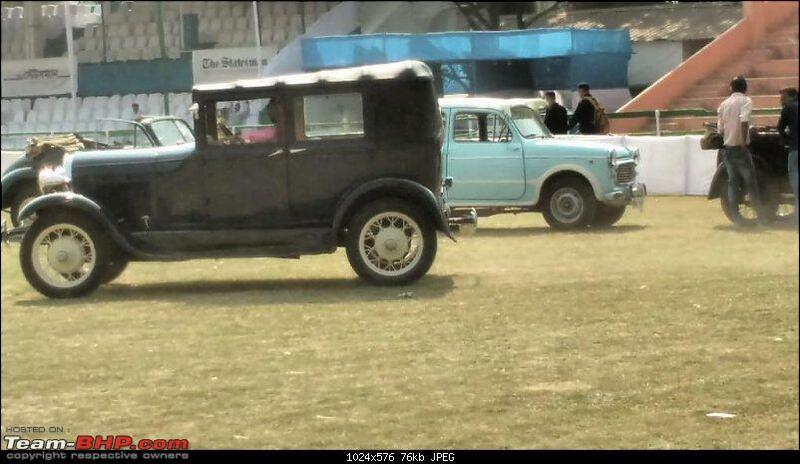 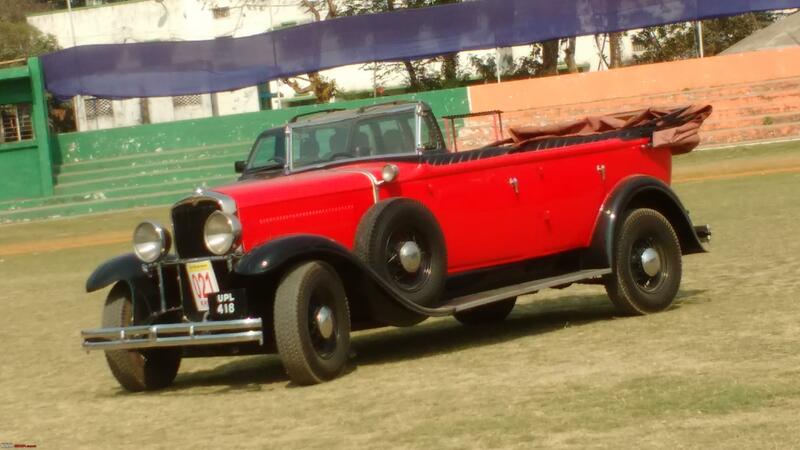 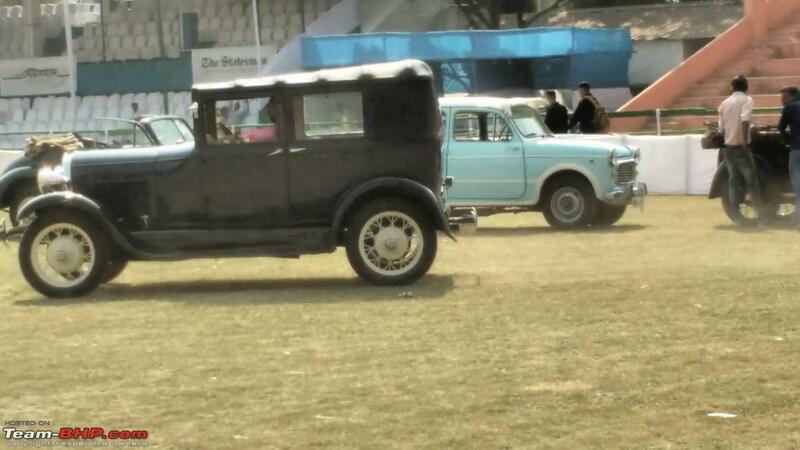 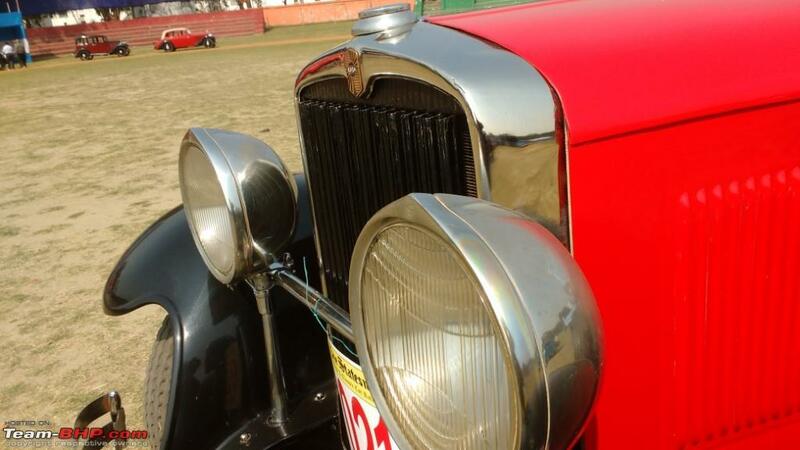 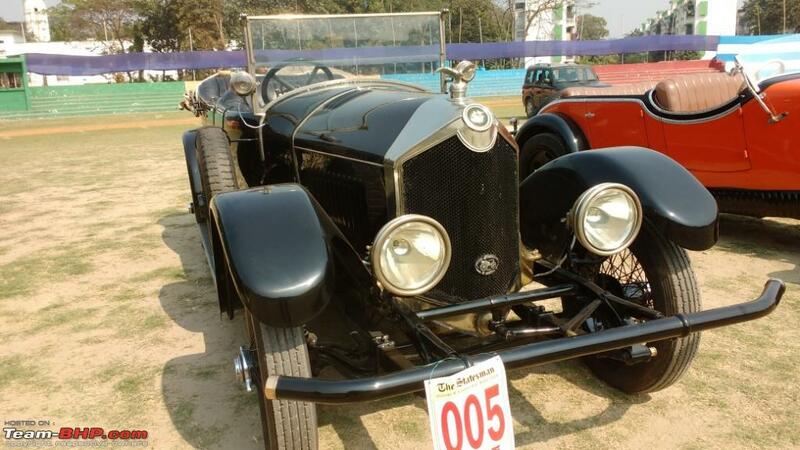 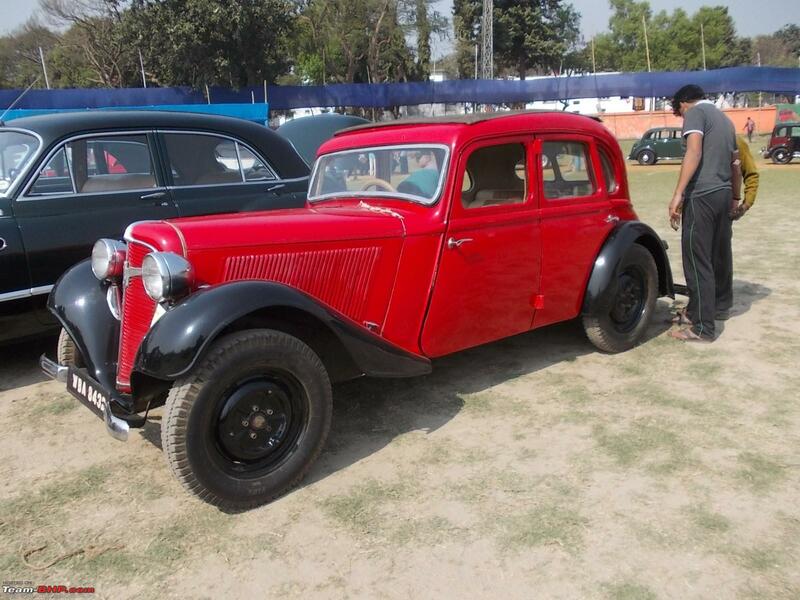 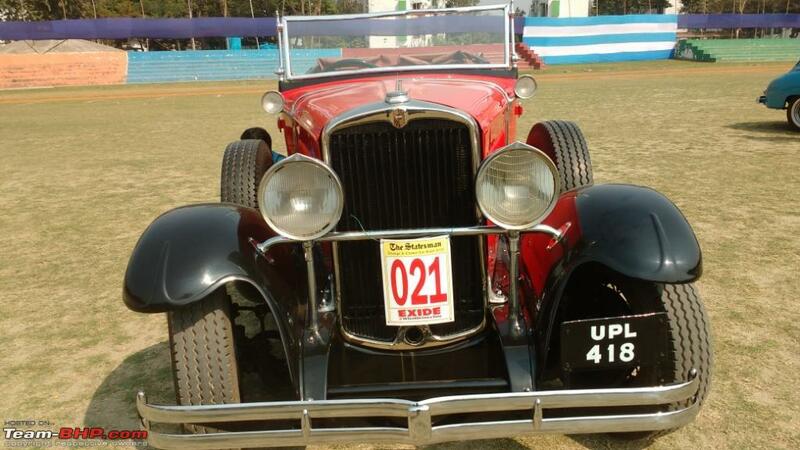 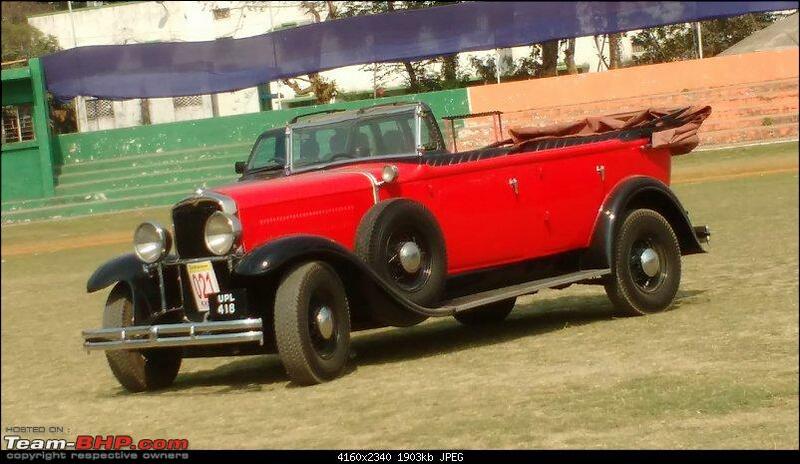 This is a 1928 Daimler Double Six type 30Q from Kanpur, has made an appearance after 60 plus years. 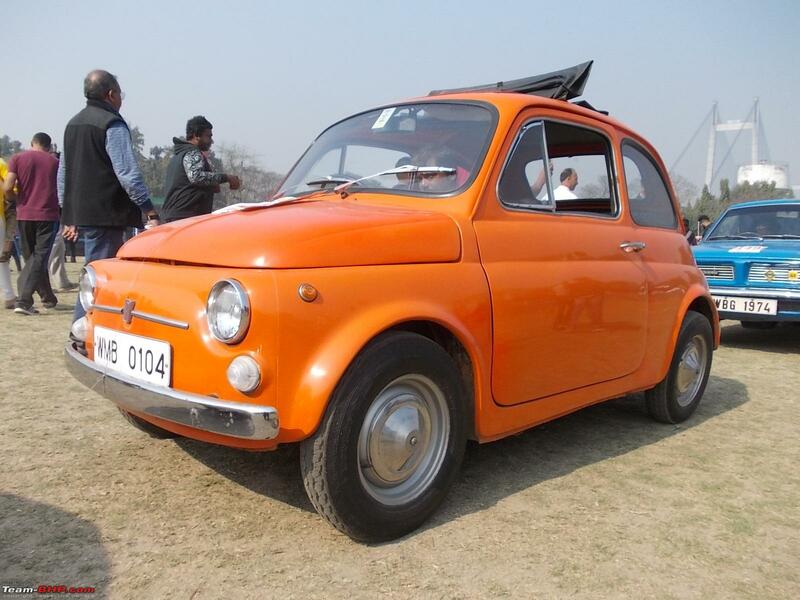 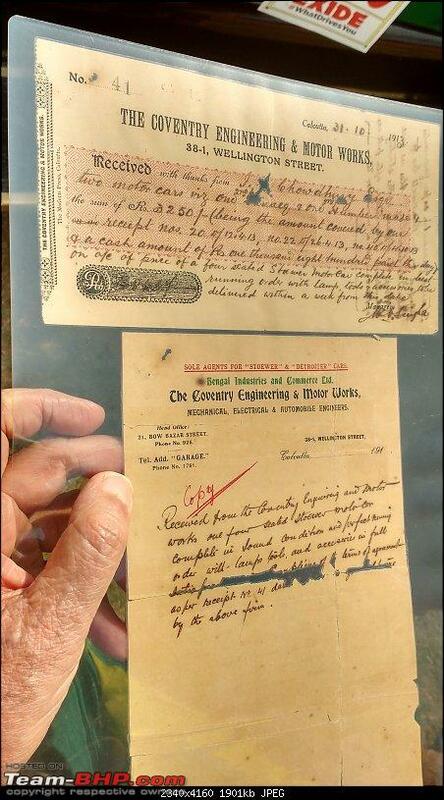 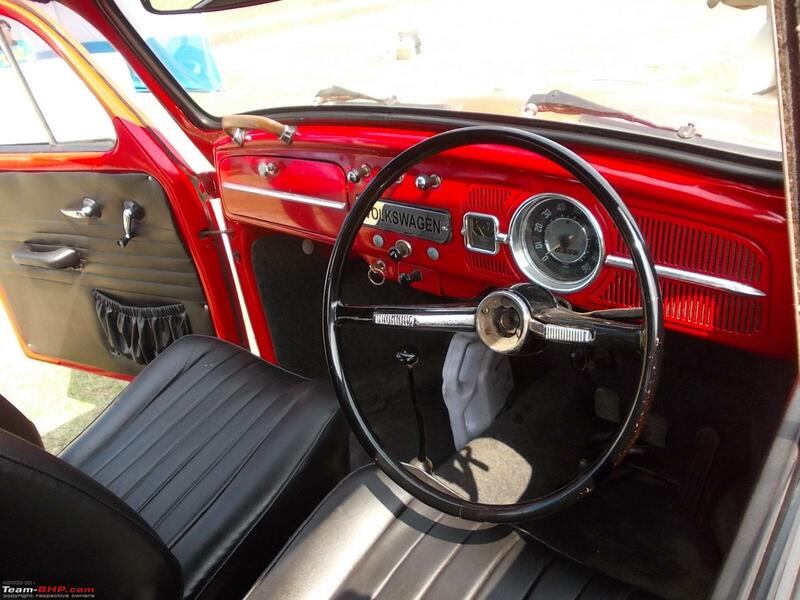 Little is known on the history of the car and when it was imported. 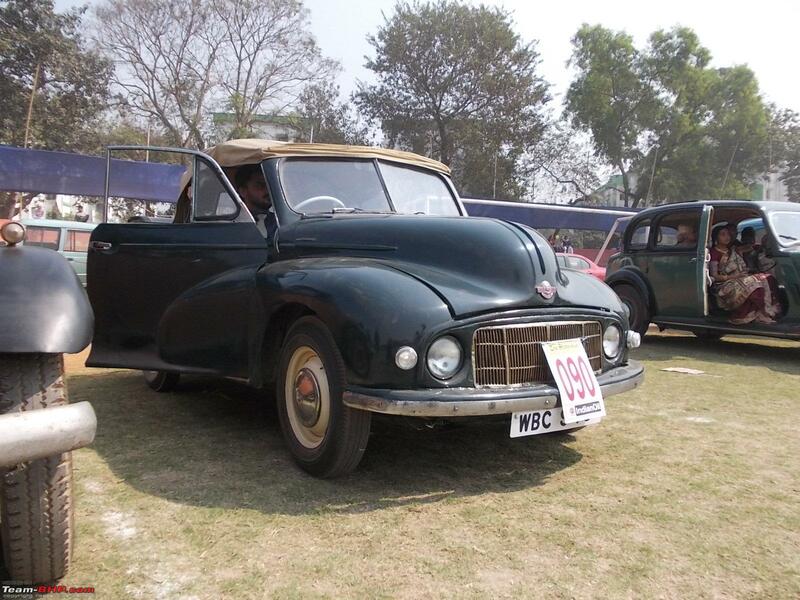 At some point re-bodied in then Calcutta, but no further information was available. 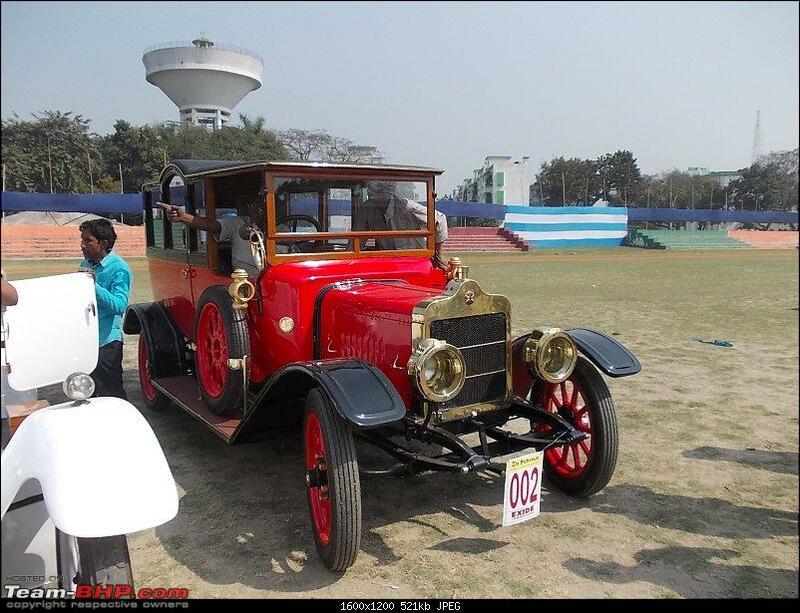 The body was in a major state of disrepair and was jacked and kept for many many years in Kanpur. 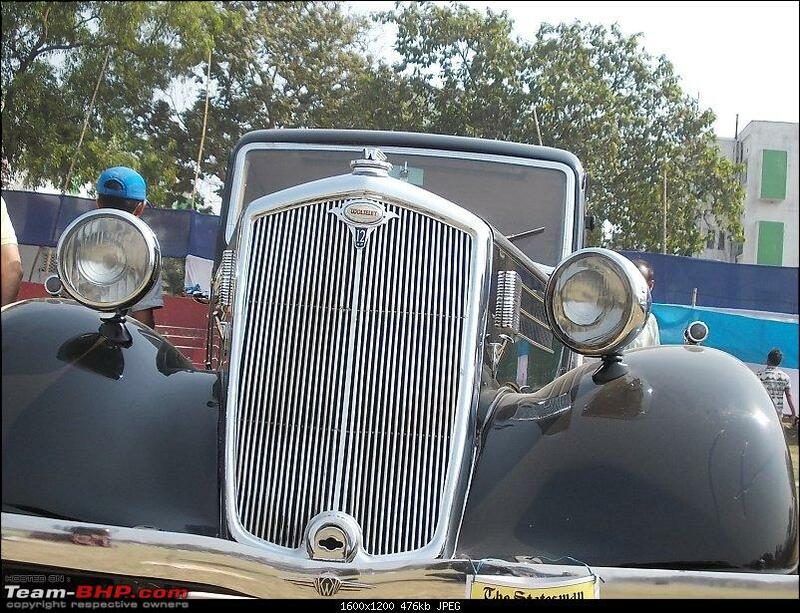 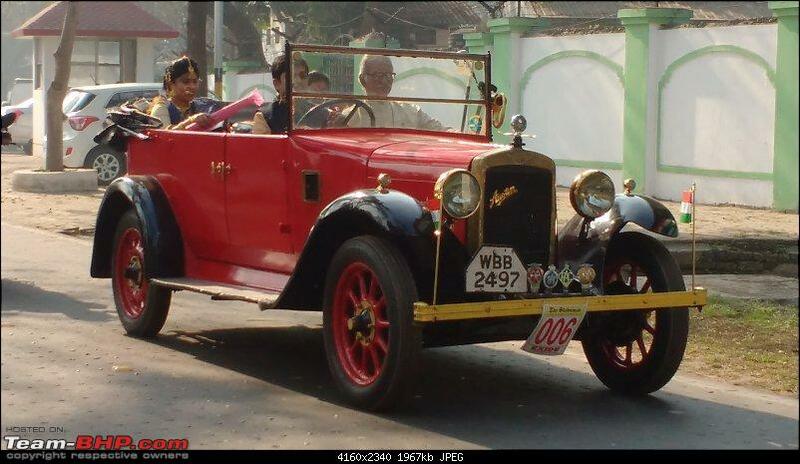 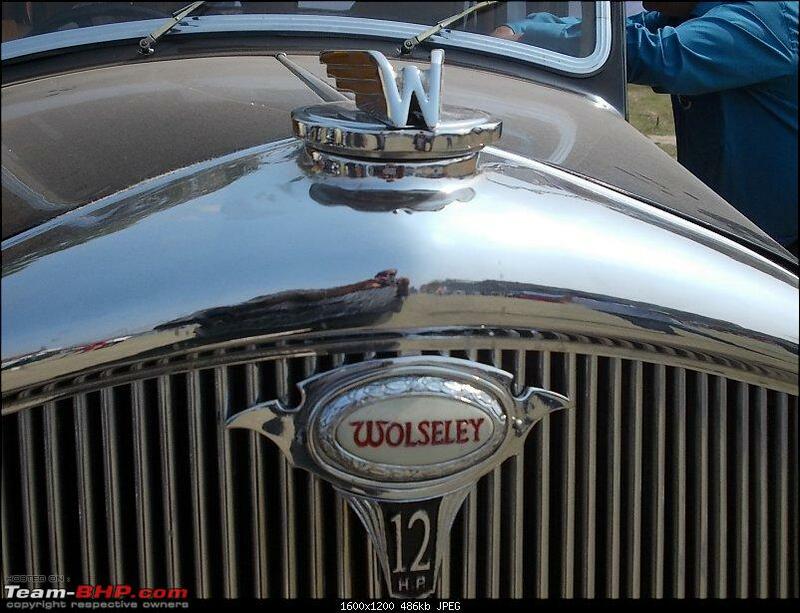 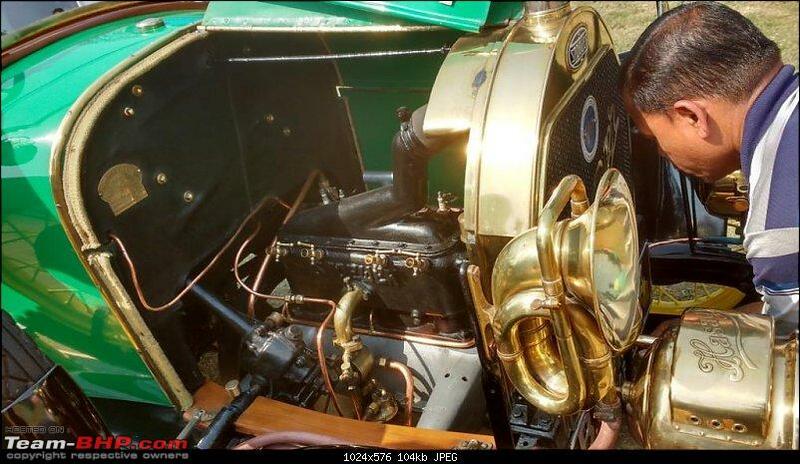 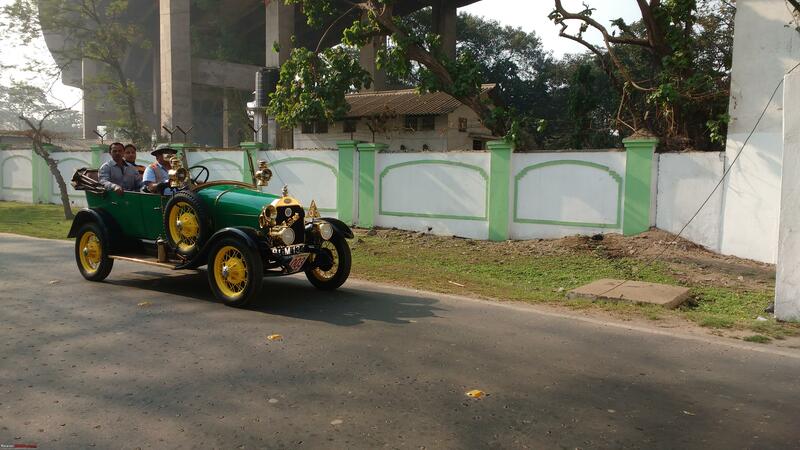 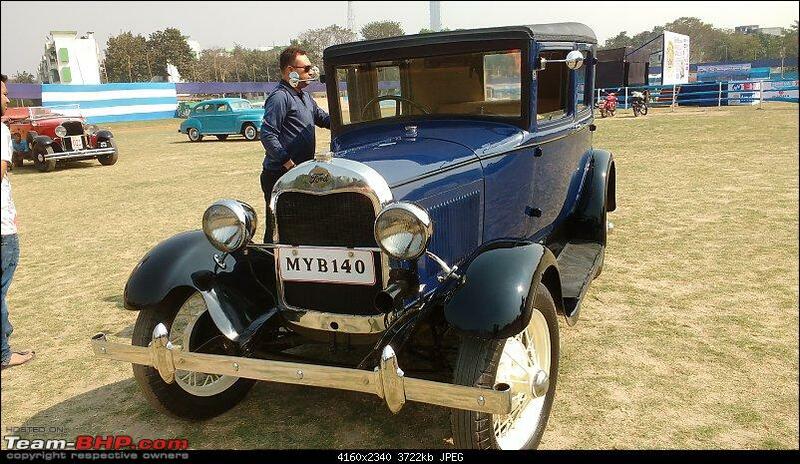 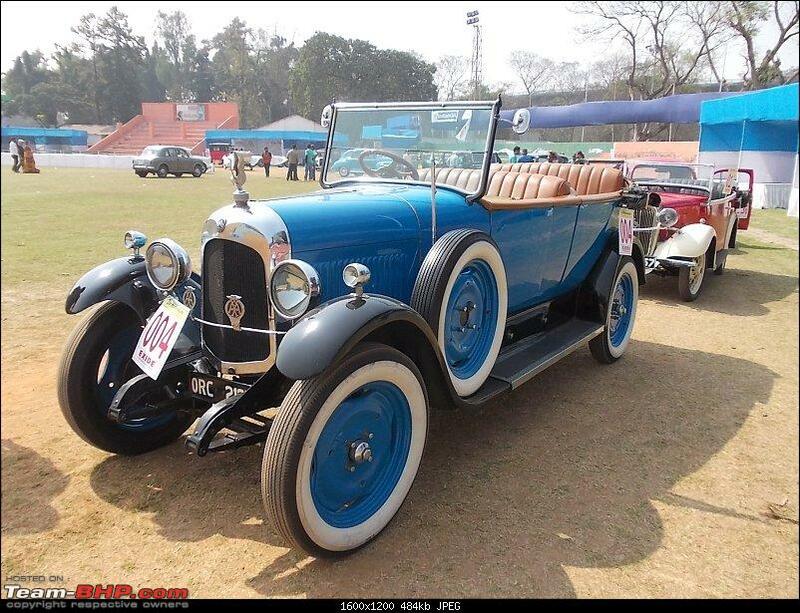 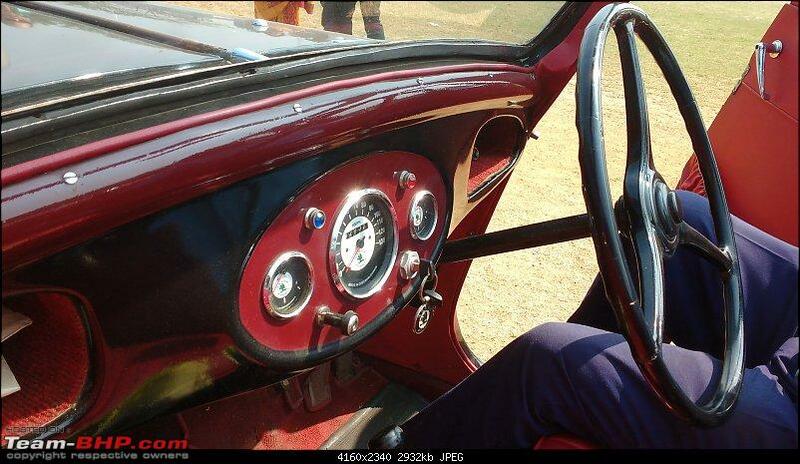 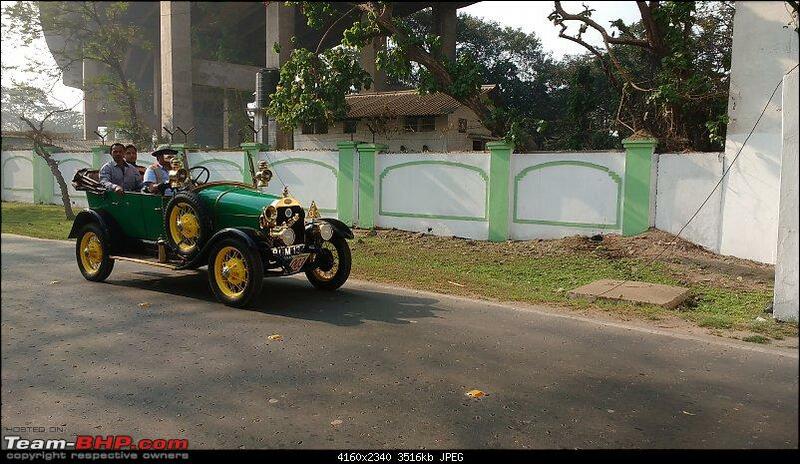 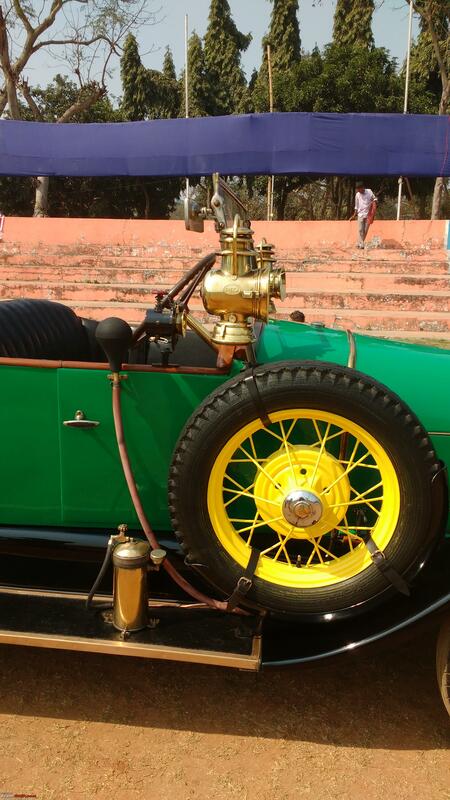 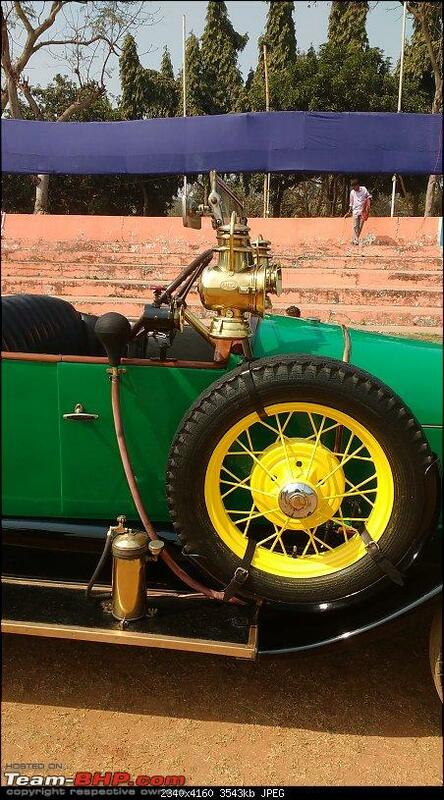 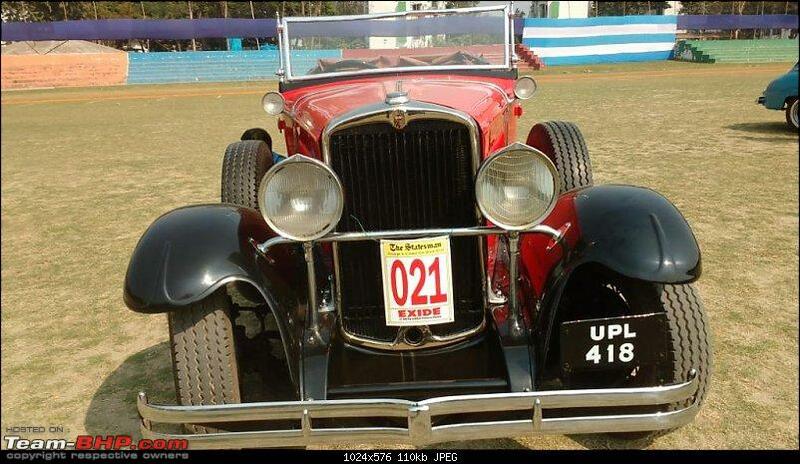 History repeats itself in that, this massive car was rebodied and restored by the workshop of Mr. Sanjay Ghosh. 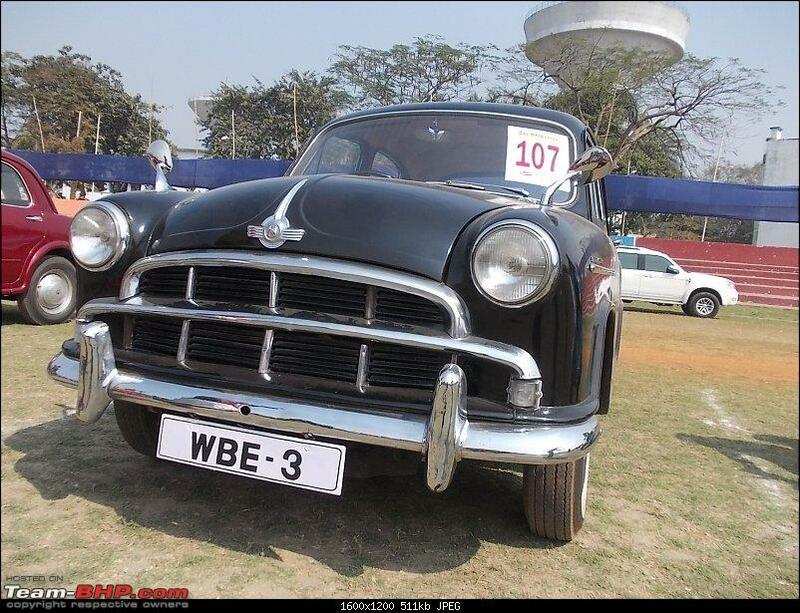 Hence it was rebodied for the second time in now Kolkata! From the way this car was, it is a massive achievement. 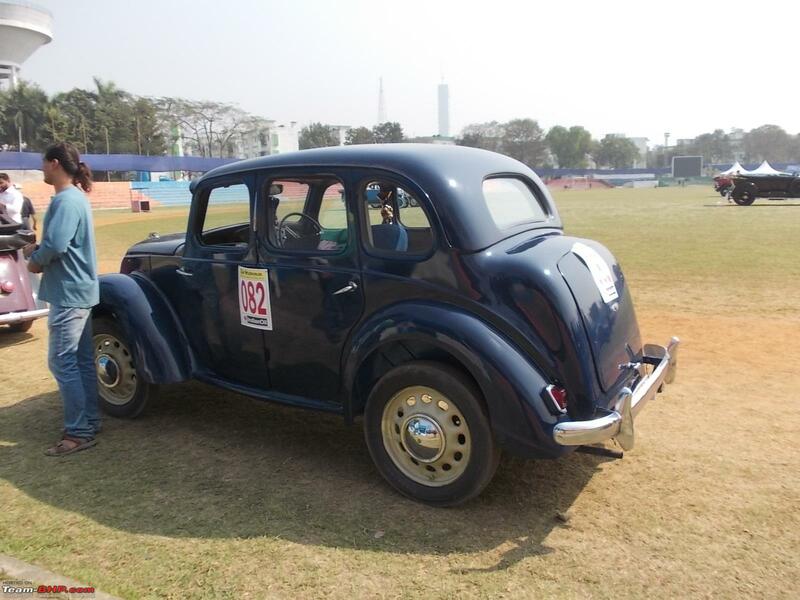 Great to have this car back ticking. 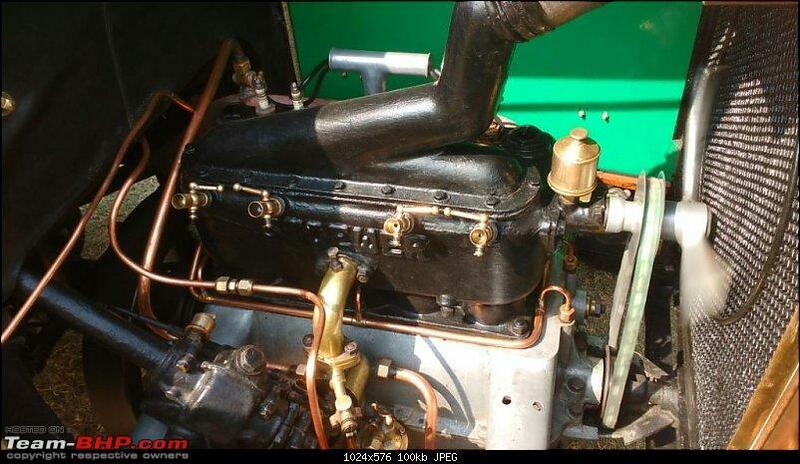 The massive 7.1 litre, 12 cylinder, sleeve valve engine belches white smoke. 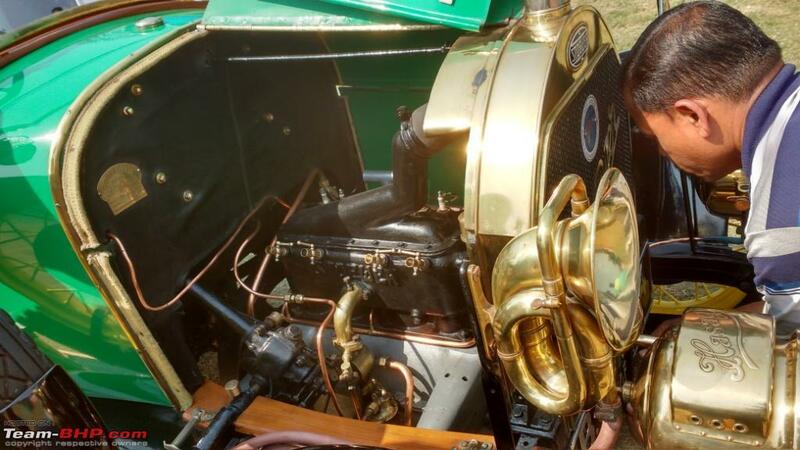 This 1906 Renault has had a major restoration. 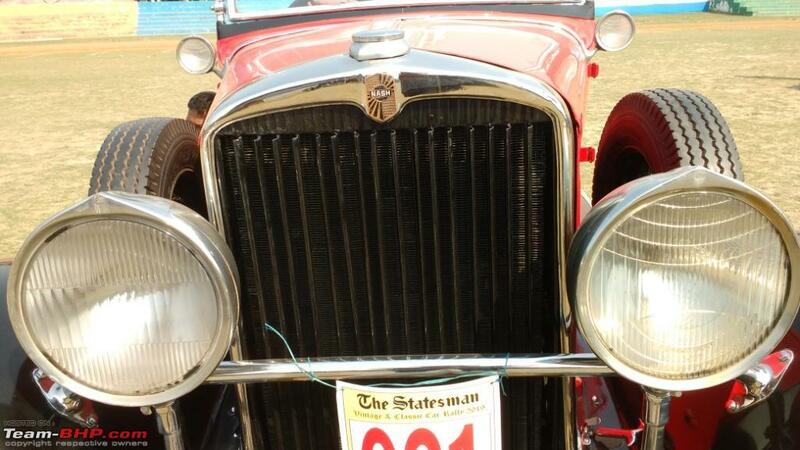 Has been with the Kanoria family for many many years and has been a very regular feature at the Statesman Rally. 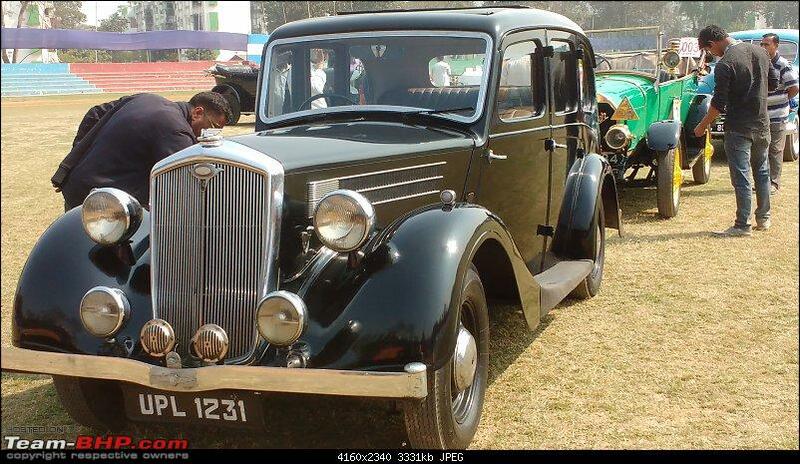 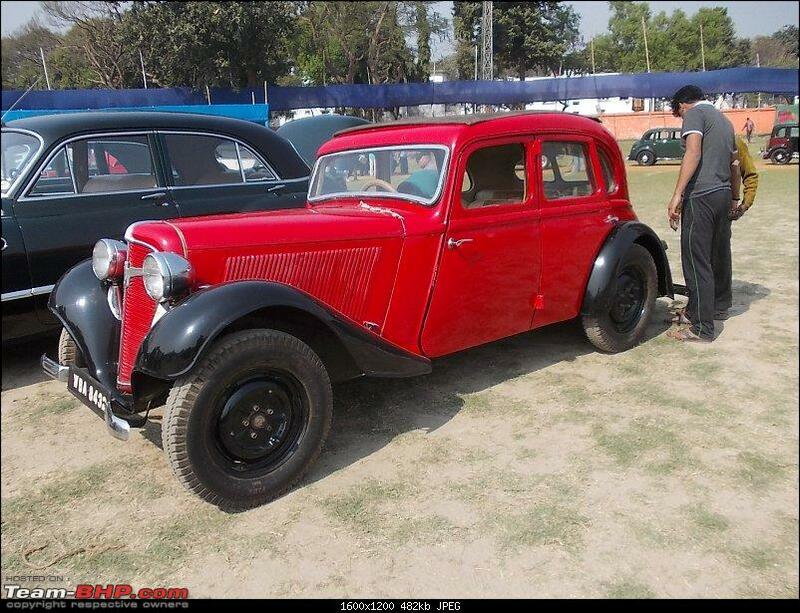 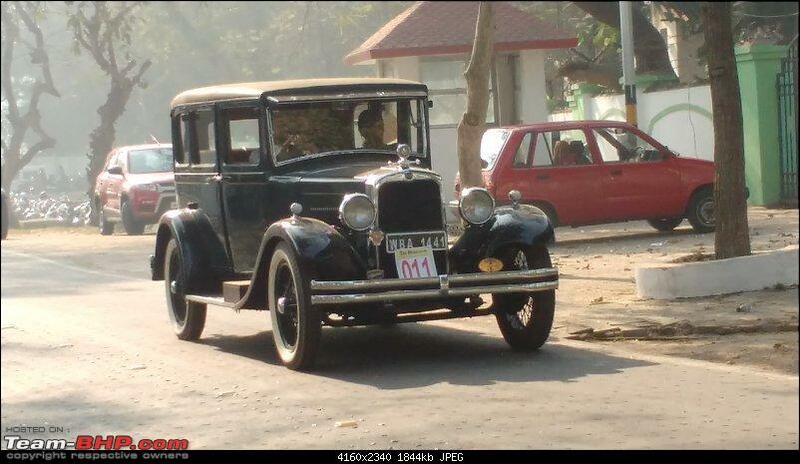 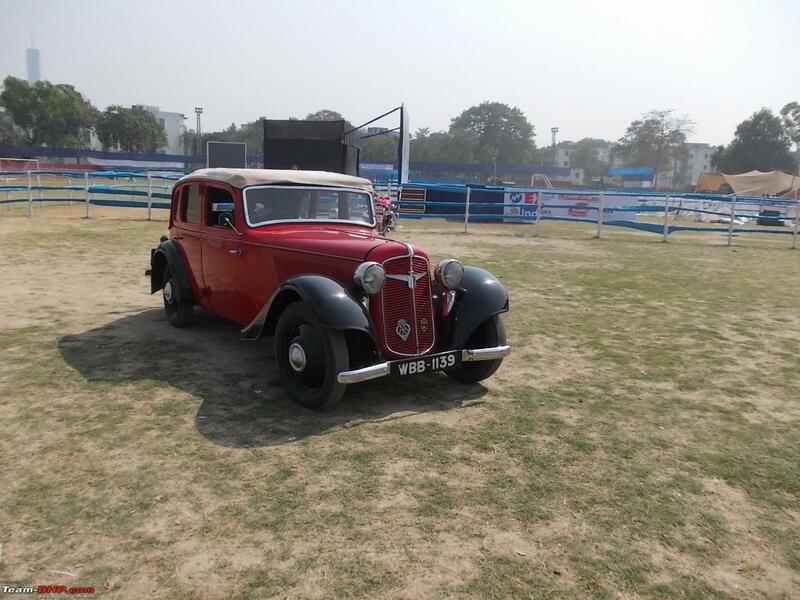 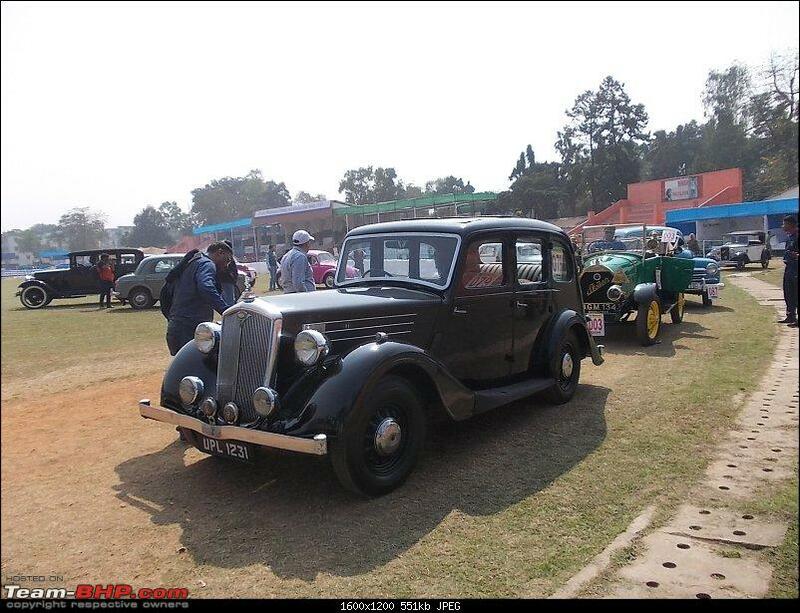 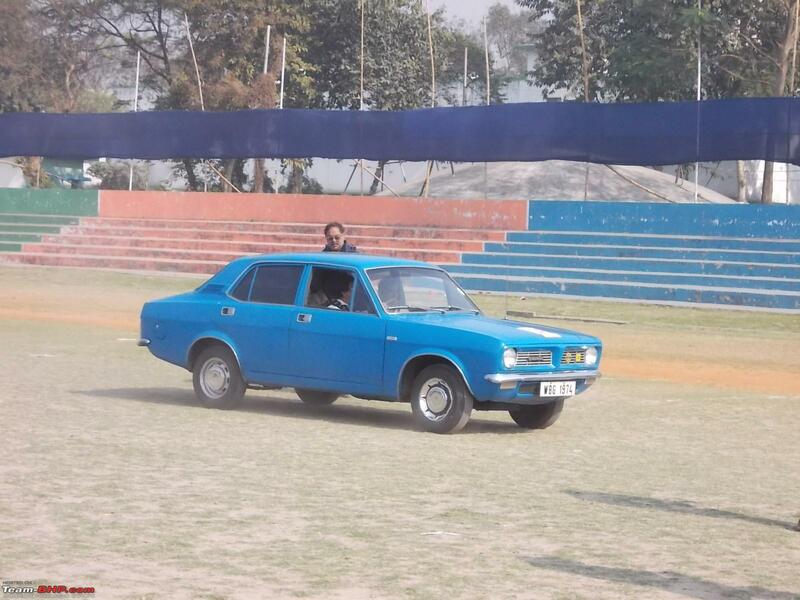 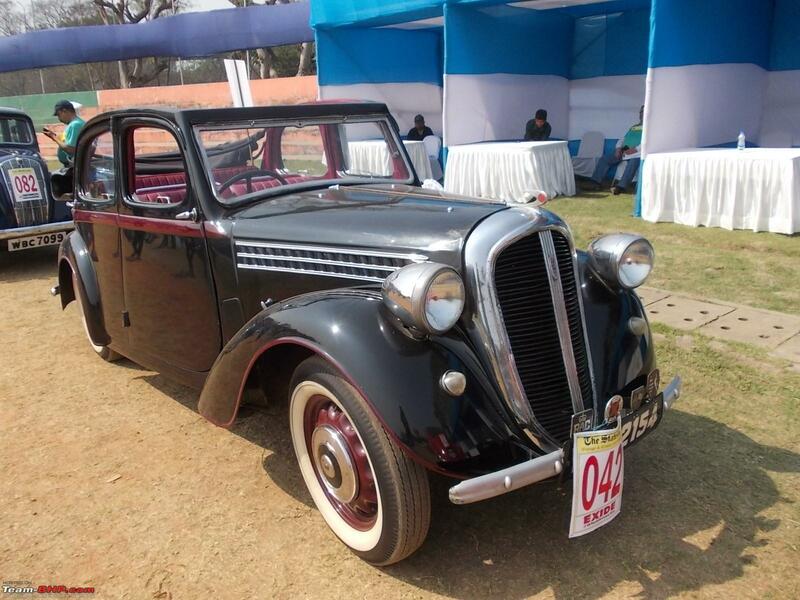 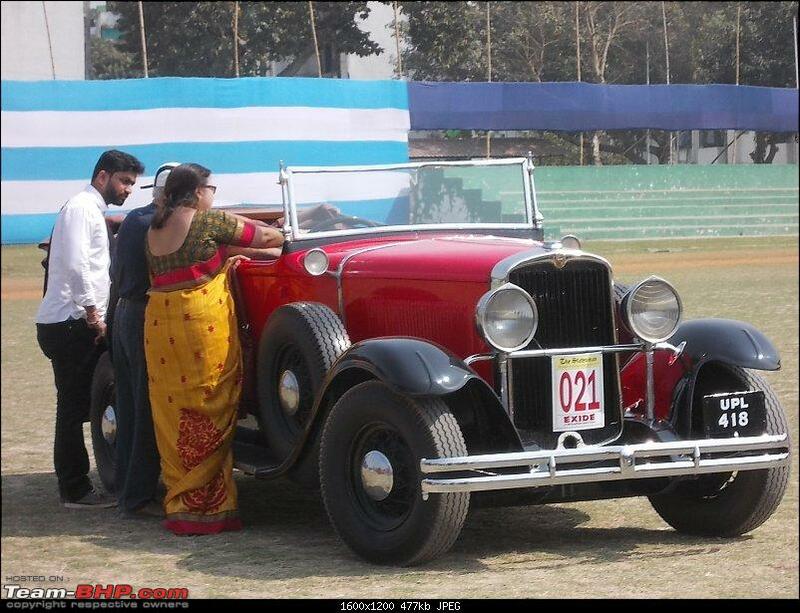 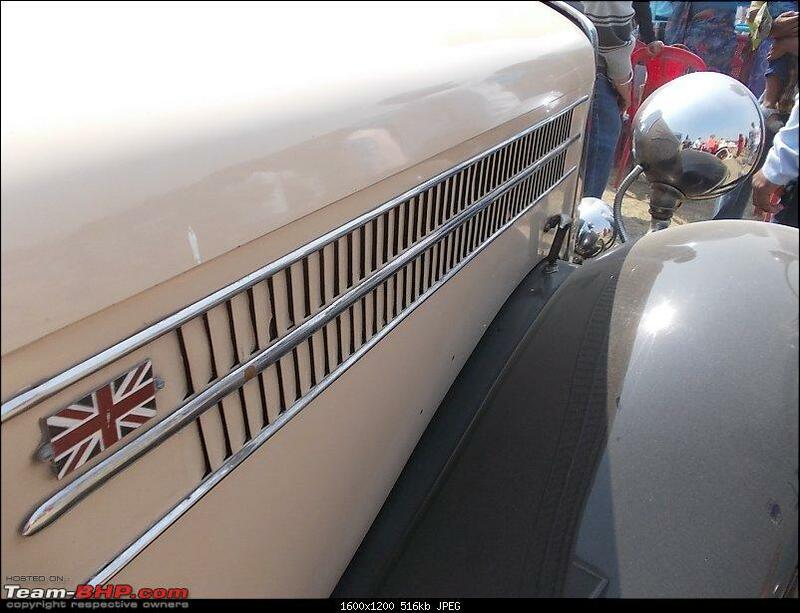 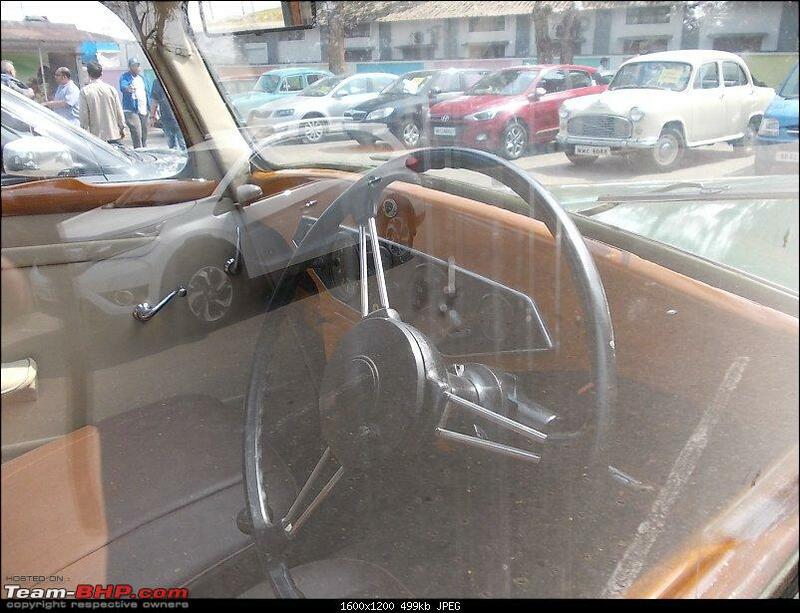 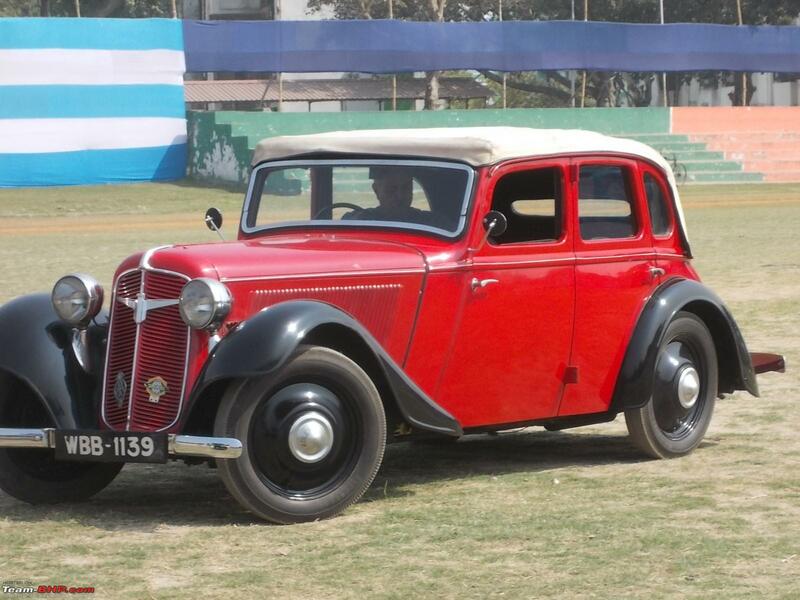 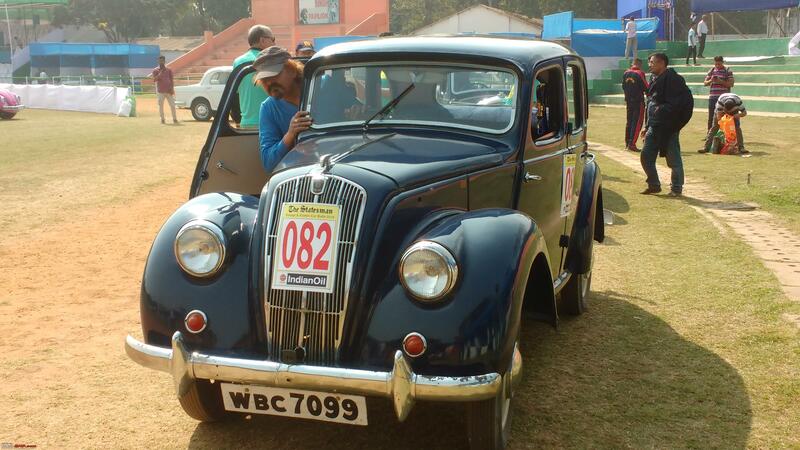 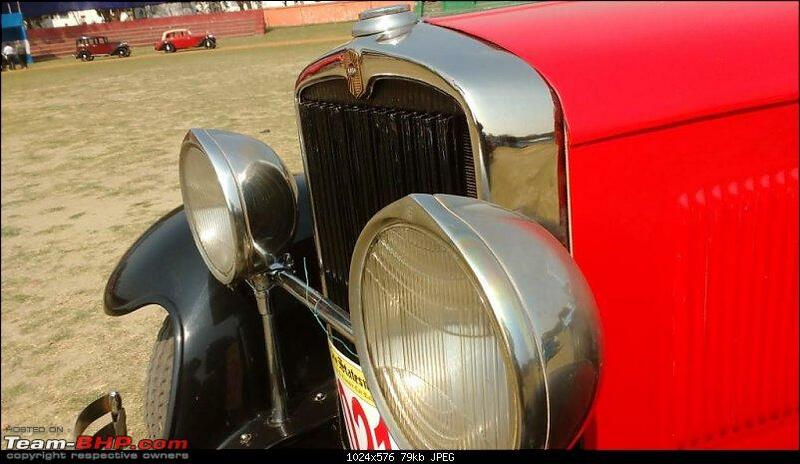 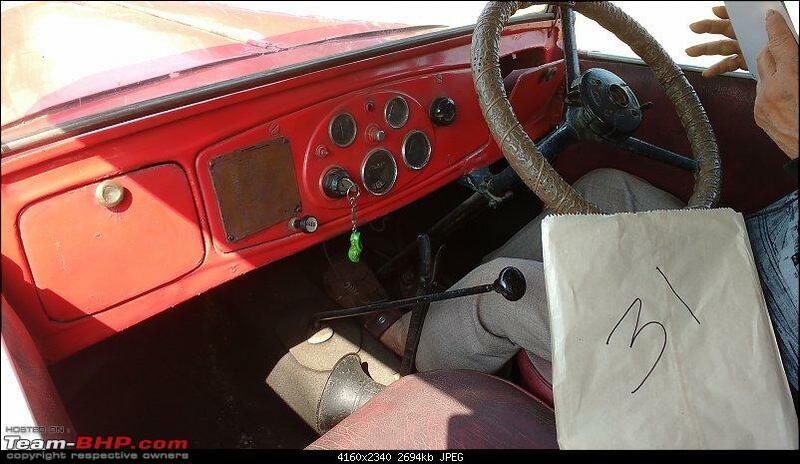 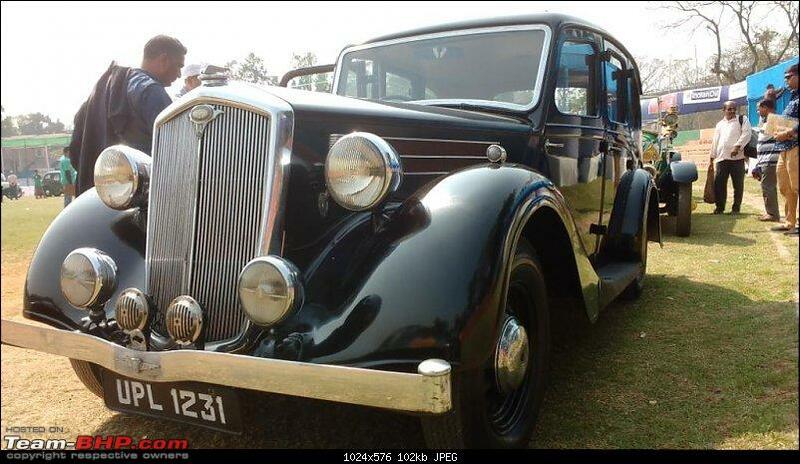 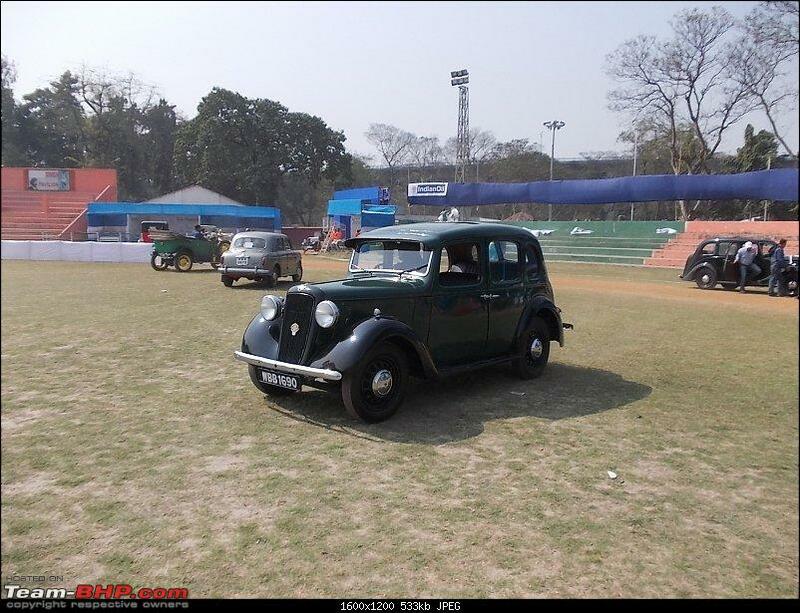 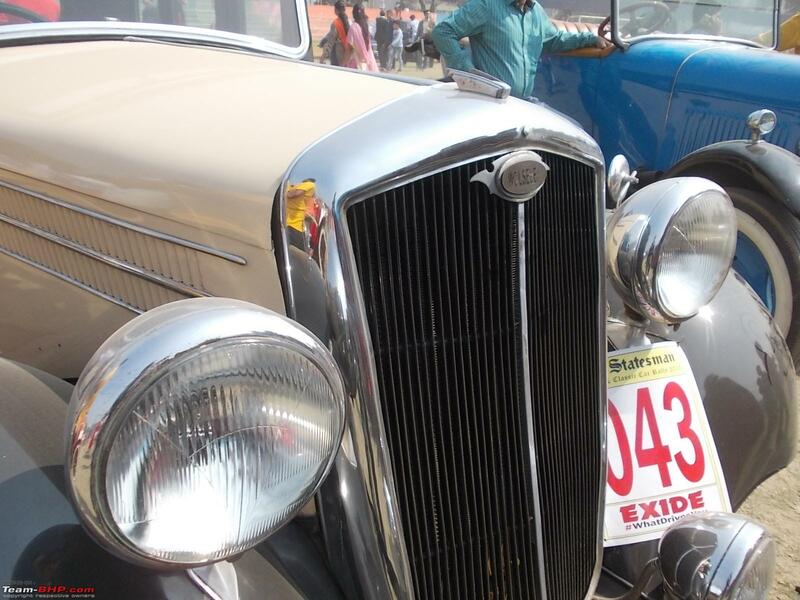 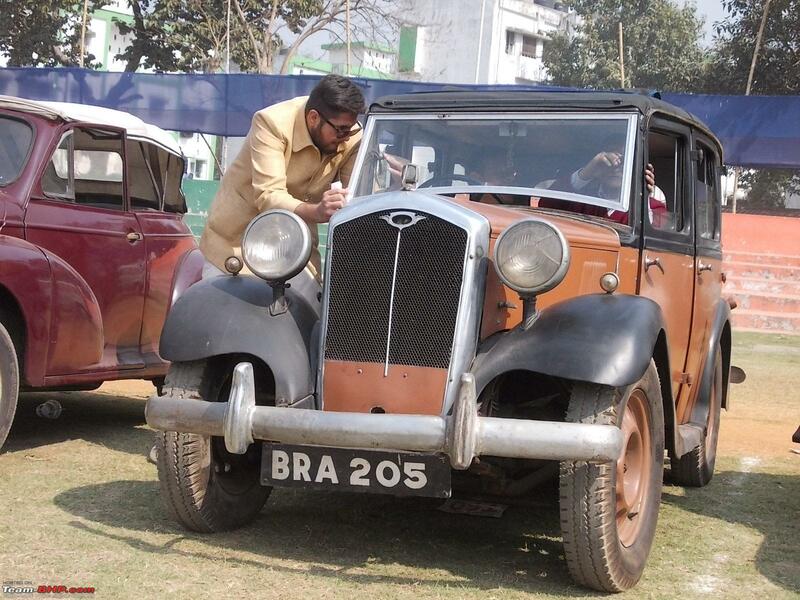 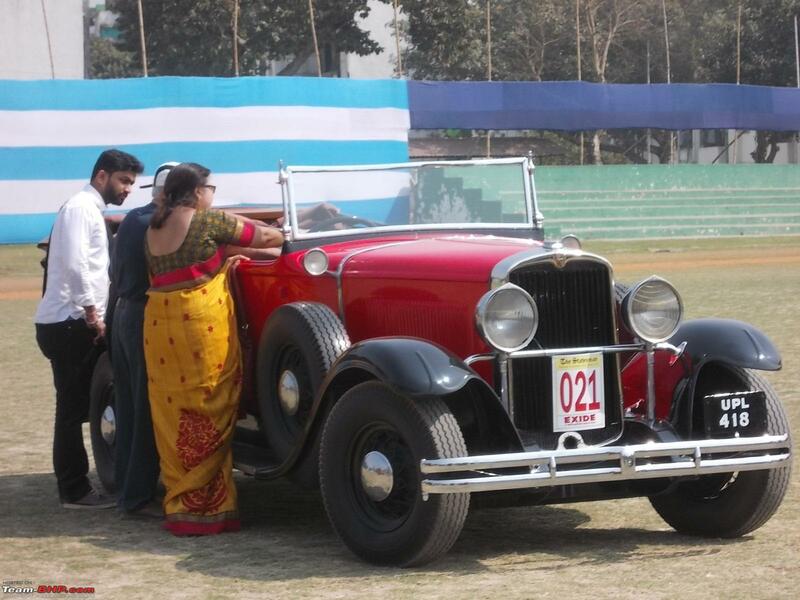 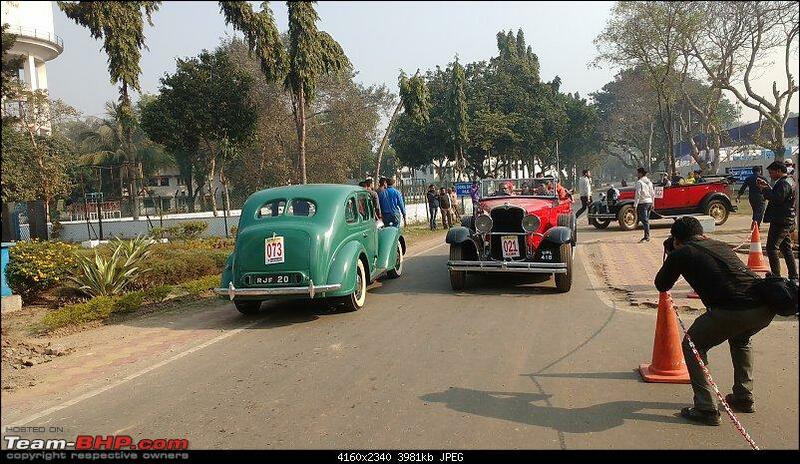 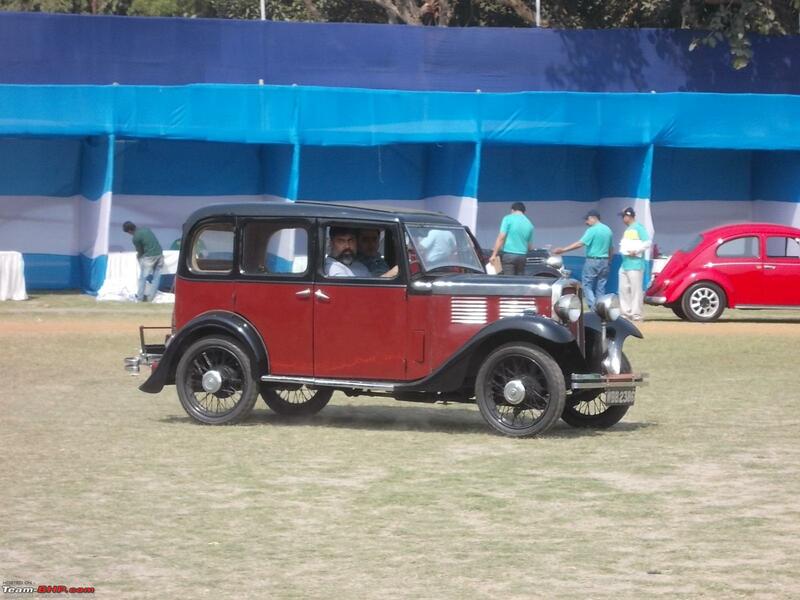 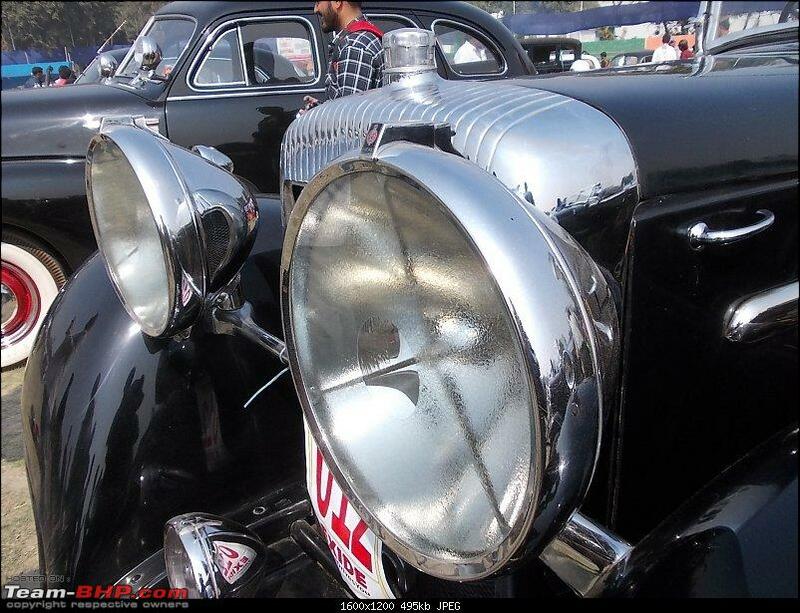 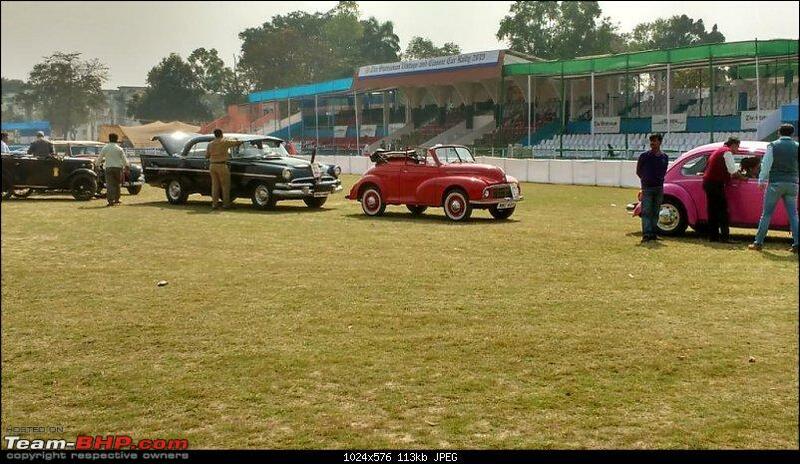 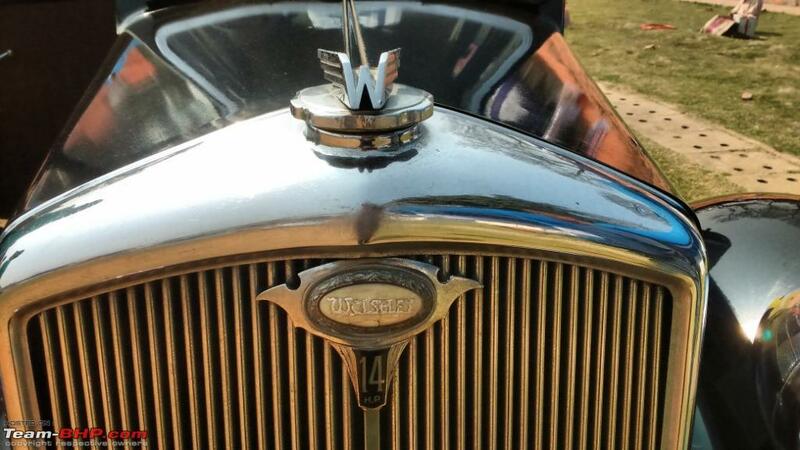 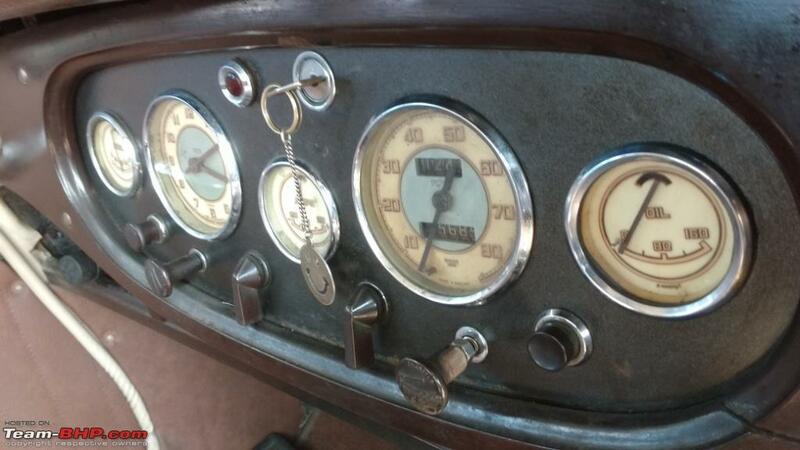 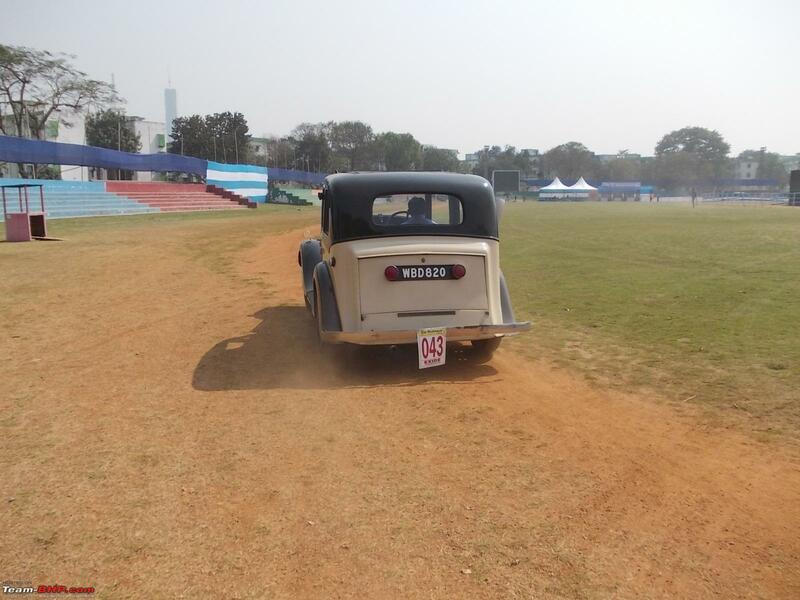 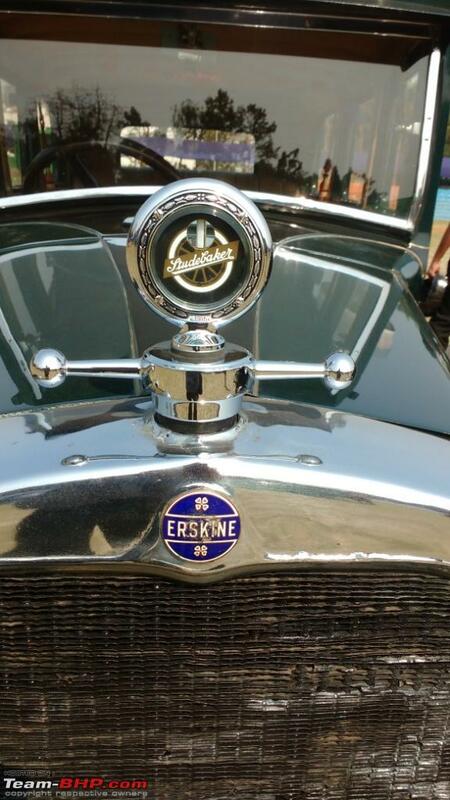 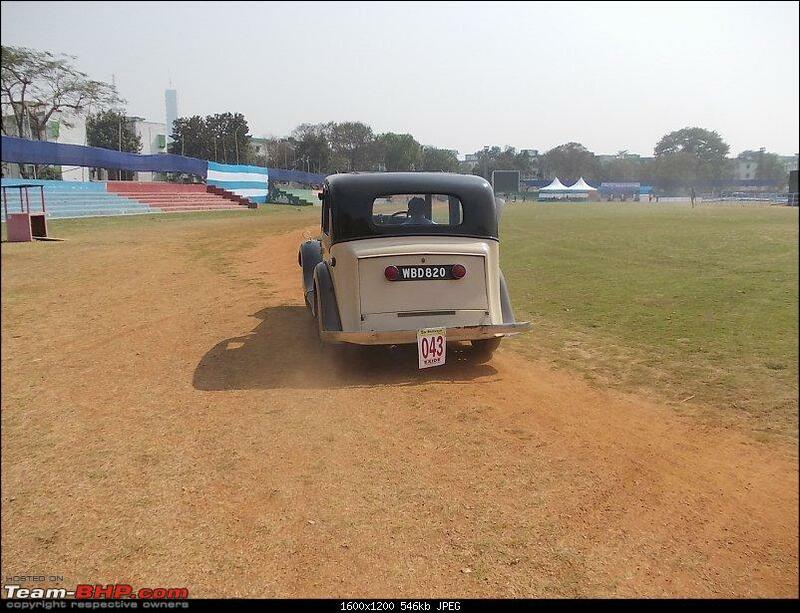 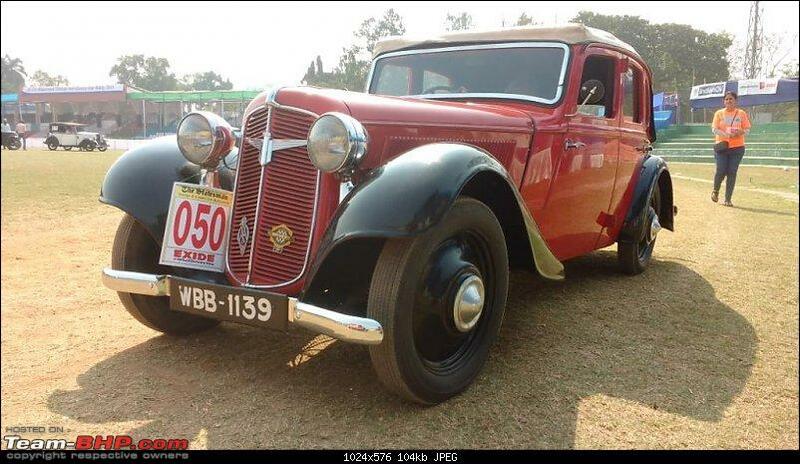 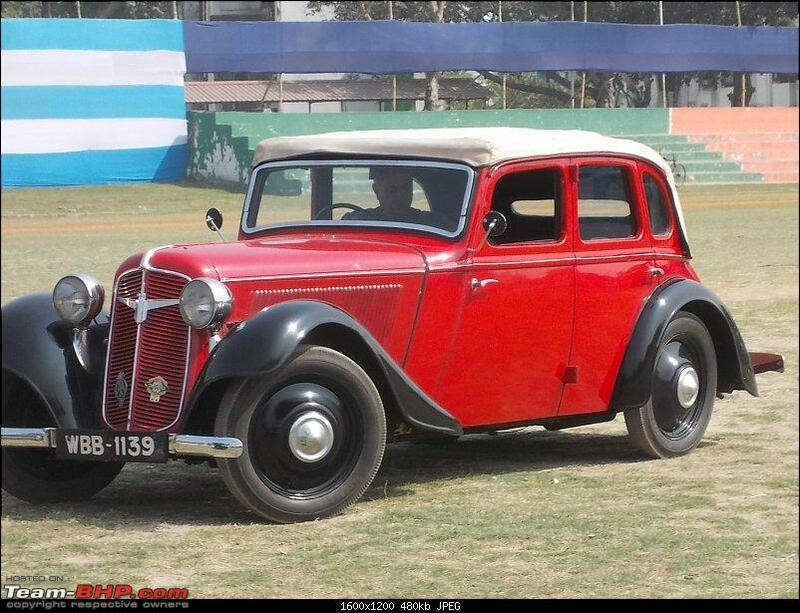 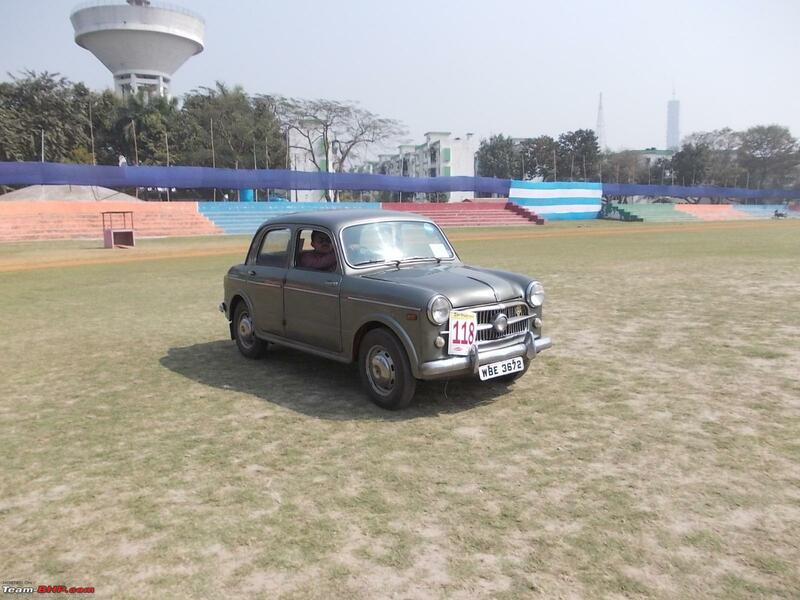 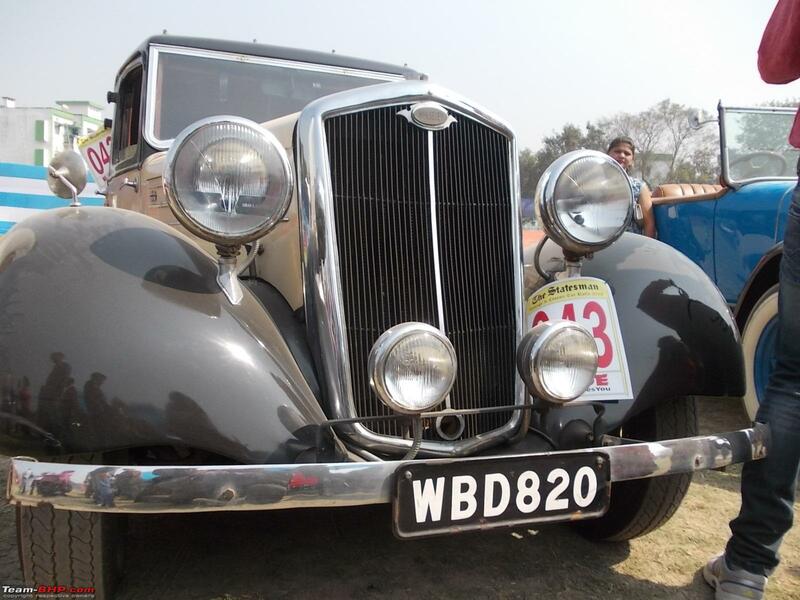 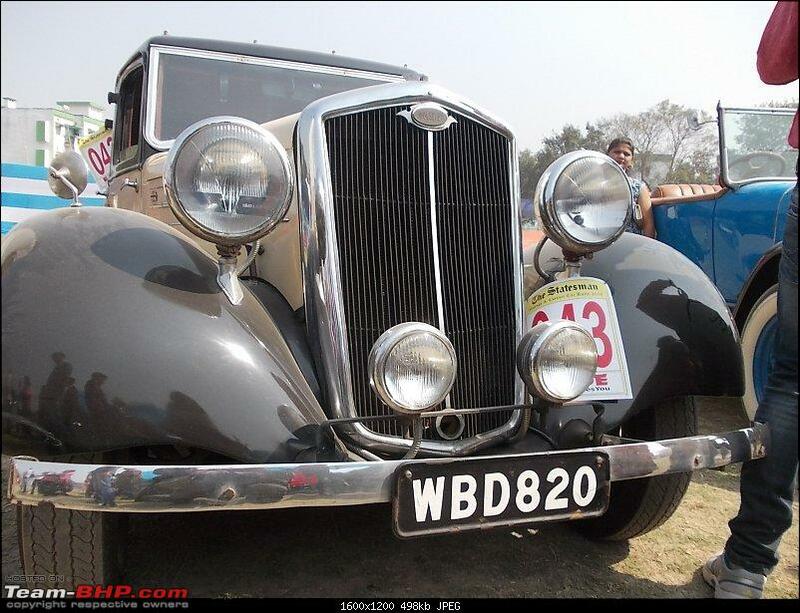 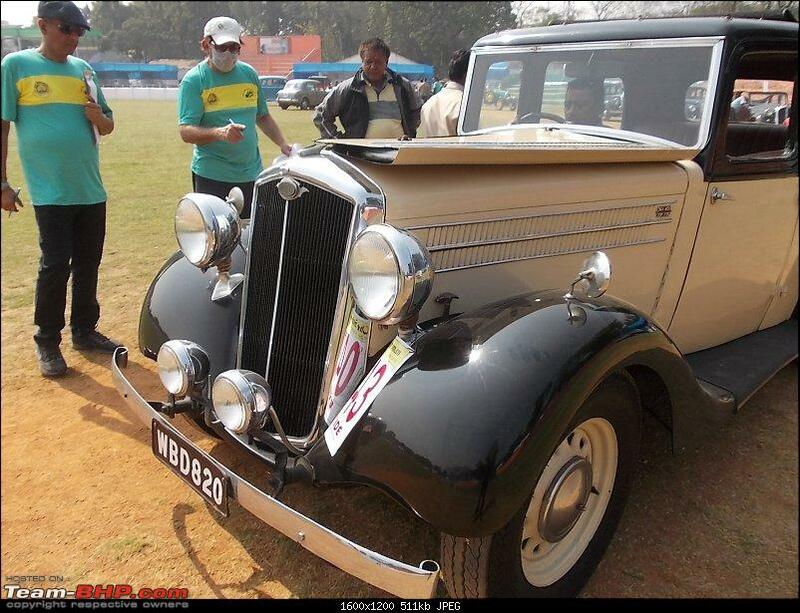 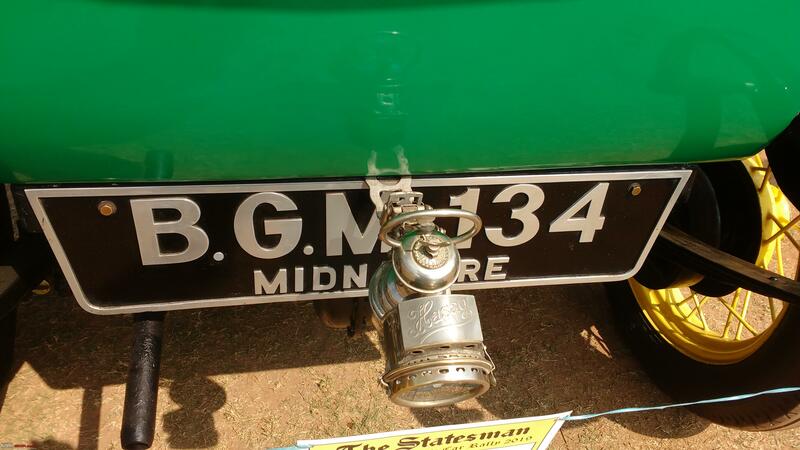 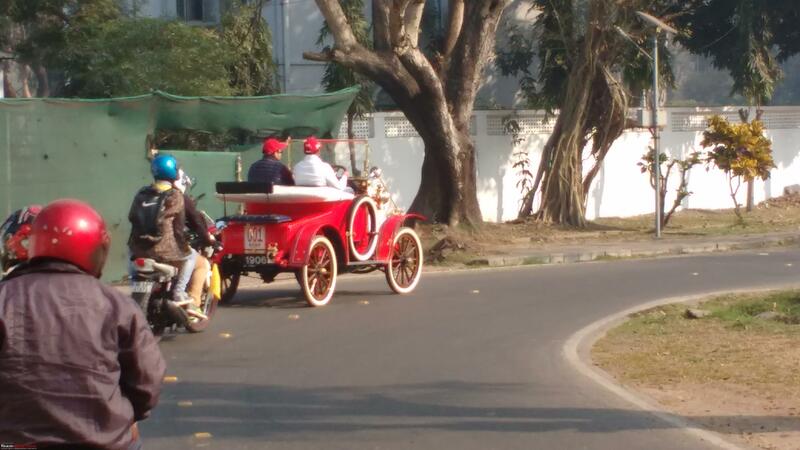 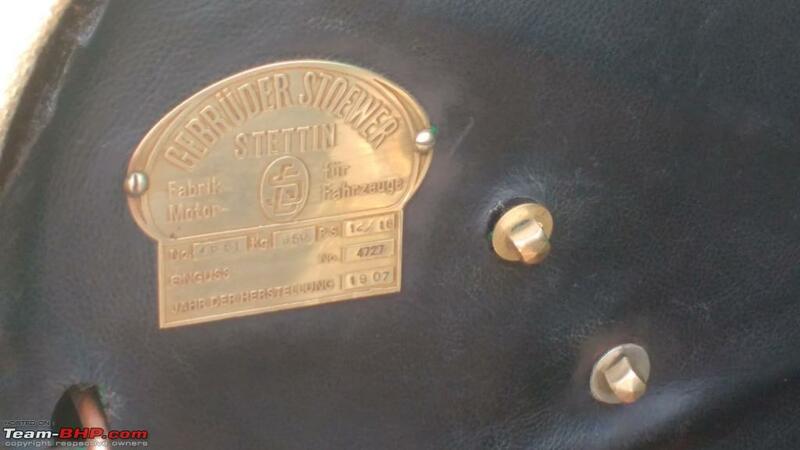 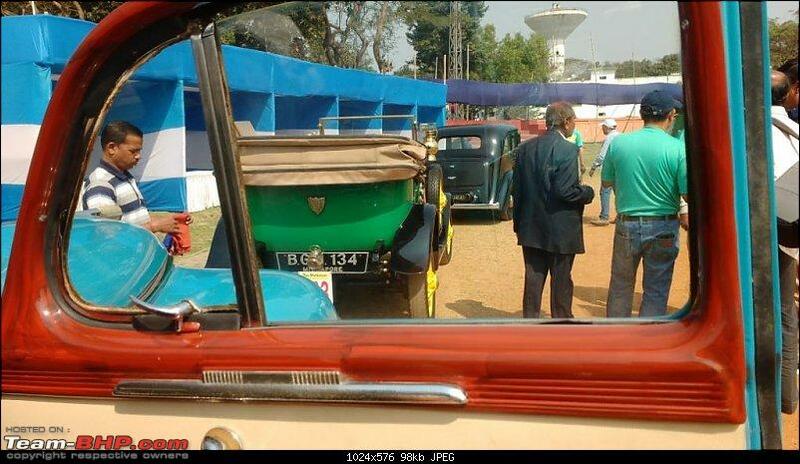 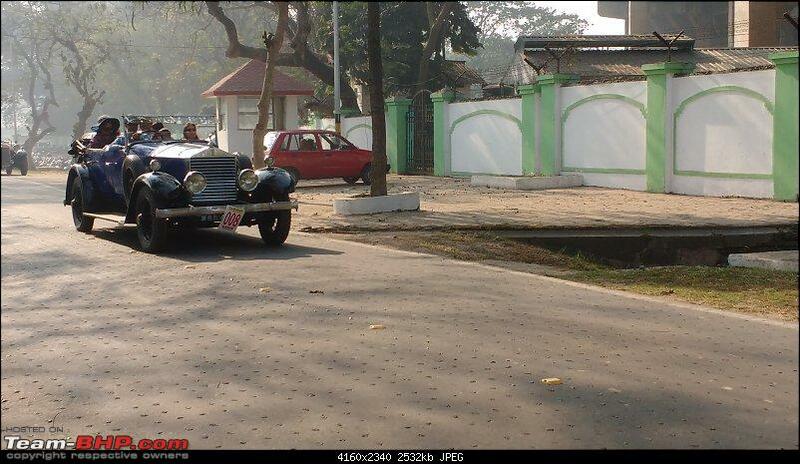 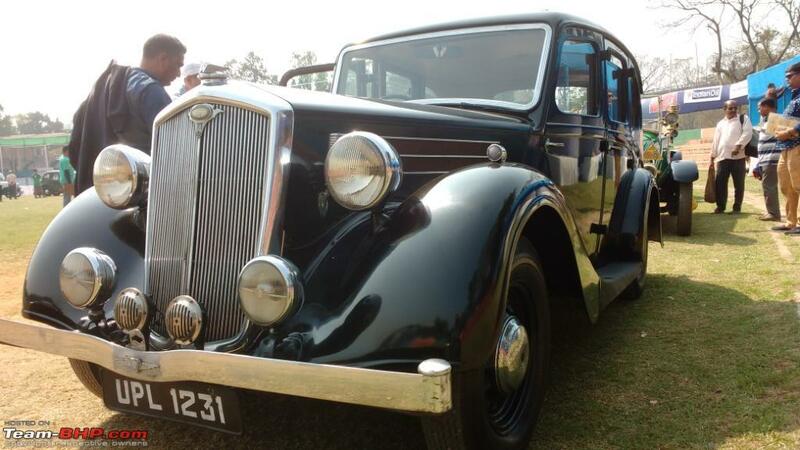 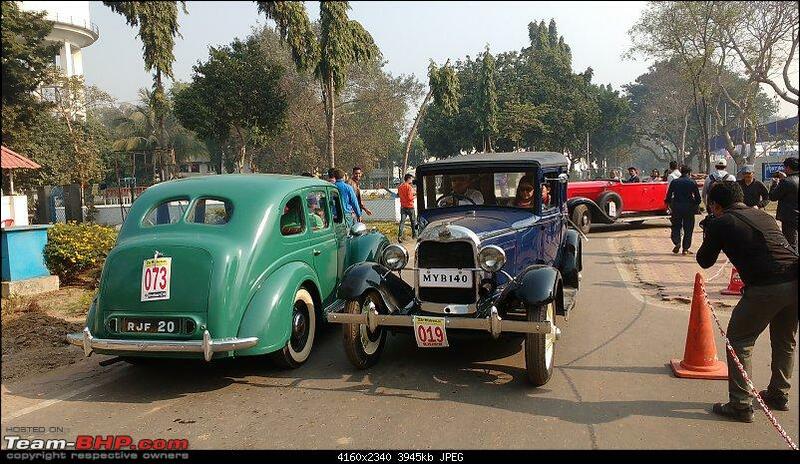 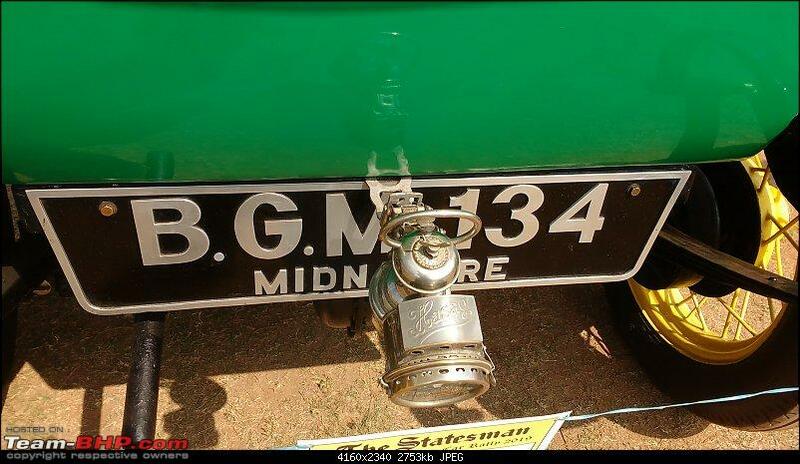 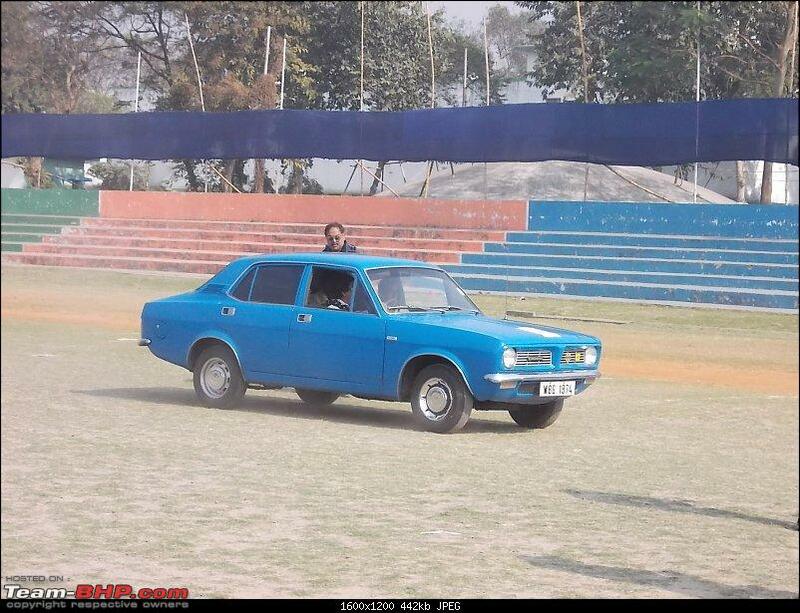 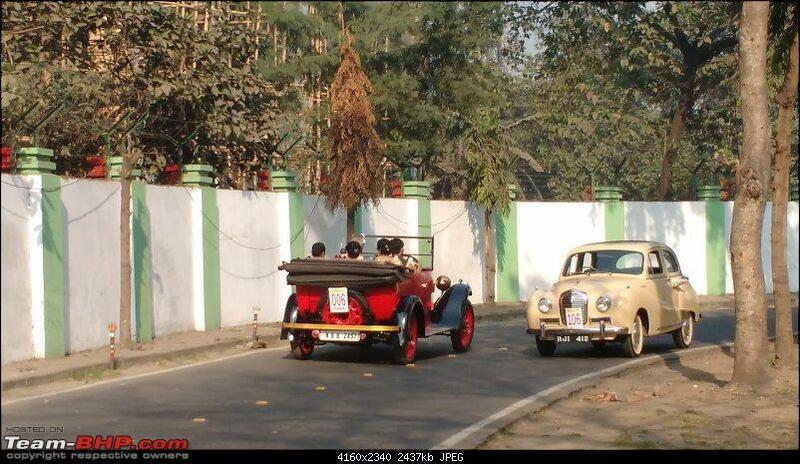 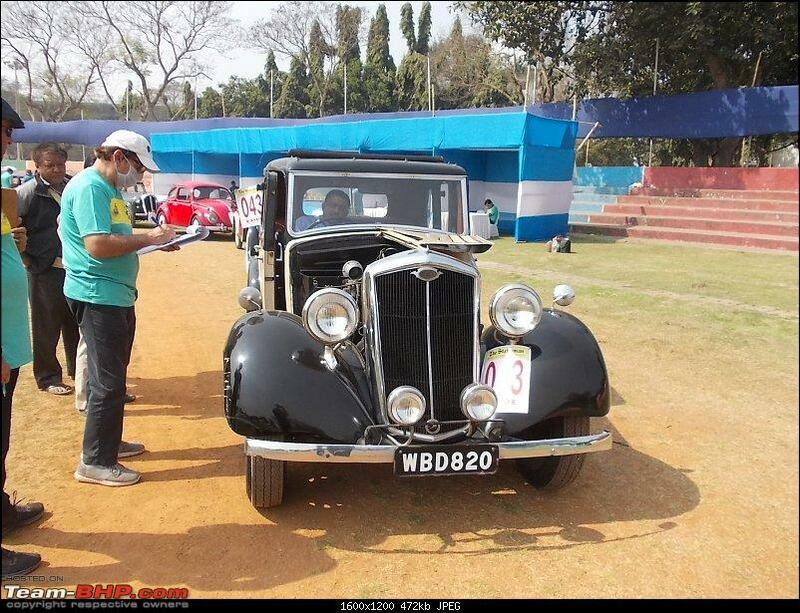 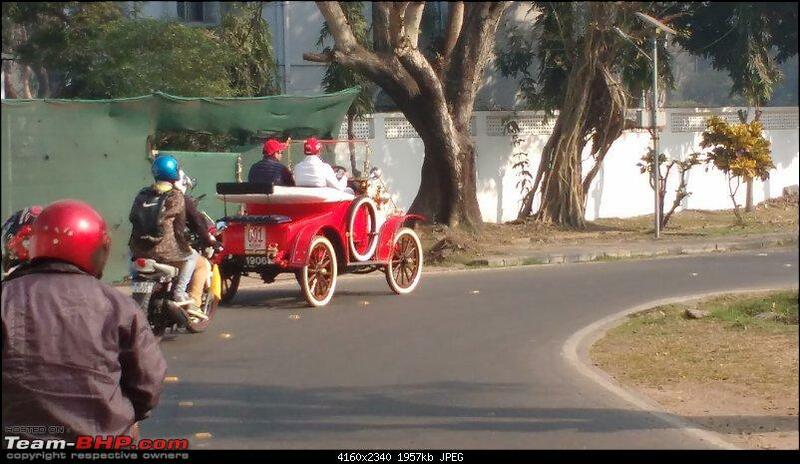 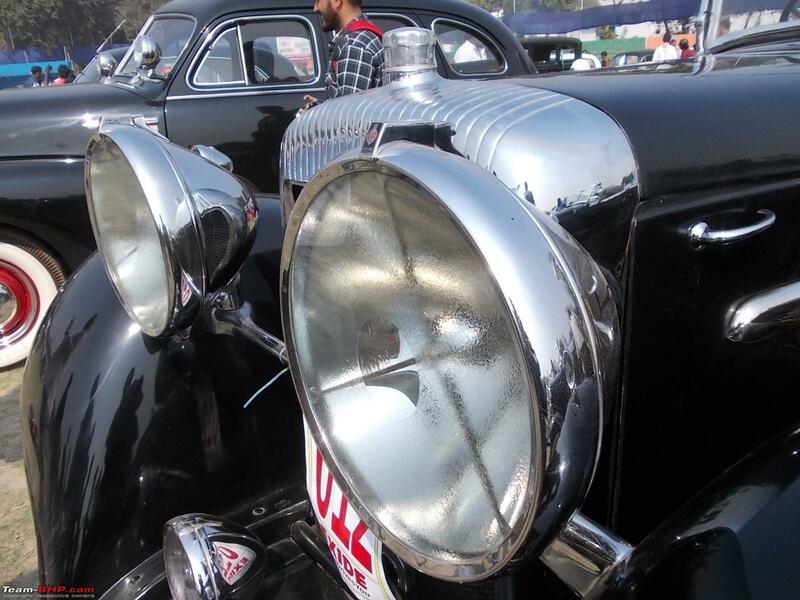 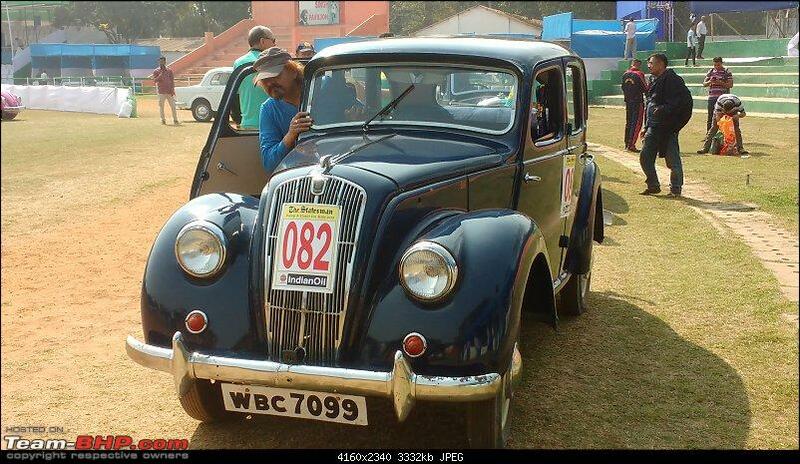 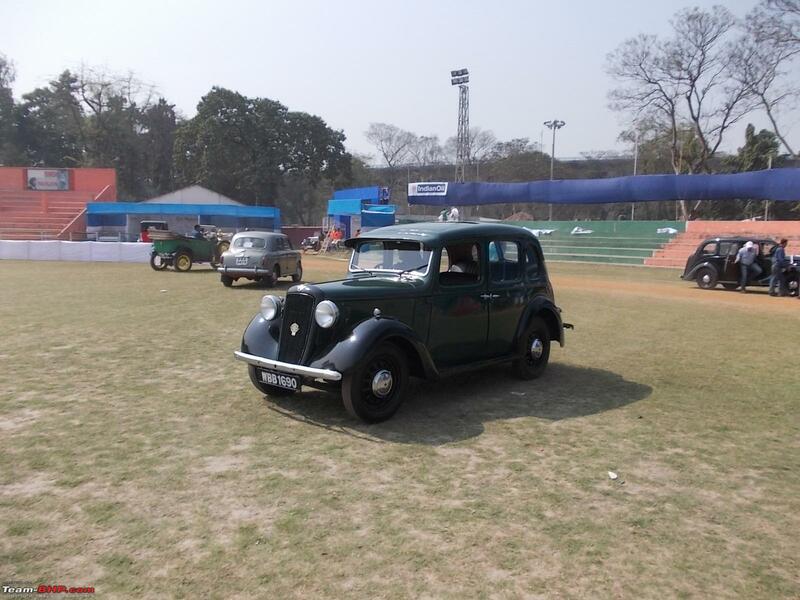 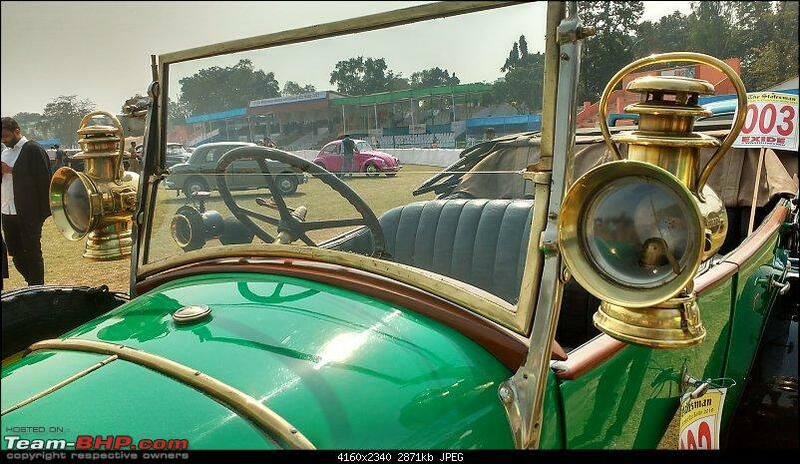 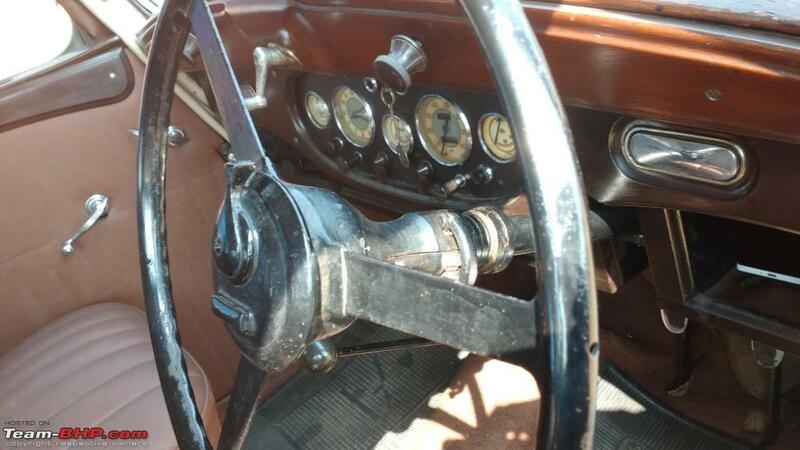 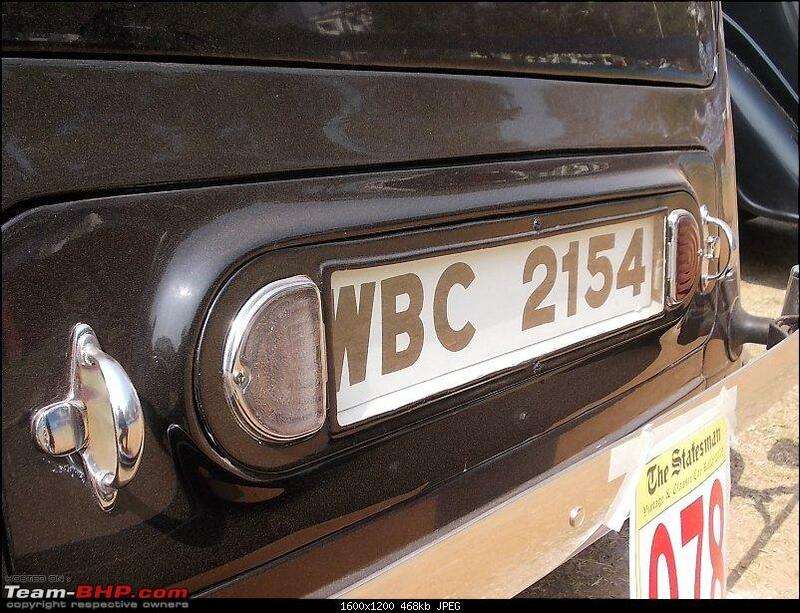 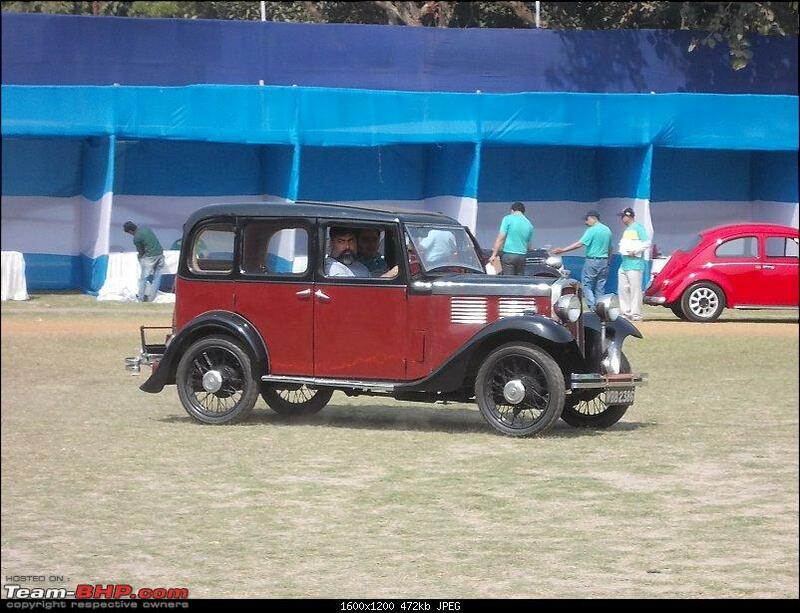 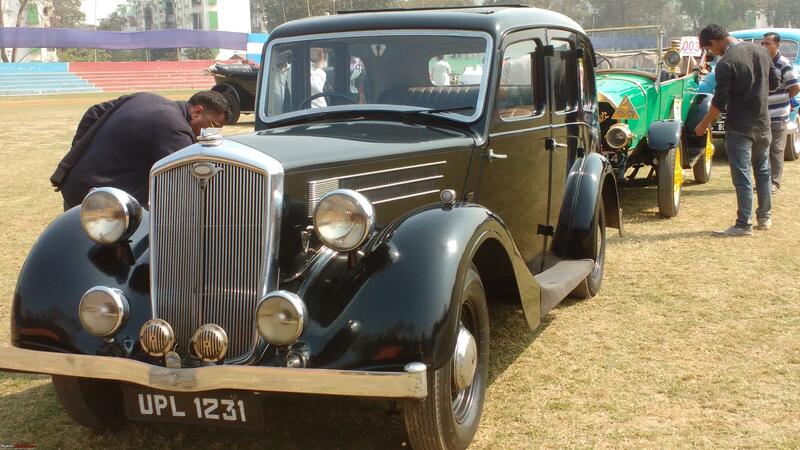 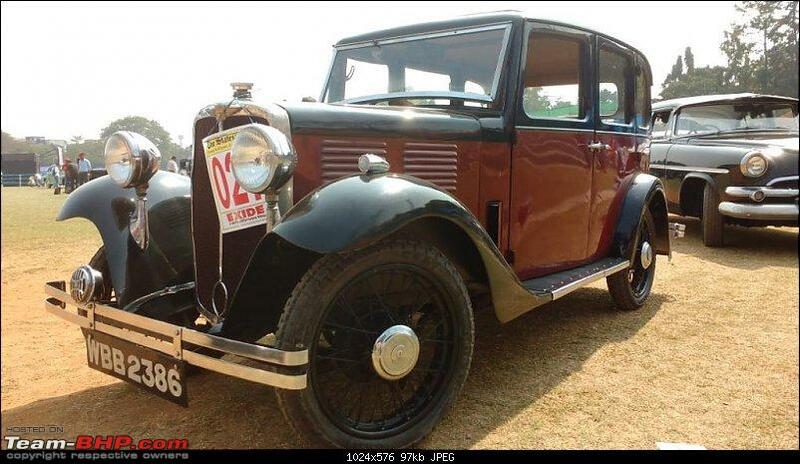 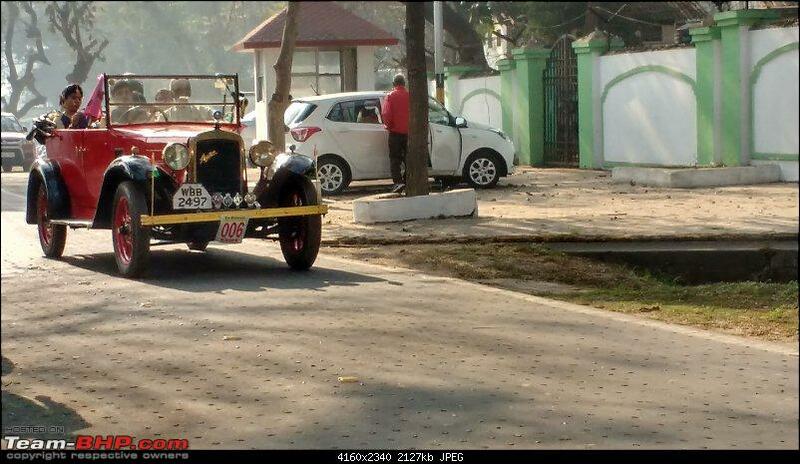 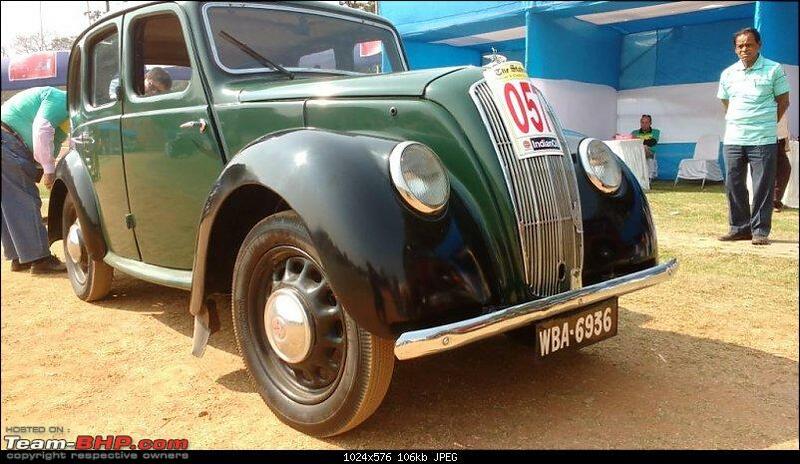 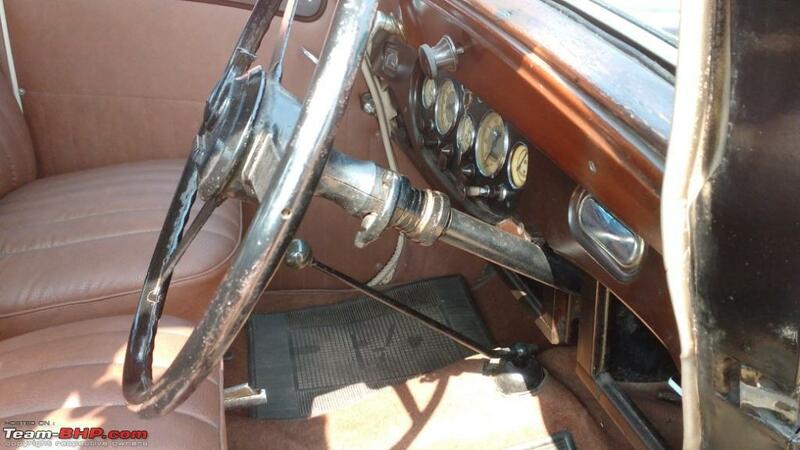 Always leads to Statesman Rally being the oldest car! 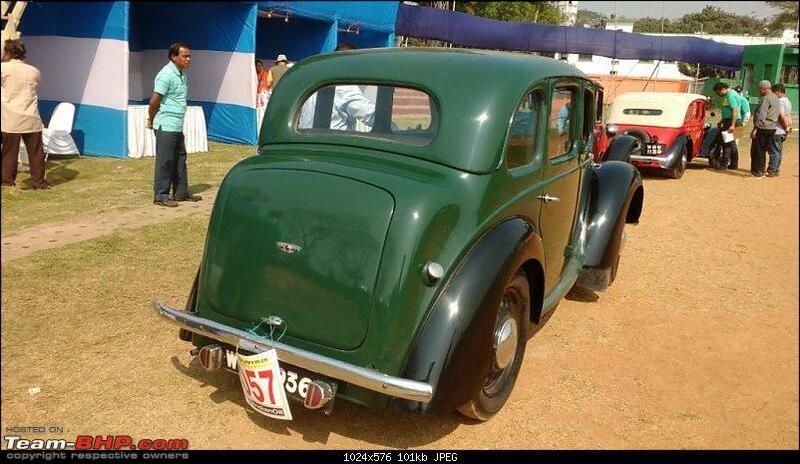 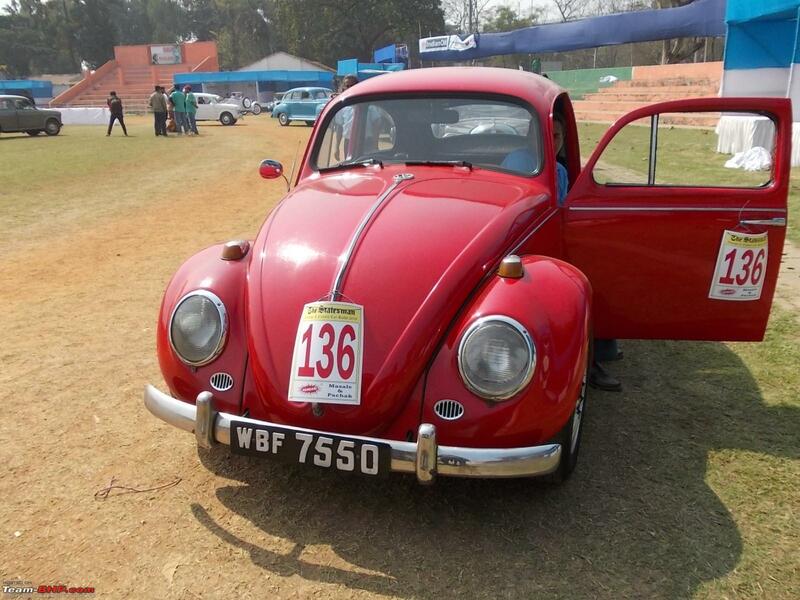 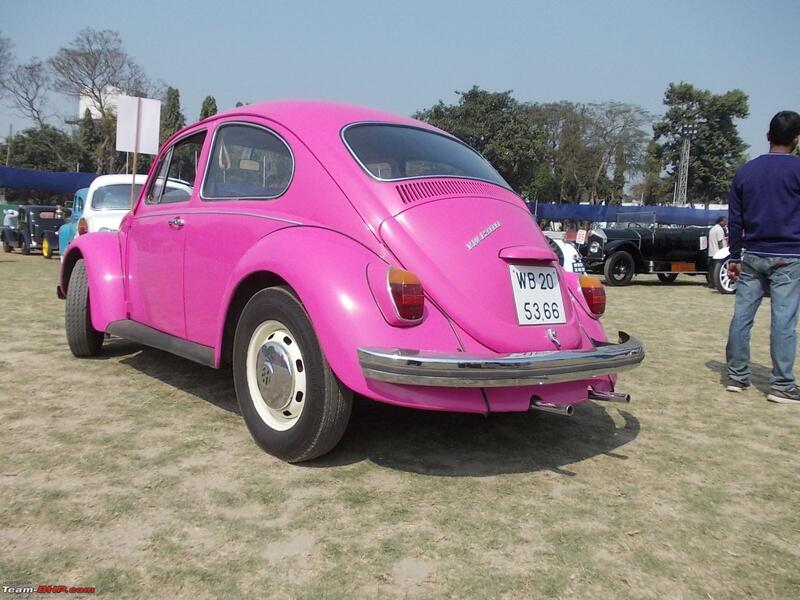 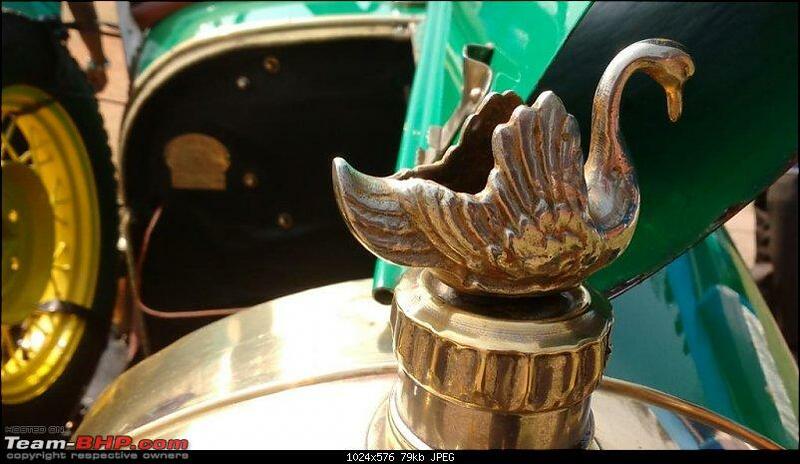 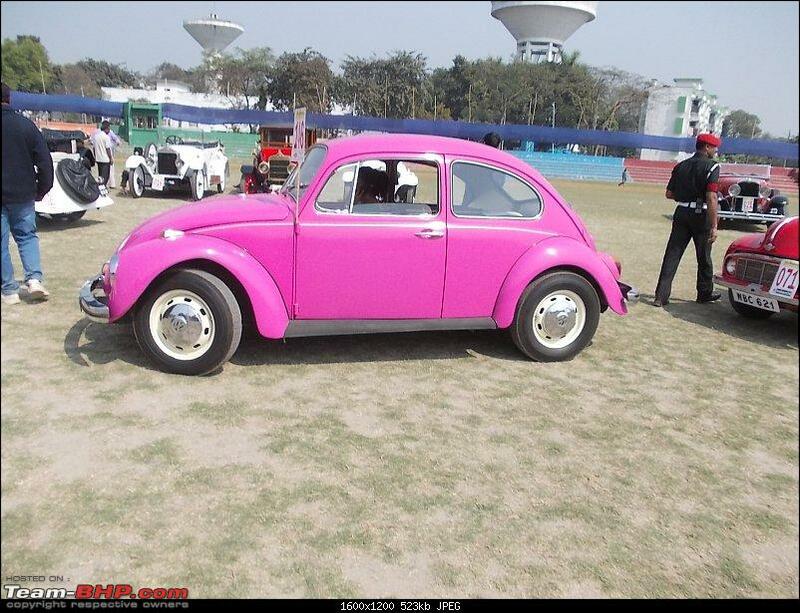 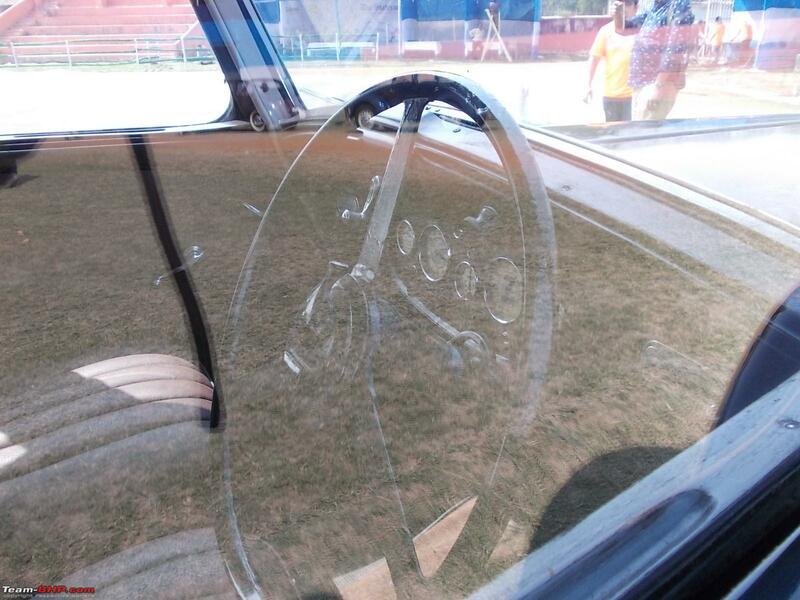 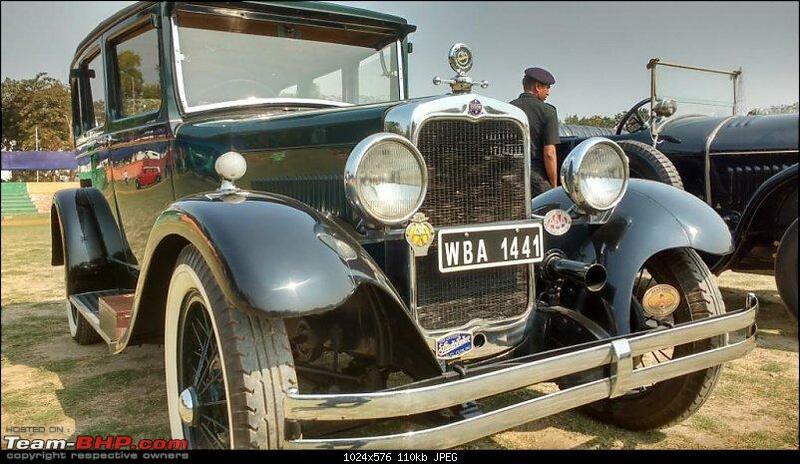 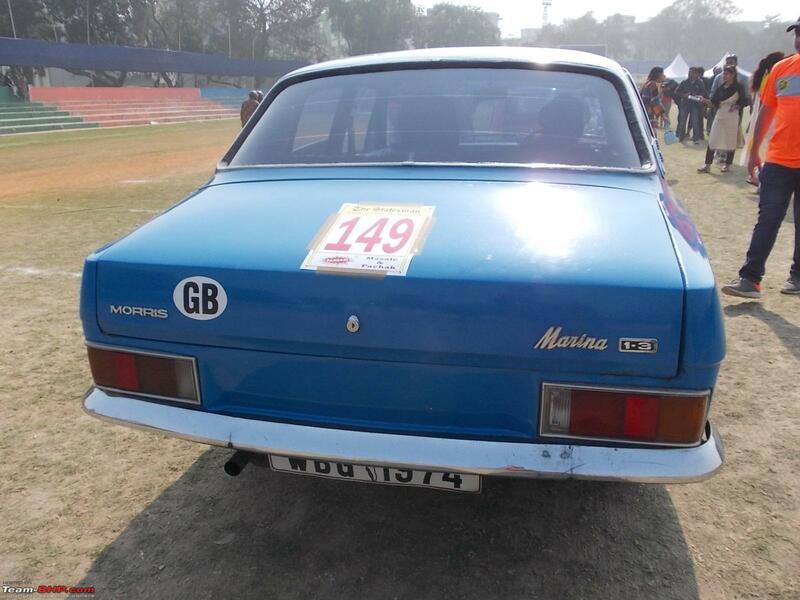 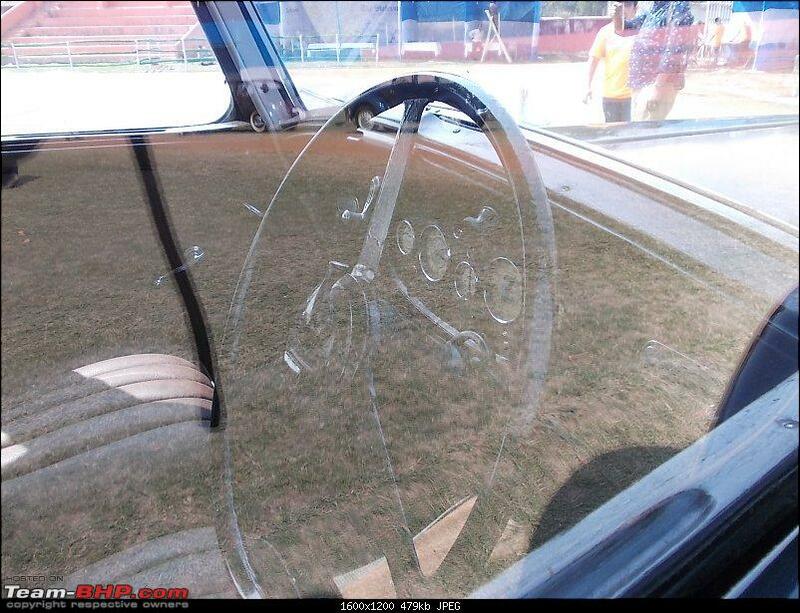 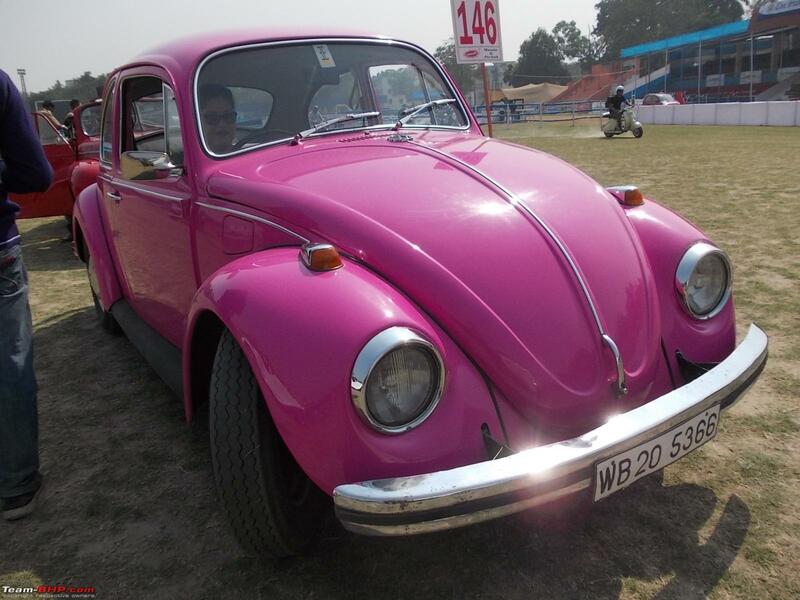 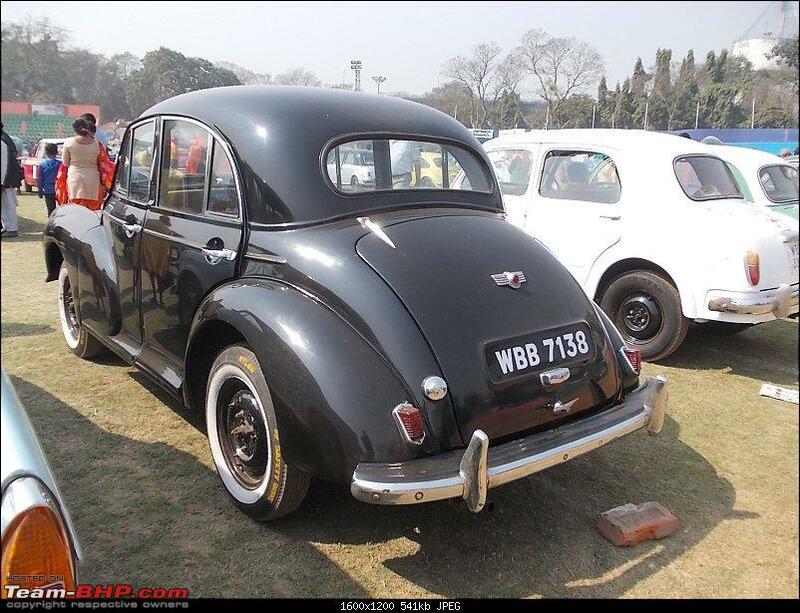 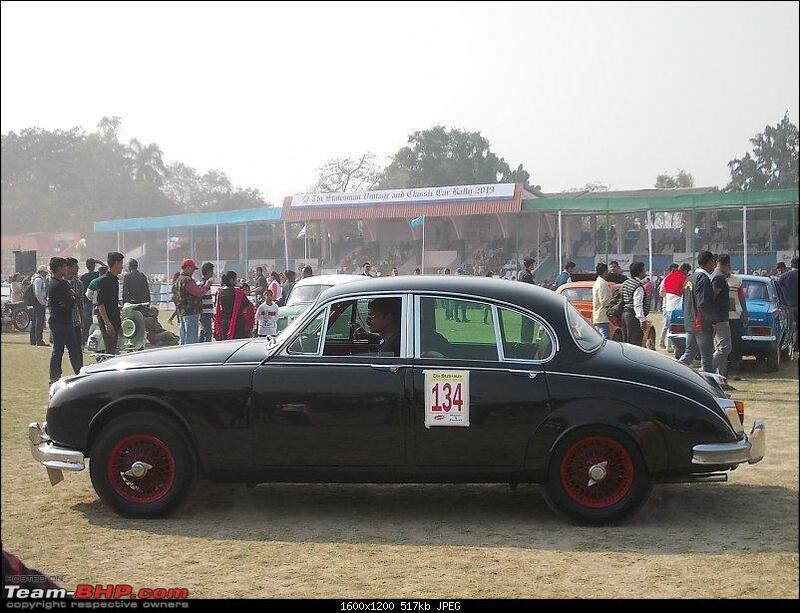 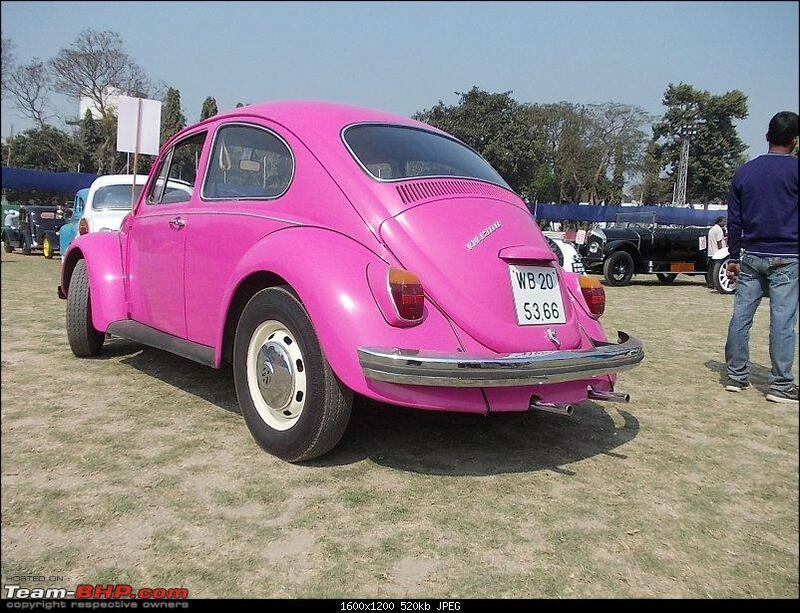 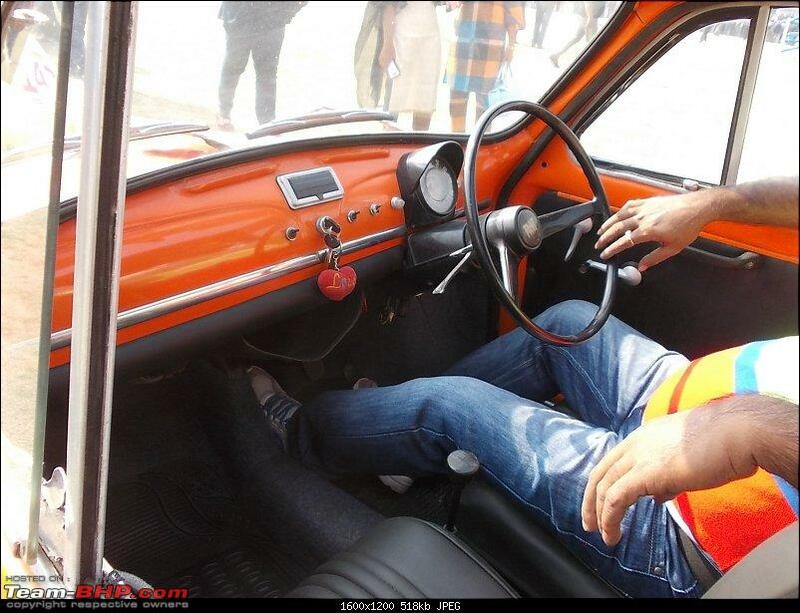 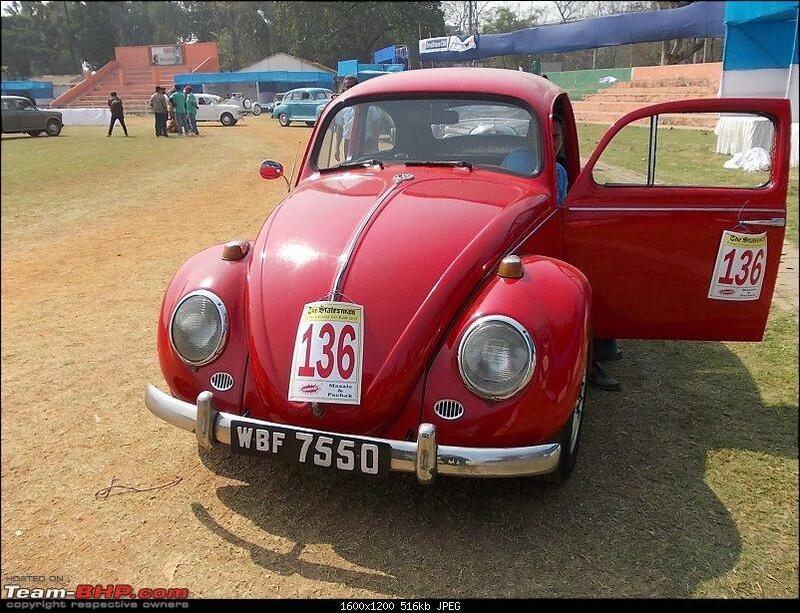 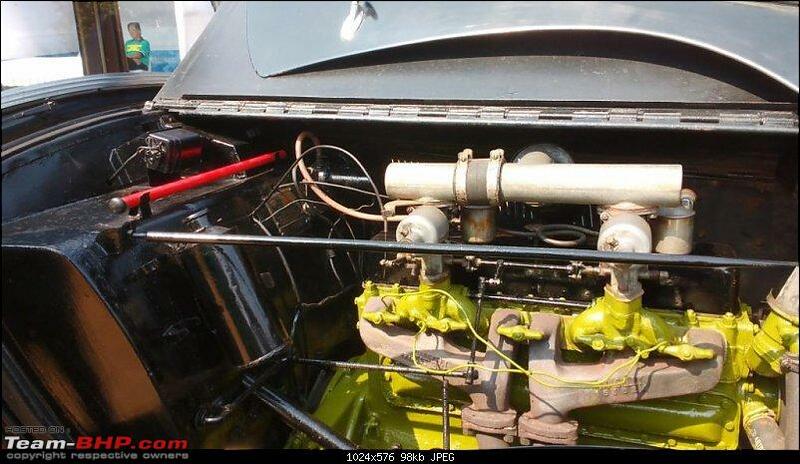 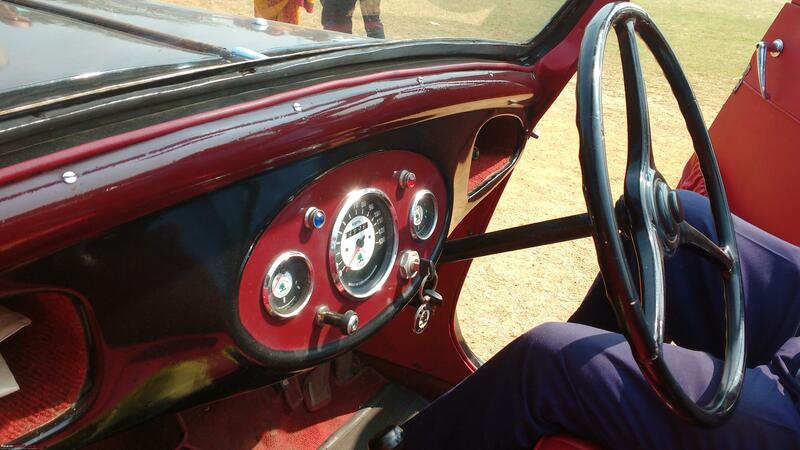 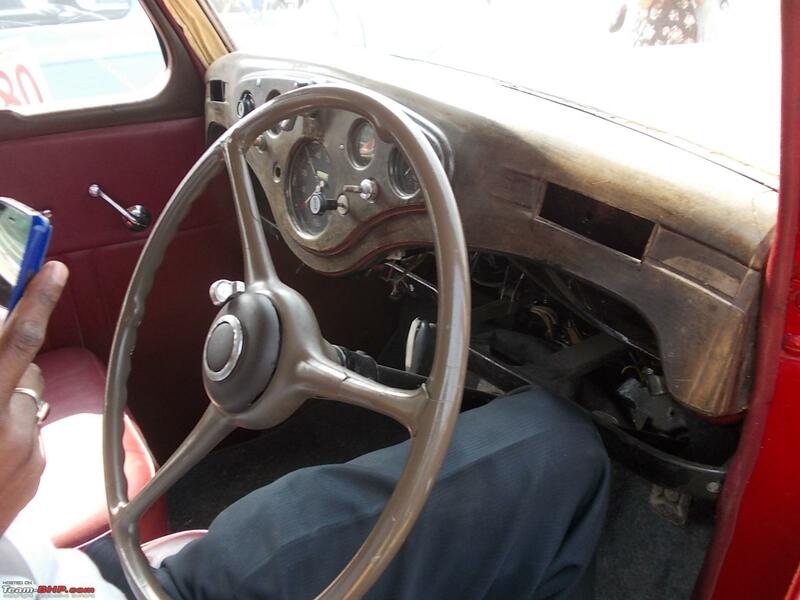 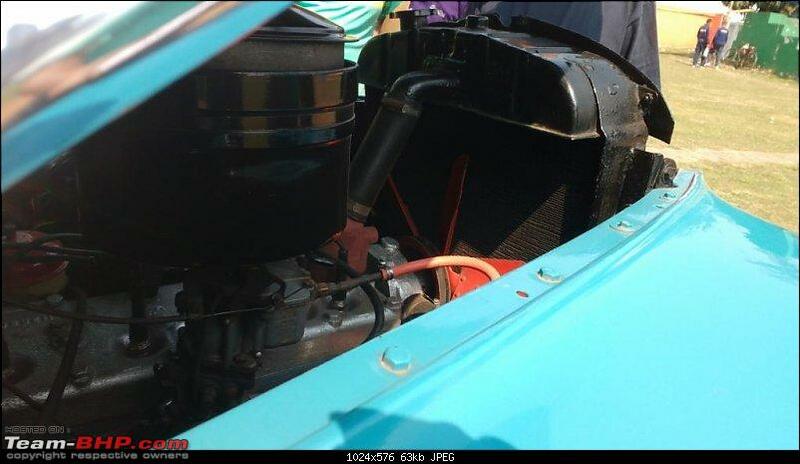 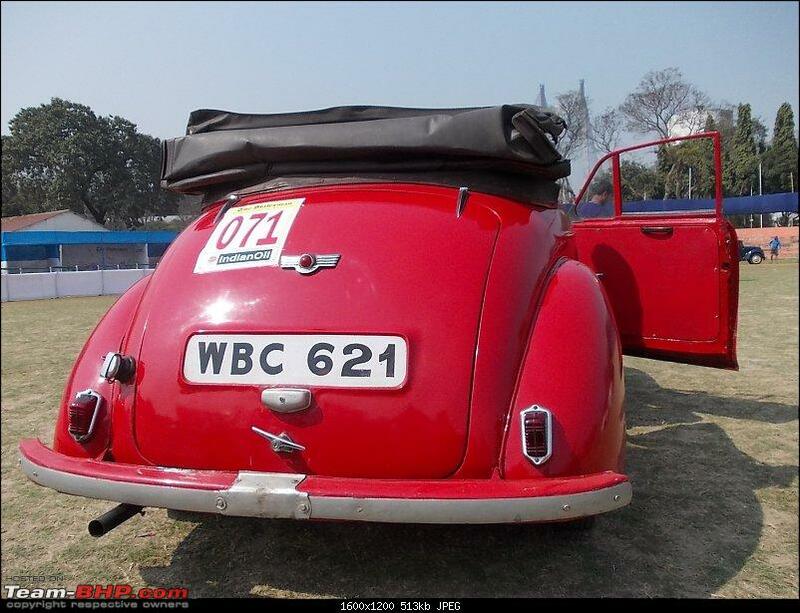 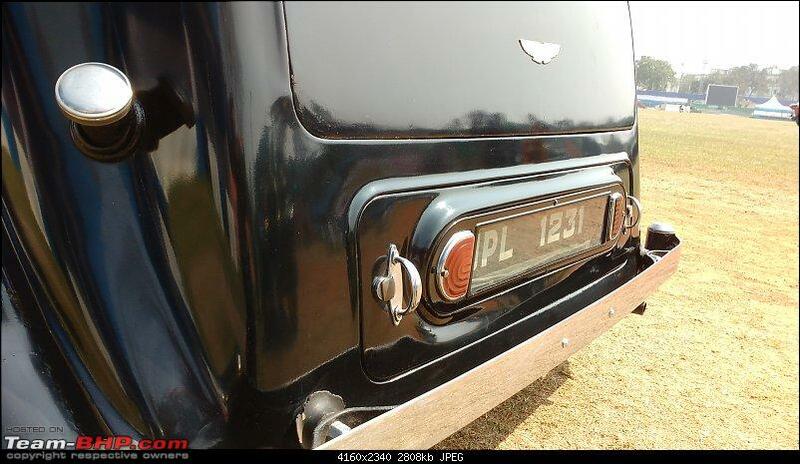 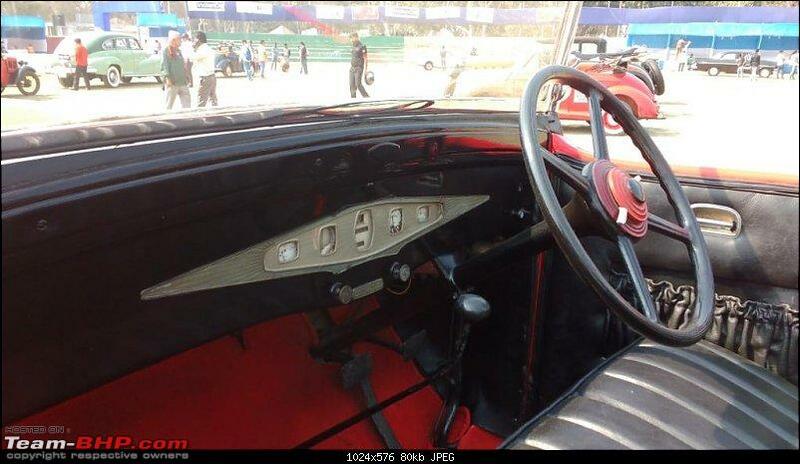 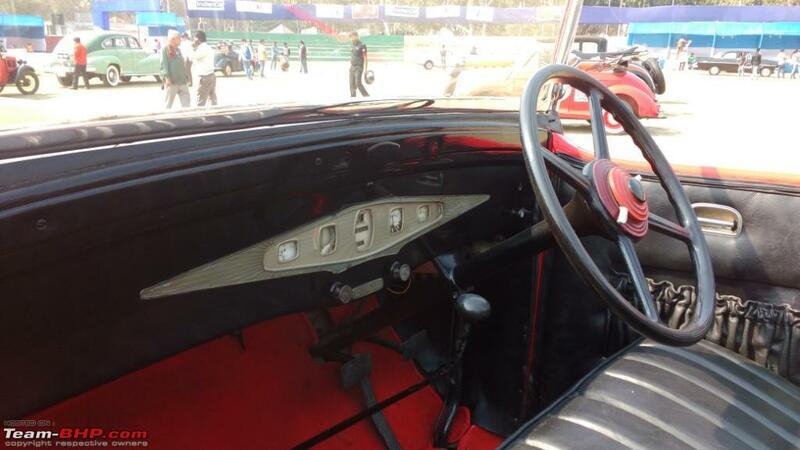 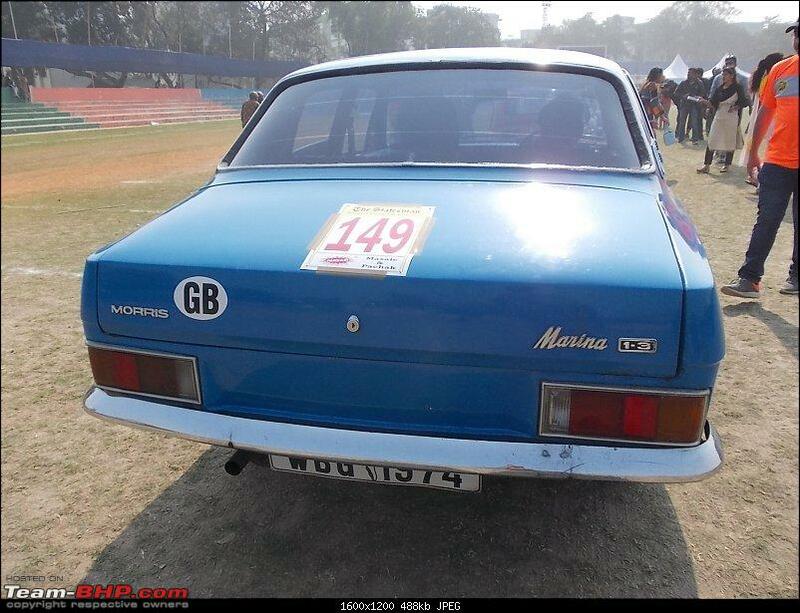 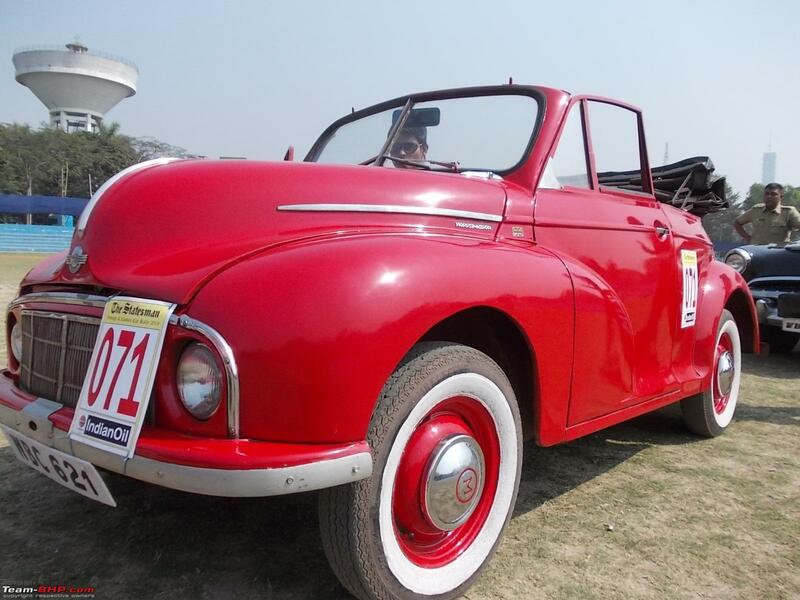 Shrivardhan Kanoria, has done a complete restoration on this car. 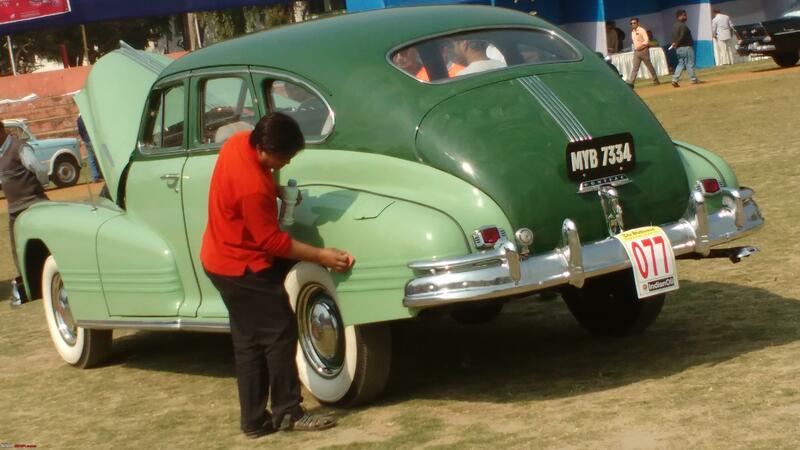 The quality of restoration is excellent and car looks outstanding. 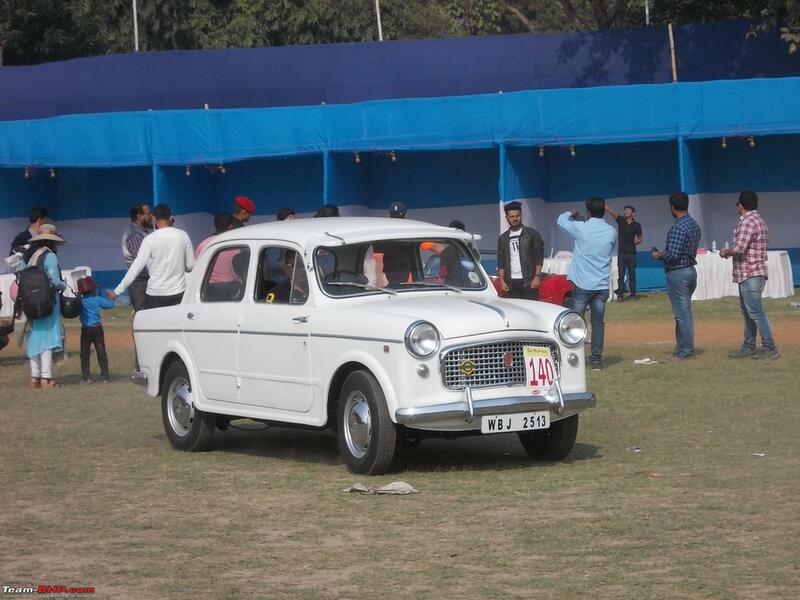 Attracted a lot of attention as she flawlessly performed in the rally. 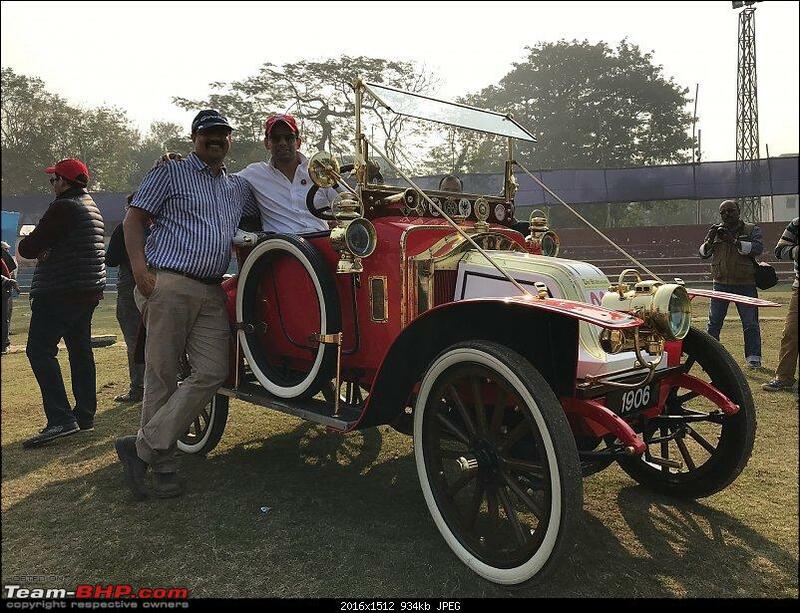 Shrivardhan and I pose for a TBHP photo! 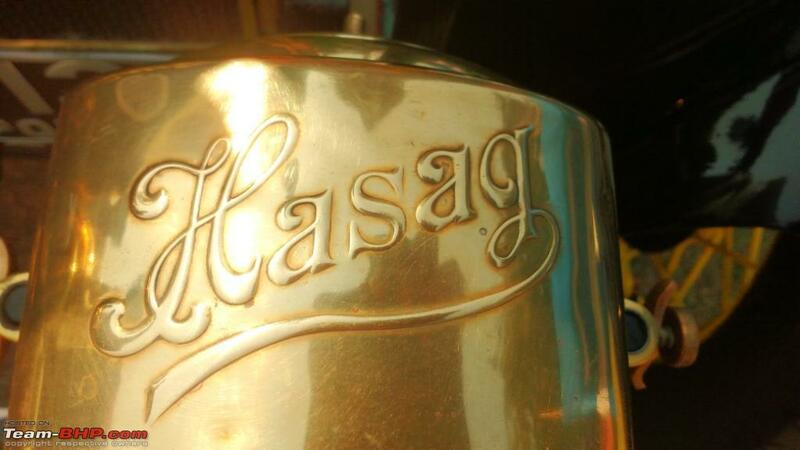 The main entrance to the venue banner! 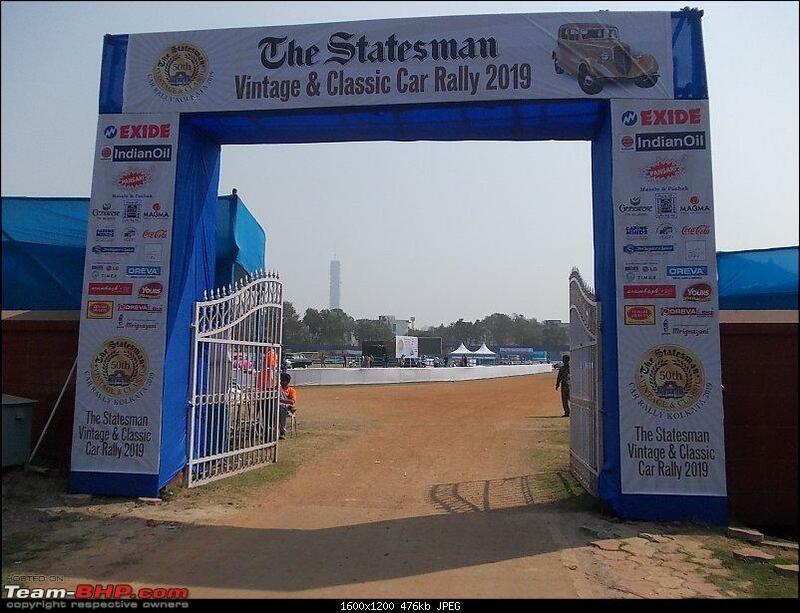 Also it set the record for the highest all time Judging Score in the Statesman Rally. 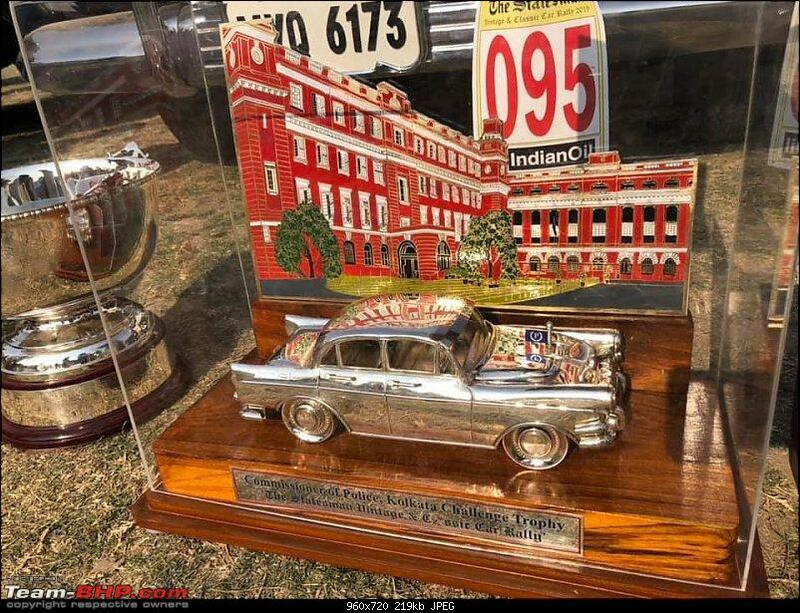 Considering that this was the 50th year, and topping the Judges Scoring Charts is no mean effort. 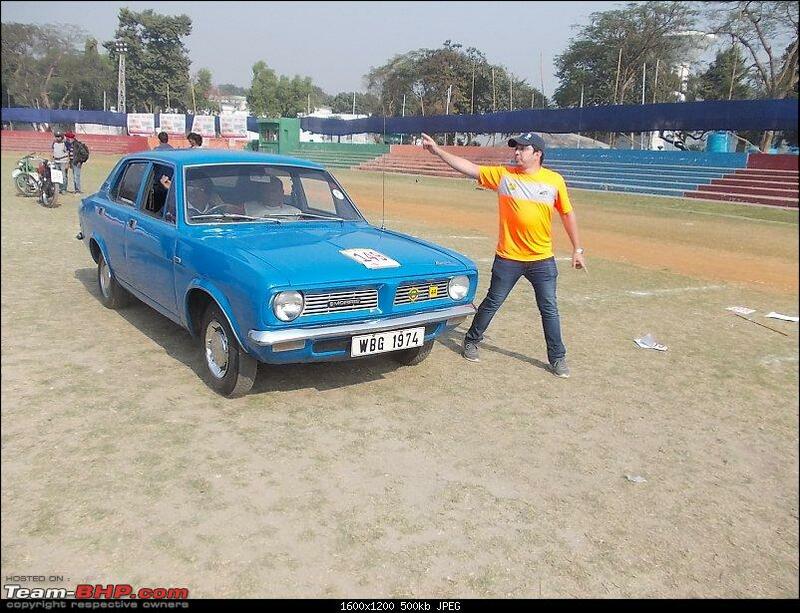 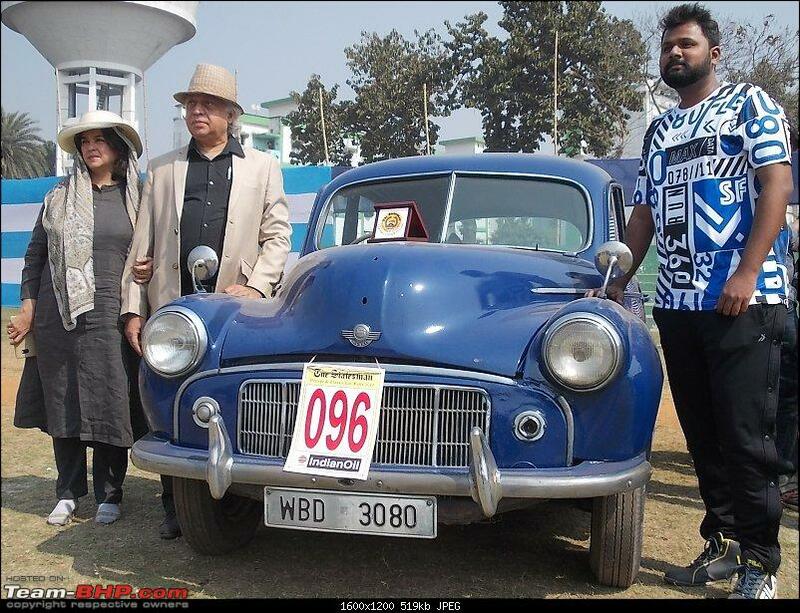 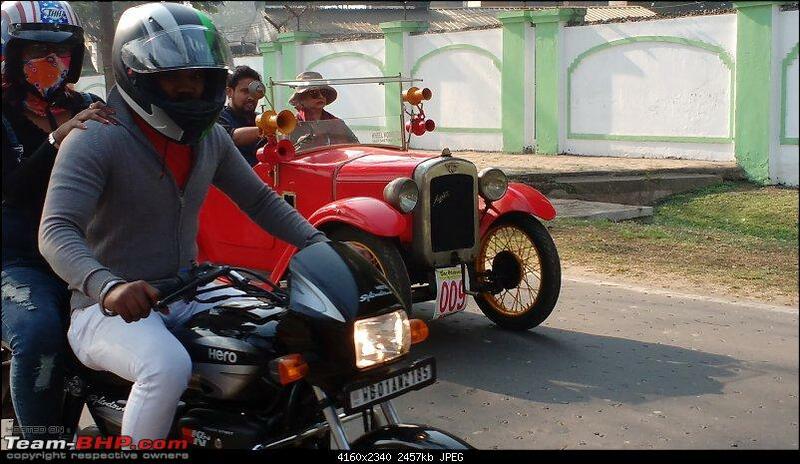 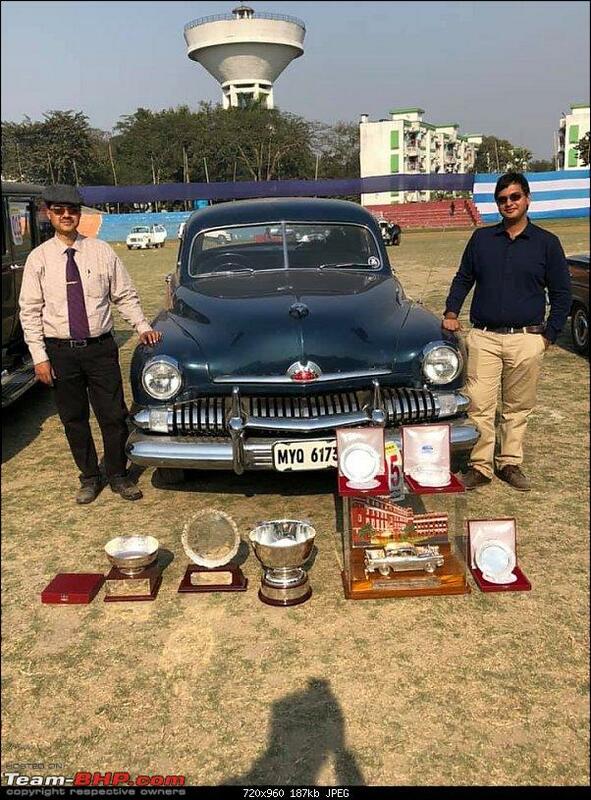 Congratulation to the Father & Son restoration team of Pallab and Saurav Roy, standing proudly with the car. 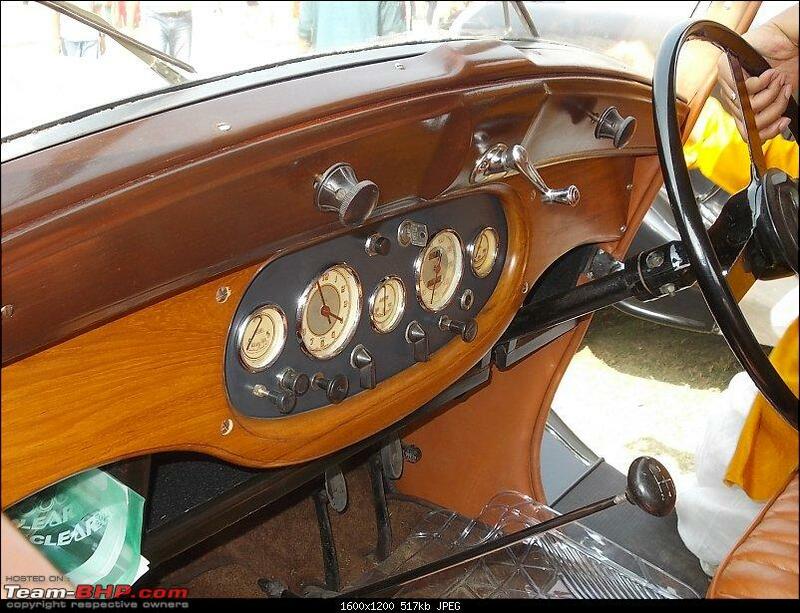 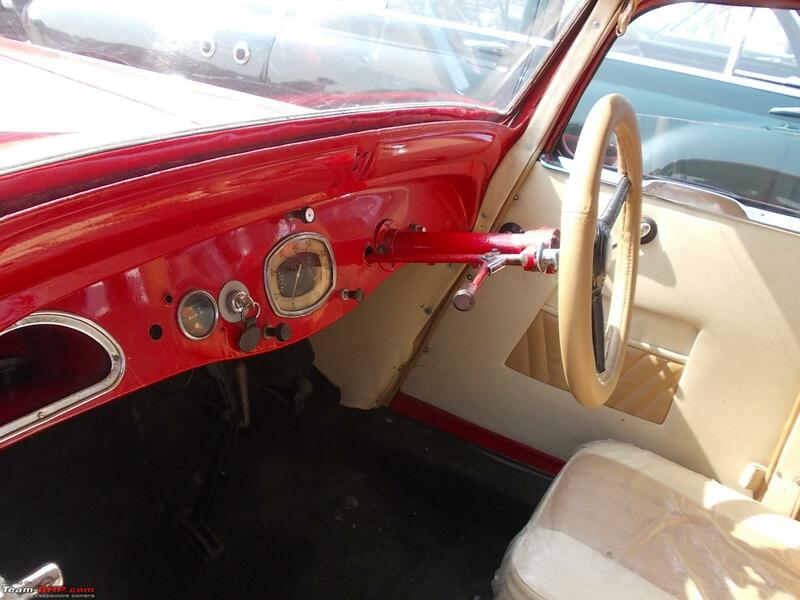 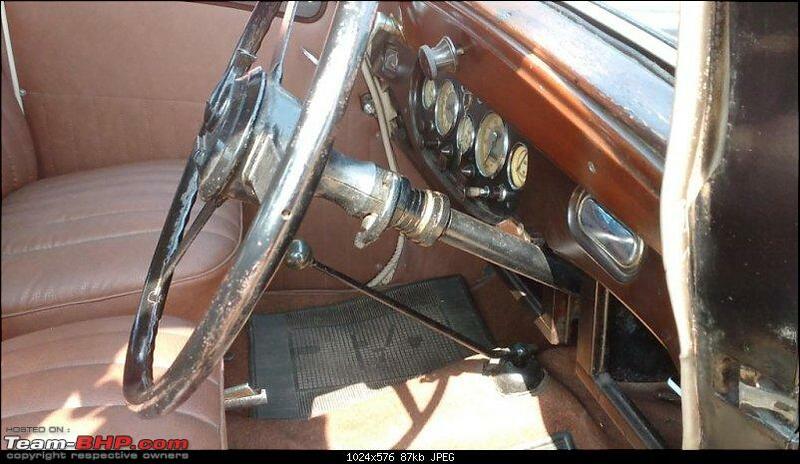 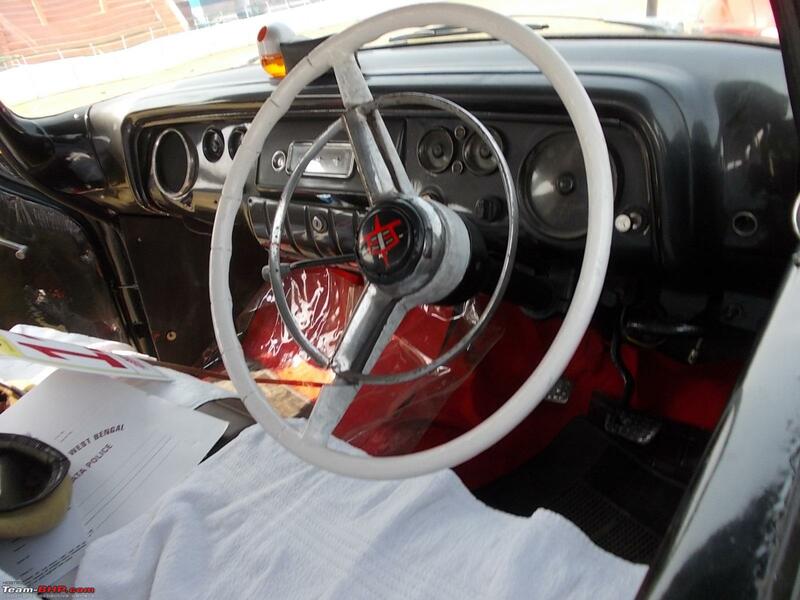 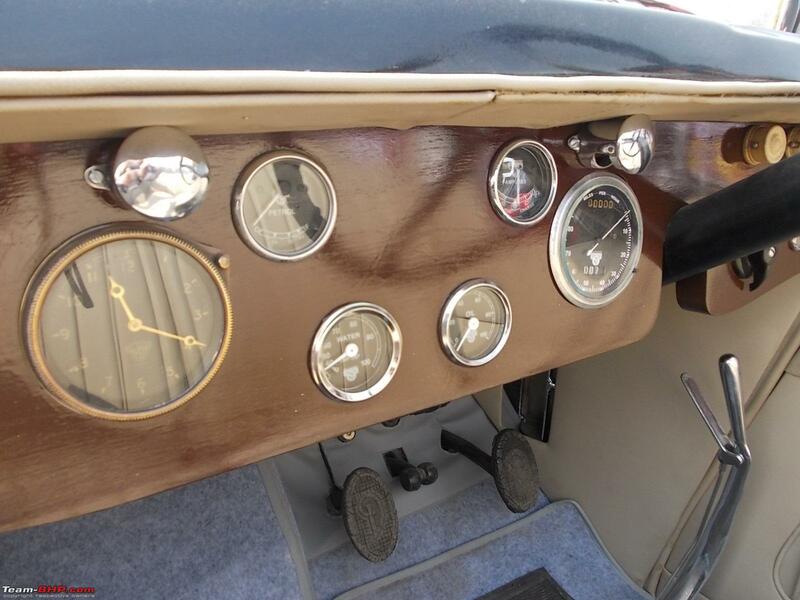 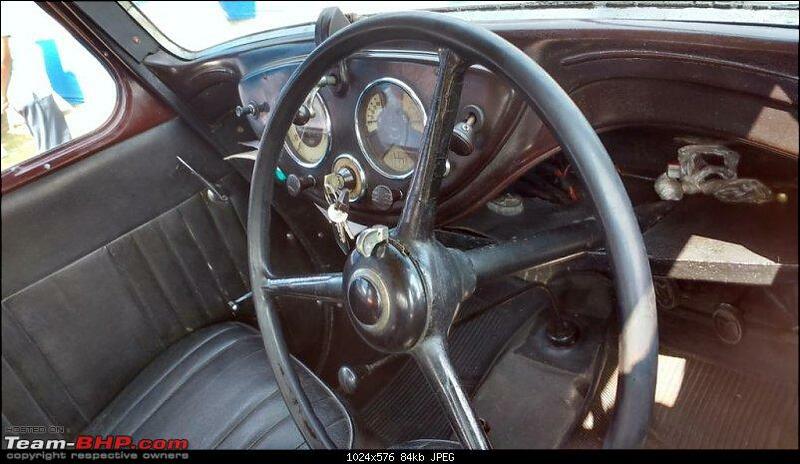 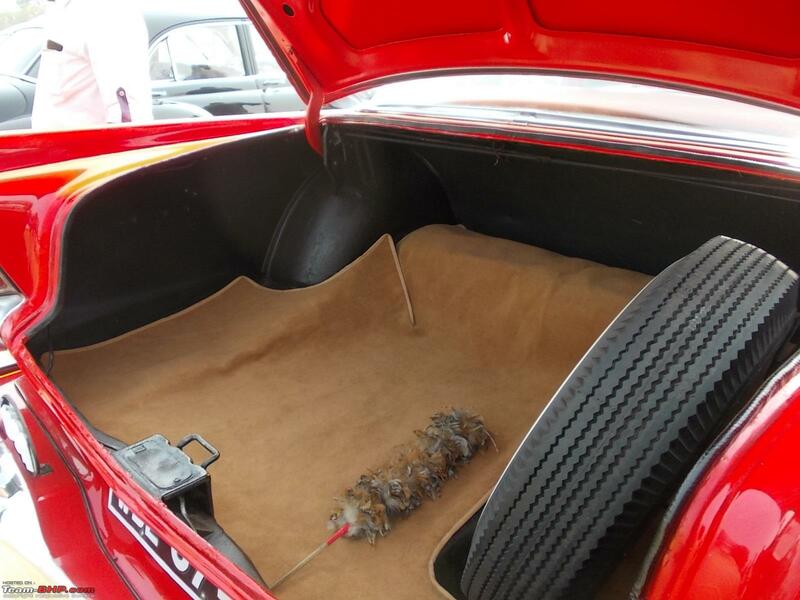 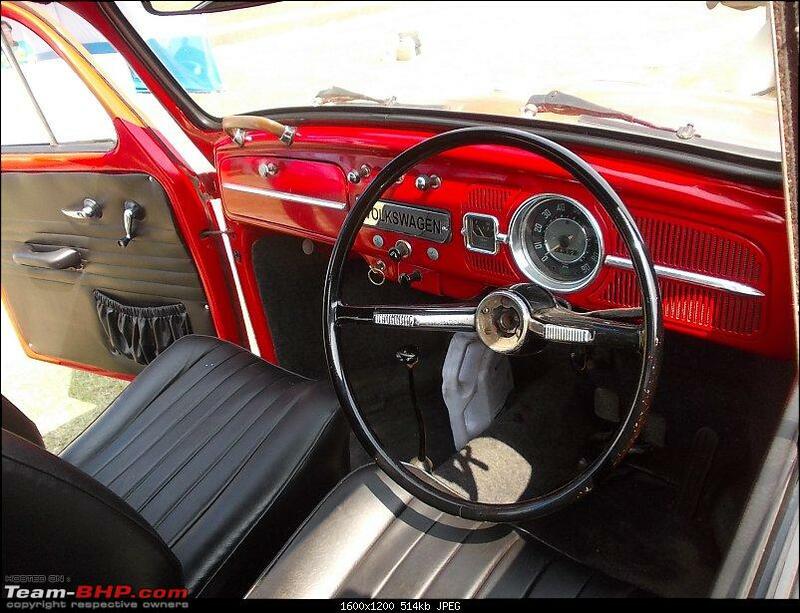 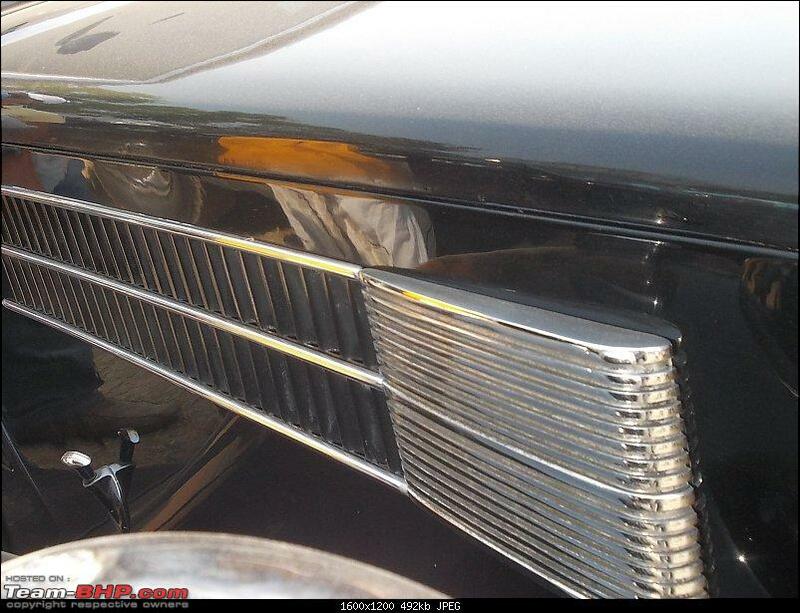 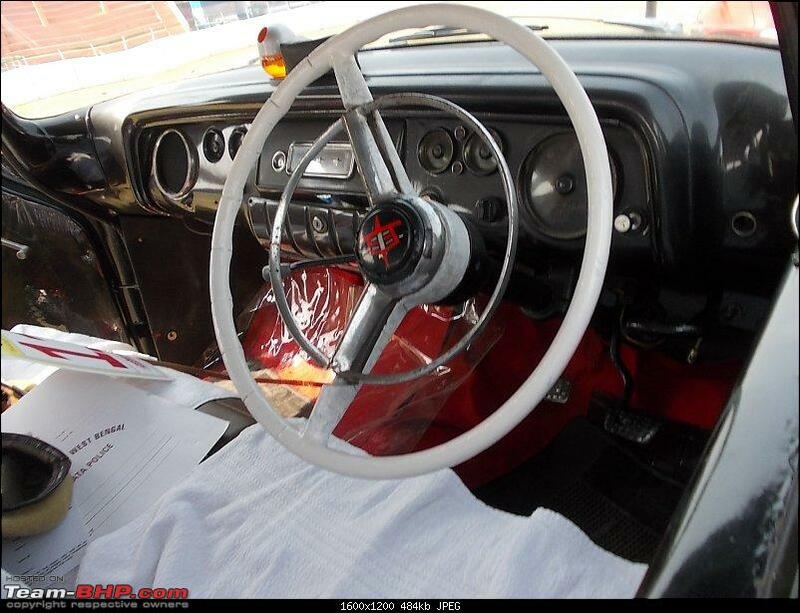 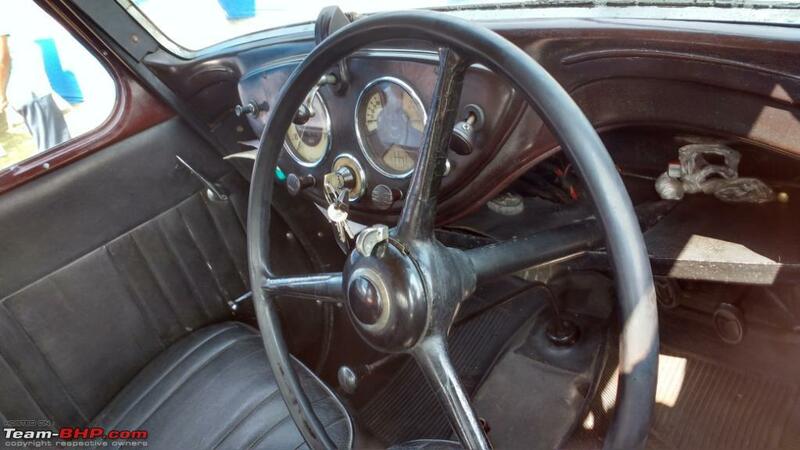 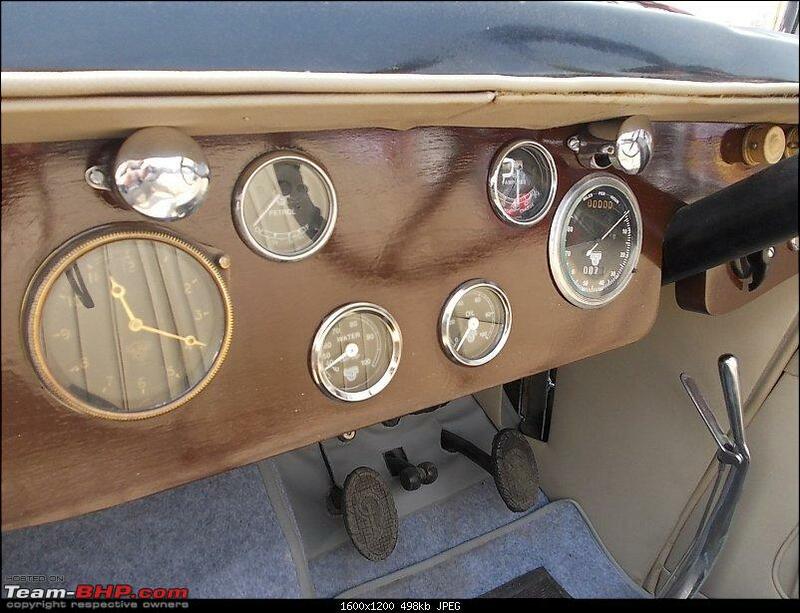 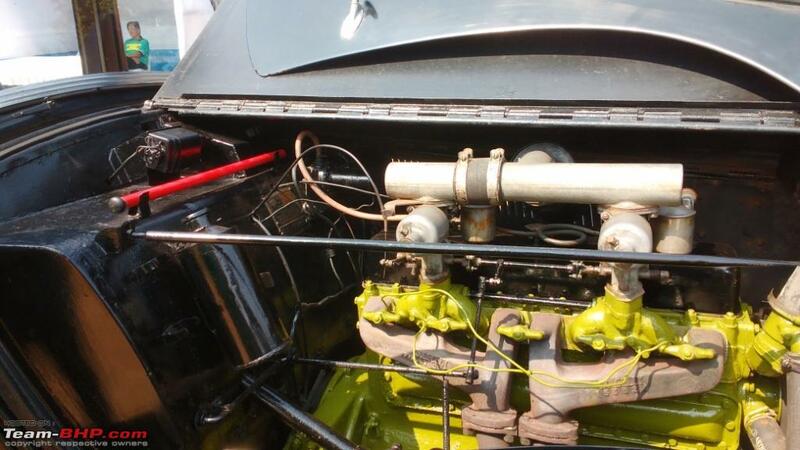 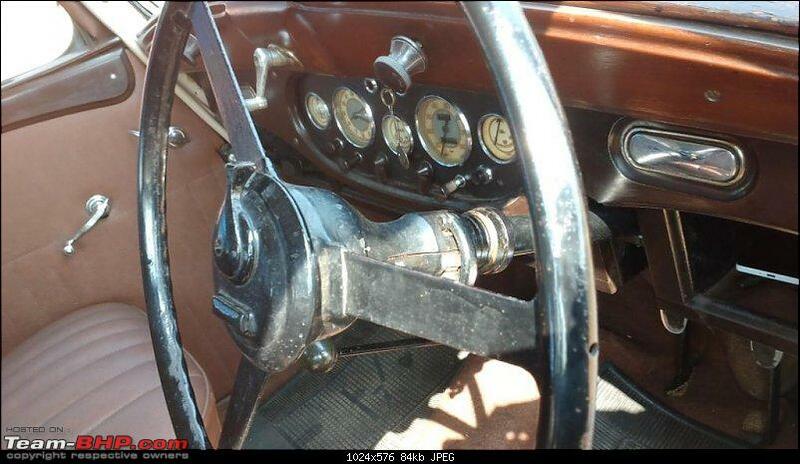 Considering that they are relatively new to the restoration business, they have set very high standards. 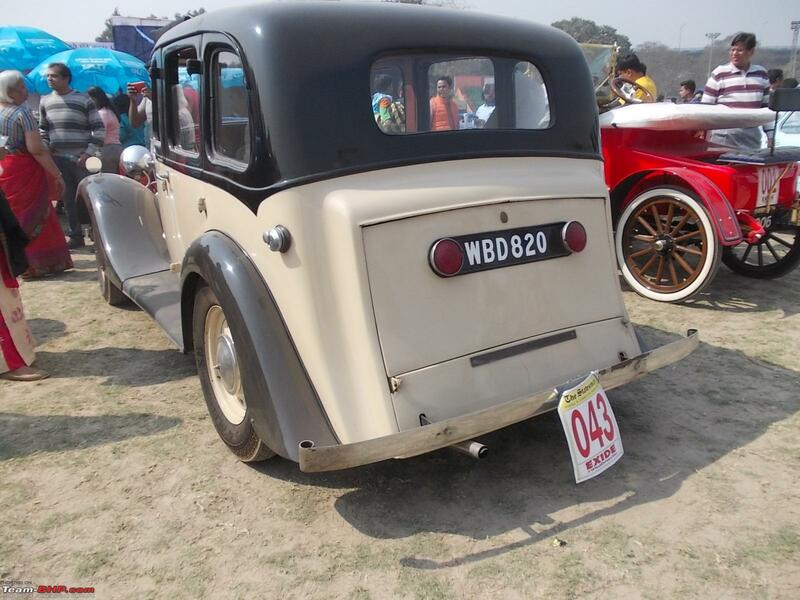 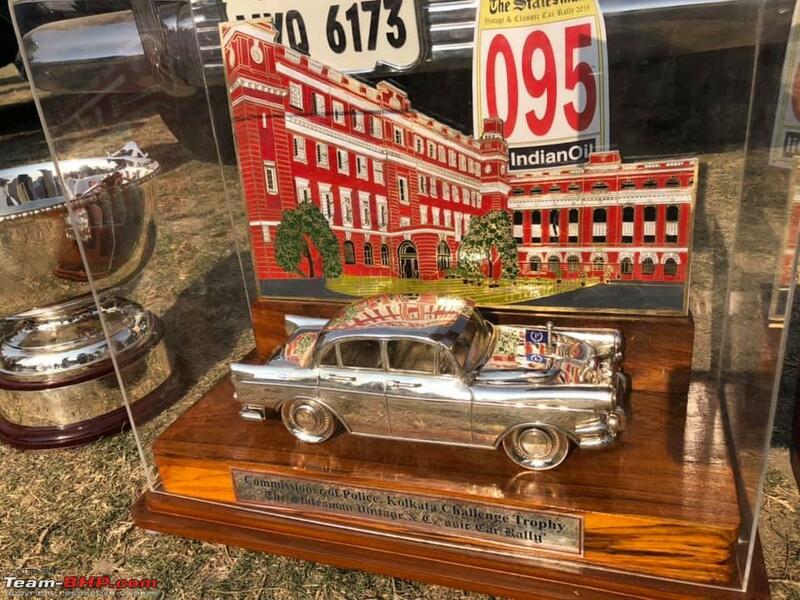 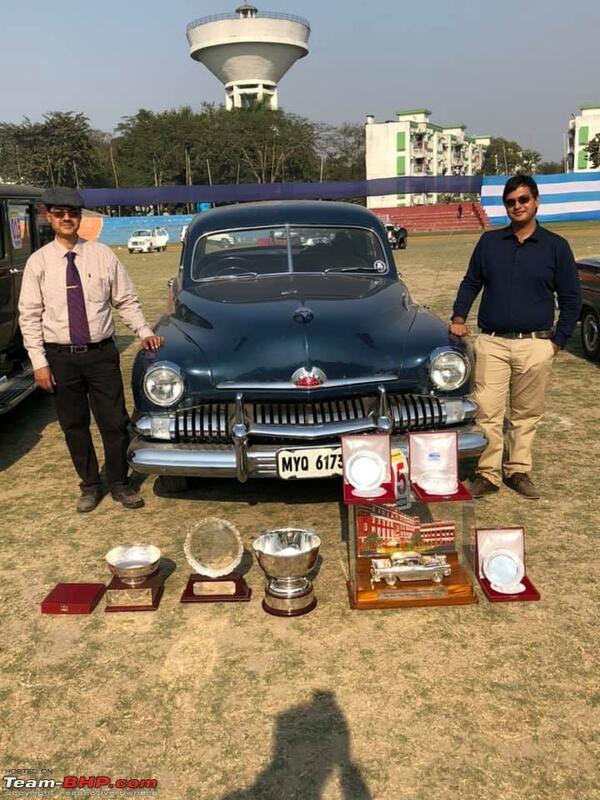 For this unassuming father and son duo, to score that highest ever Judges Score, that too in the landmark the 50th edition, is a massive achievement One must remember that Kolkata boast of some veteran and very high quality restorers. 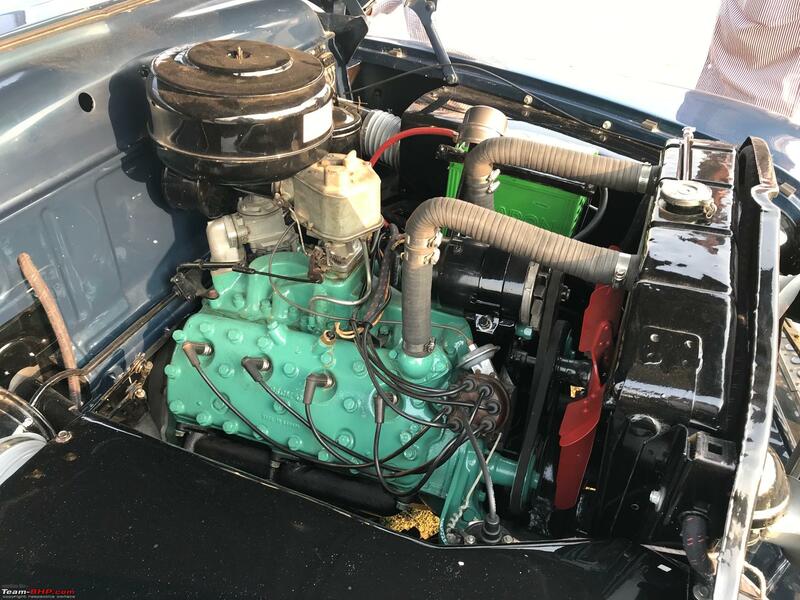 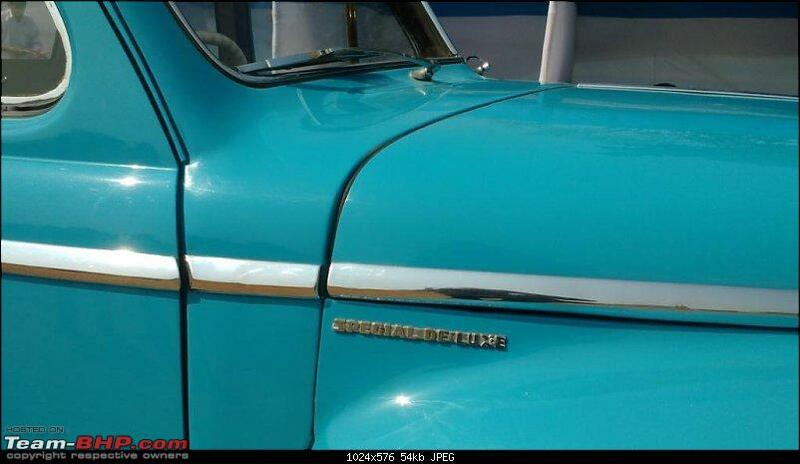 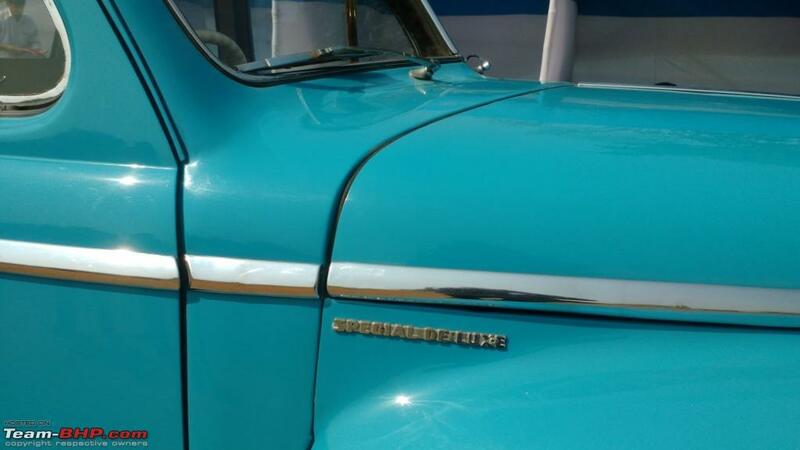 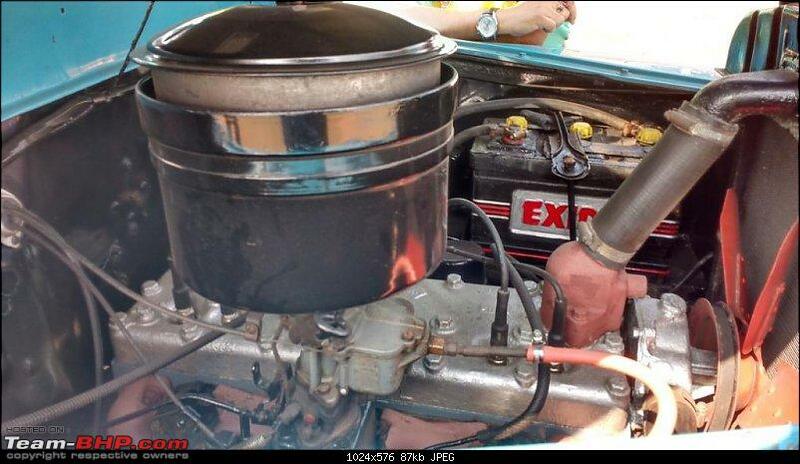 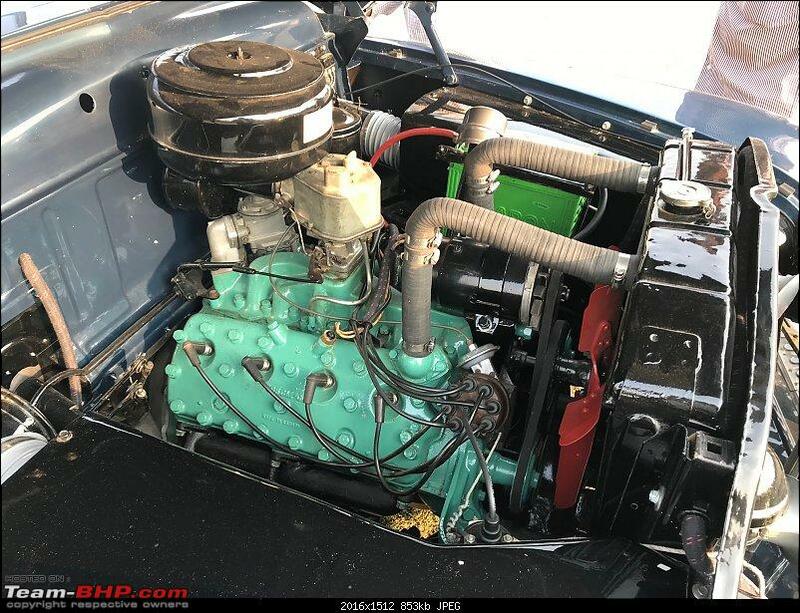 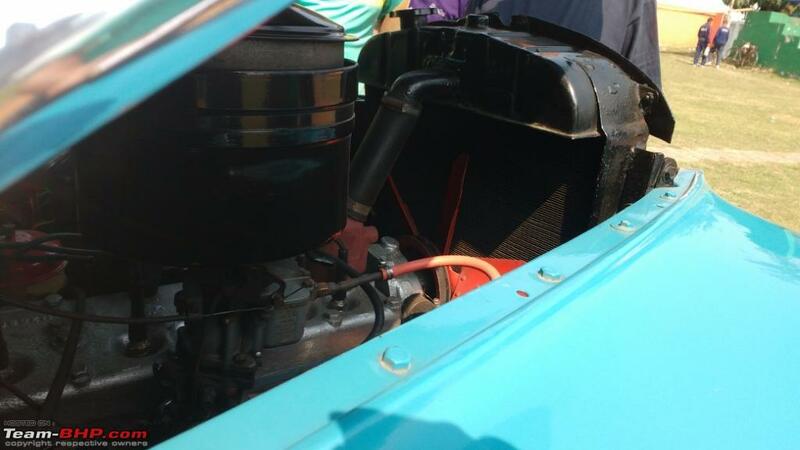 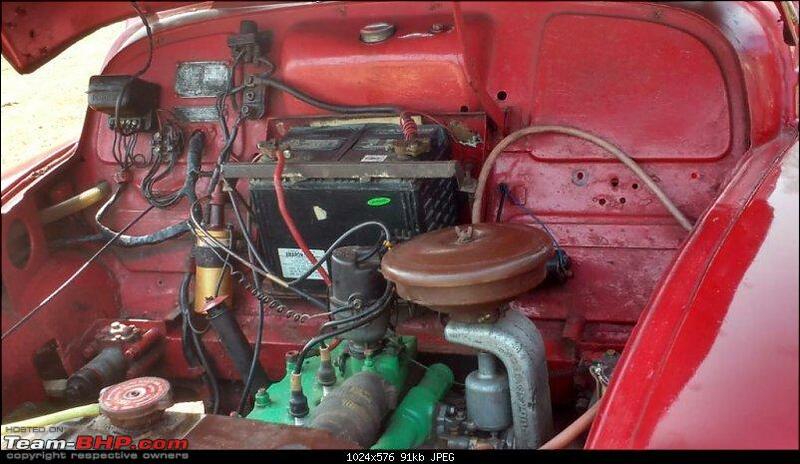 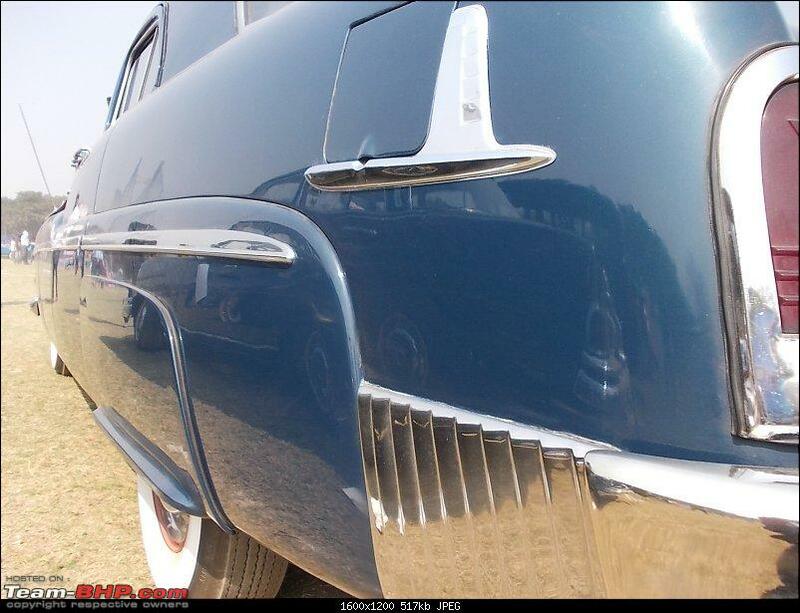 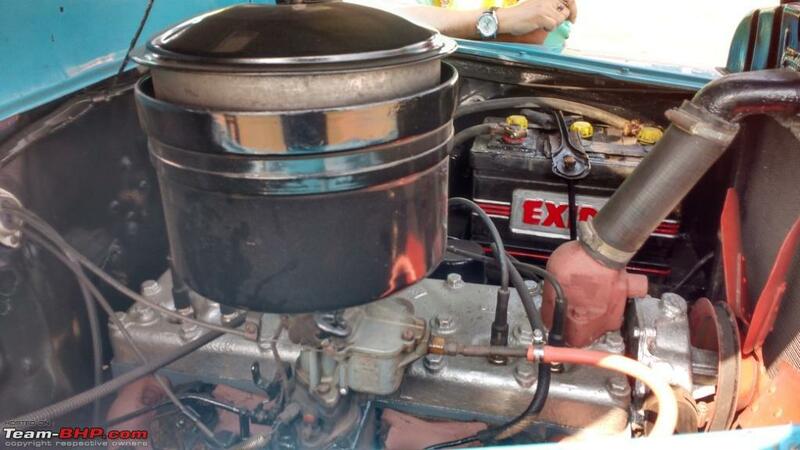 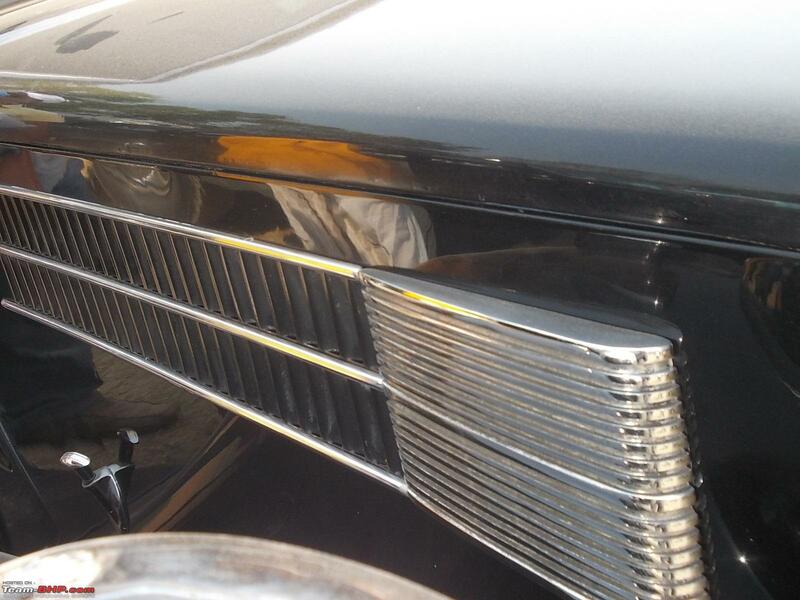 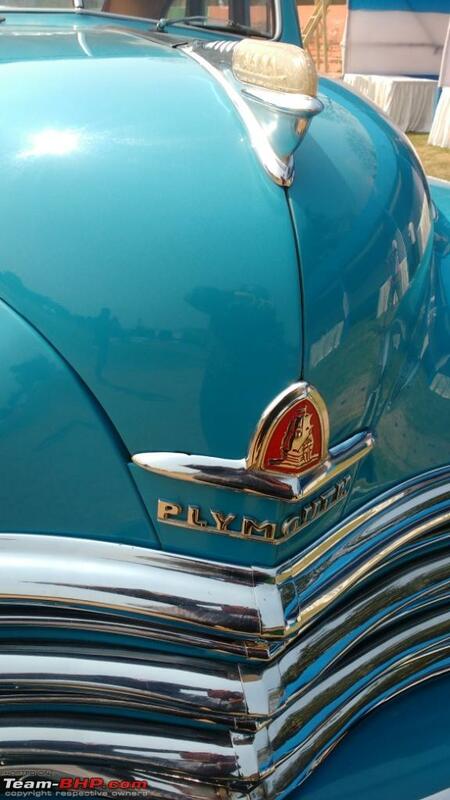 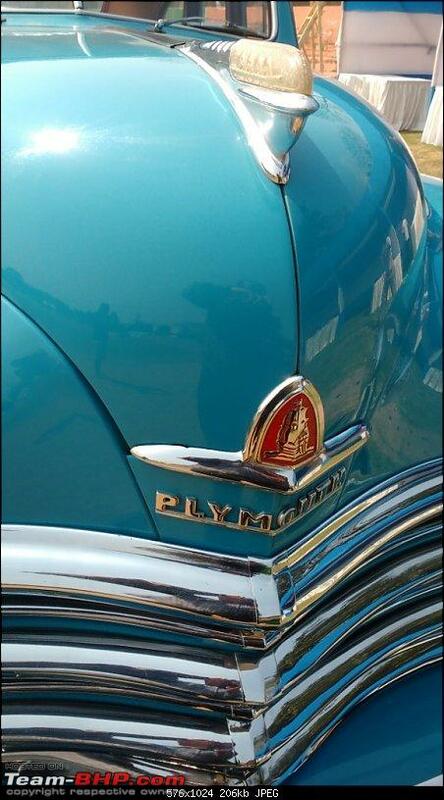 The Six Volt electrical system still retained in this Plymouth Super Deluxe. 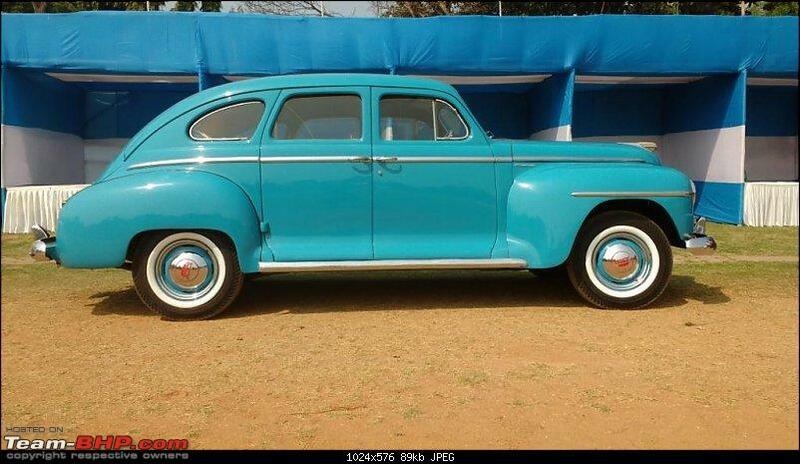 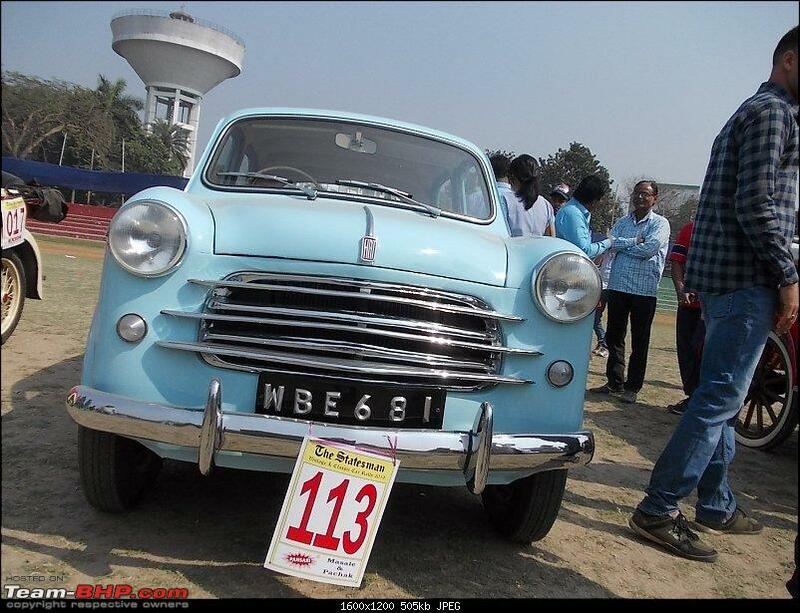 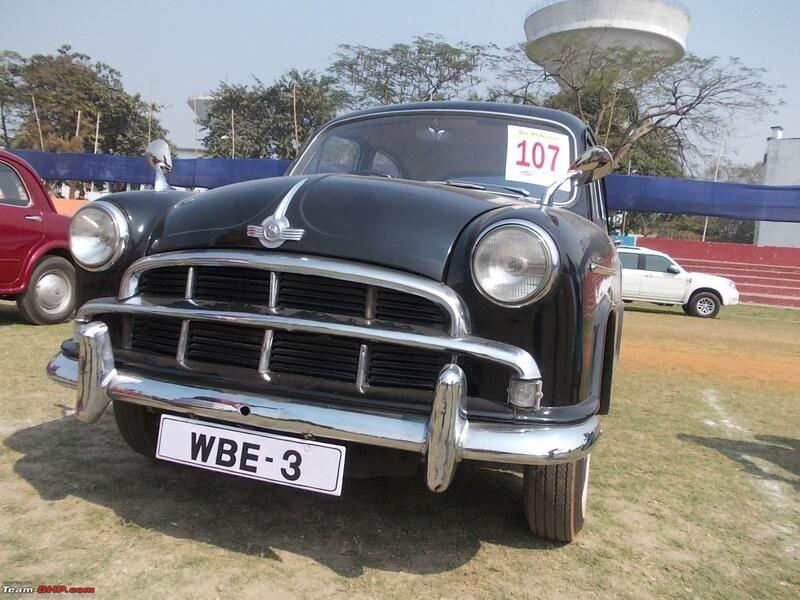 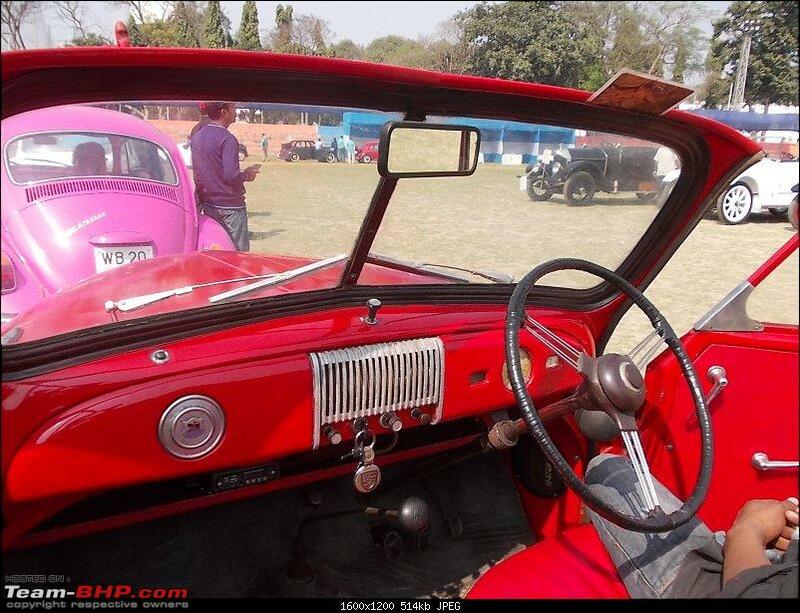 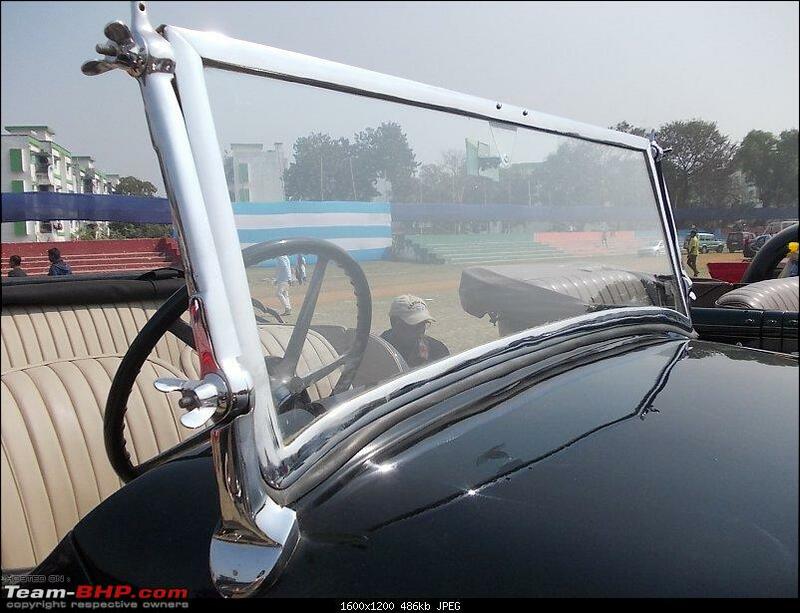 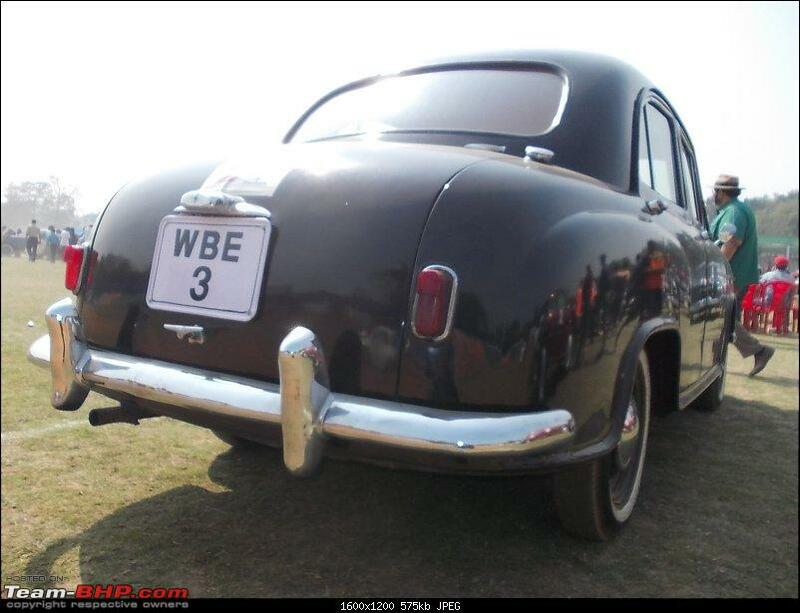 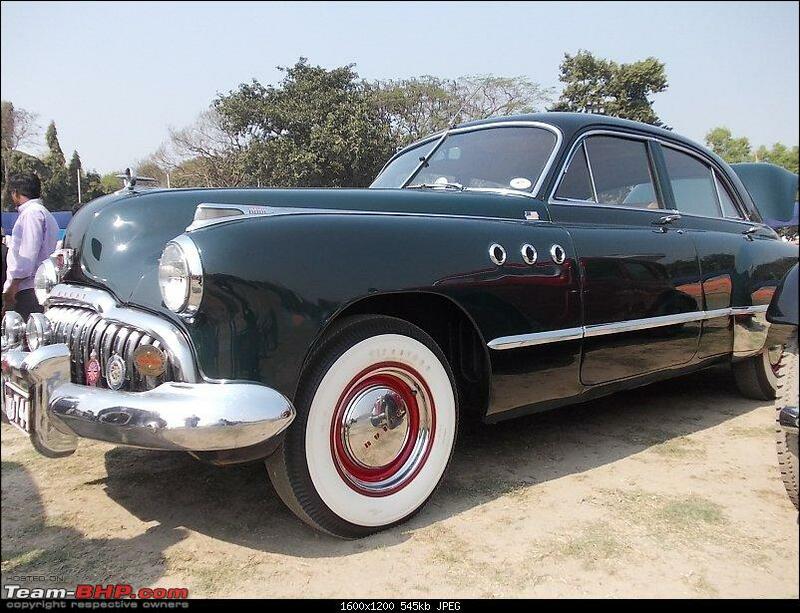 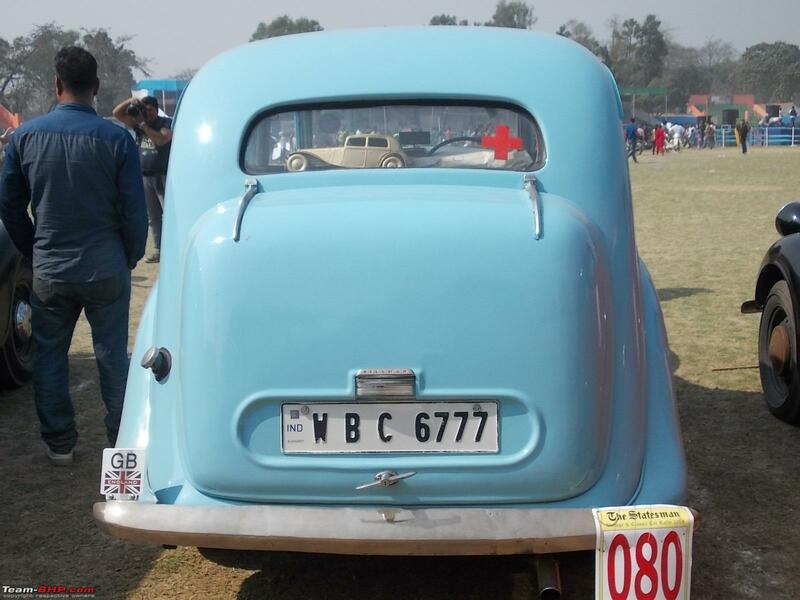 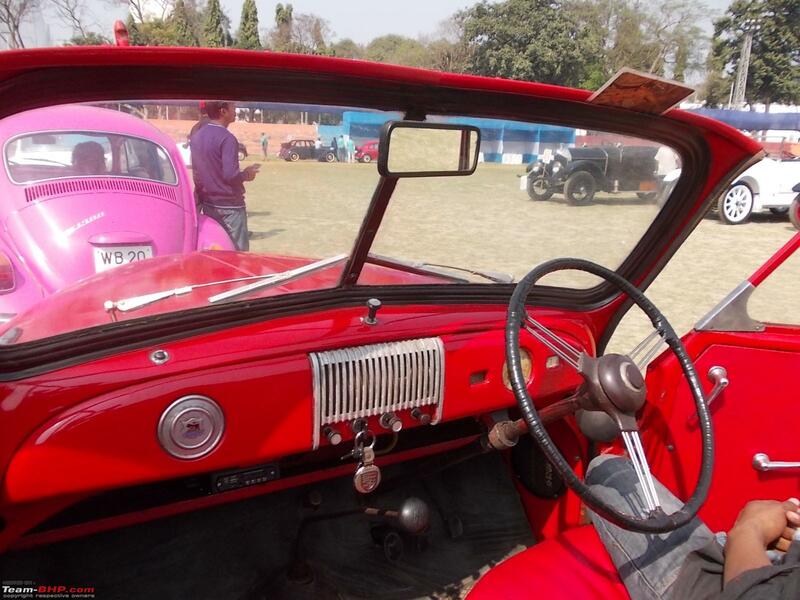 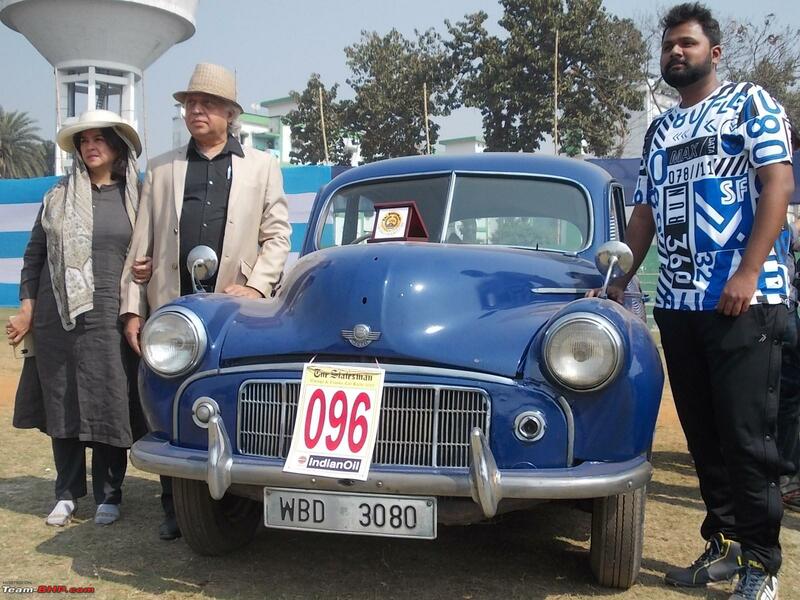 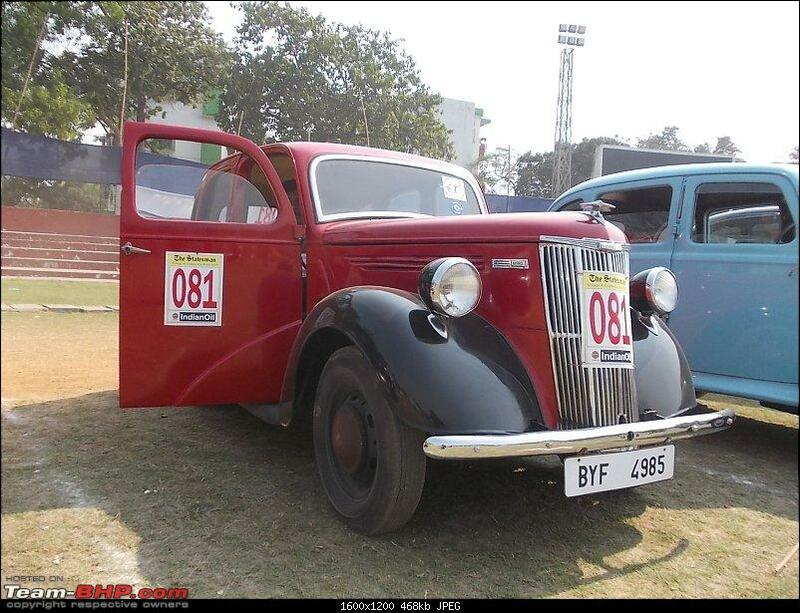 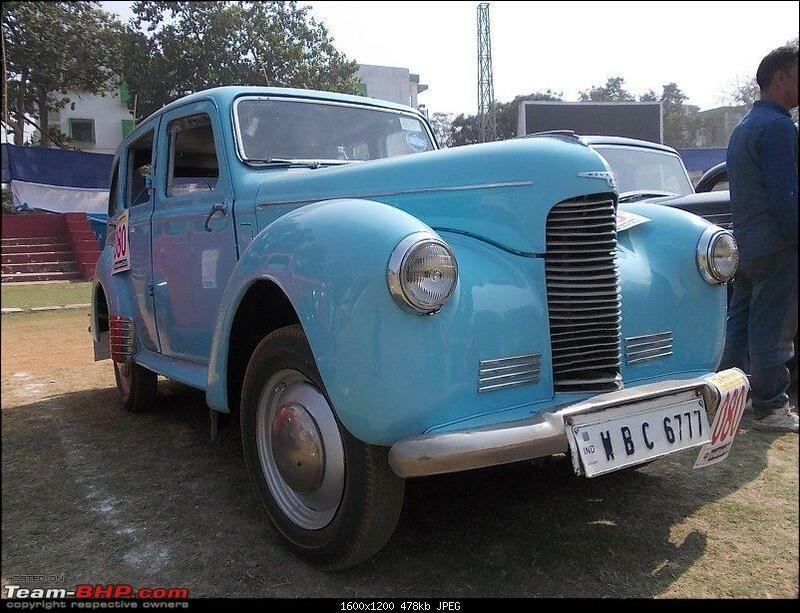 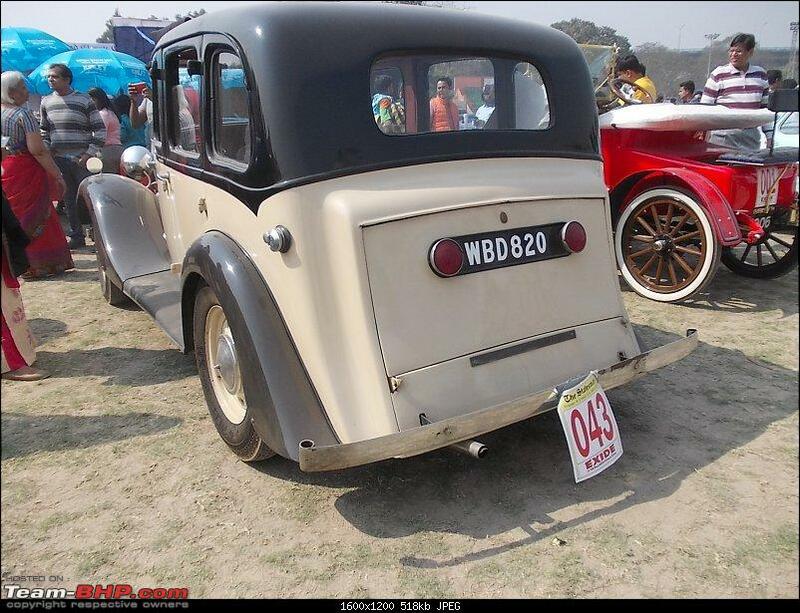 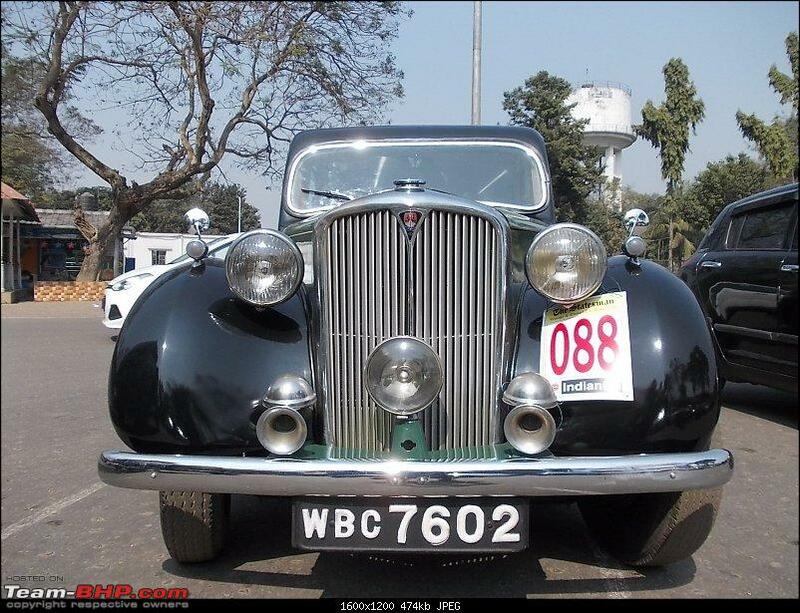 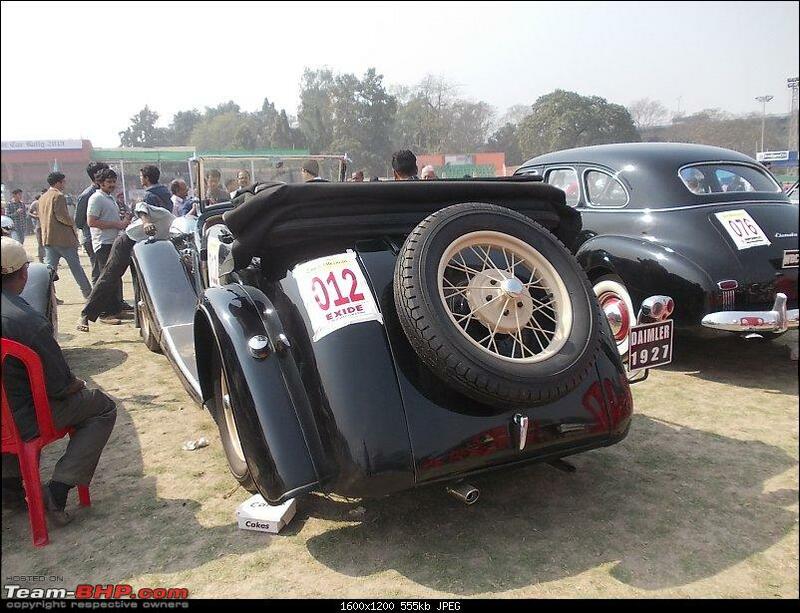 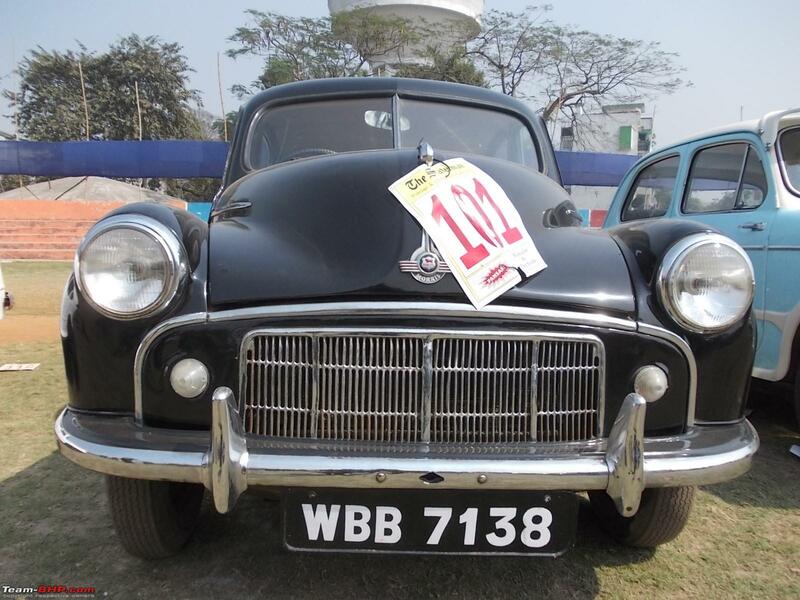 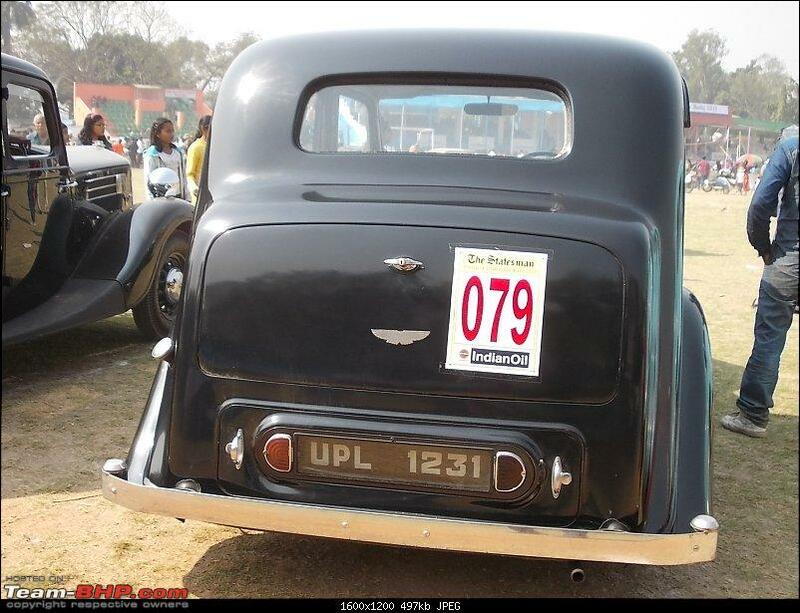 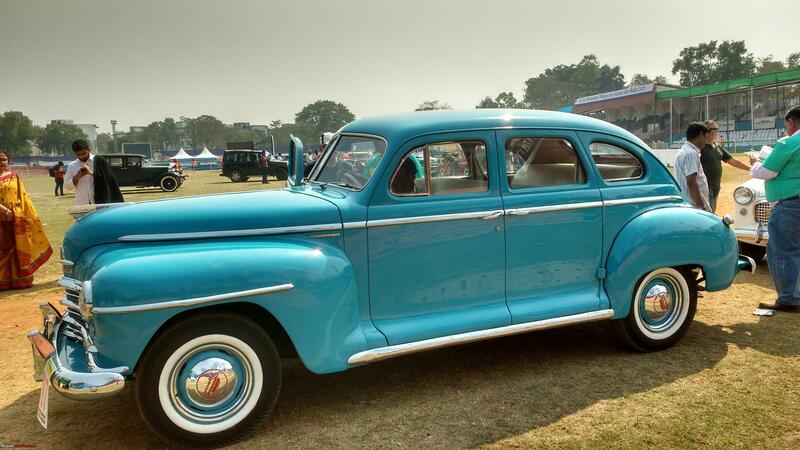 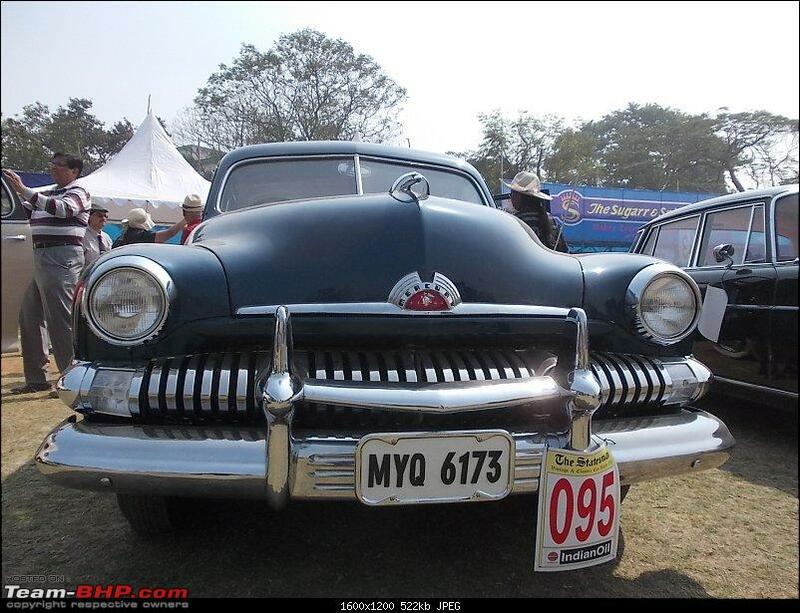 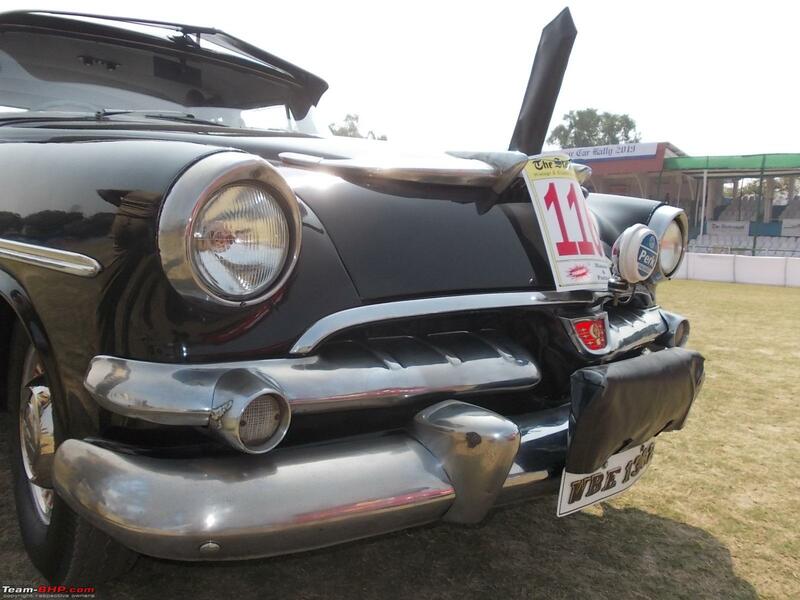 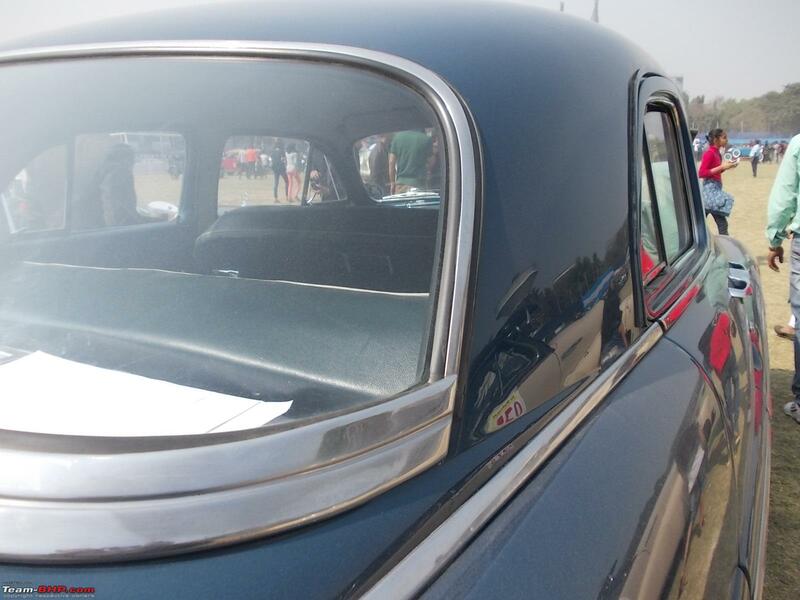 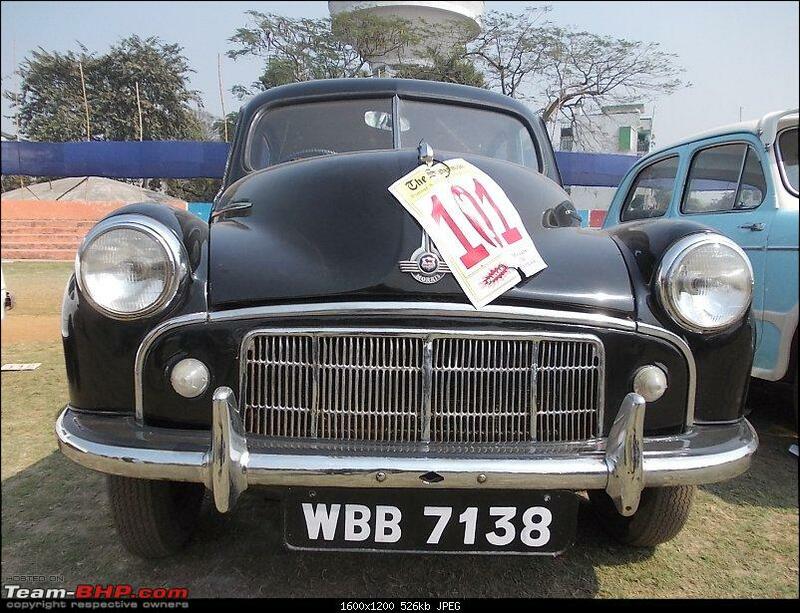 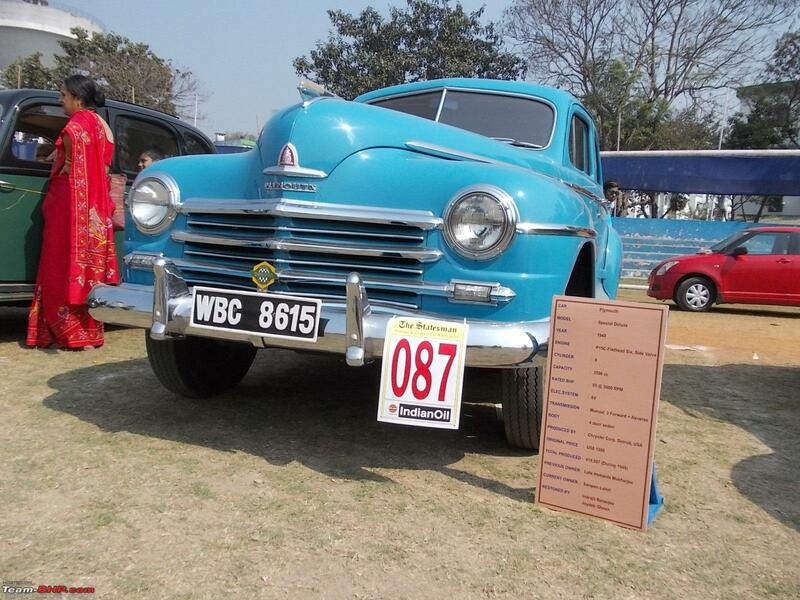 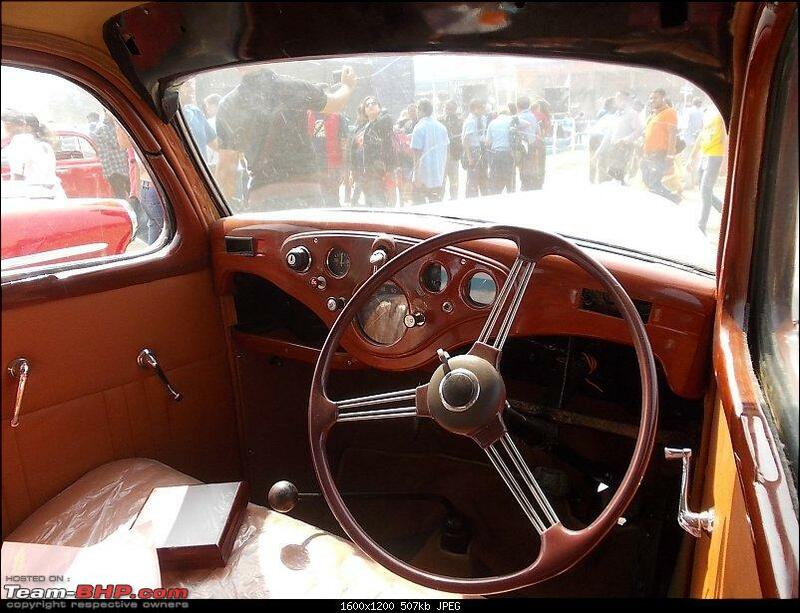 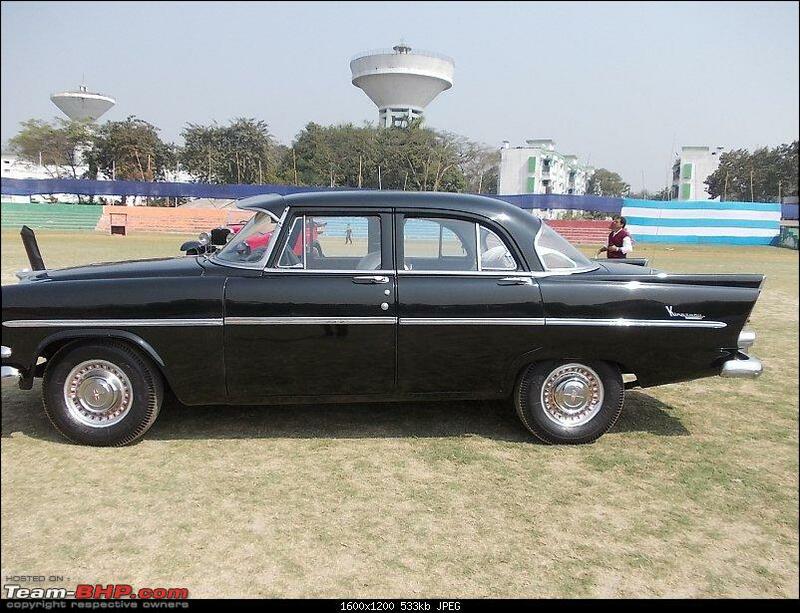 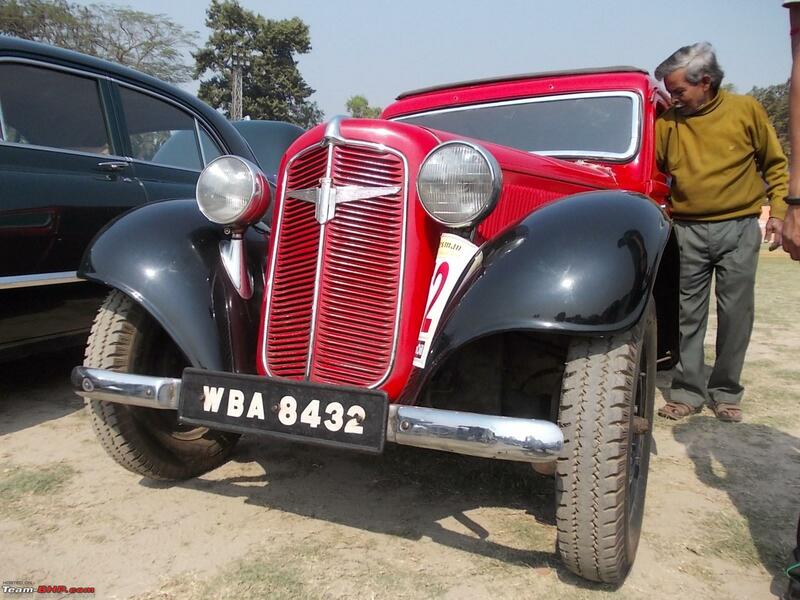 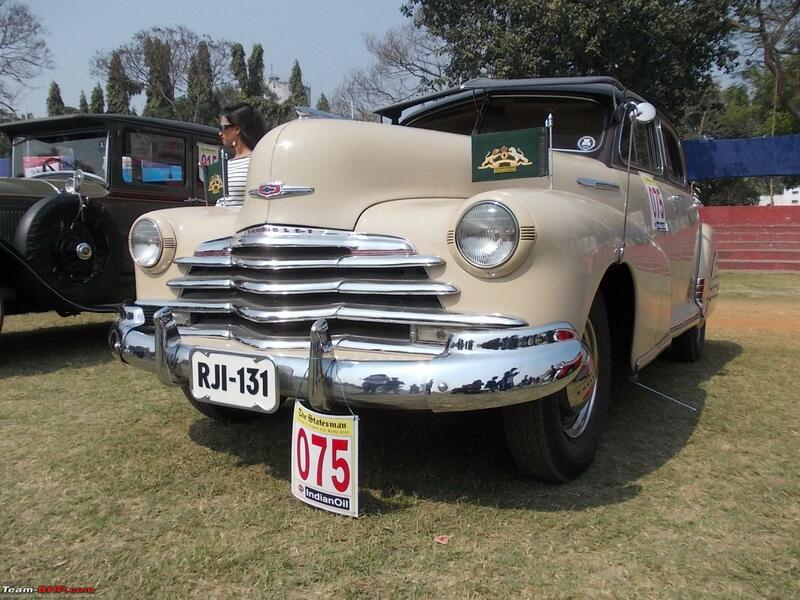 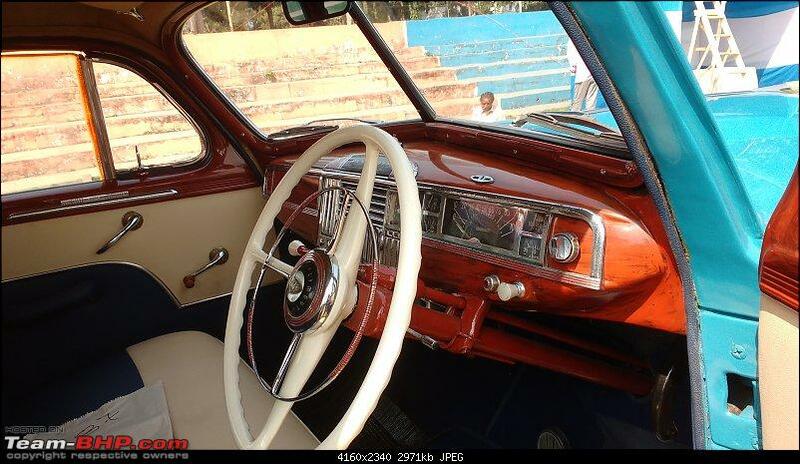 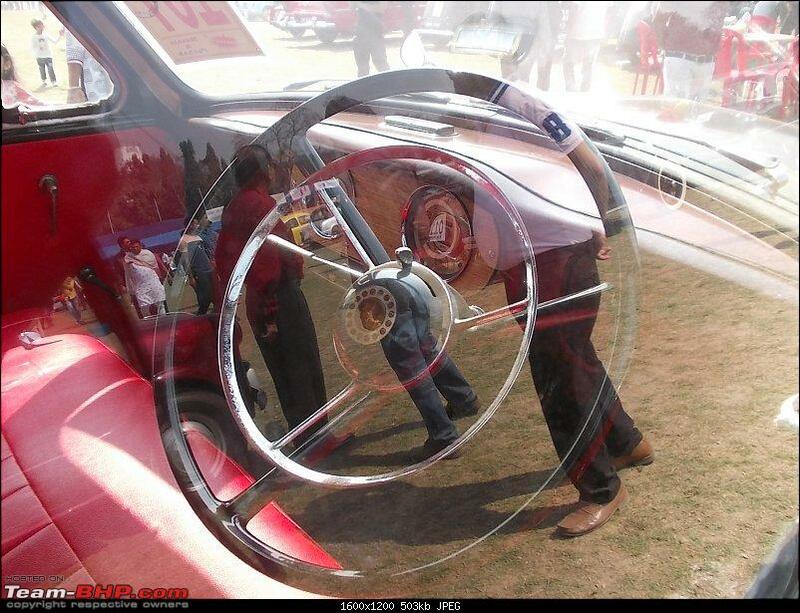 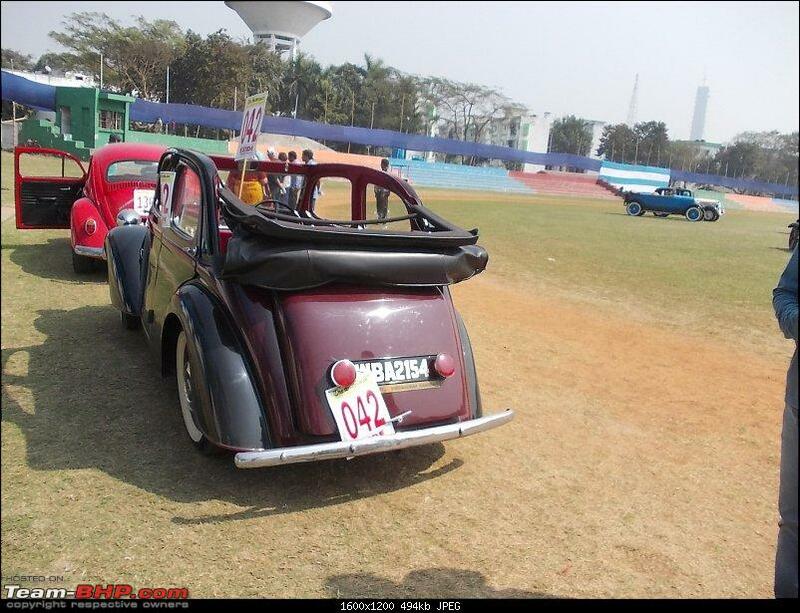 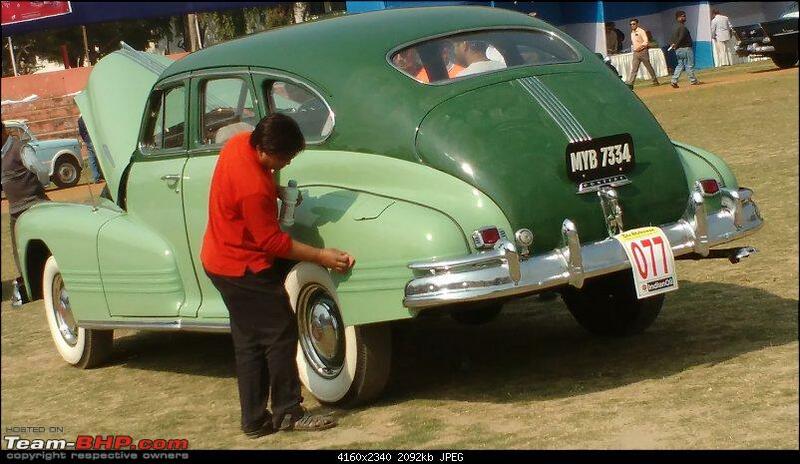 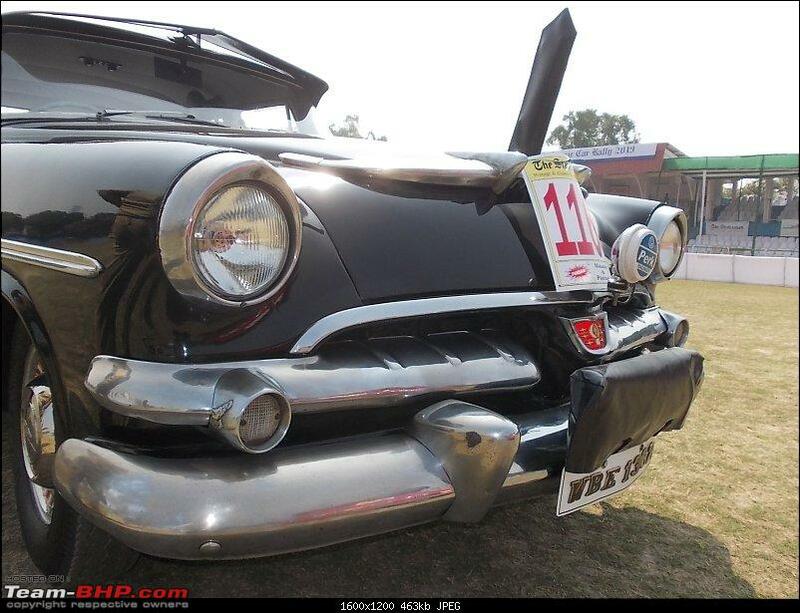 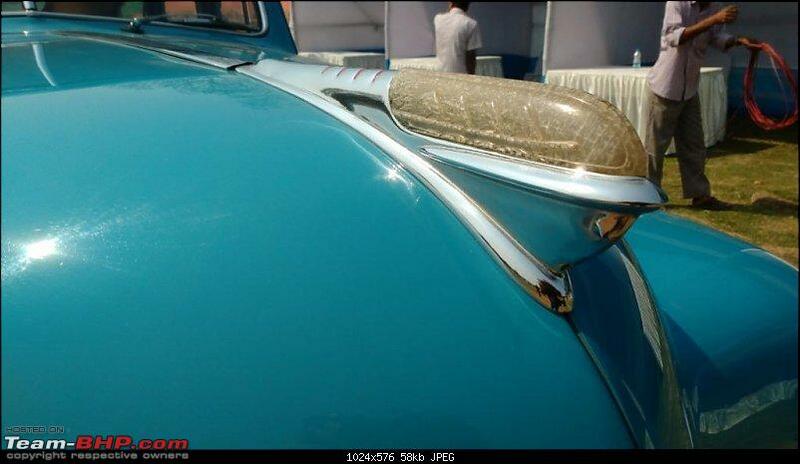 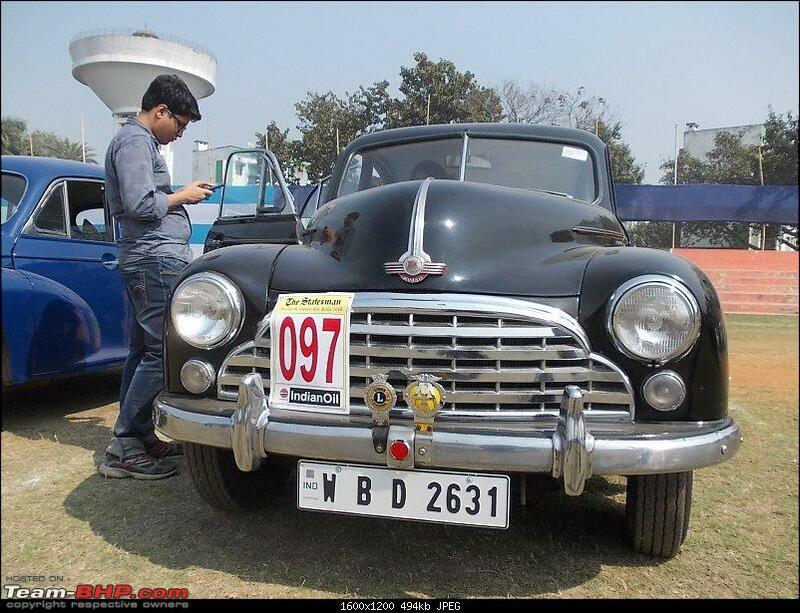 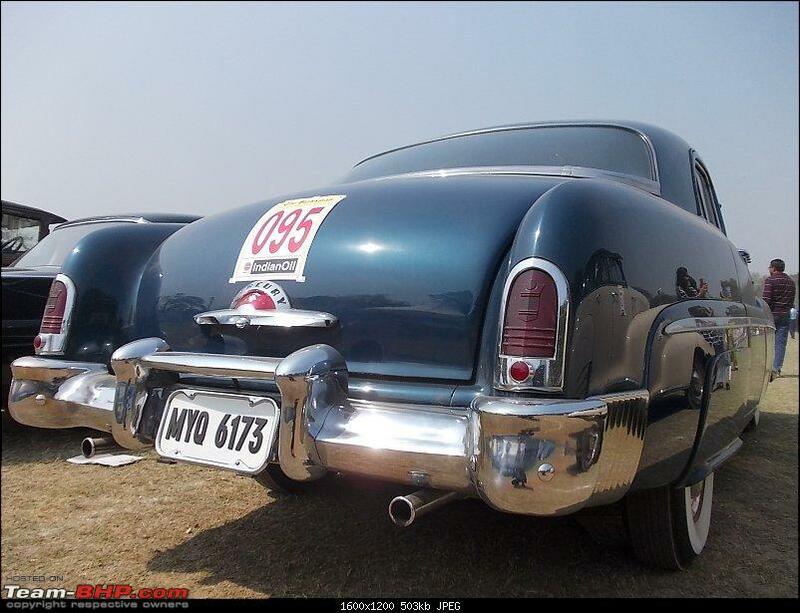 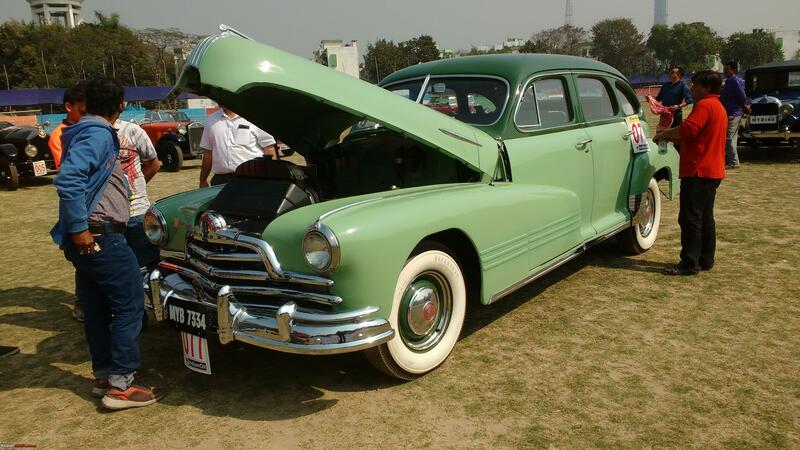 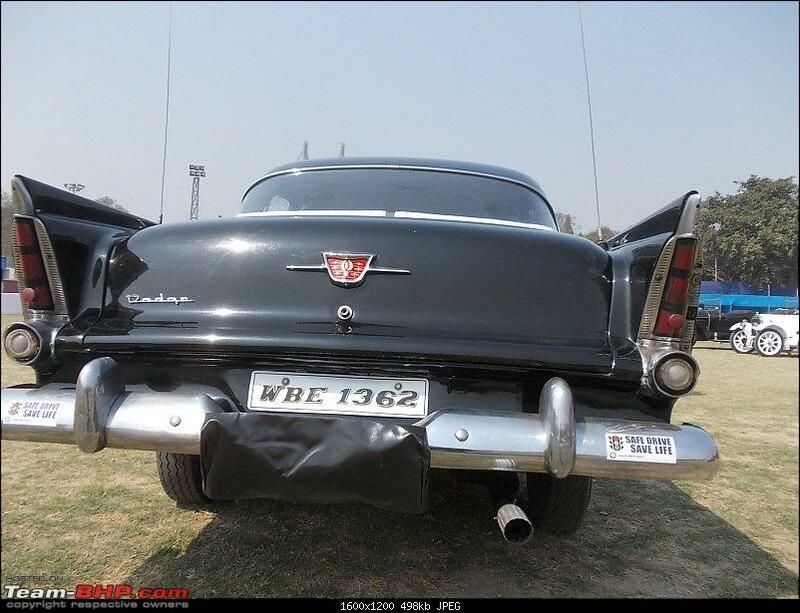 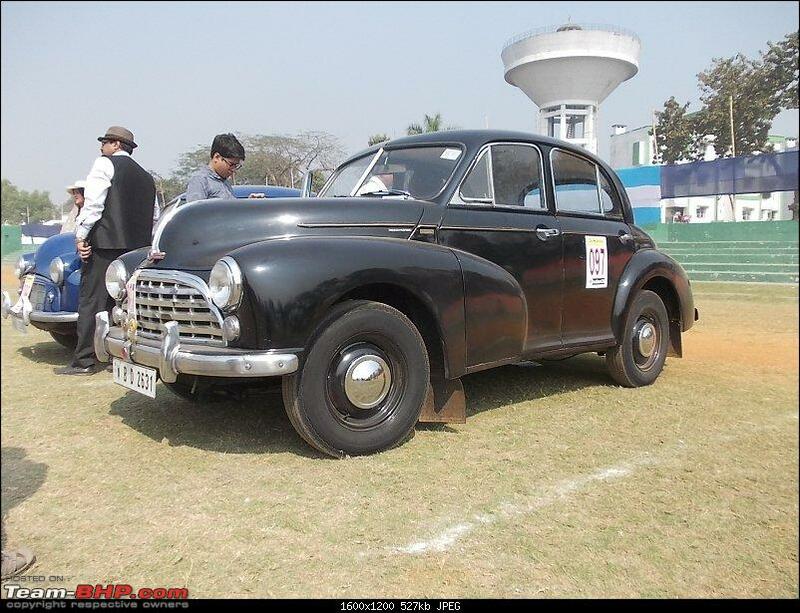 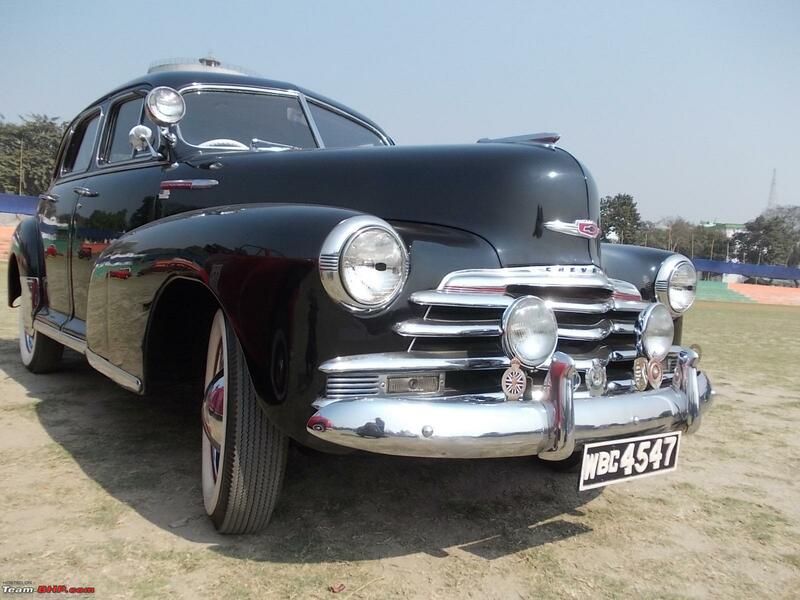 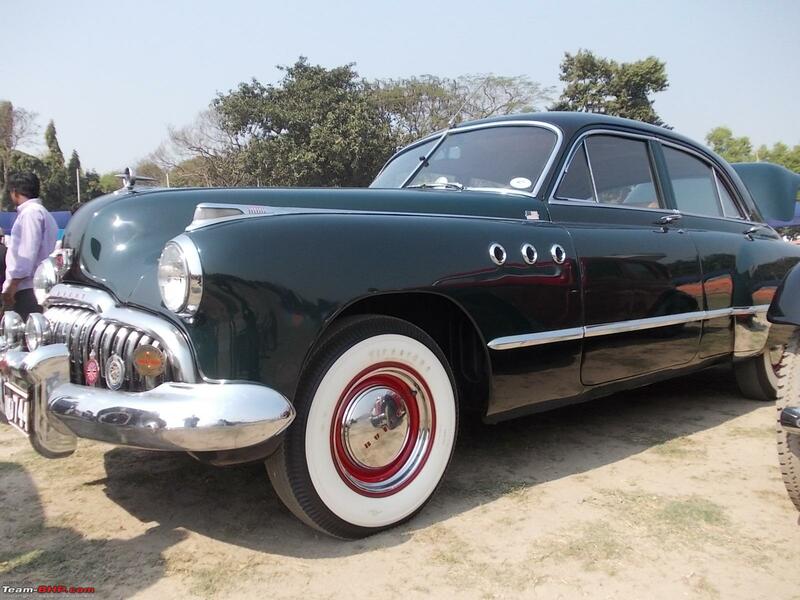 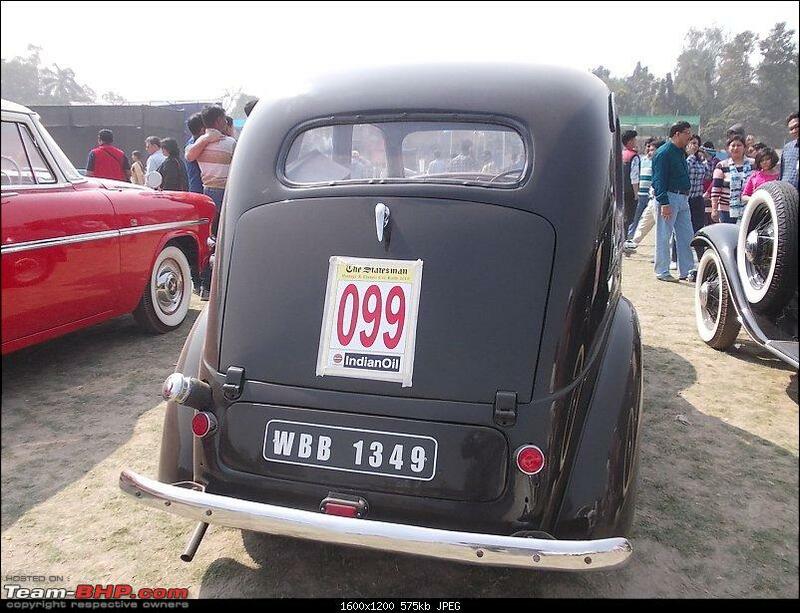 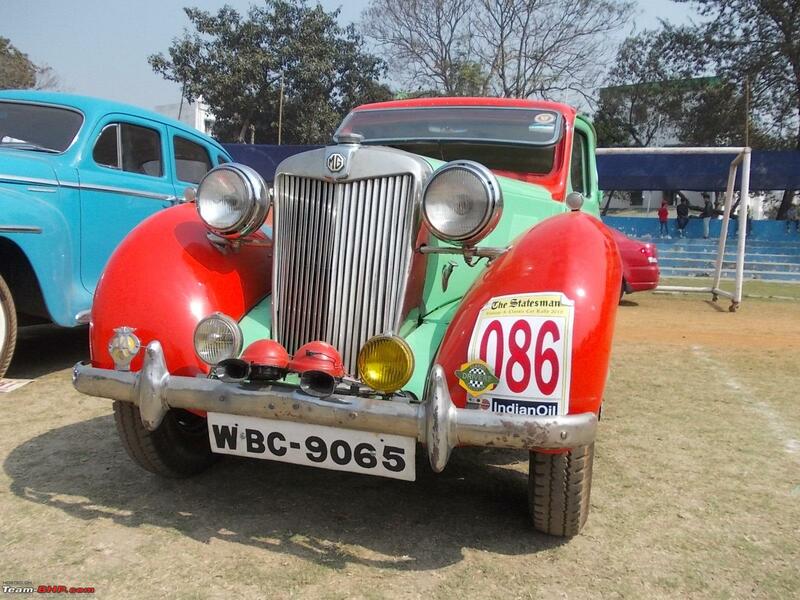 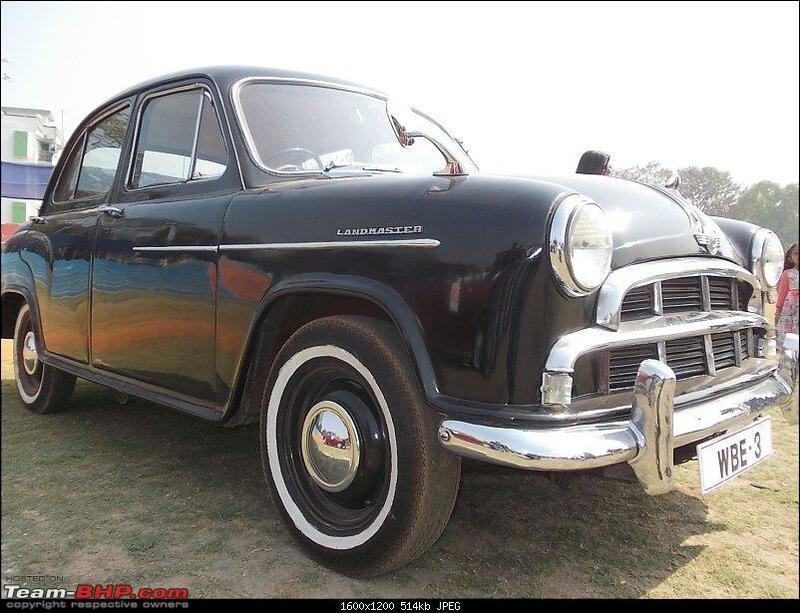 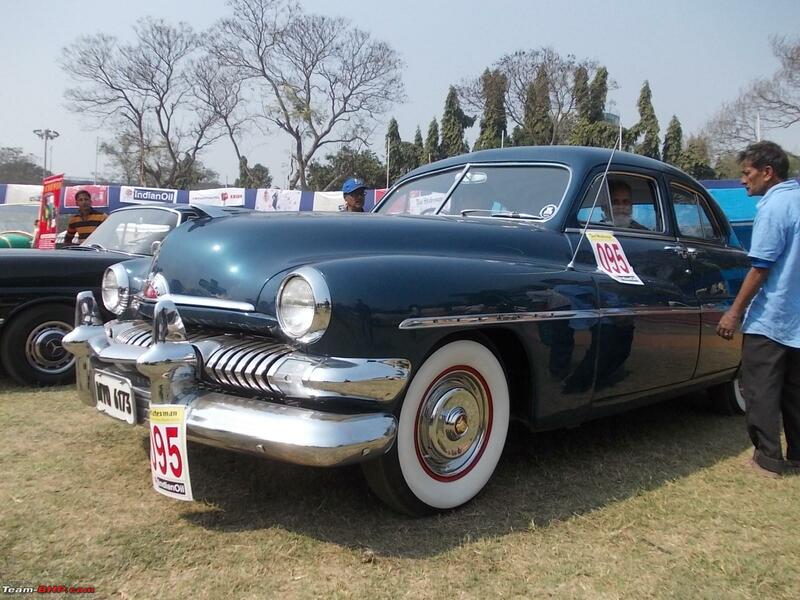 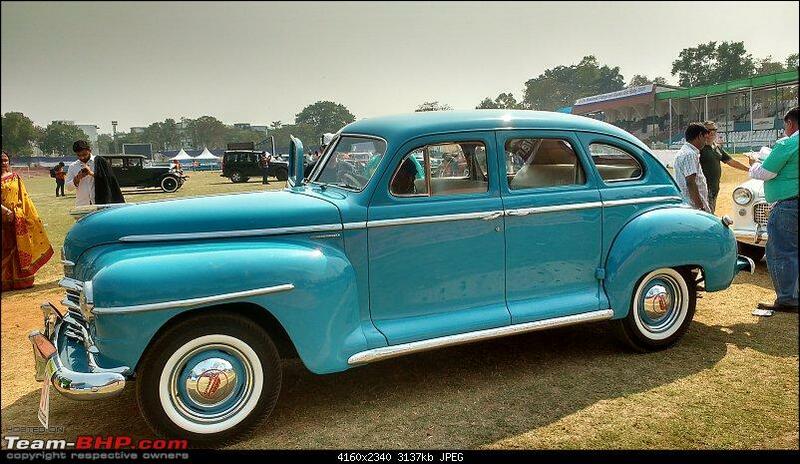 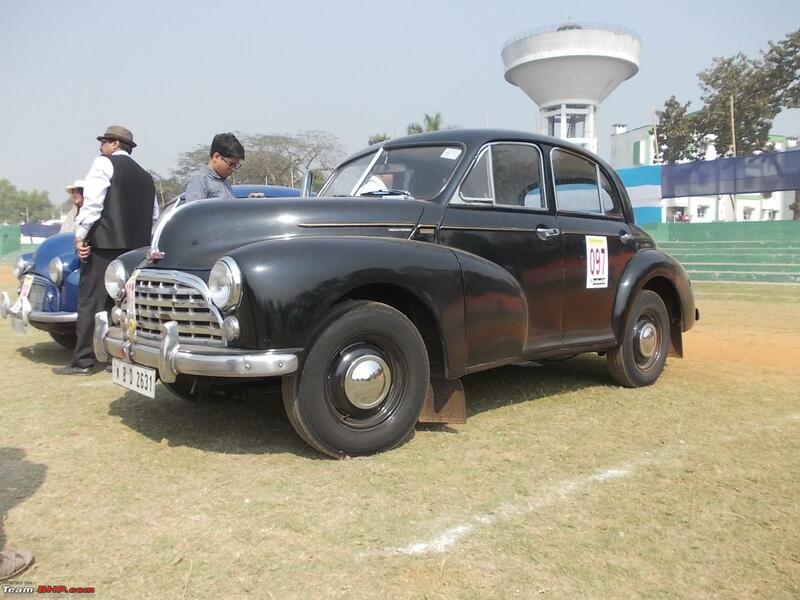 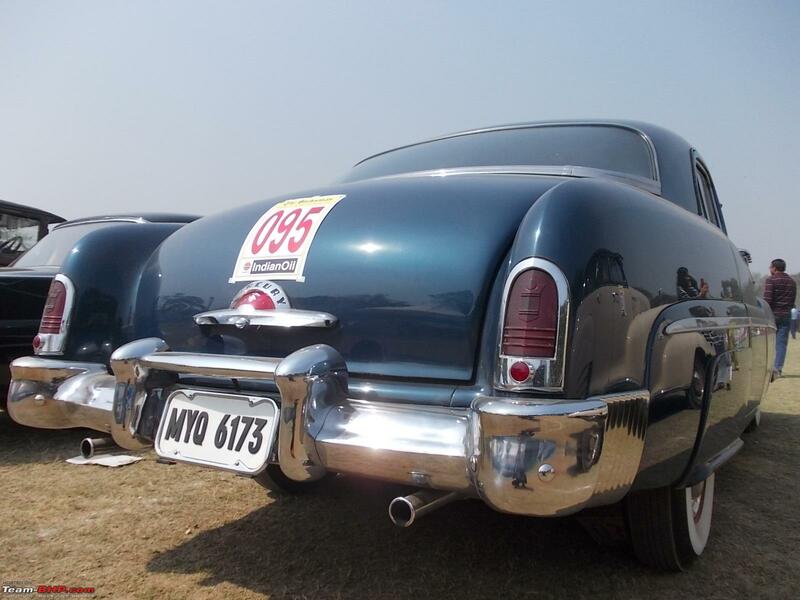 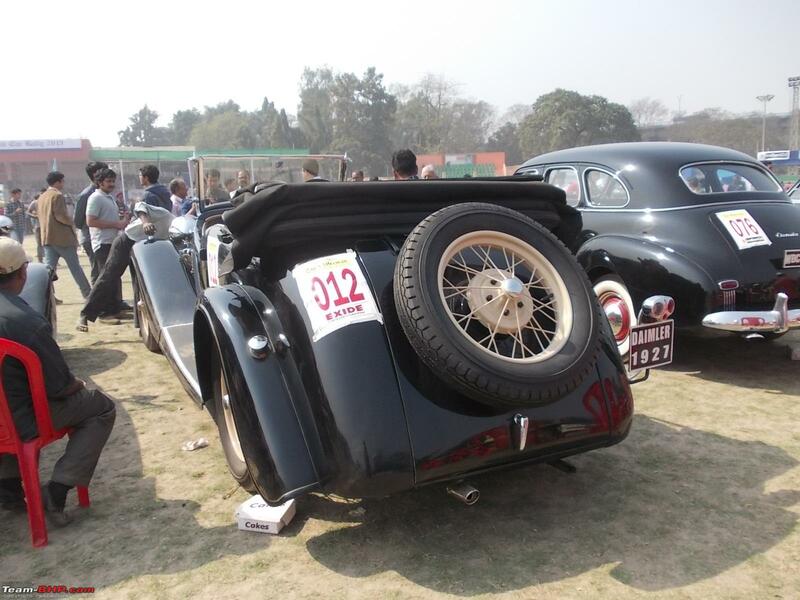 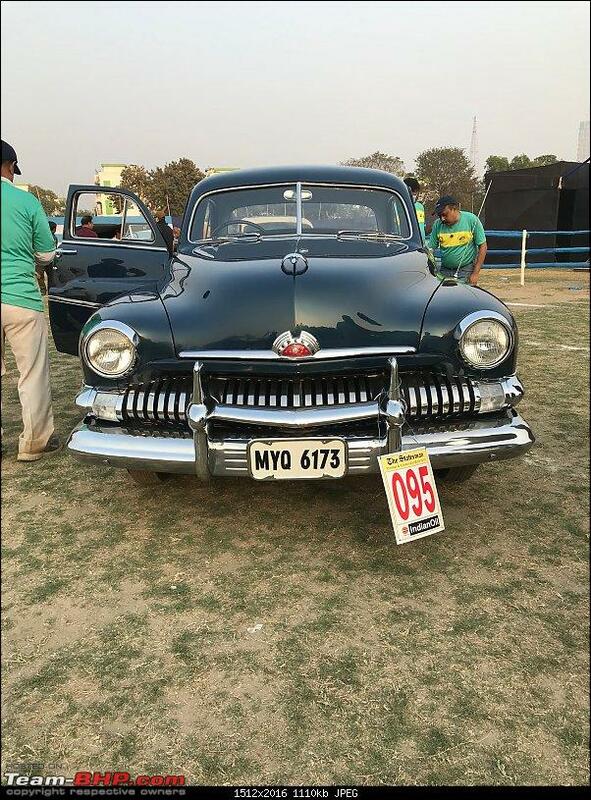 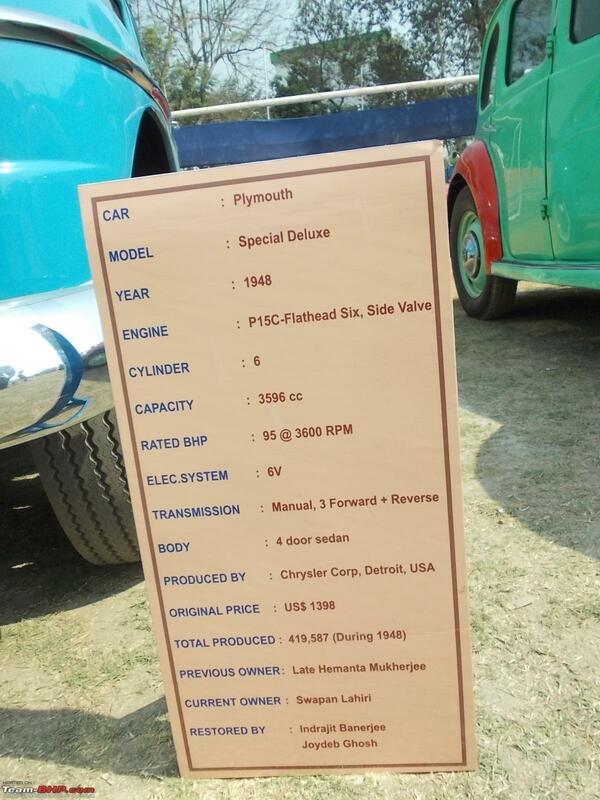 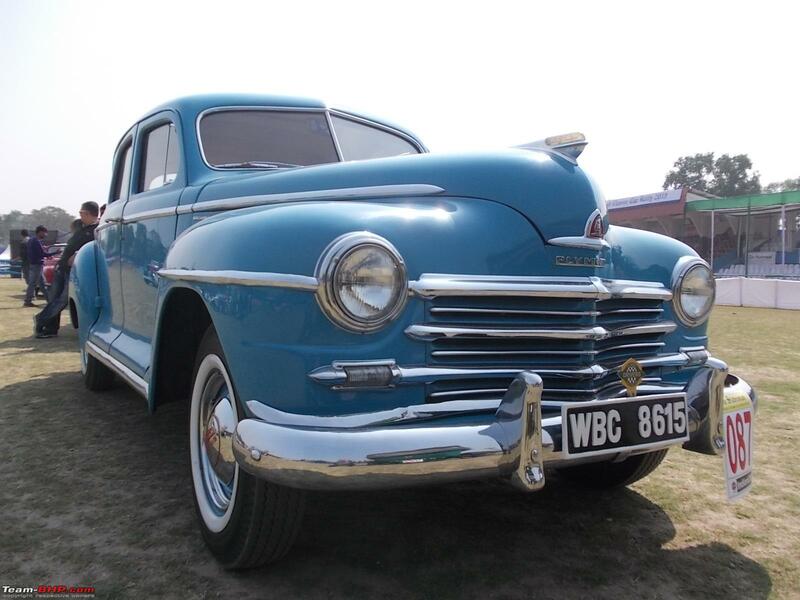 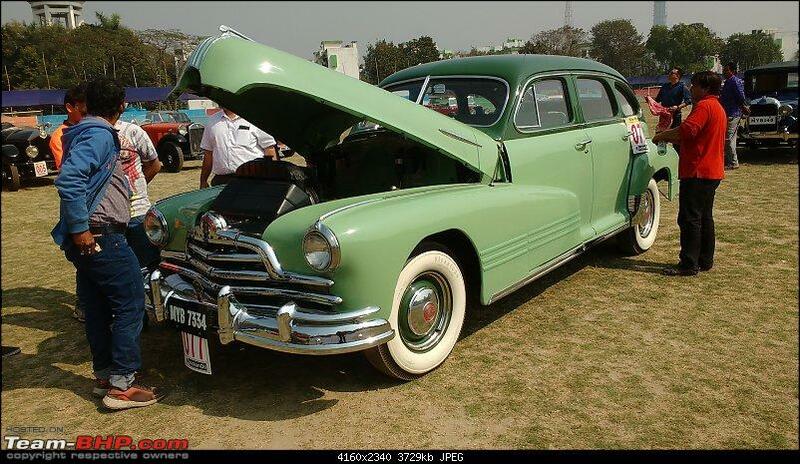 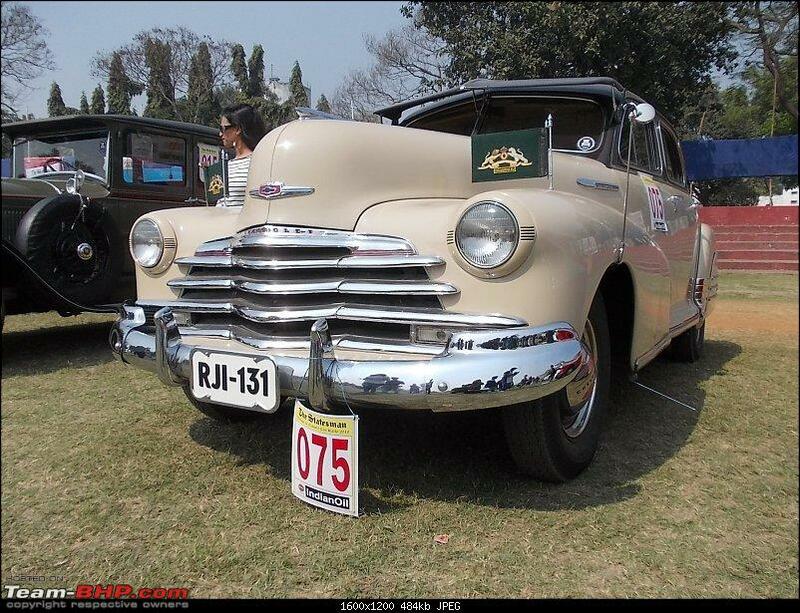 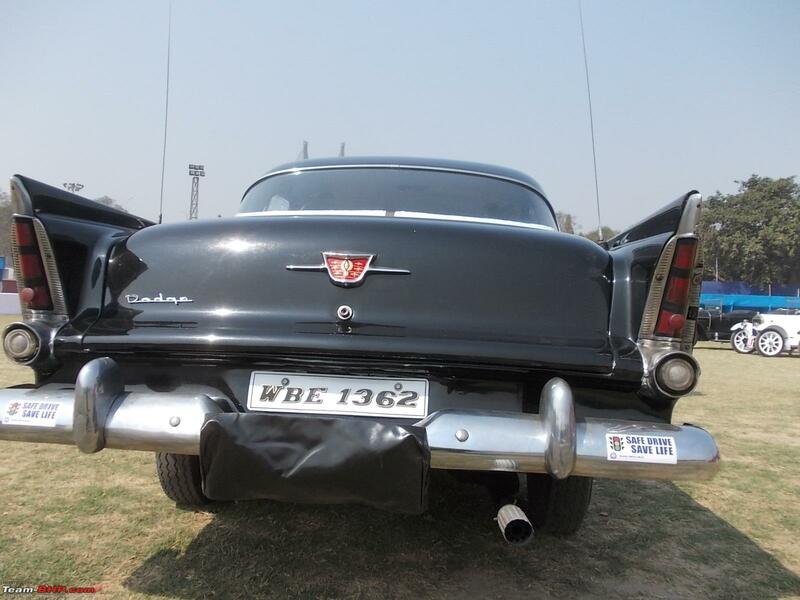 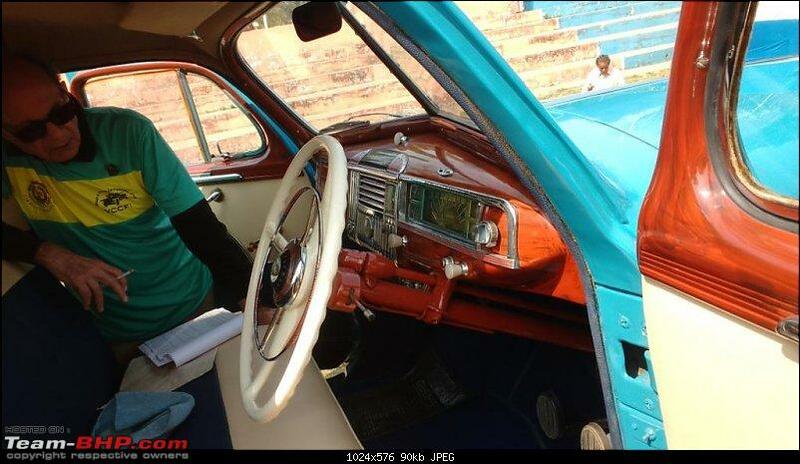 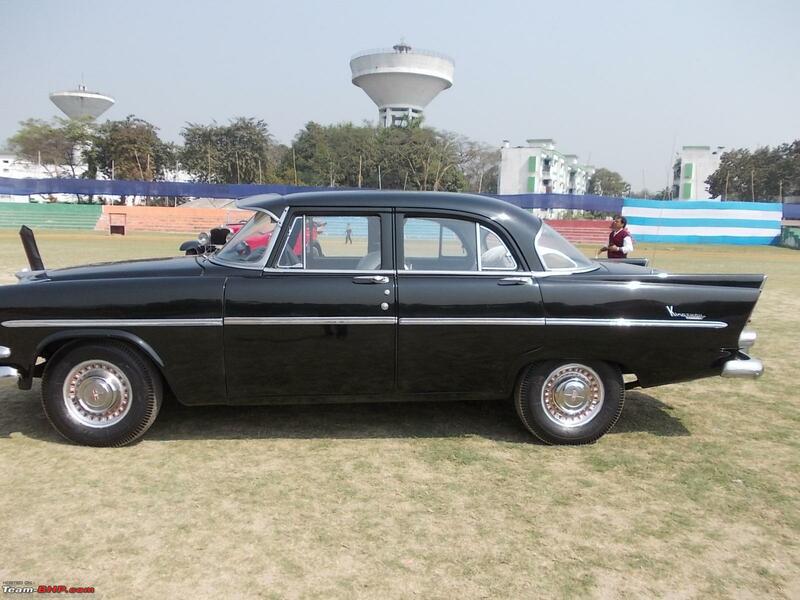 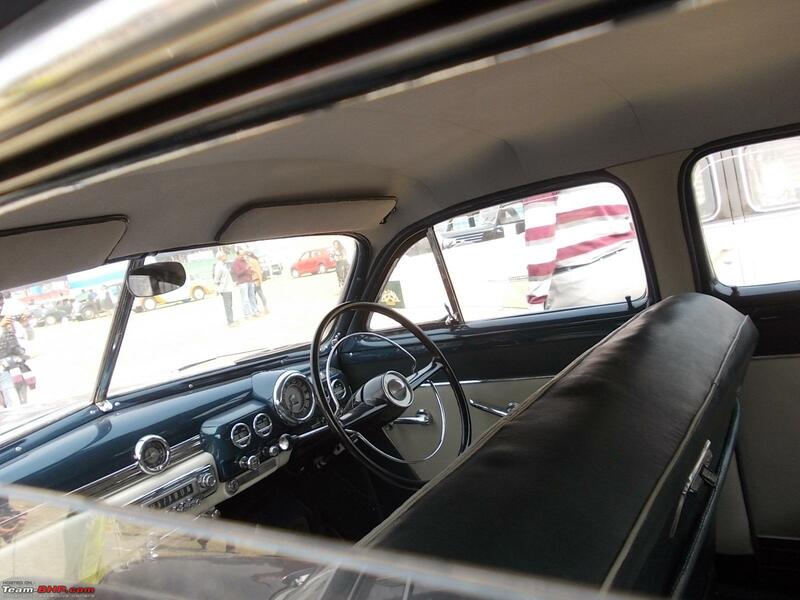 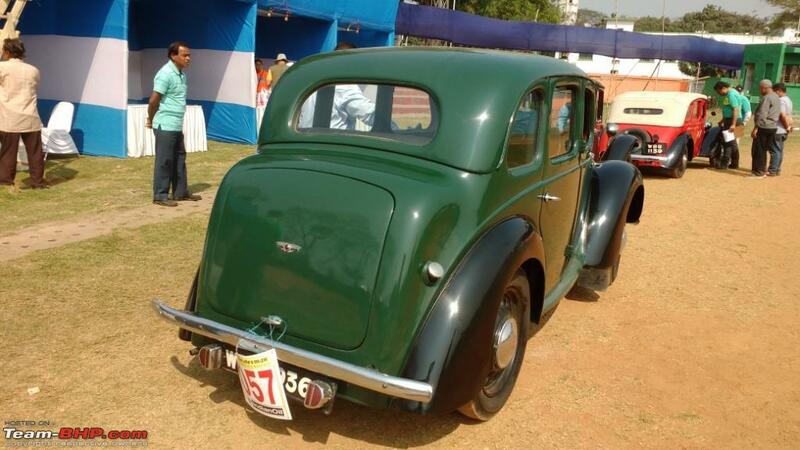 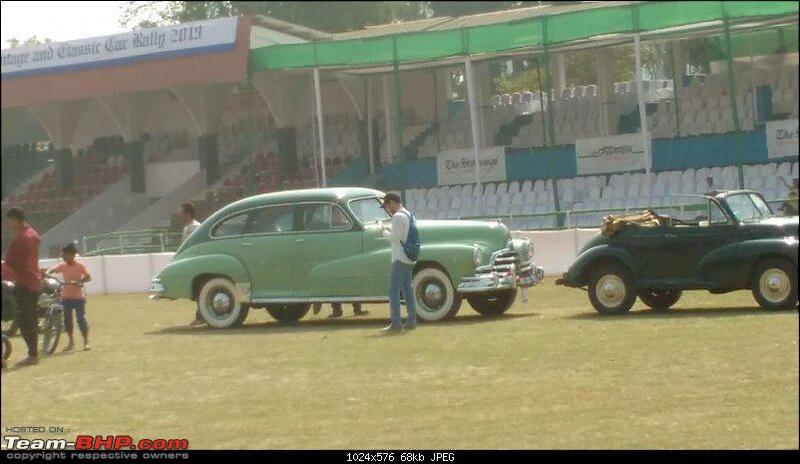 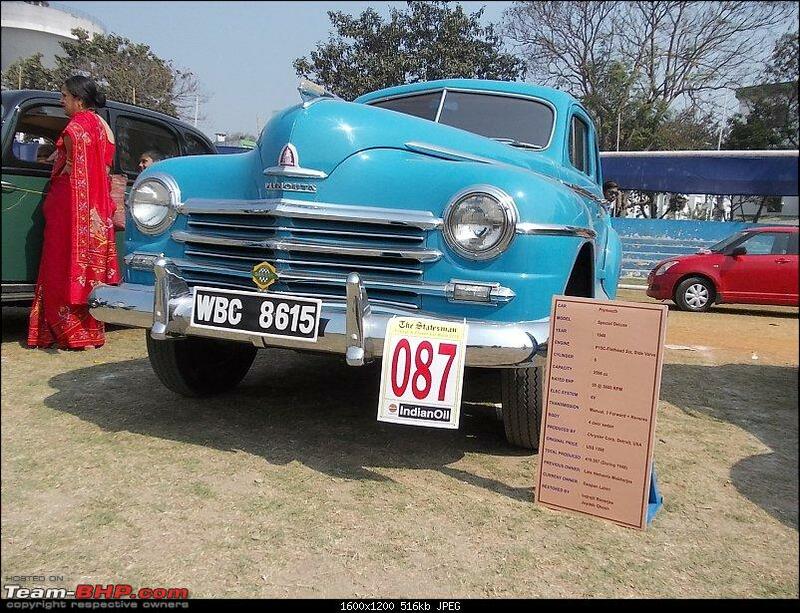 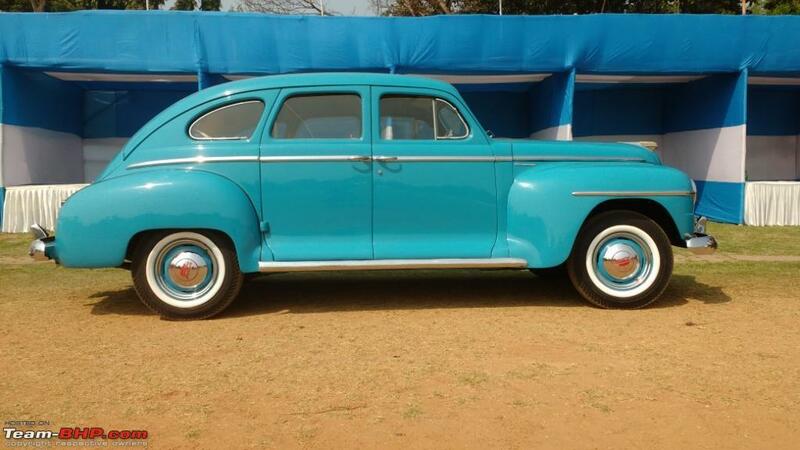 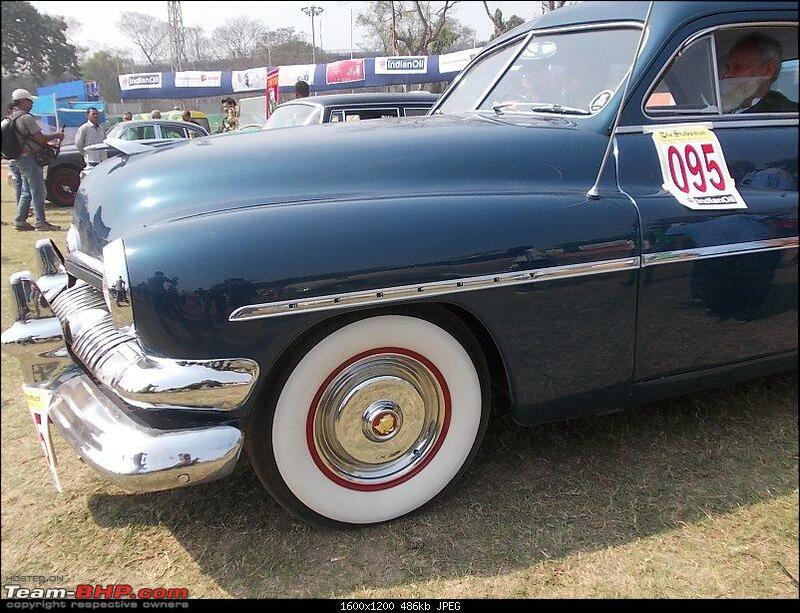 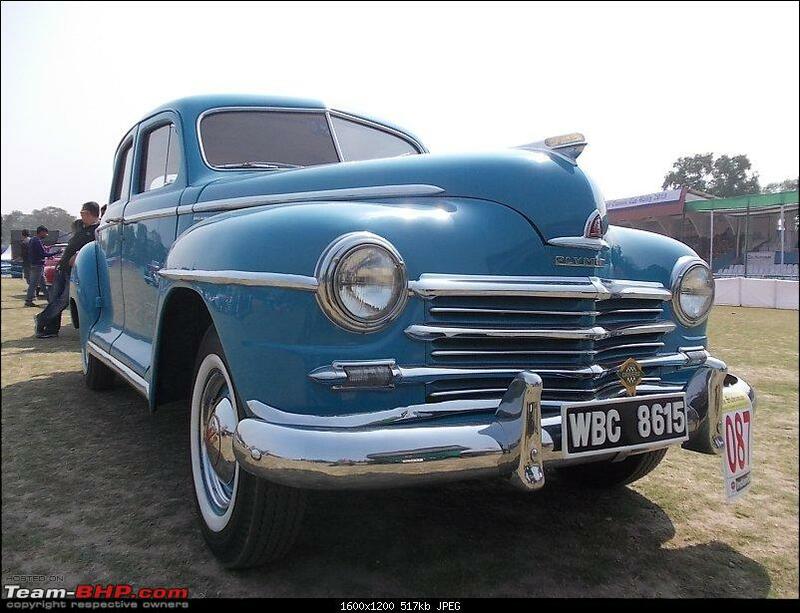 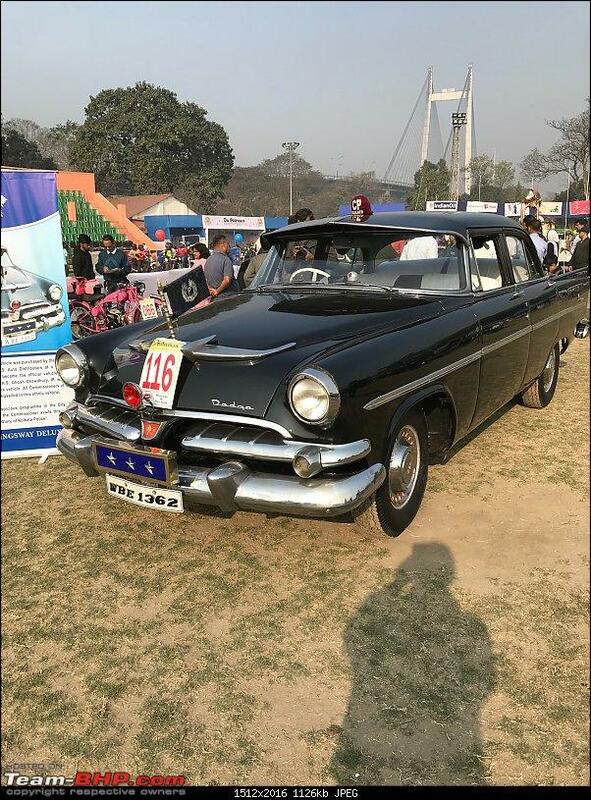 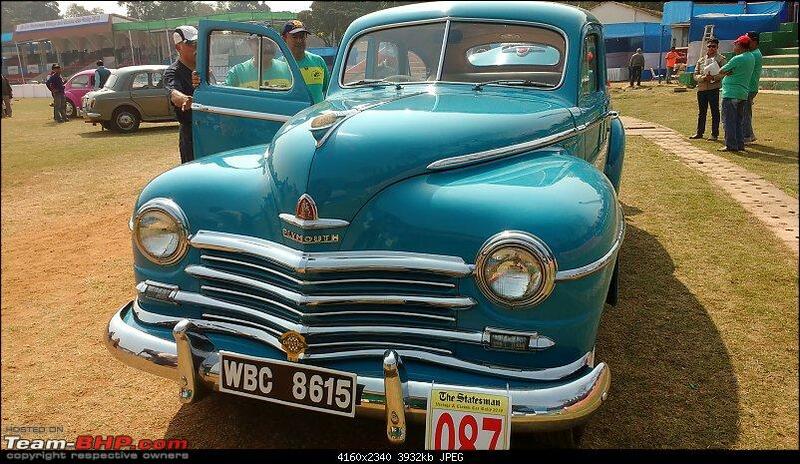 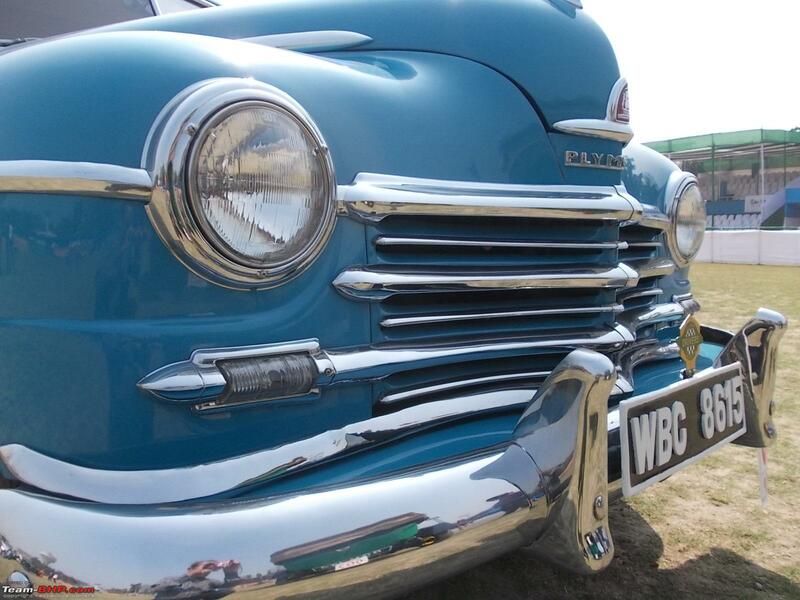 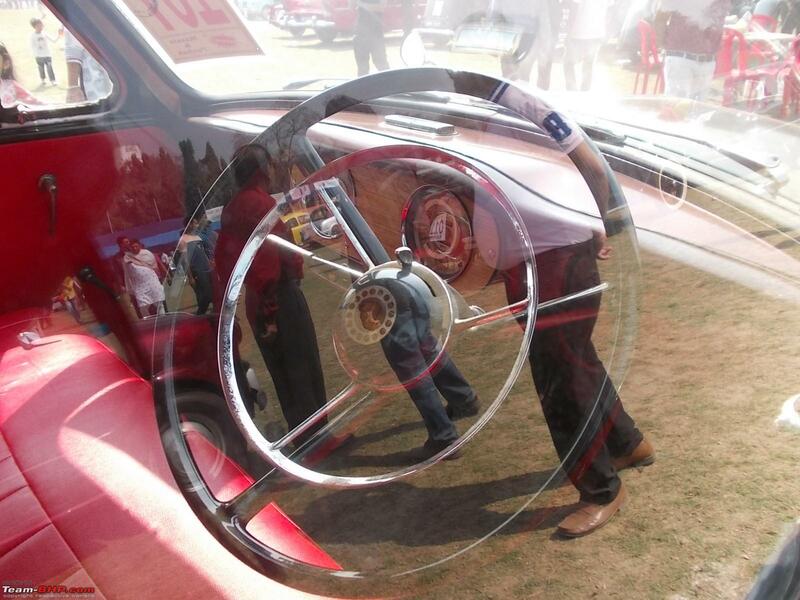 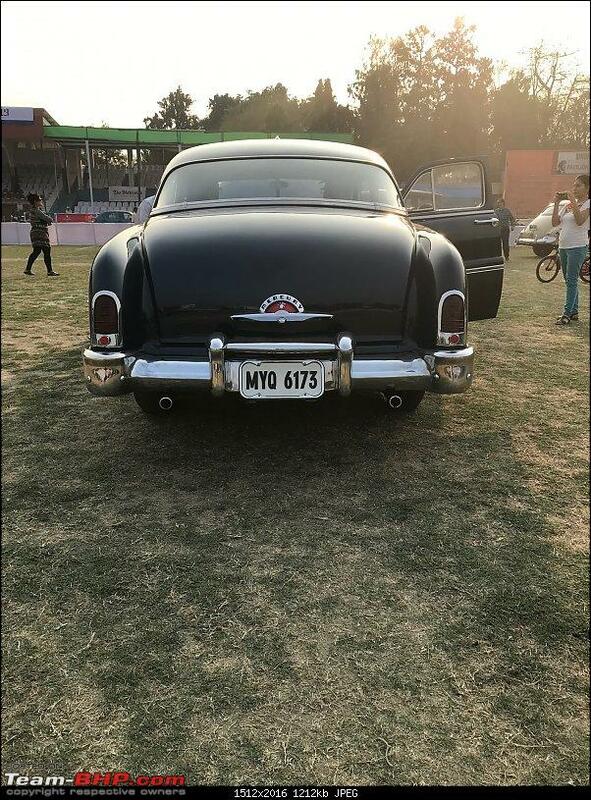 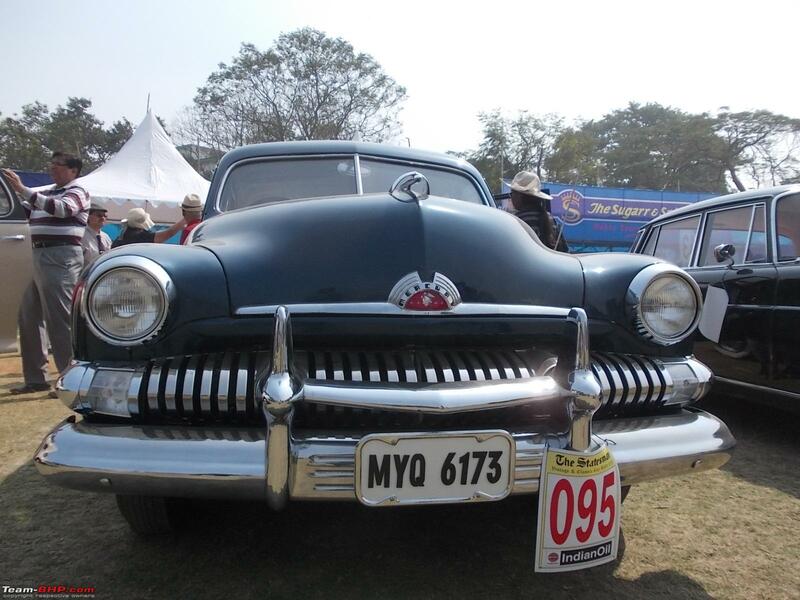 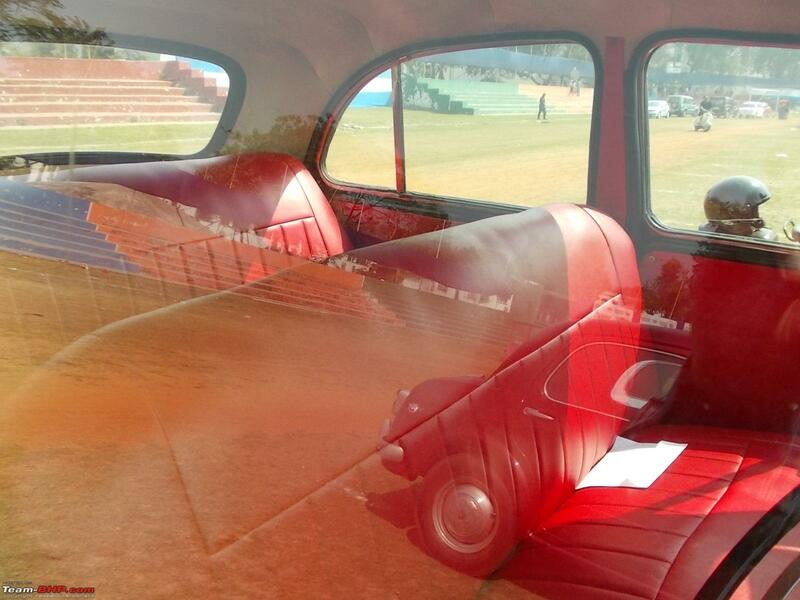 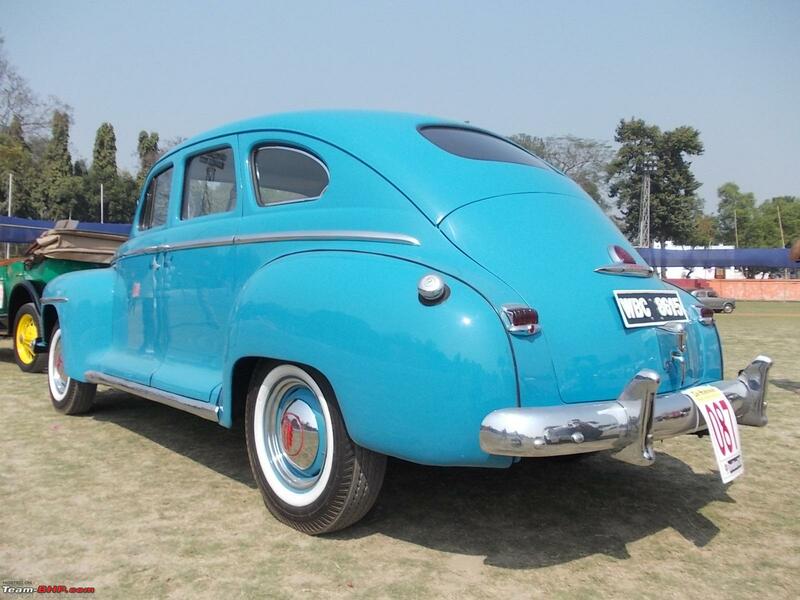 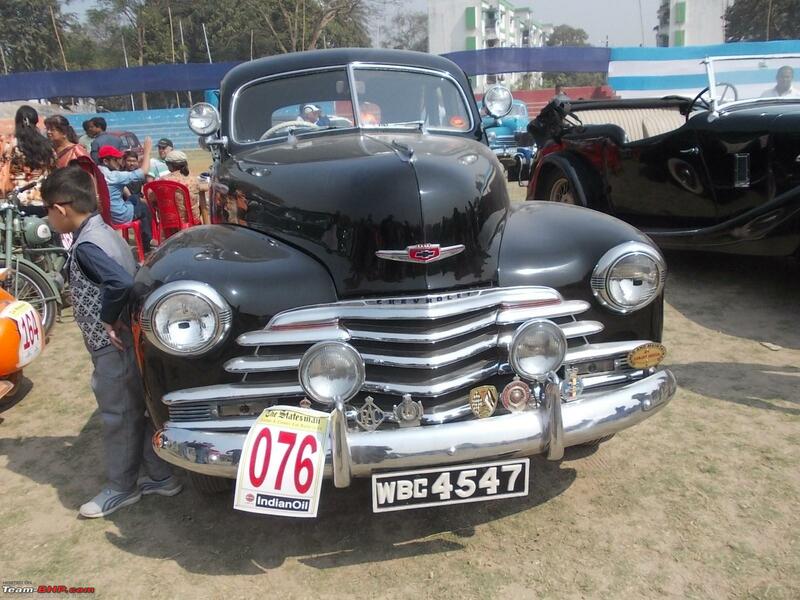 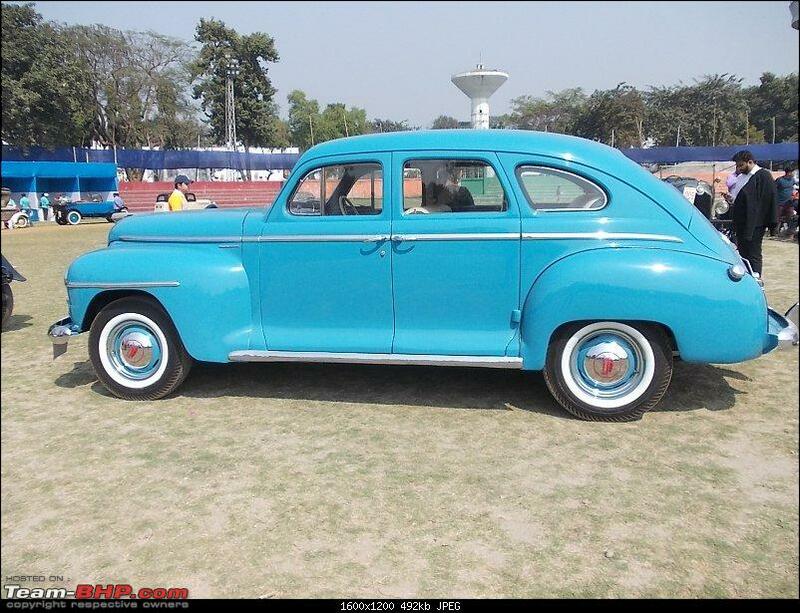 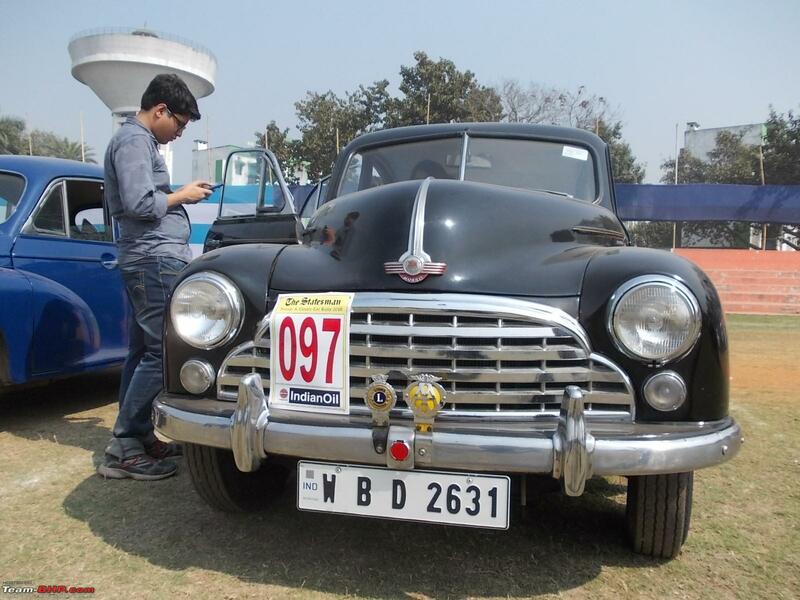 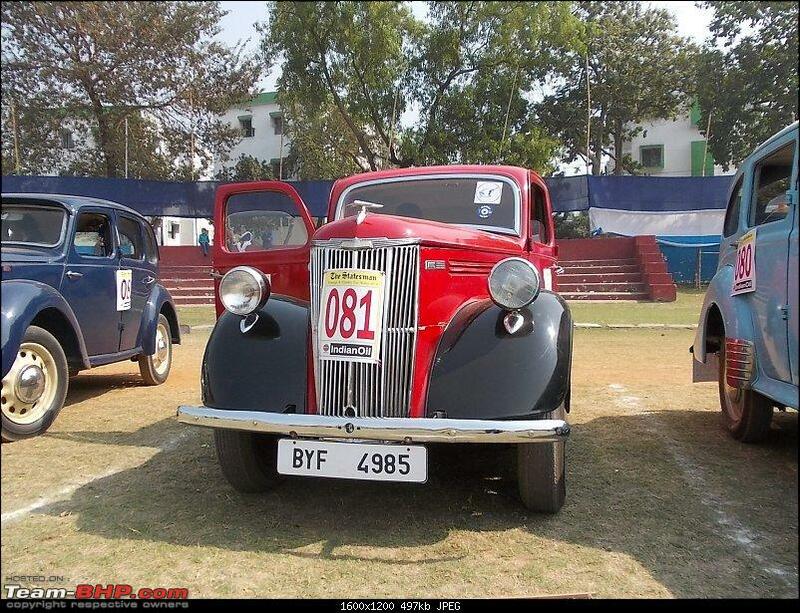 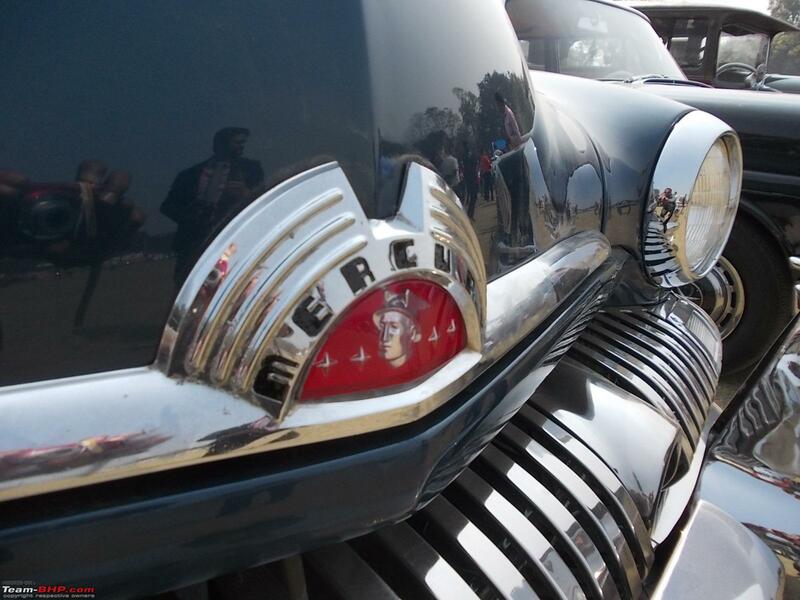 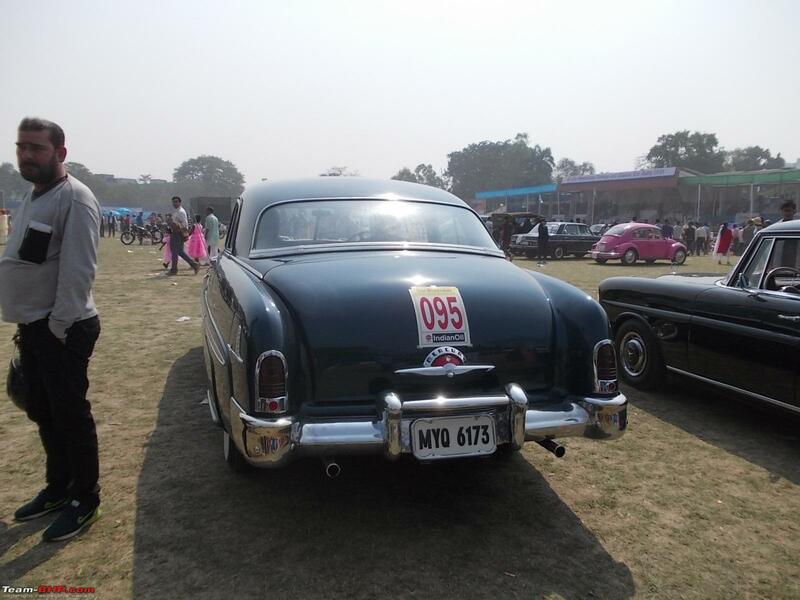 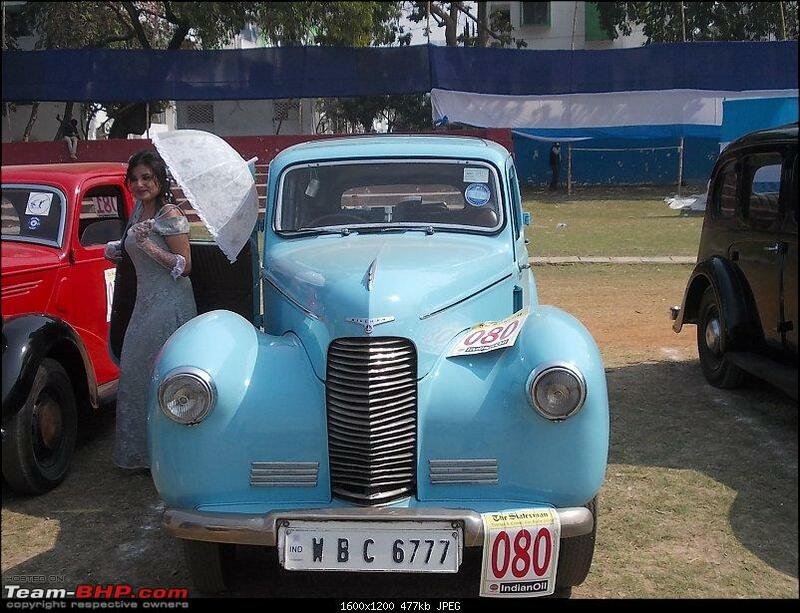 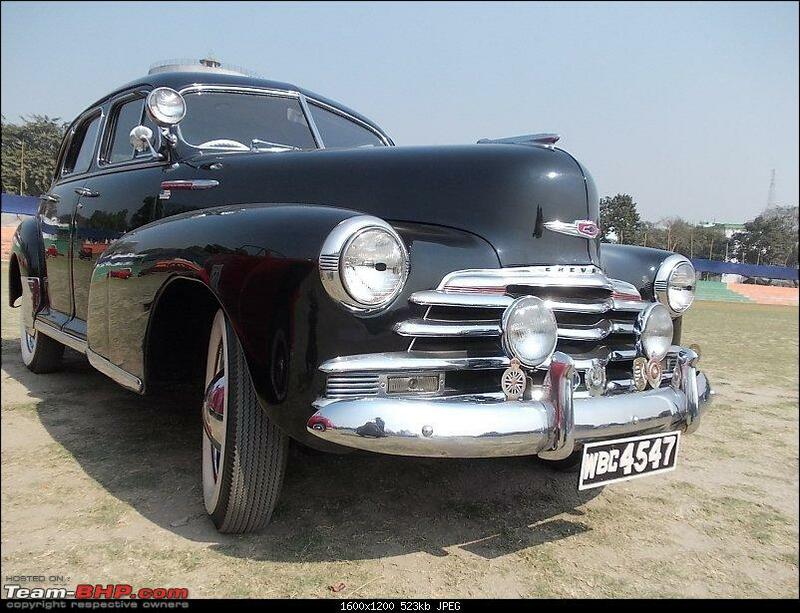 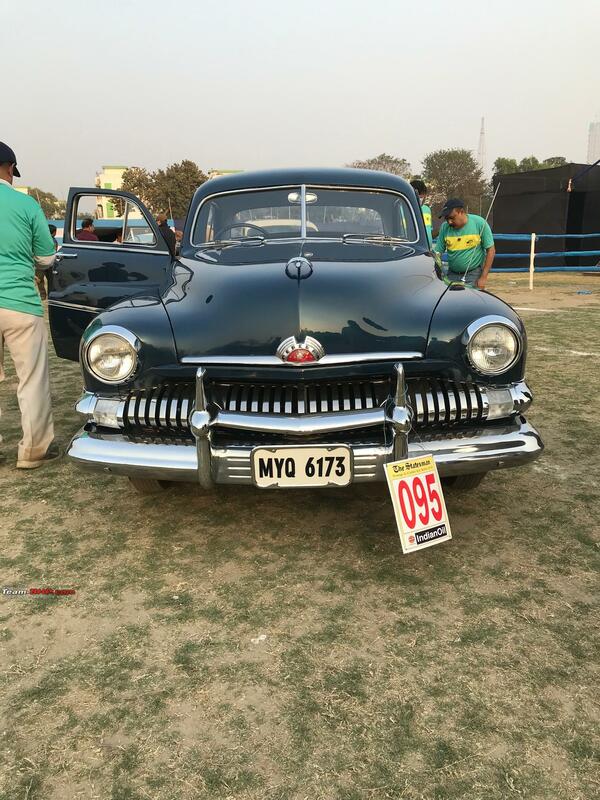 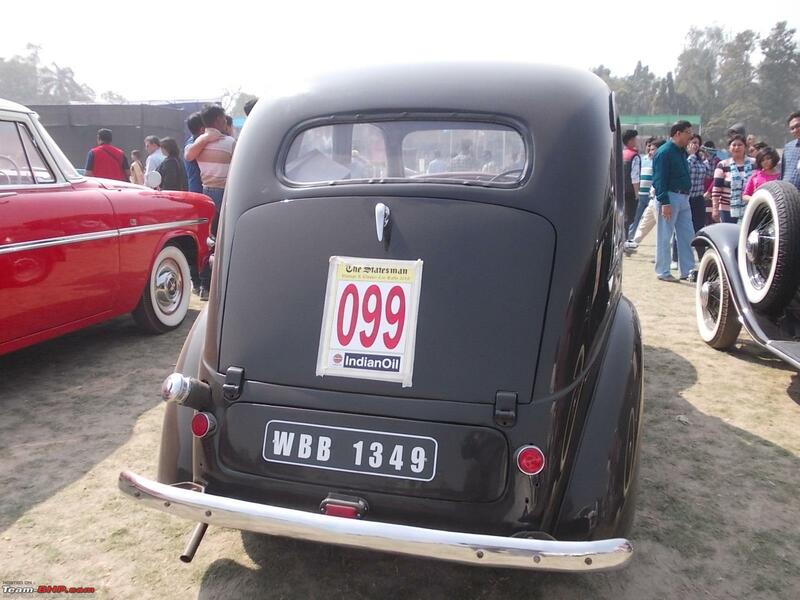 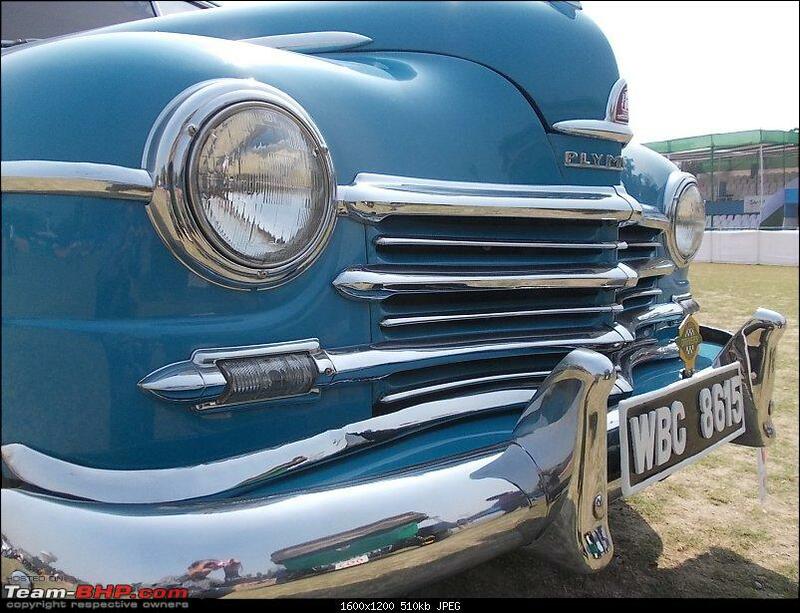 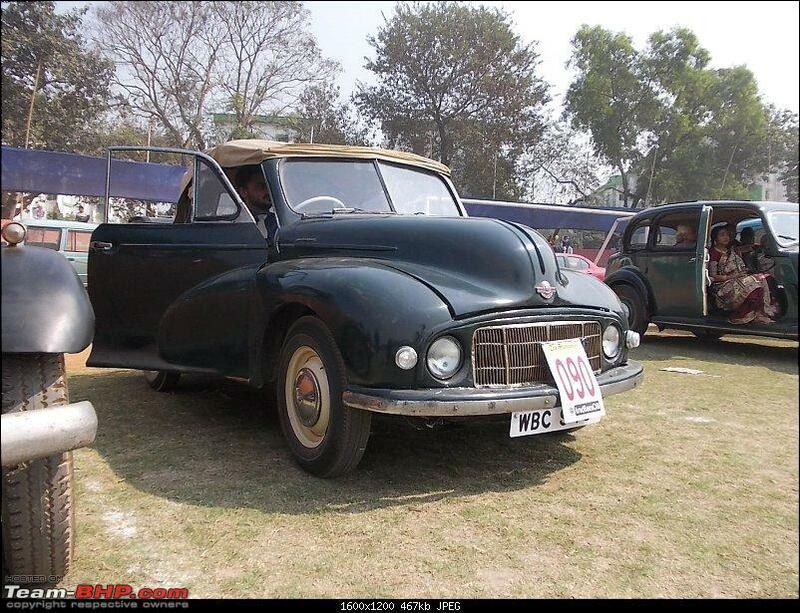 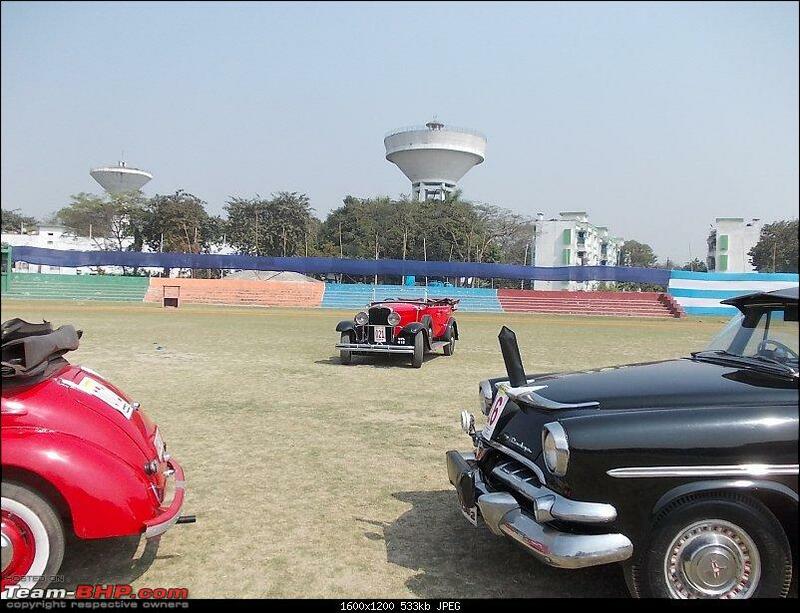 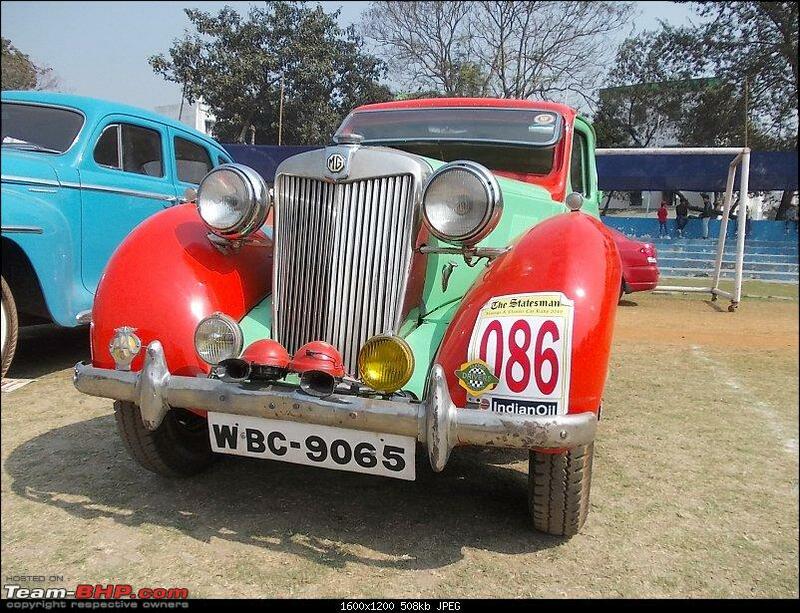 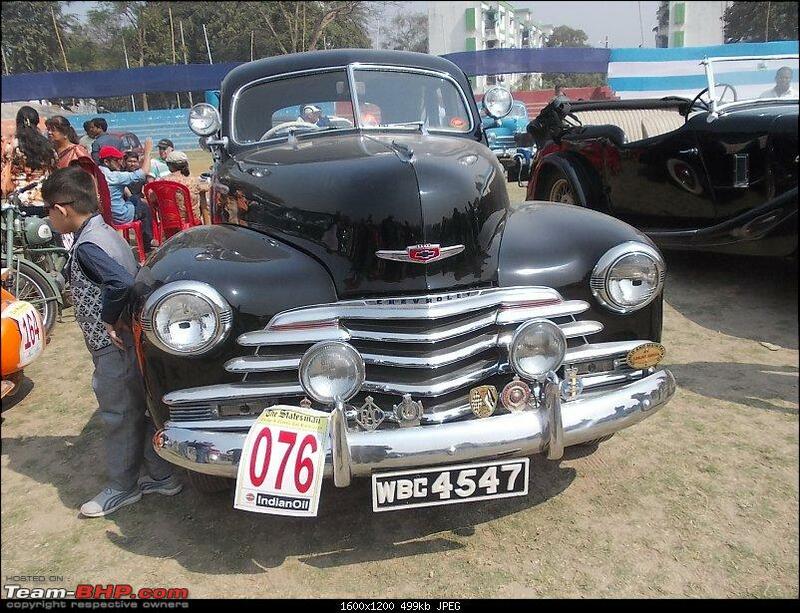 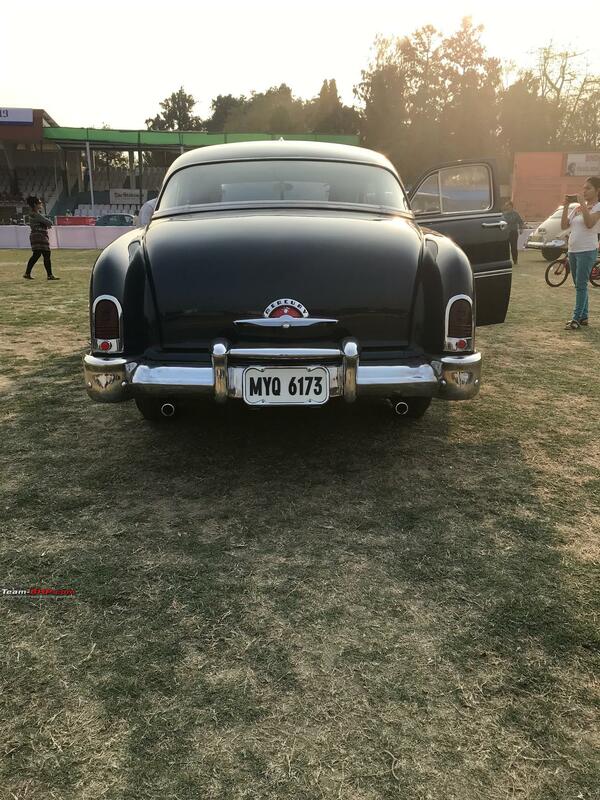 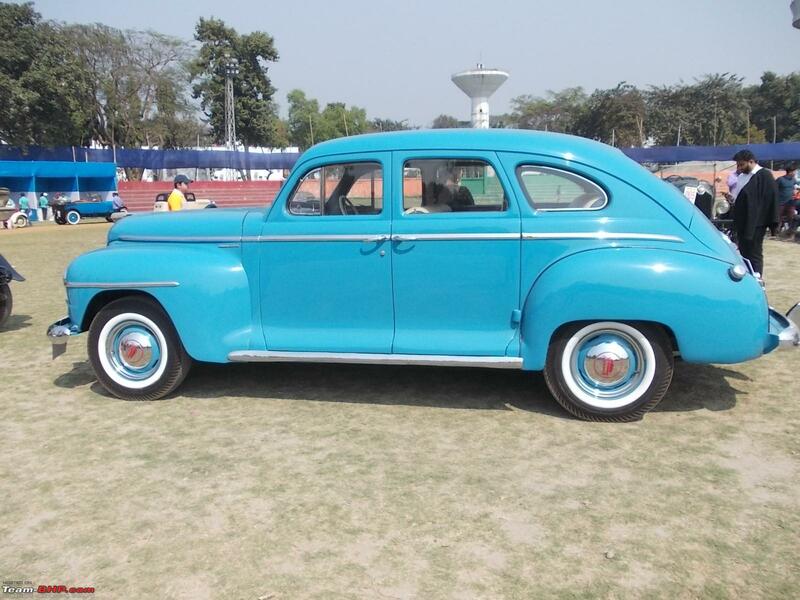 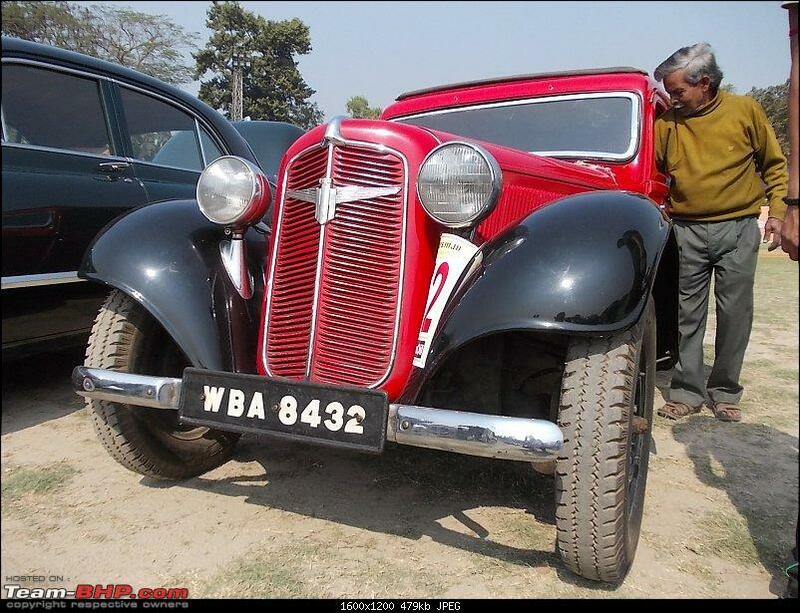 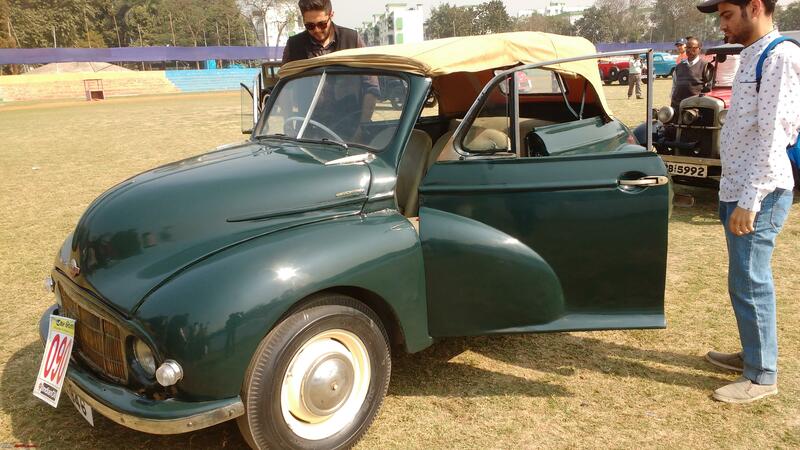 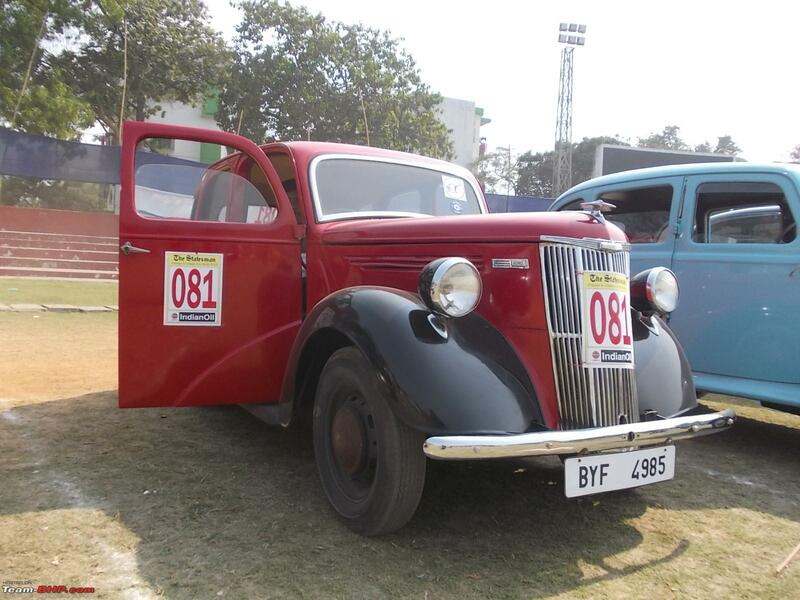 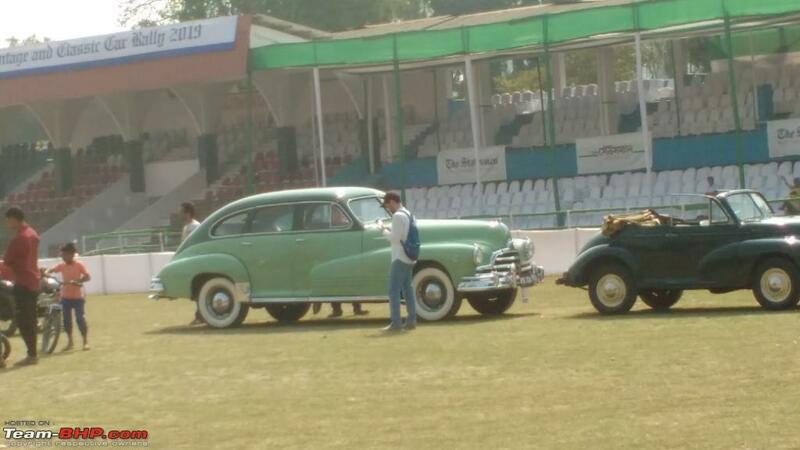 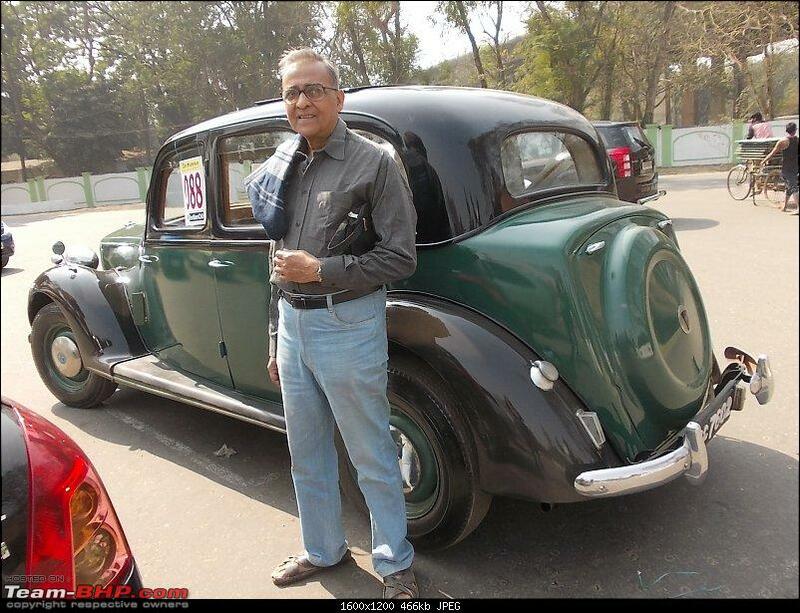 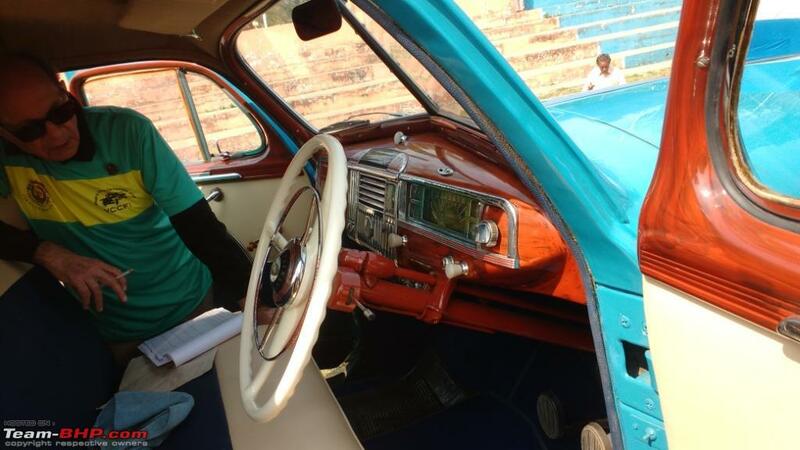 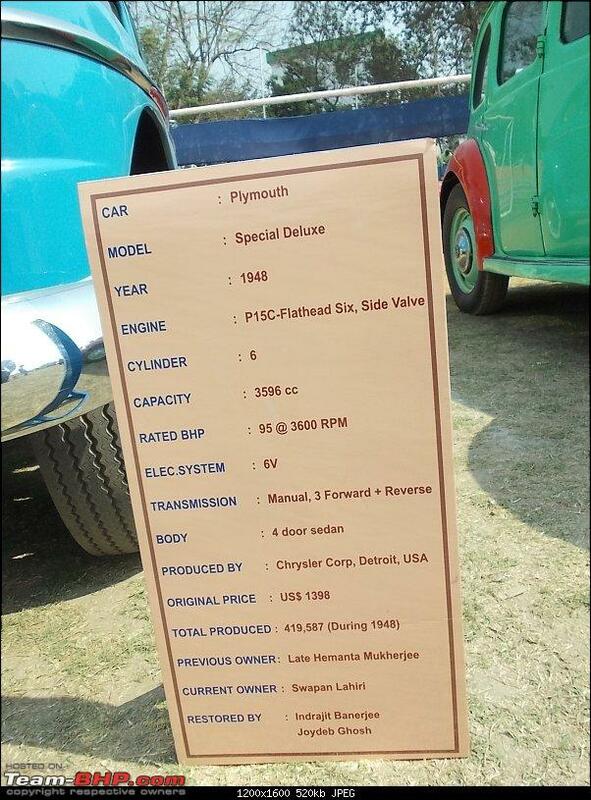 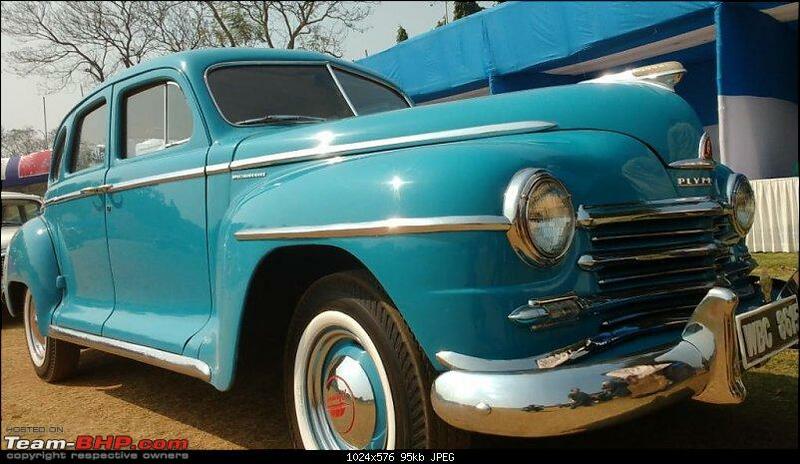 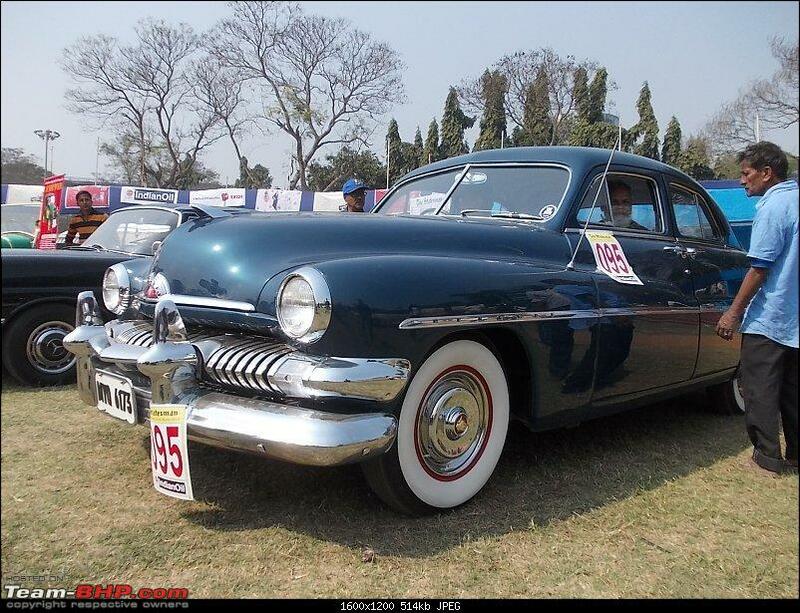 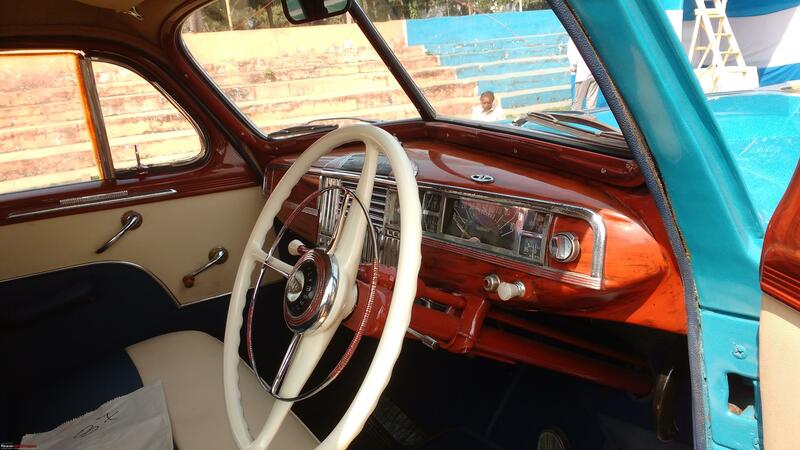 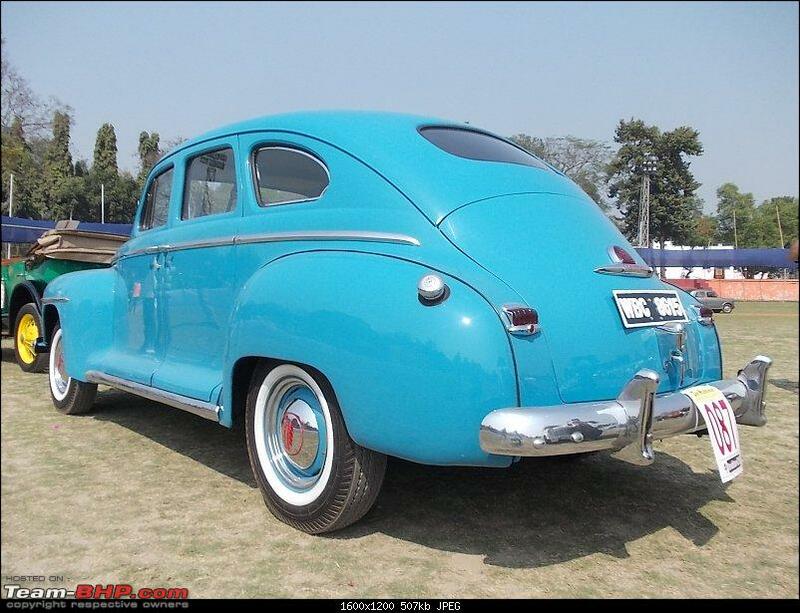 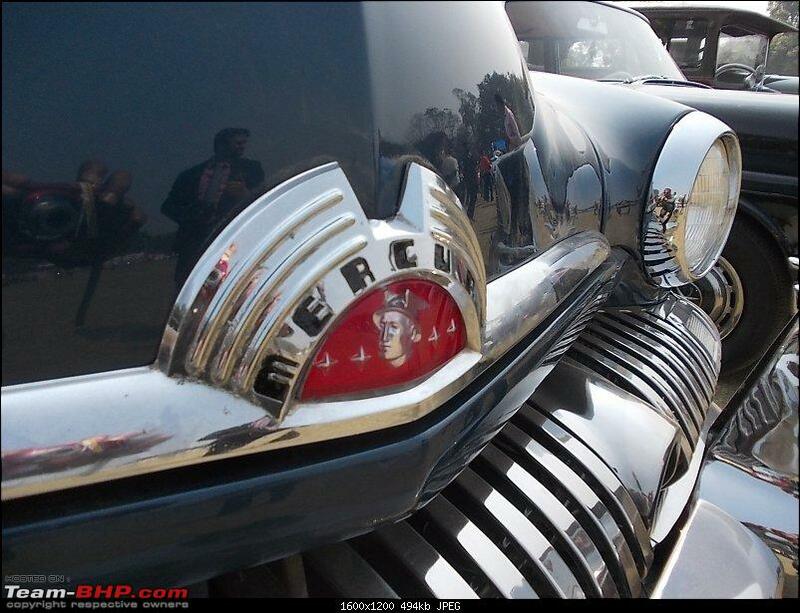 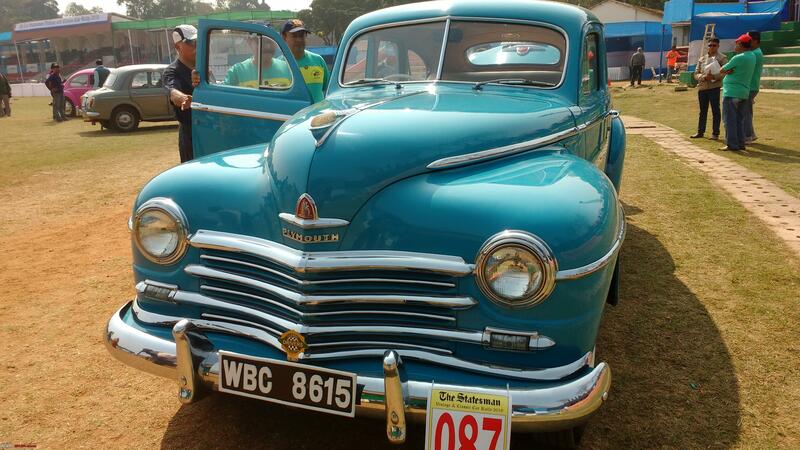 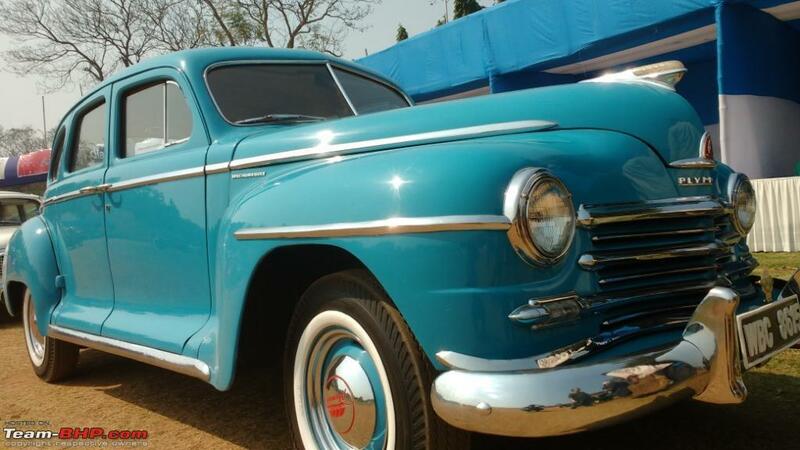 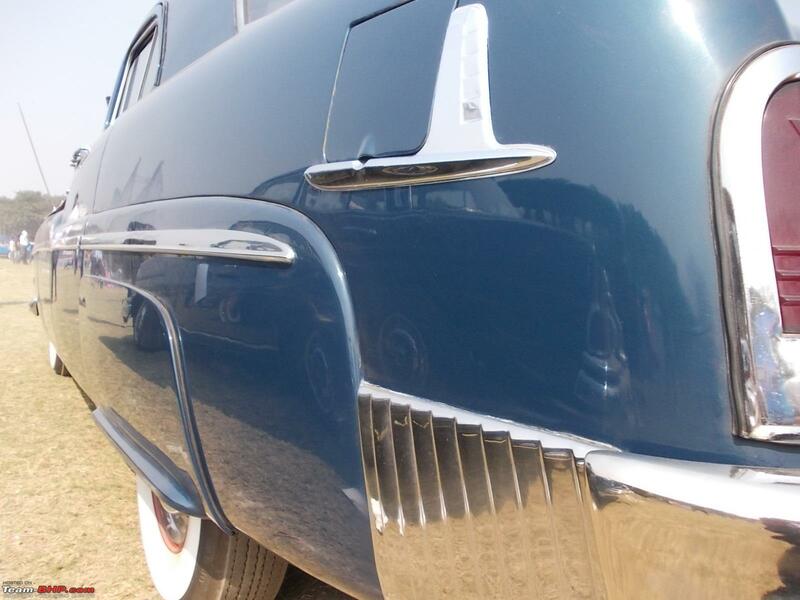 Incidentally this 1948 Plymouth was earlier owned by renowned maestro Hemant Mukherjee. 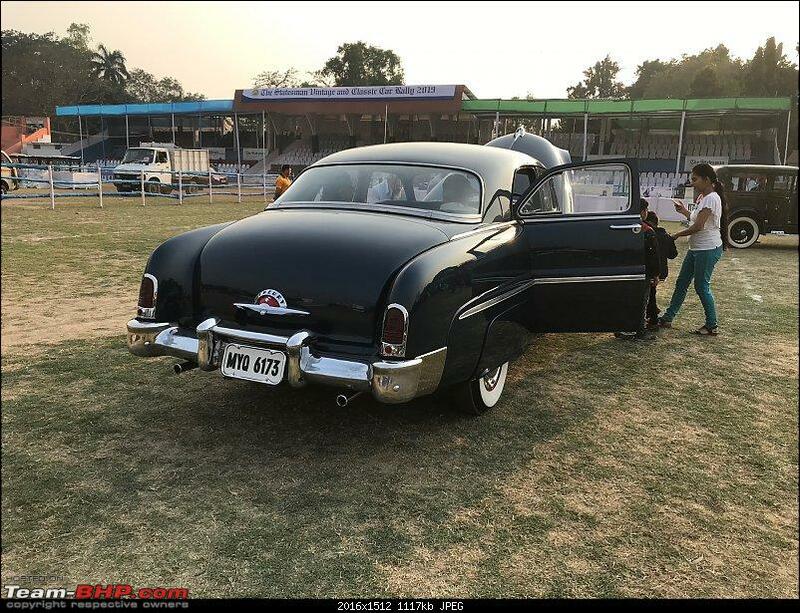 Last edited by anjan_c2007 : 10th February 2019 at 23:46. 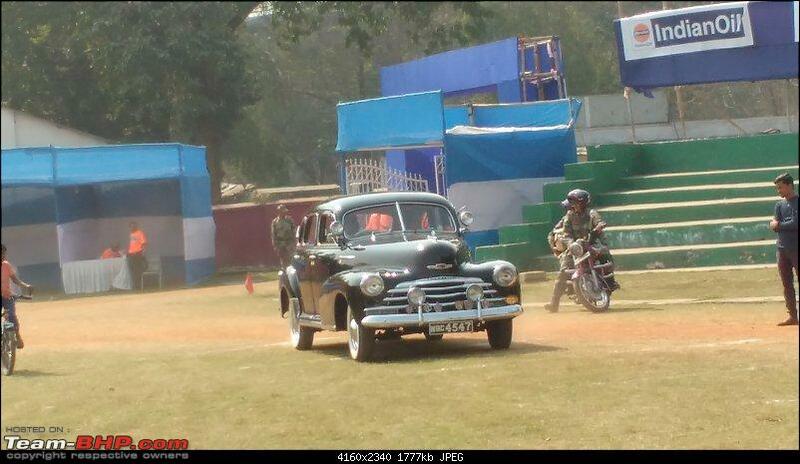 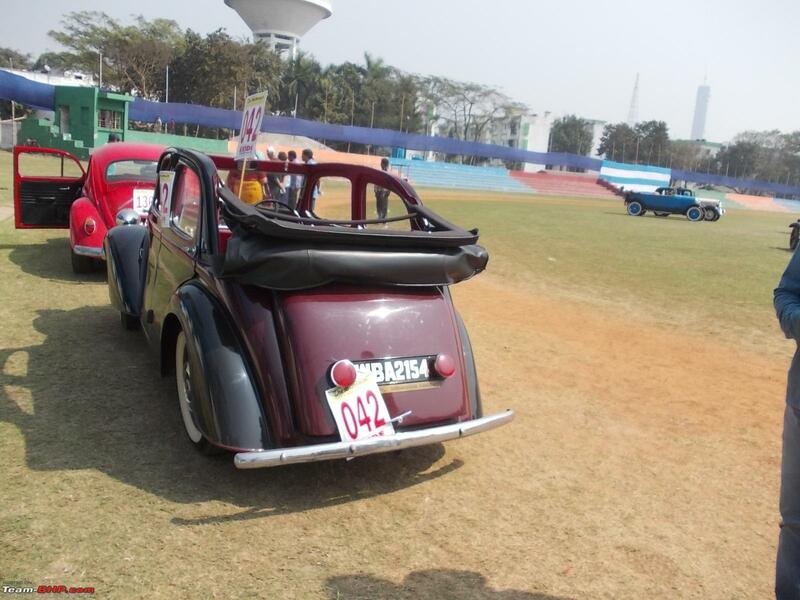 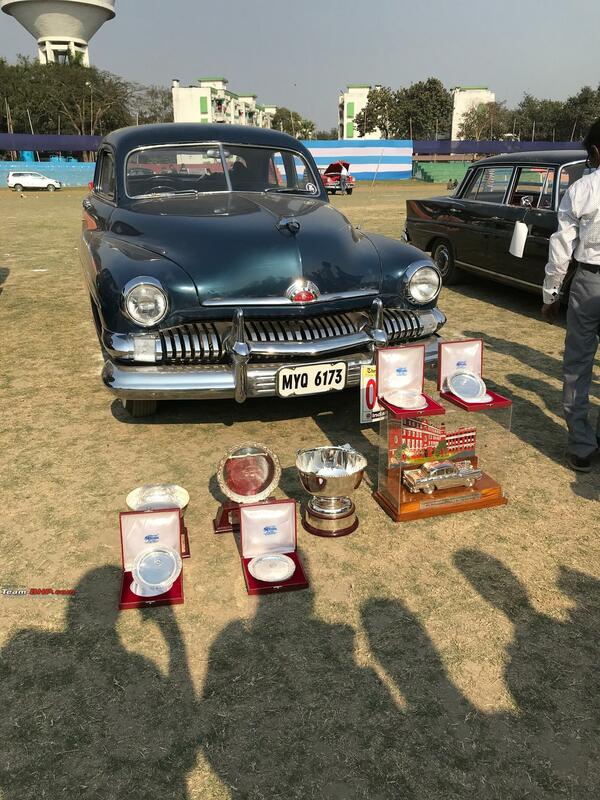 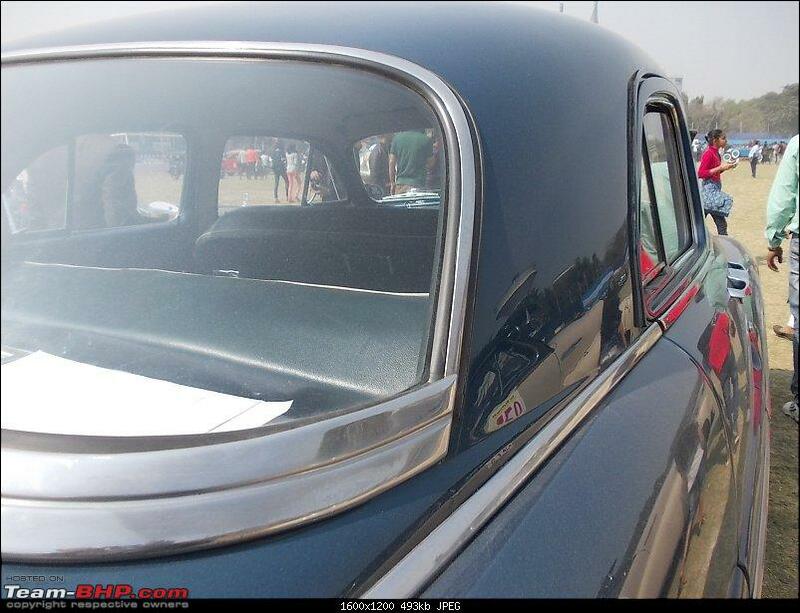 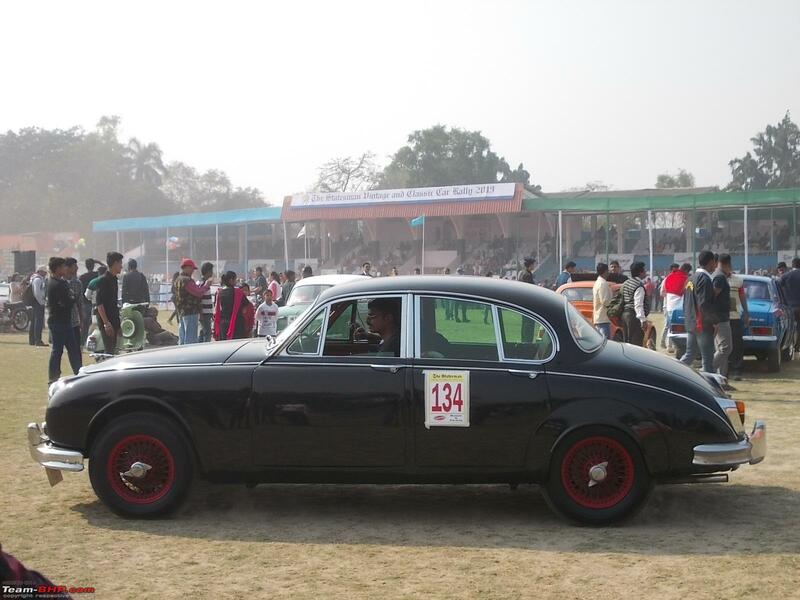 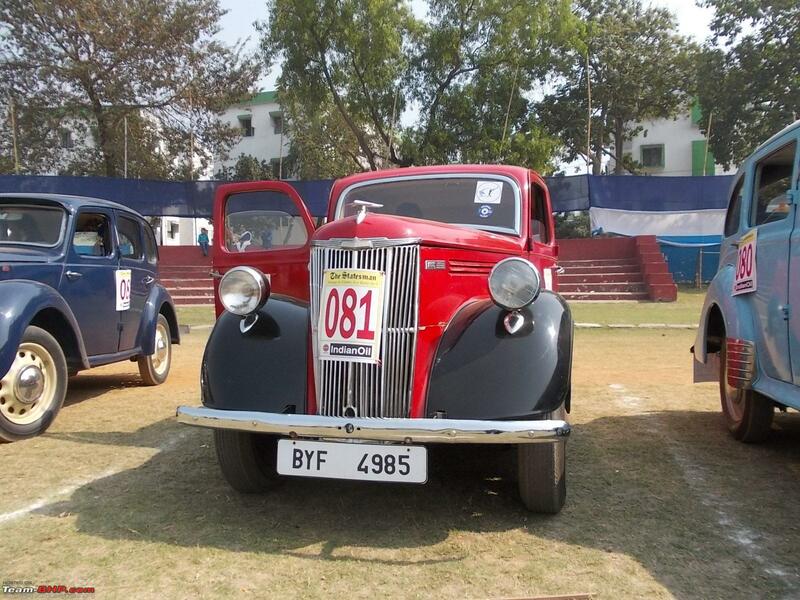 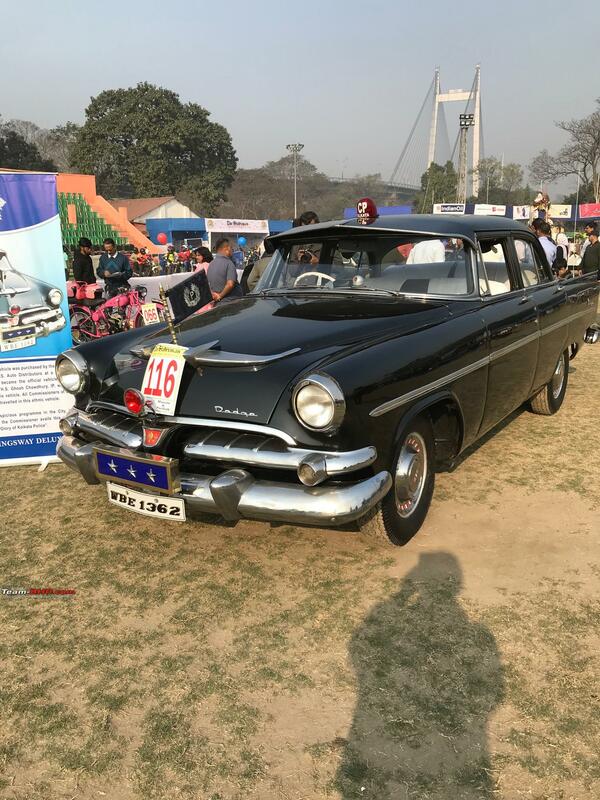 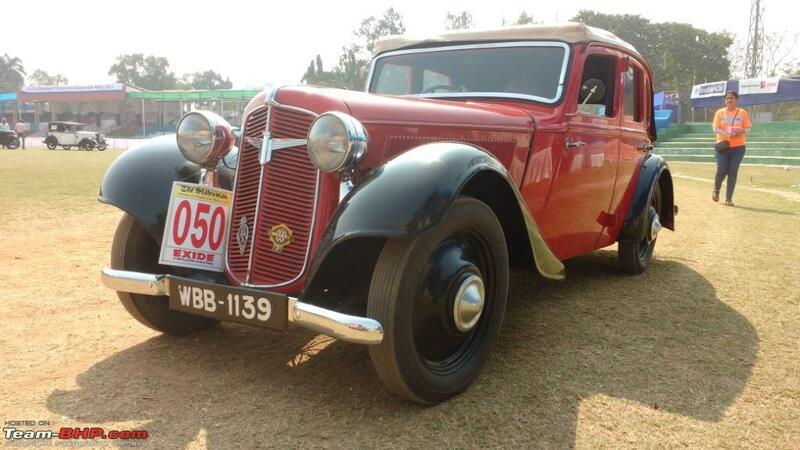 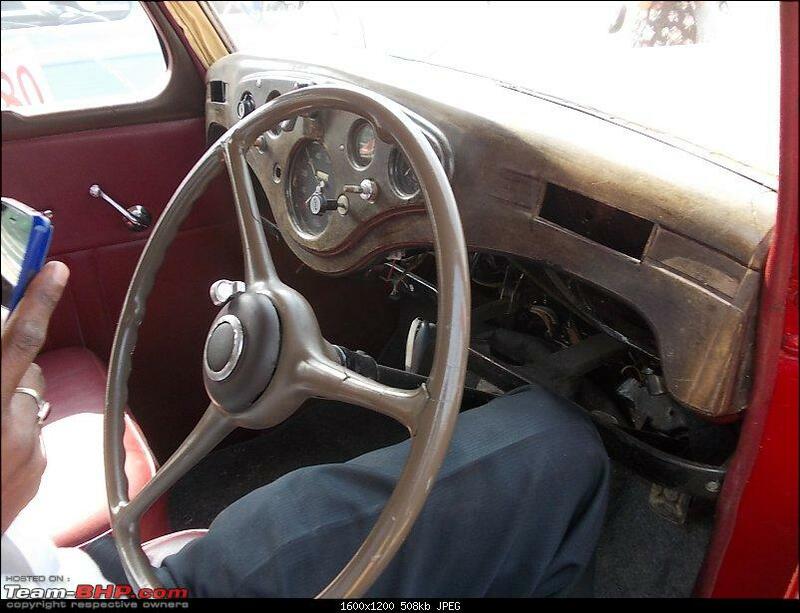 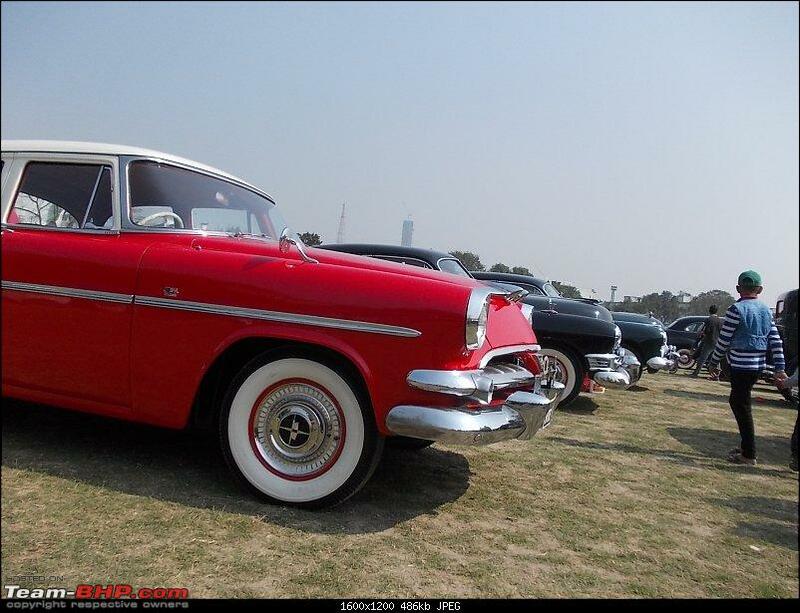 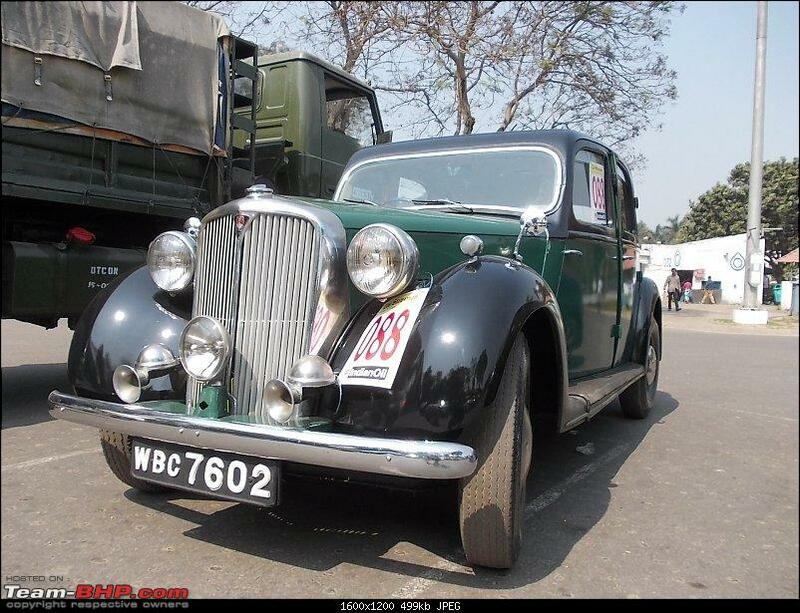 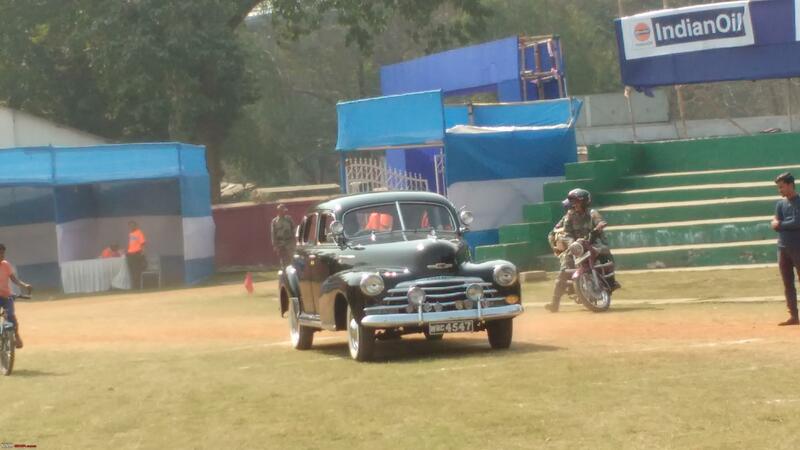 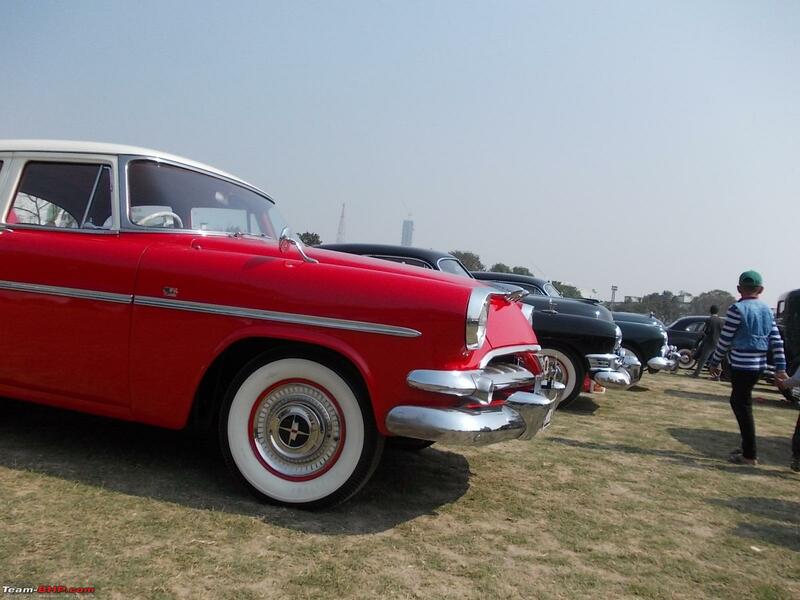 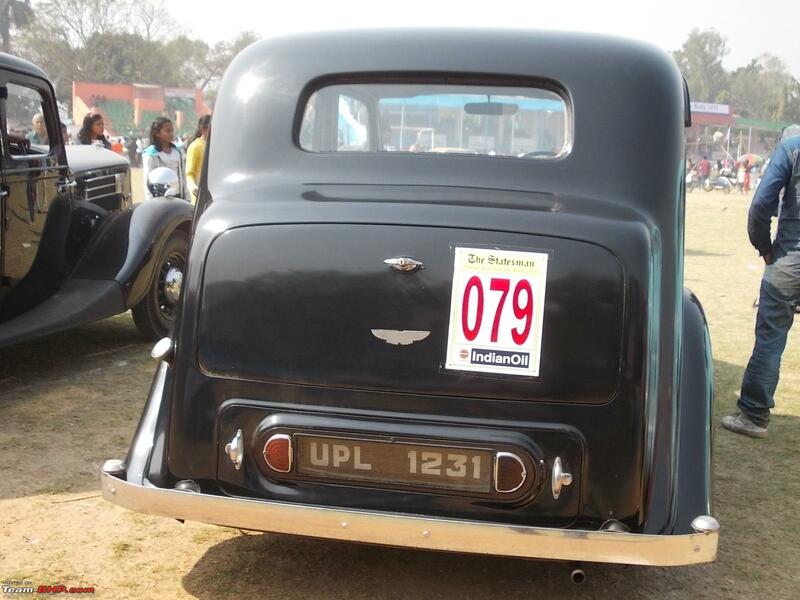 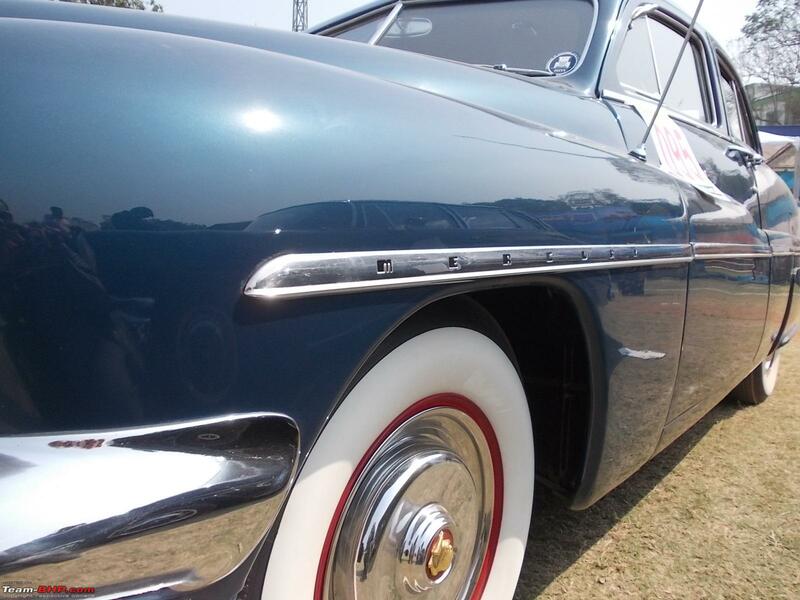 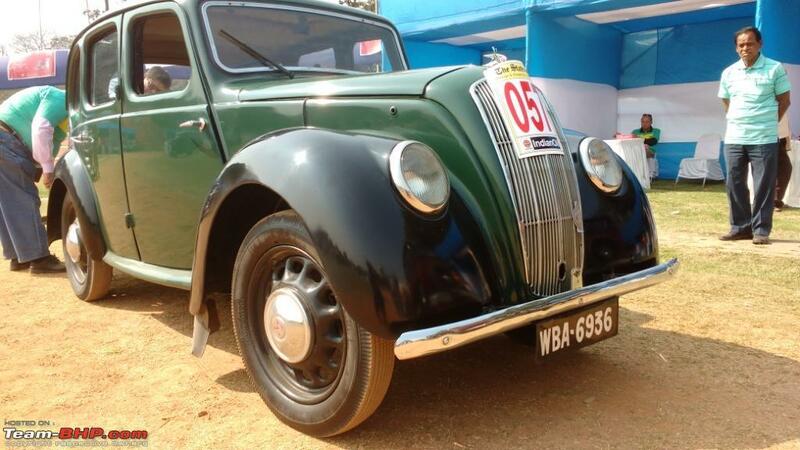 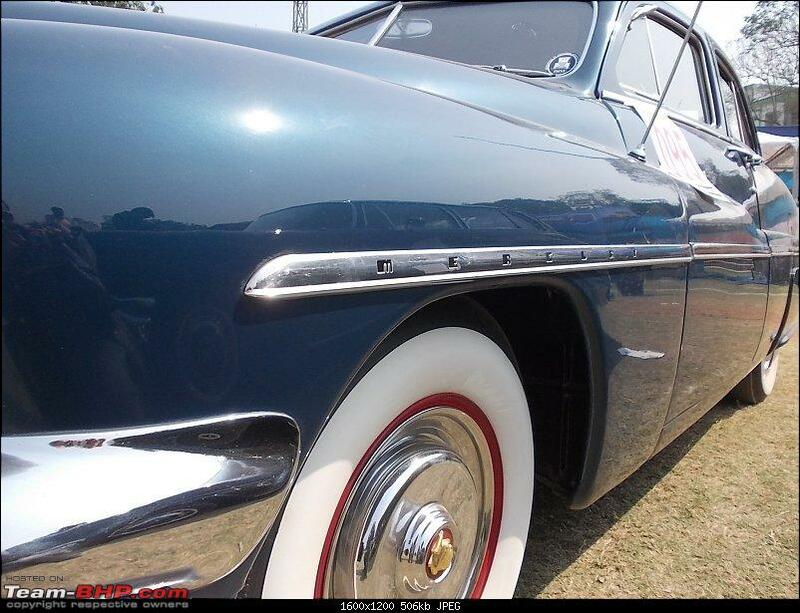 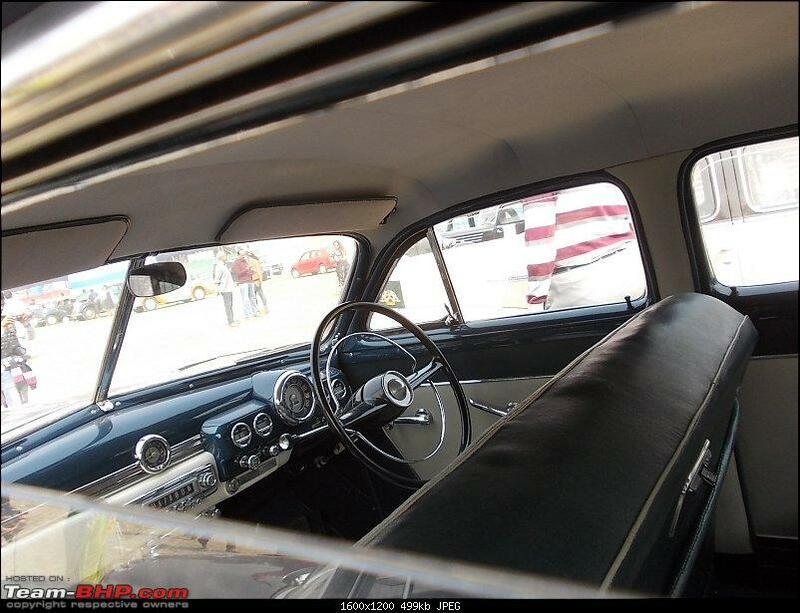 The Commissioner of Police Trophy- Best maintained car built between 1940- 1955, is inspired by this car. 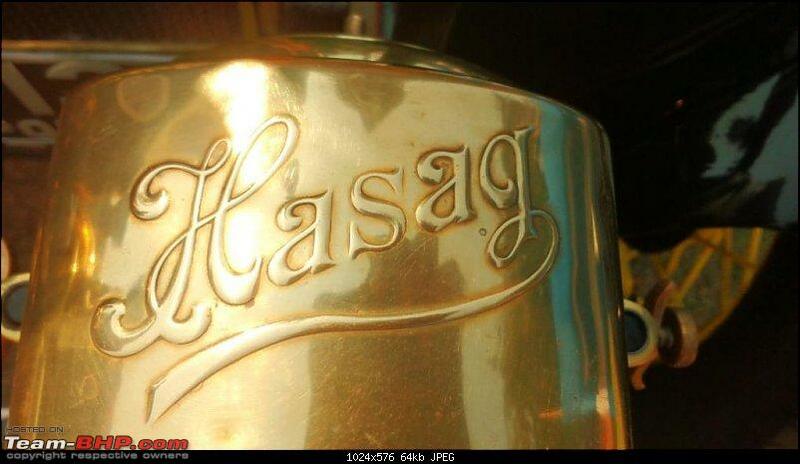 The detailing clearly shows the above Dodge in the trophy. 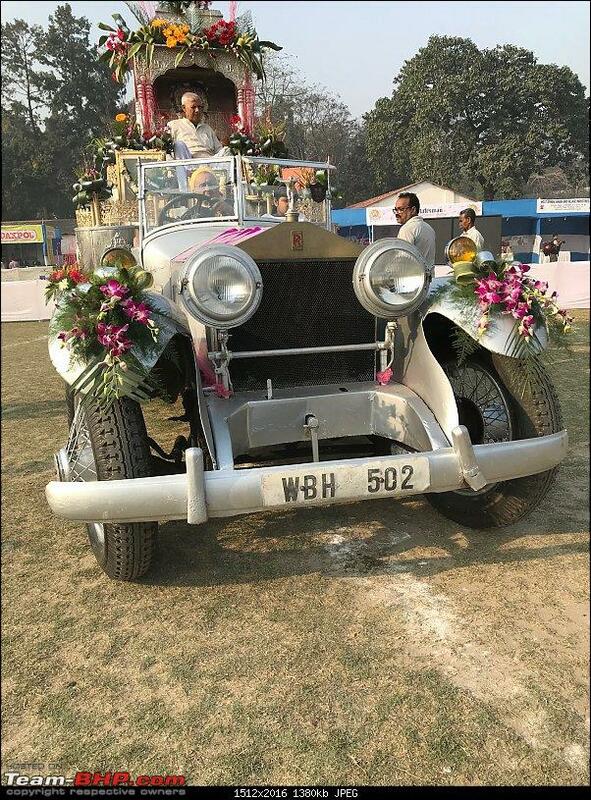 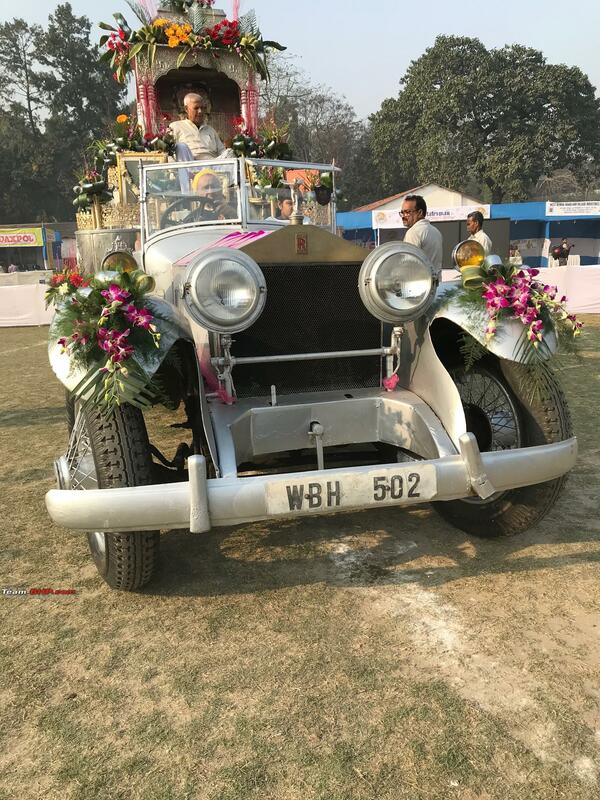 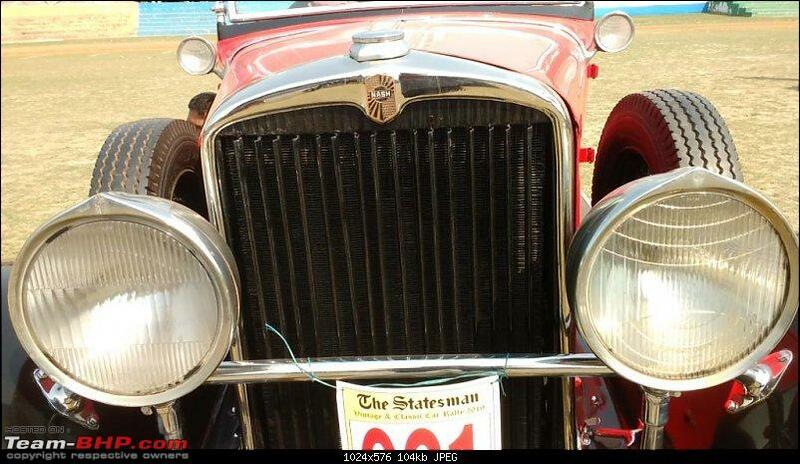 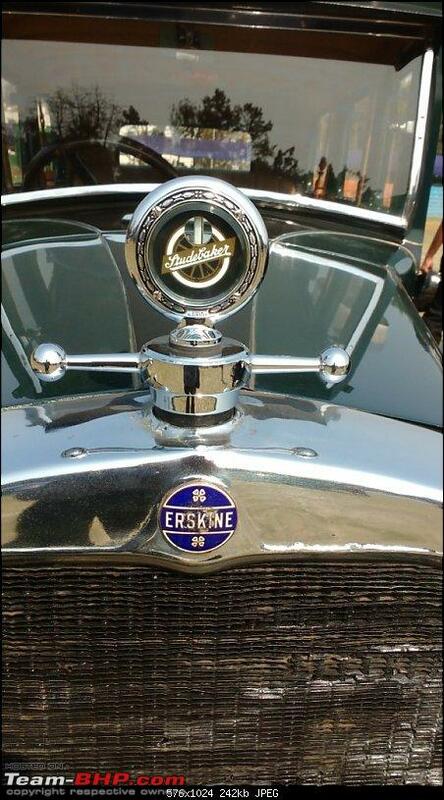 The famous Satyanarayan Temple Rolls Royce Silver Ghost, Chassis 6UE made a surprised entry at the Statesman. First owner was Rudyard Kipling who part exchanged it for a P1. 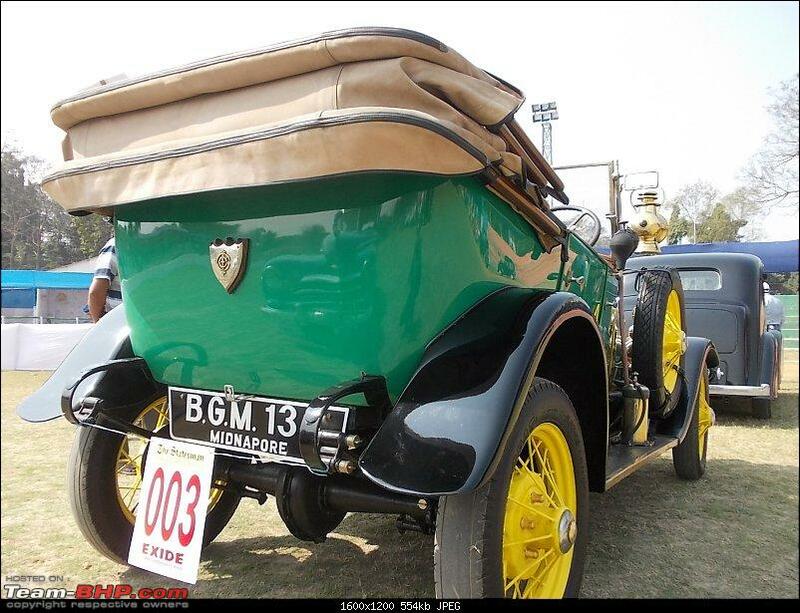 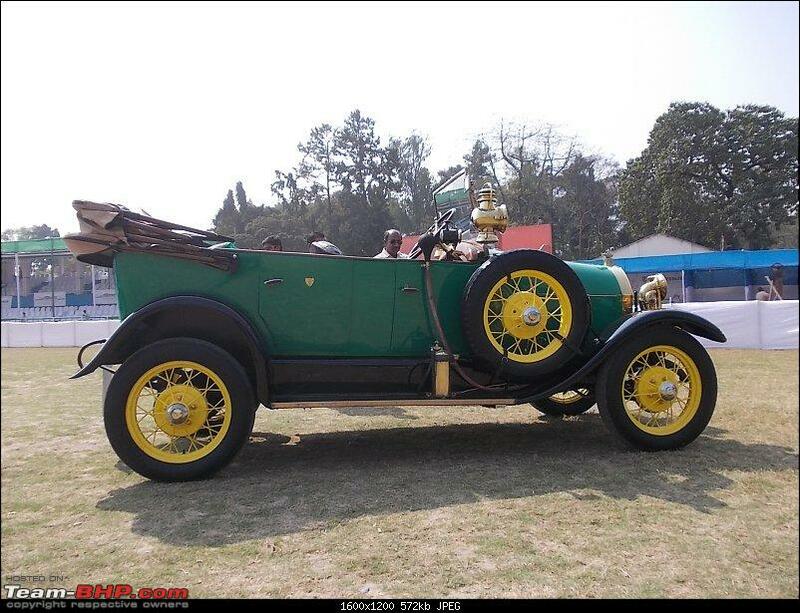 Originally a 1920 Hooper limousine, royal green and black. Brought to India ca. 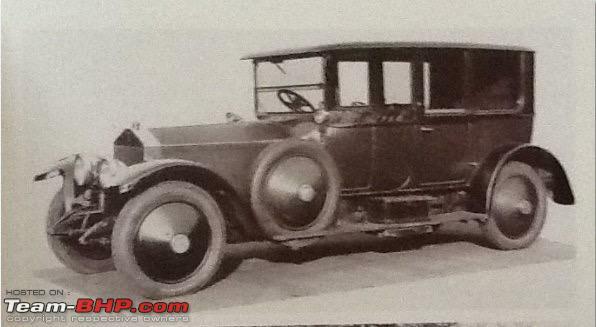 1929 as per the experts on TBHP. 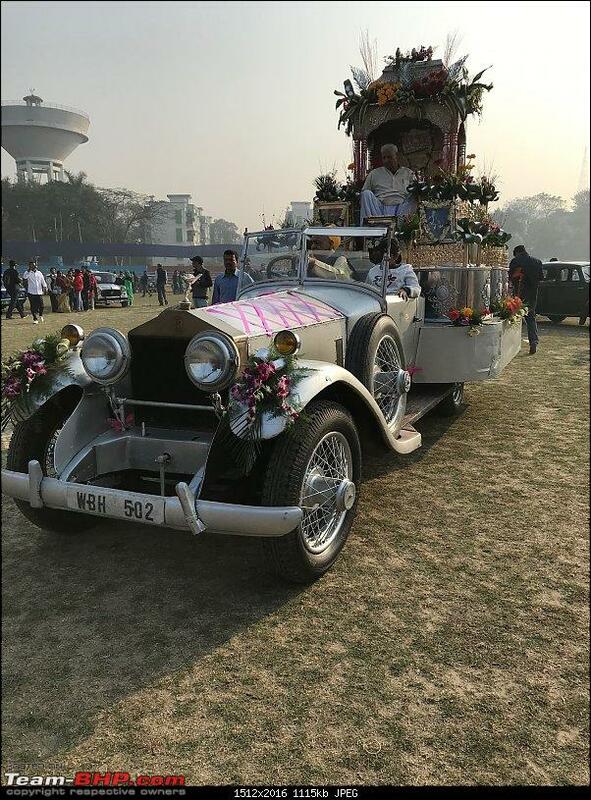 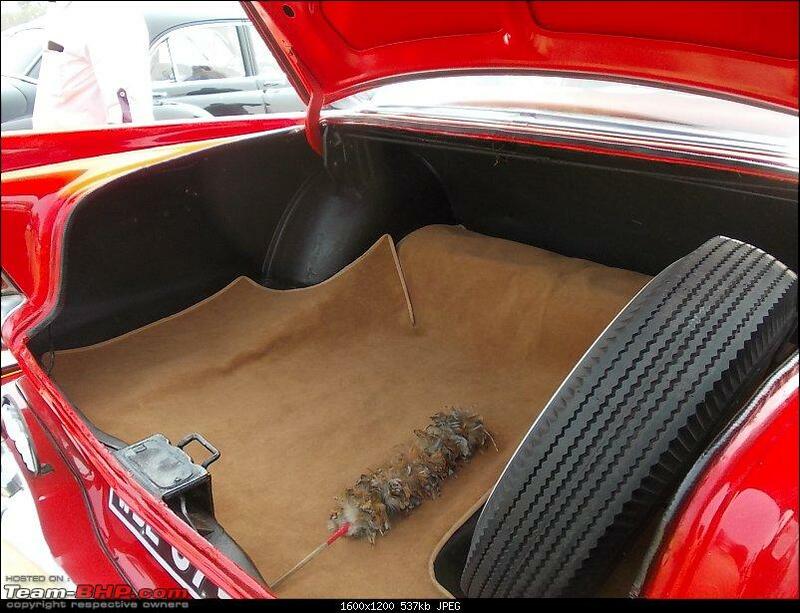 The car is now used for religiously ceremonies. 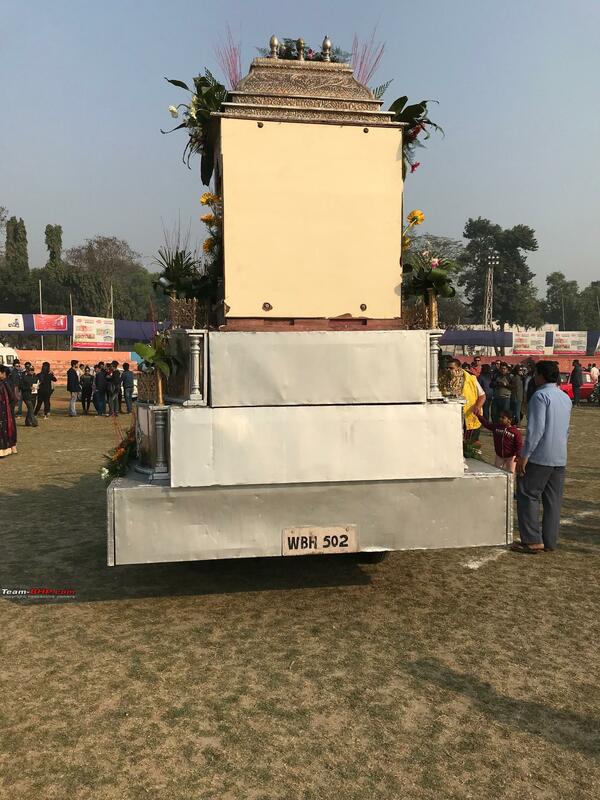 The body is chopped and a platform has been installed so that the idol can be placed during the processions. 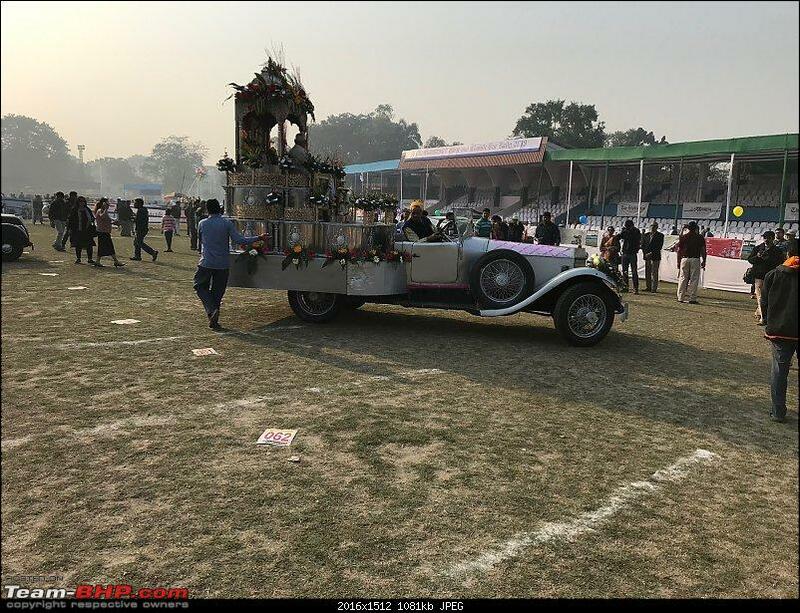 The Spirit of Ecstacy stands tall among the ruins! 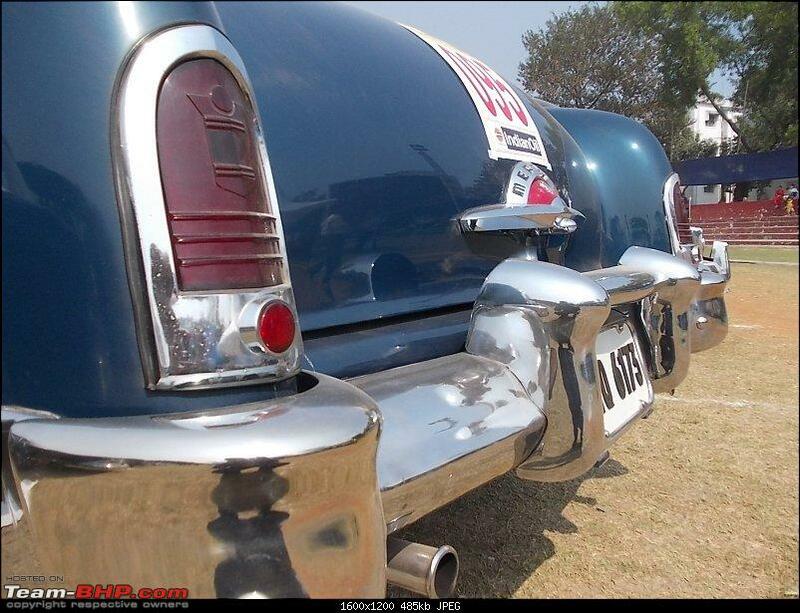 The rear shows how massive the platform is! 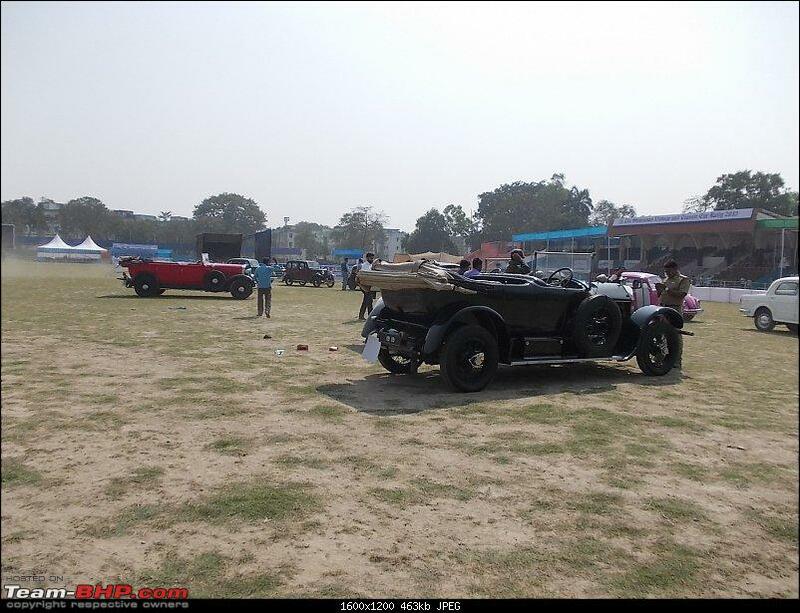 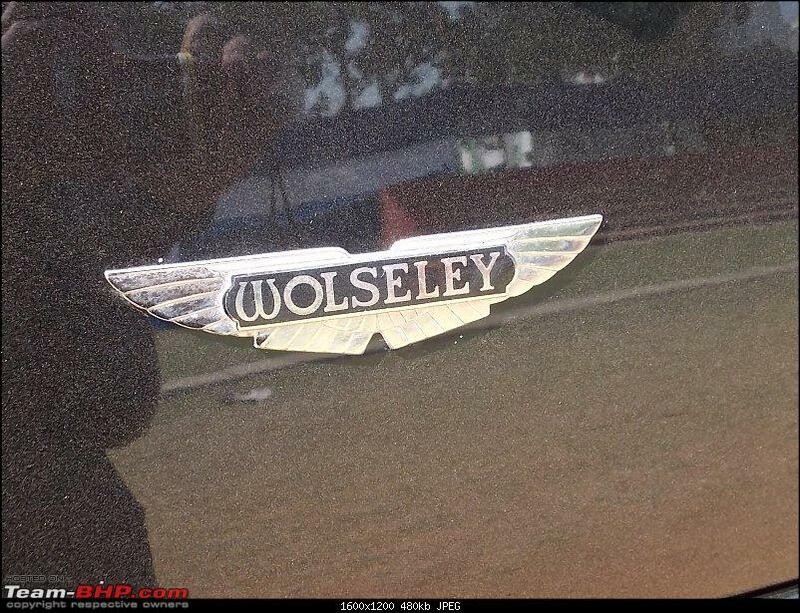 This is a tragedy for vintage car lovers. 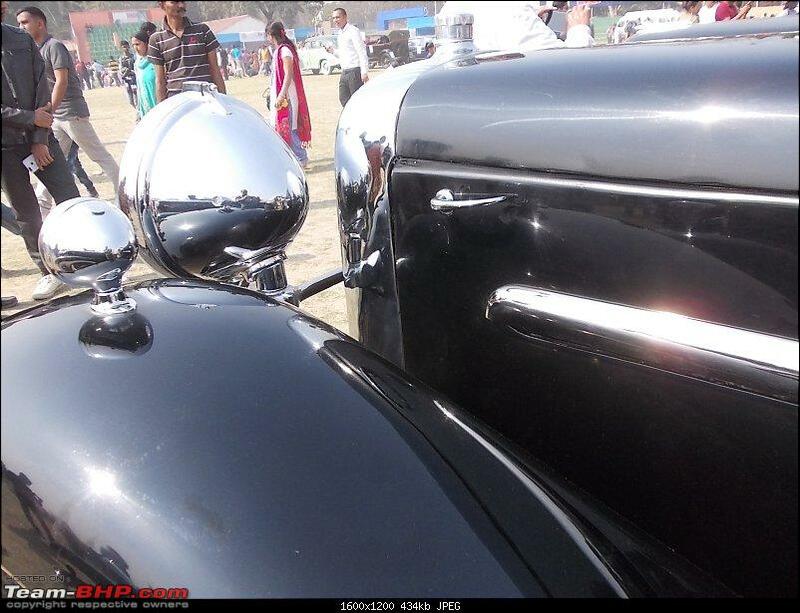 Cannot imaging a Silver Ghost so badly abused. But the current owners apparently do not have materialistic desires like us enthusiast!